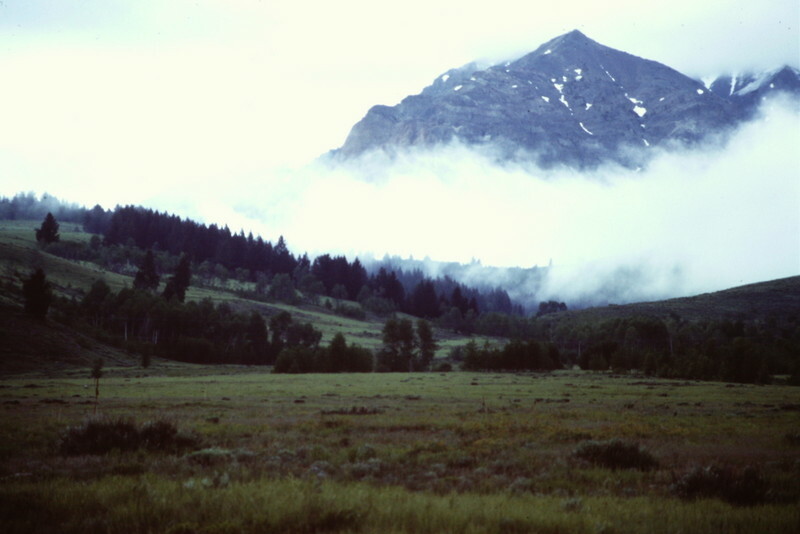 Lost River Mountain Lost River Range 12,078 ft 698 1989 This peak is found on page 283. 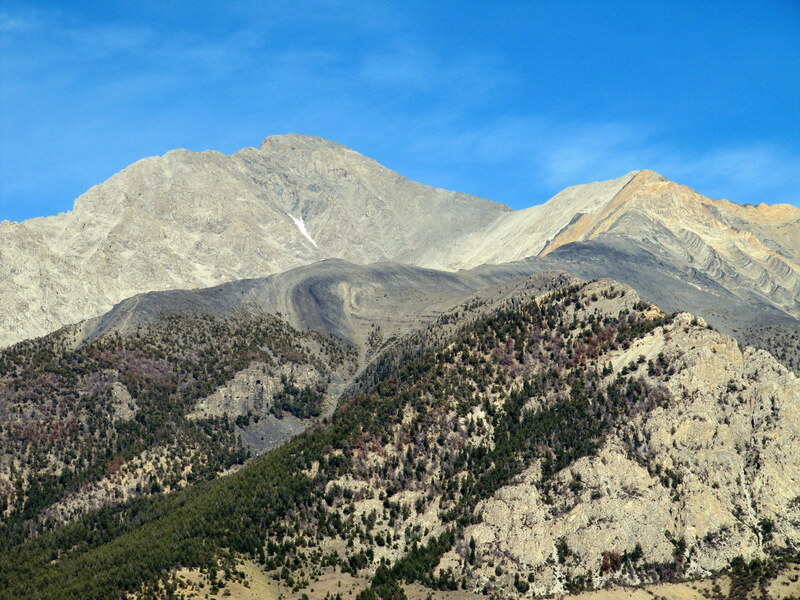 Donaldson Peak Lost River Range 12,023 ft 323 1987, 2014 This peak is found on page 278. 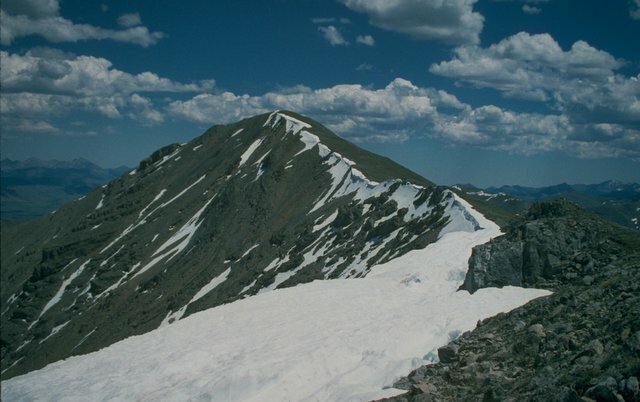 Hyndman Peak Pioneer Mountains 12,009 ft 4829 1987 Climbing information for this 12er peak is found on page 249. 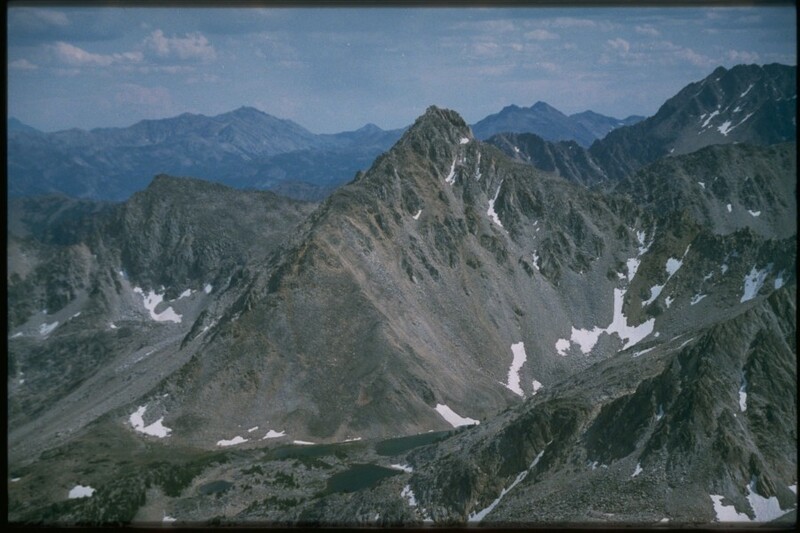 Peak 11967 Lost River Range 11,967 ft 627 1993 Climbing information for this peak is found on pages 275 and 276. 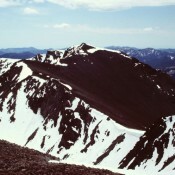 Peak 11887 (the Fin) Pioneer Mountains 11,887 ft 1547 1997 Climbing information for this 11er peak is found on page 254. 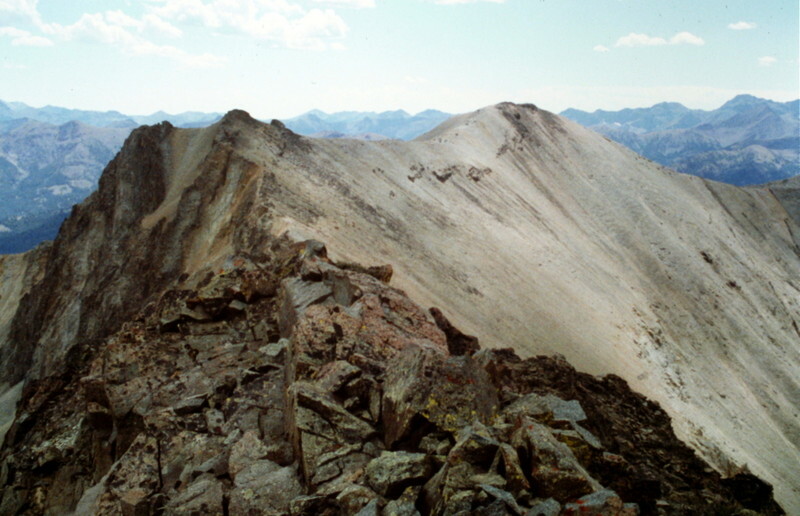 Standhope Peak Pioneer Mountains 11,878 ft 468 1987 Climbing information for this peak is found on pages 253 and 254. 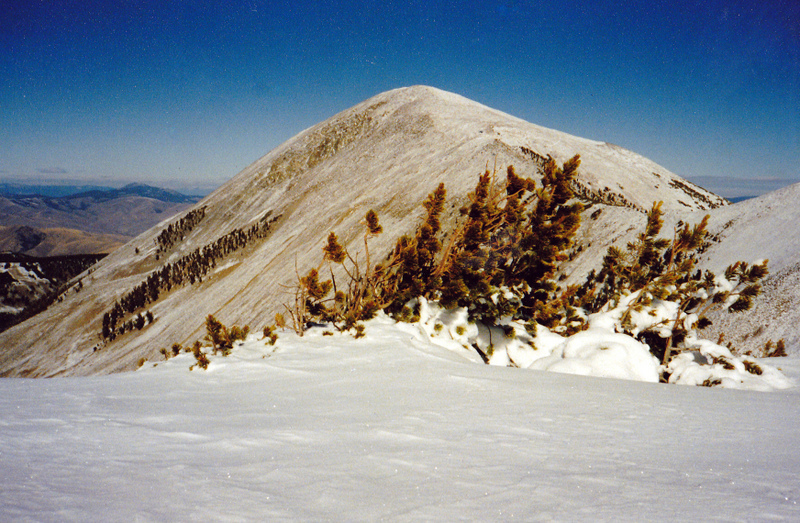 Altair Peak Pioneer Mountains 11,825 ft 805 1997 Climbing information for Altair is found on page 253. 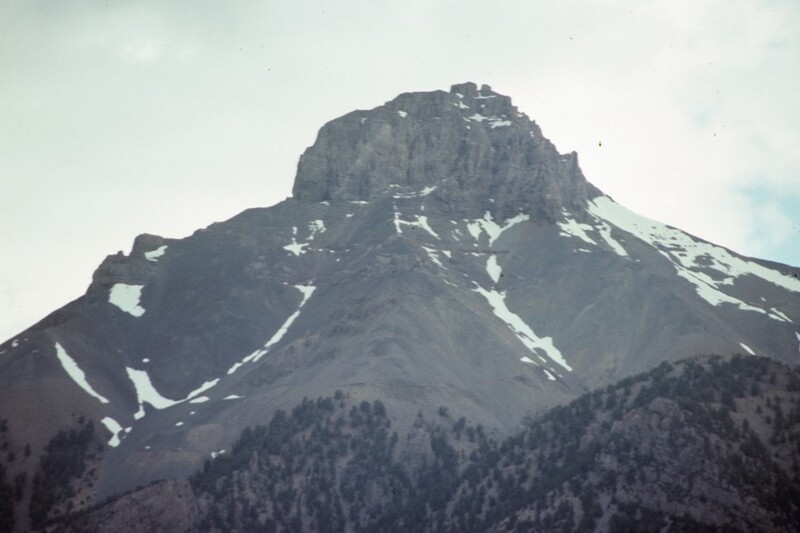 Duncan Peak Pioneer Mountains 11,755 ft 415 2003 Climbing information for Duncan is found on page 248.
Pegasus Peak Pioneer Mountains 11,736 ft 676 Climbing information for this peak is found on page 253. 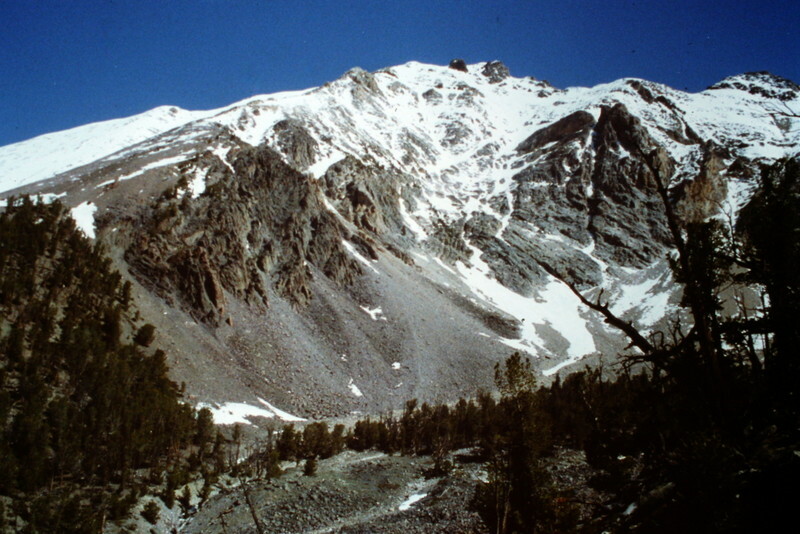 Ross Peak Lost River Range 11,724 ft 944 1993 Climbing information for Ross Peak is found on page 285. 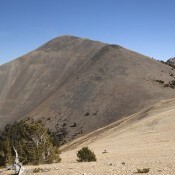 The Angels Perch Pioneer Mountains 11,687 ft 507 Climbing information for this peak is discussed on page 252. 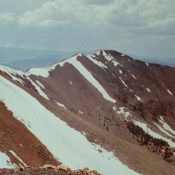 Cobb Peak Pioneer Mountains 11,650 ft 670 1987 Climbing information for Cobb Peak is found on pages 249 and 250. 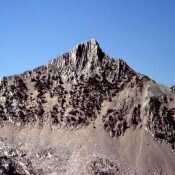 Pyramid Peak Pioneer Mountains 11,628 ft 408 2004 Climbing information for this peak is found on page 253. Bell Mountain Lemhi Range 11,612 ft 1752 1982 Climbing and access information for this peak is found on pages 305 and 306. 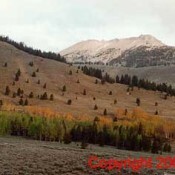 Peak 11611 (Doublesprings) Lost River Range 11,611 ft 2129 2003 This peak is found on pages 269 and 270. 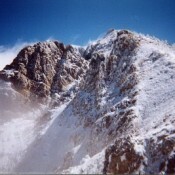 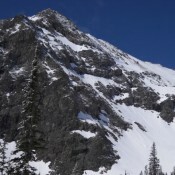 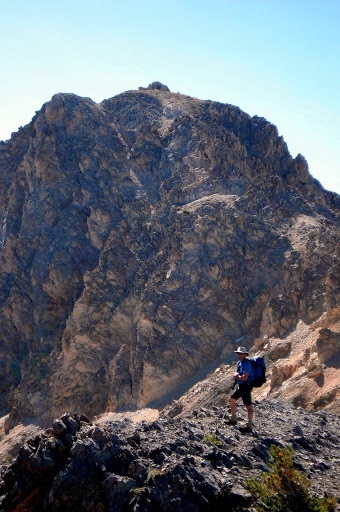 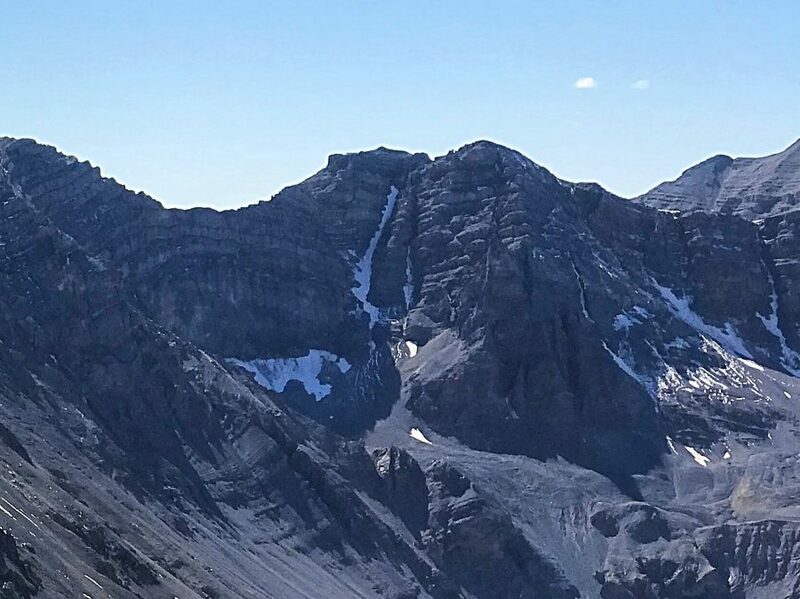 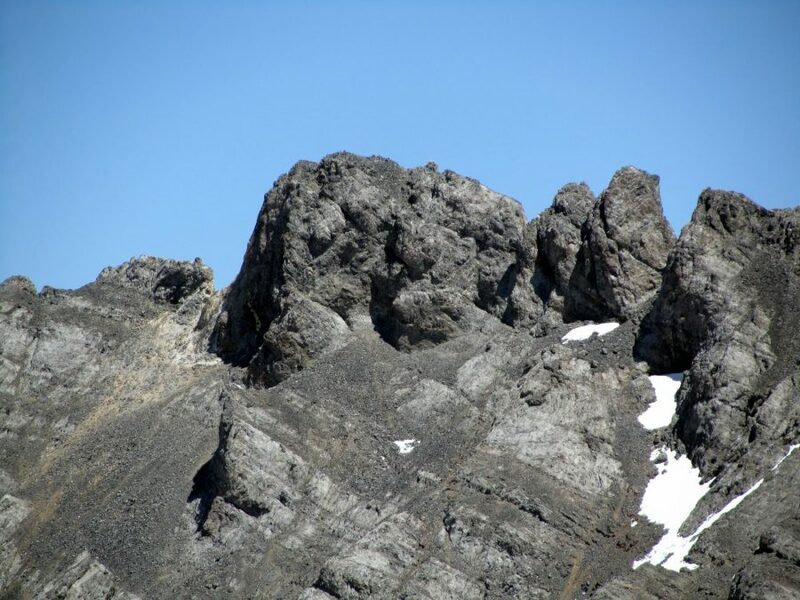 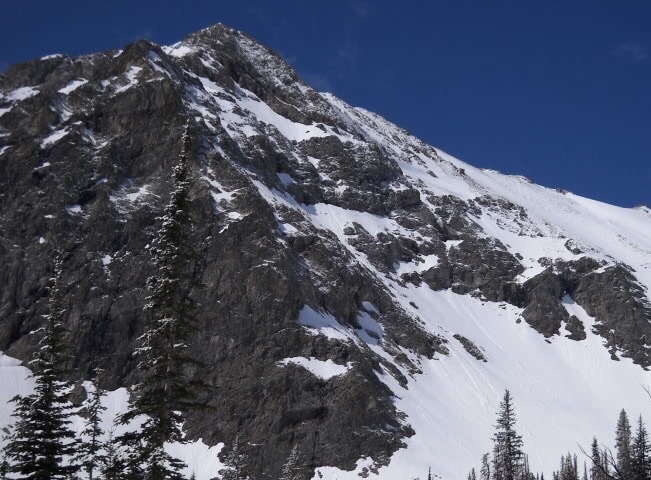 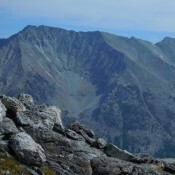 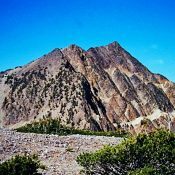 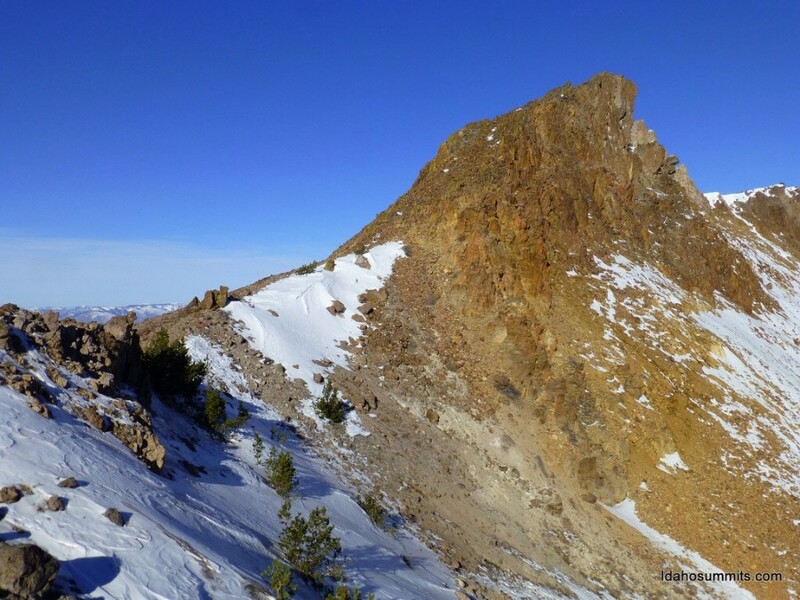 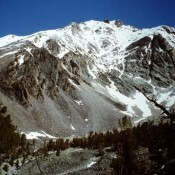 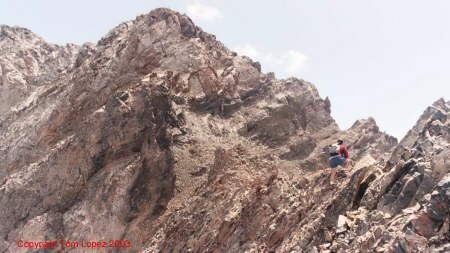 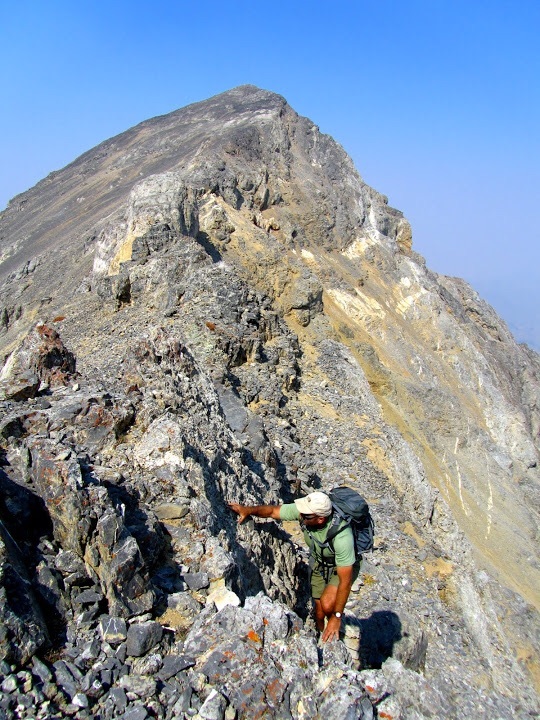 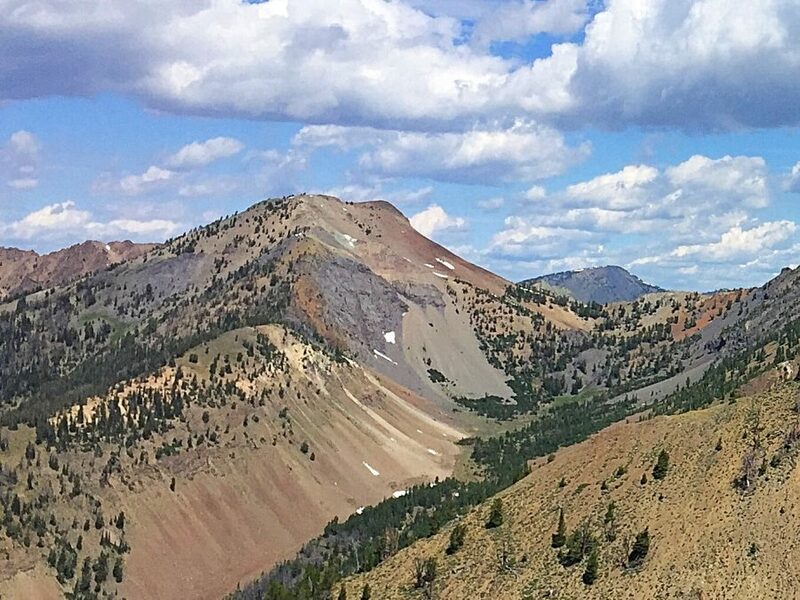 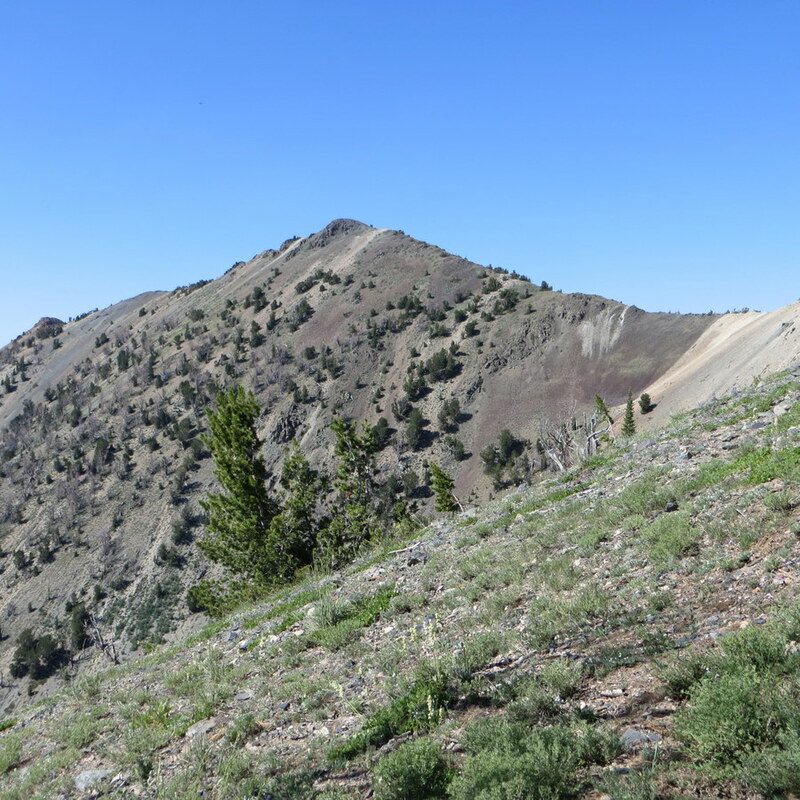 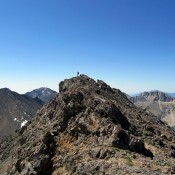 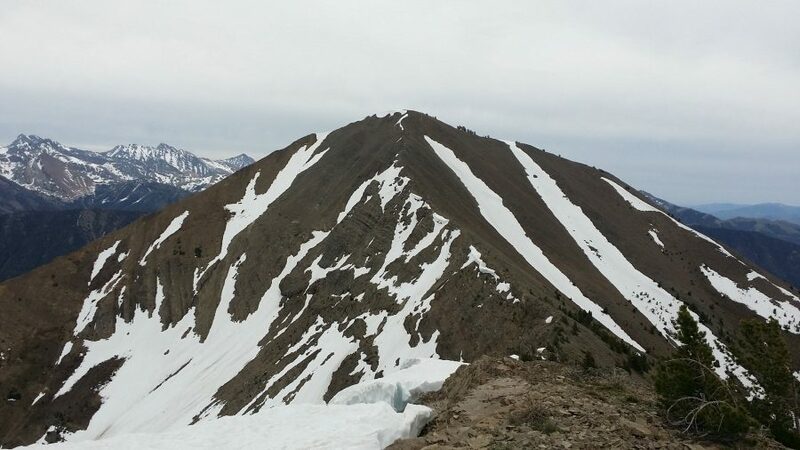 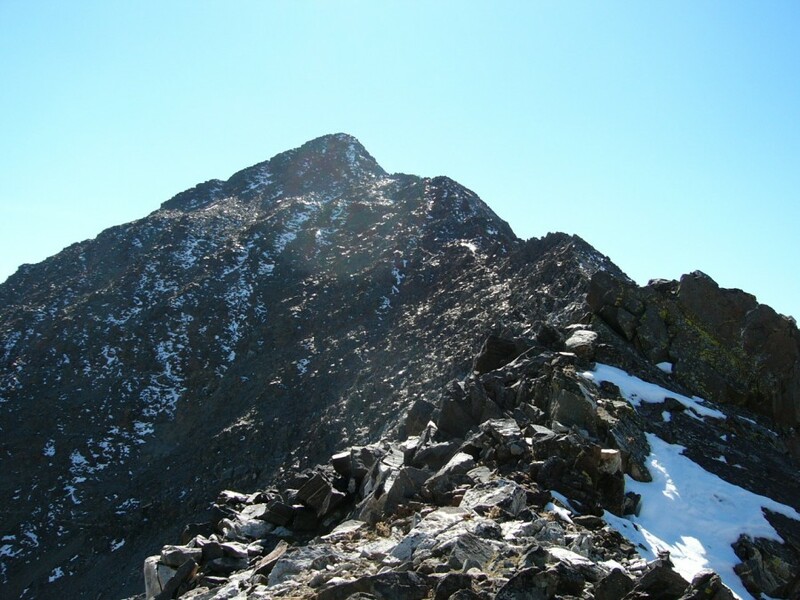 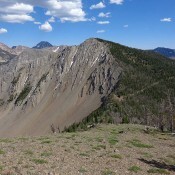 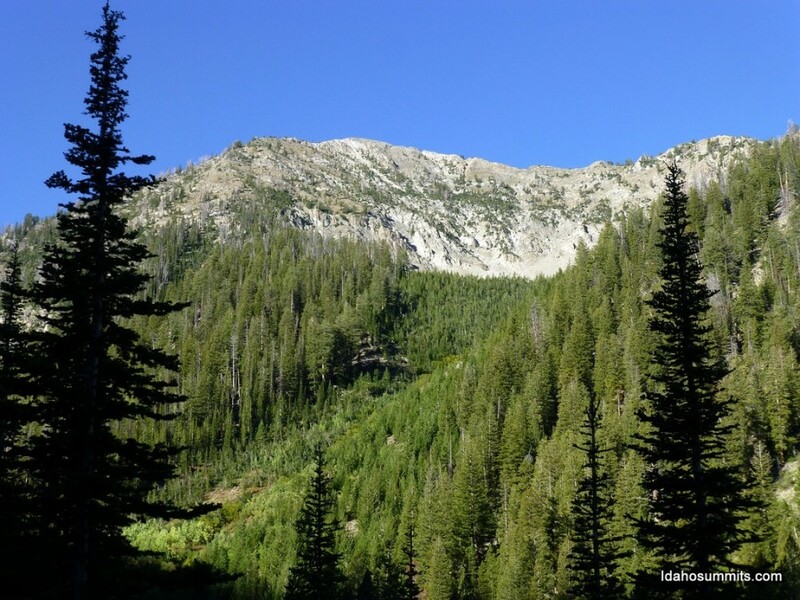 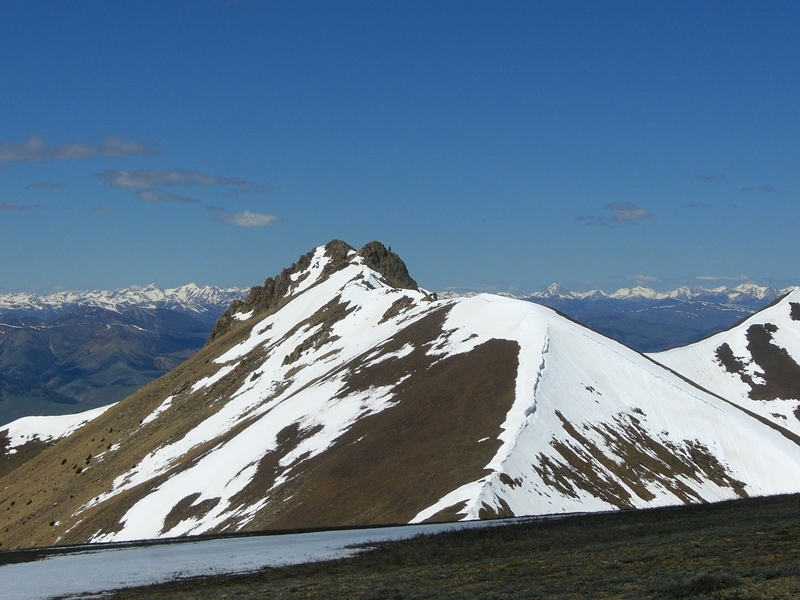 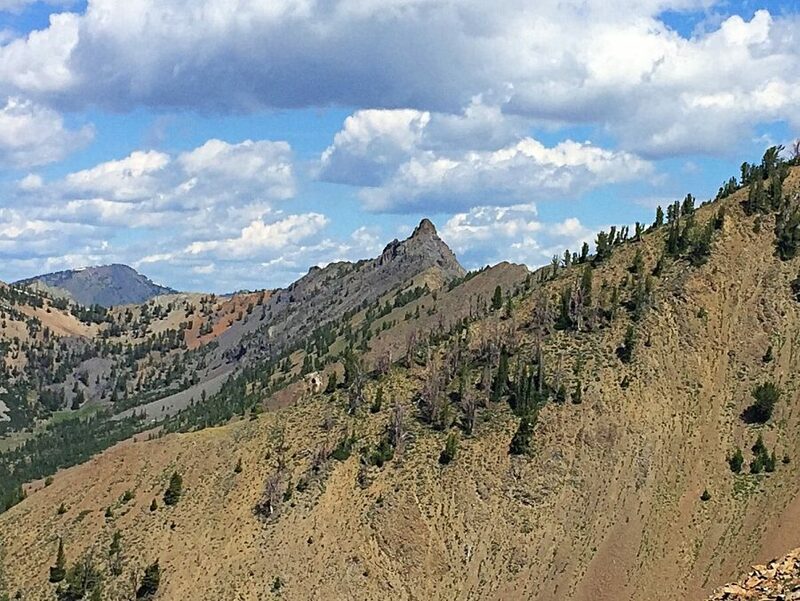 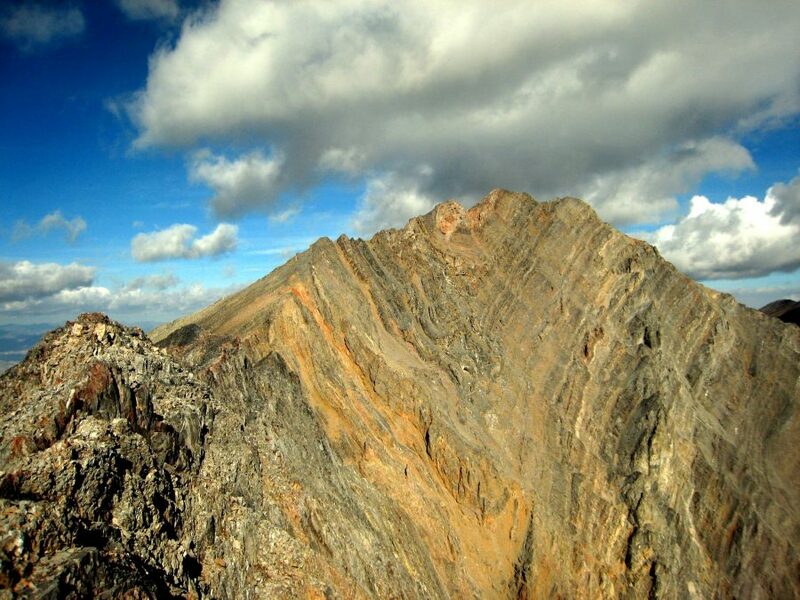 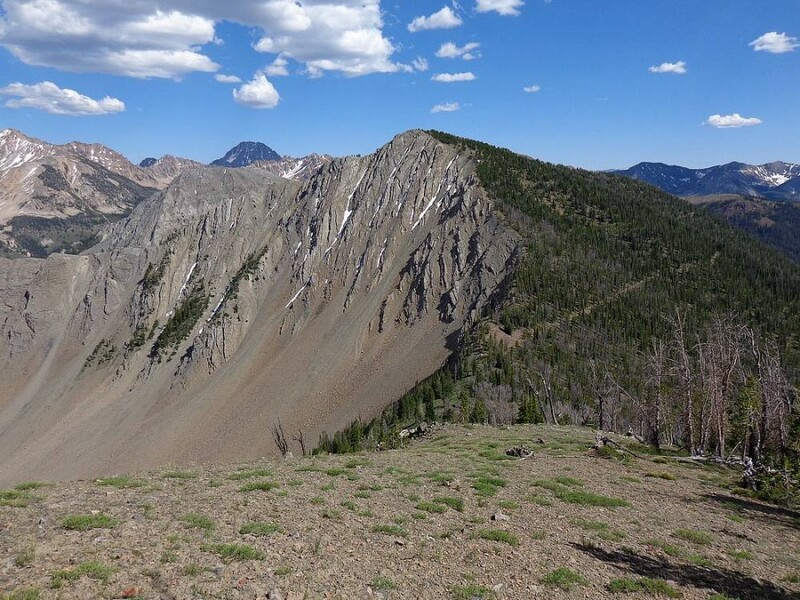 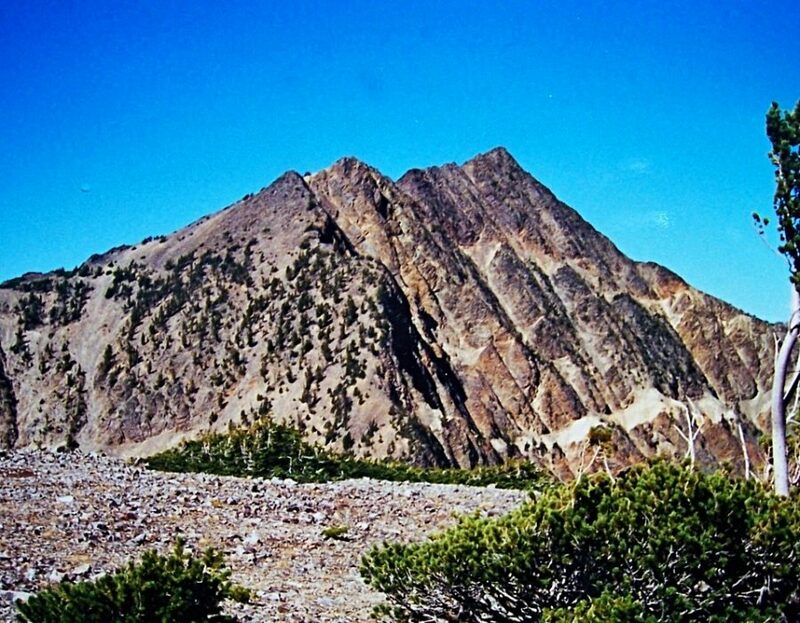 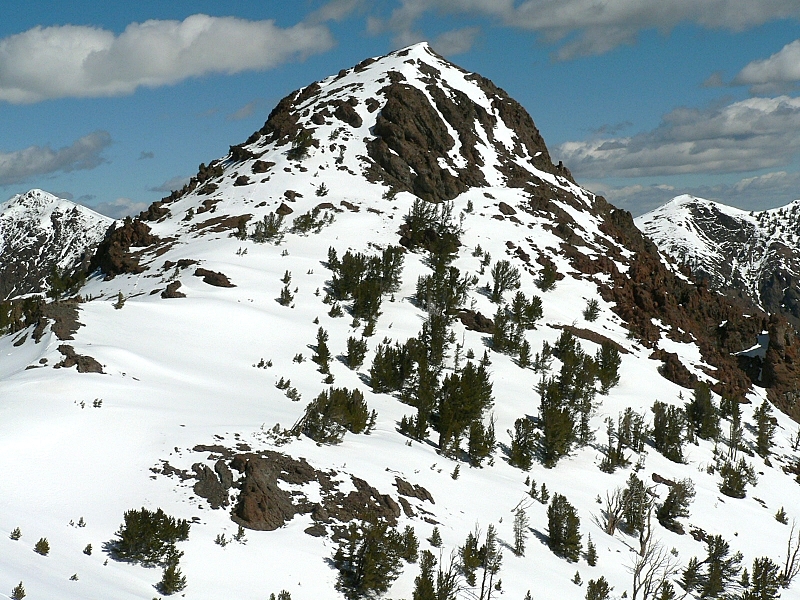 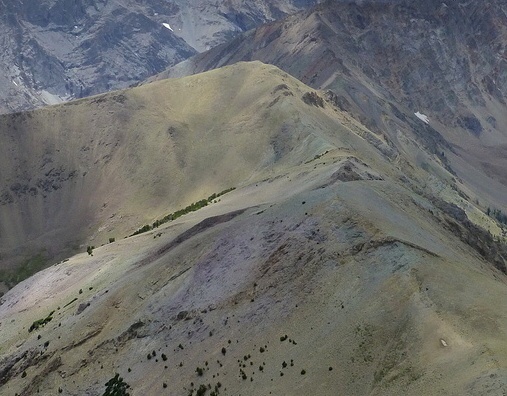 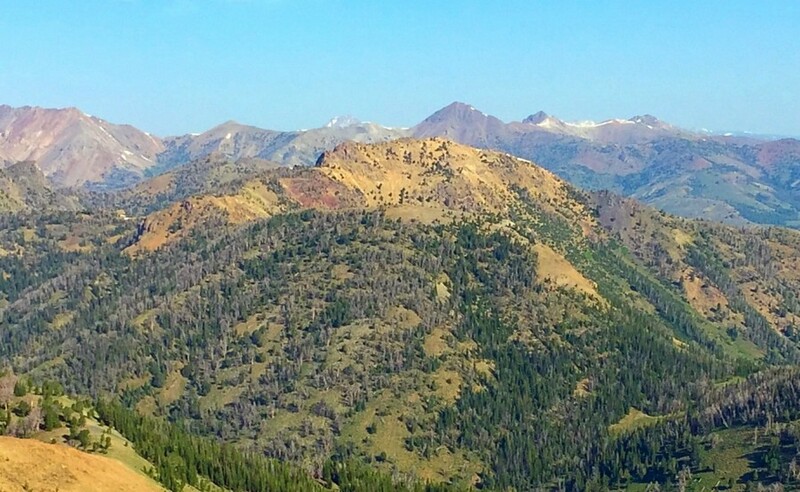 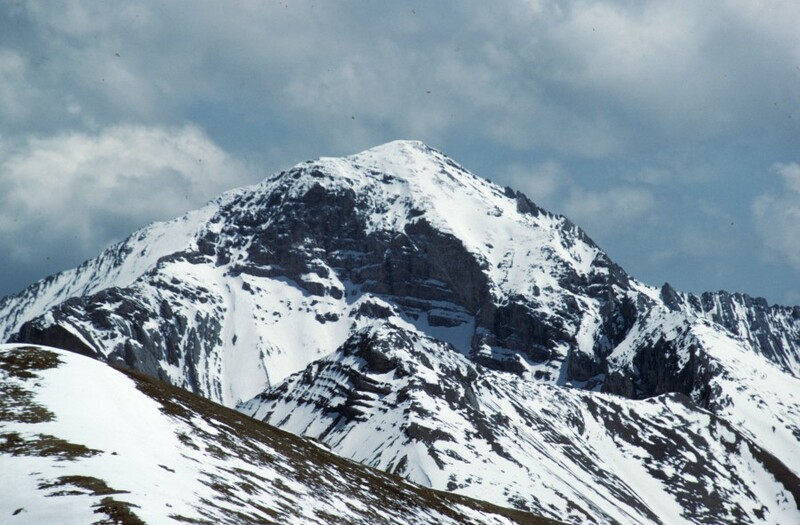 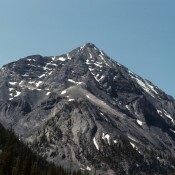 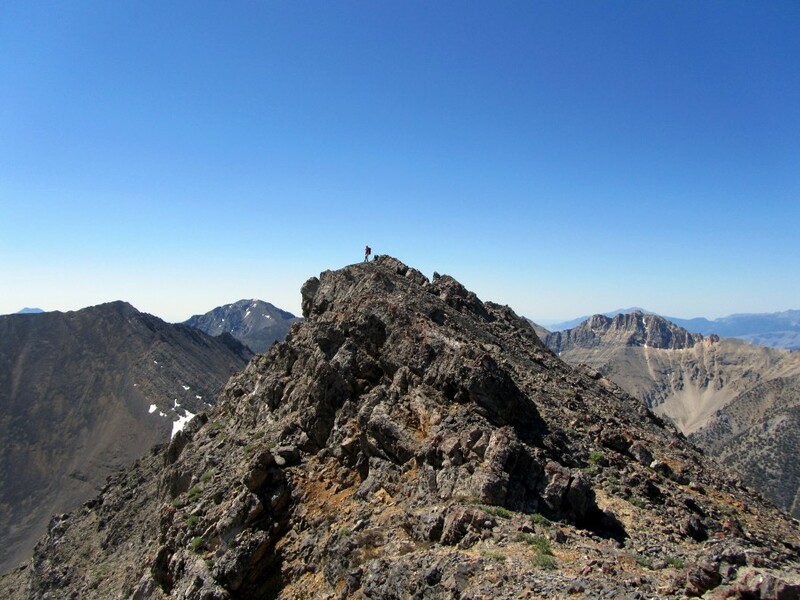 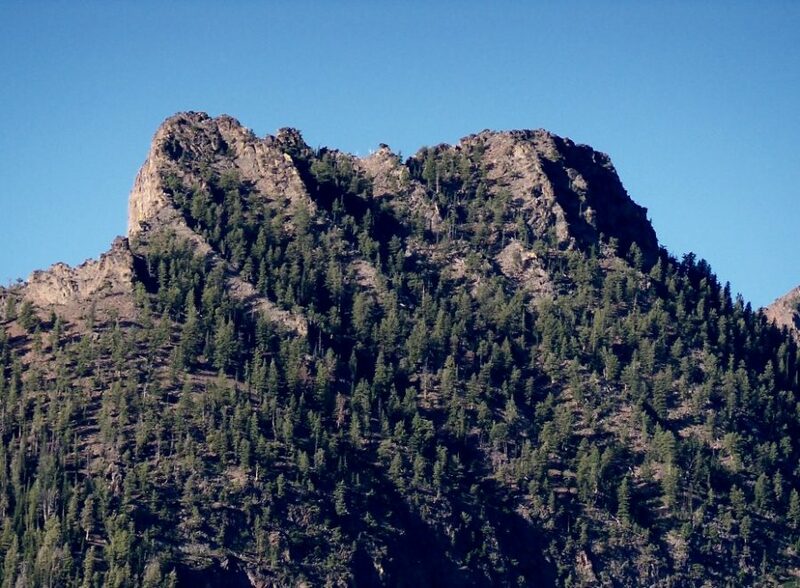 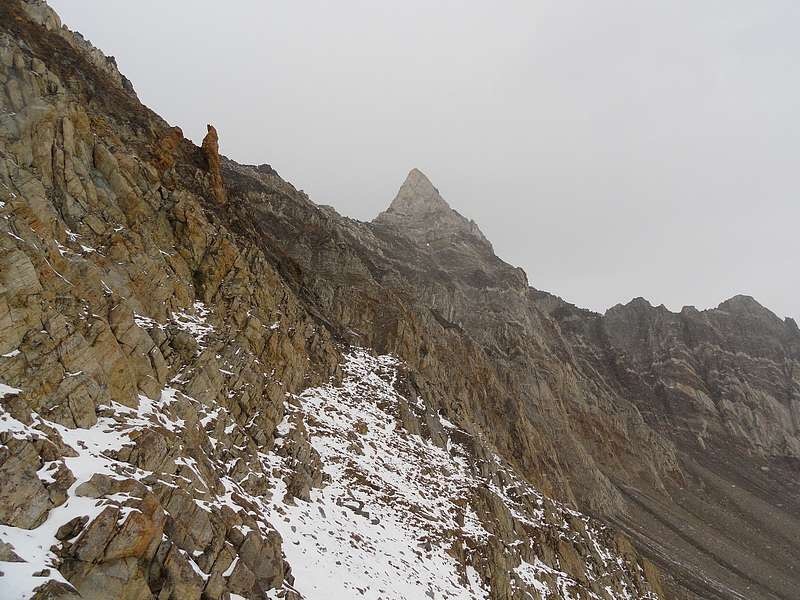 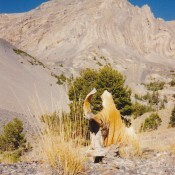 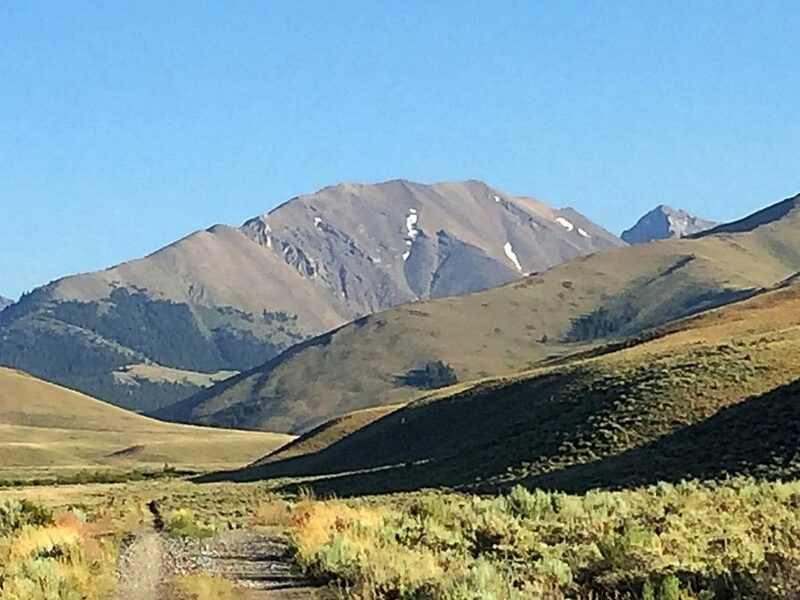 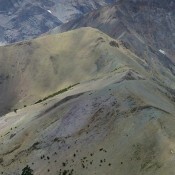 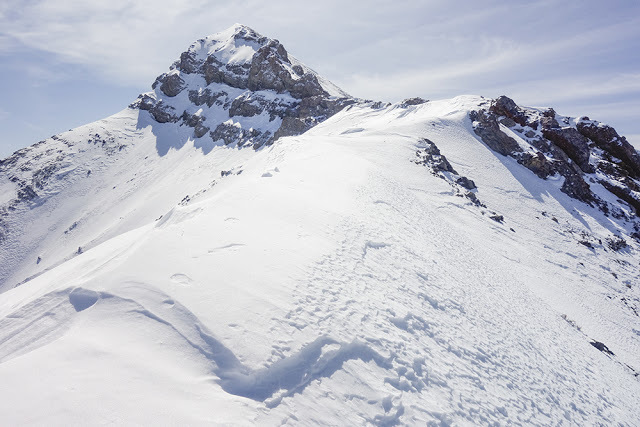 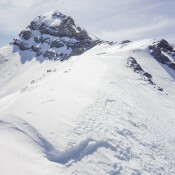 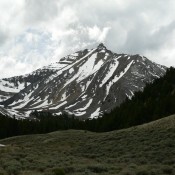 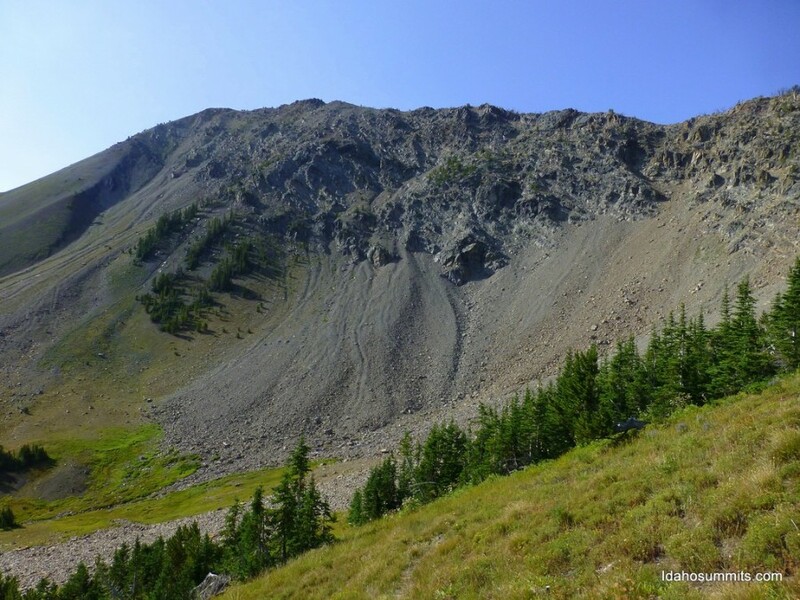 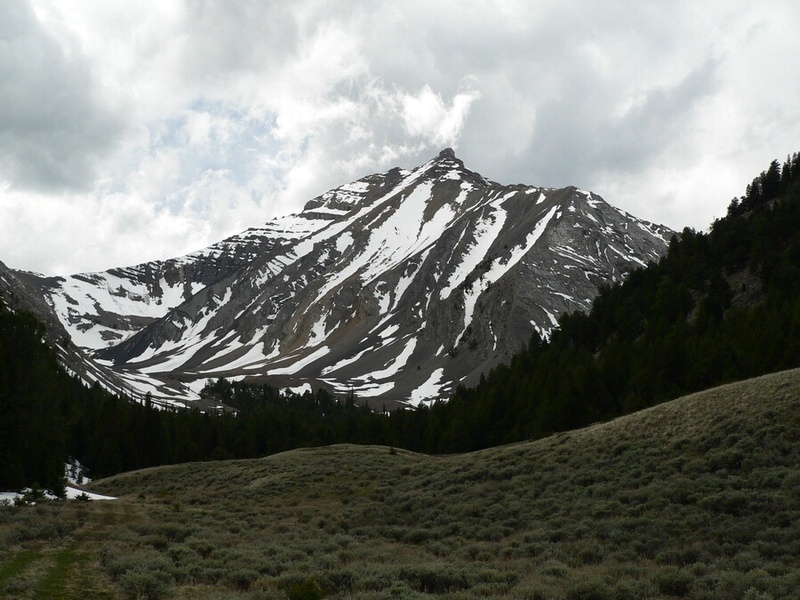 The Riddler Lemhi Range 11,598 ft 600 2015 Climbing information for this peak is found on pages 308 to 309. 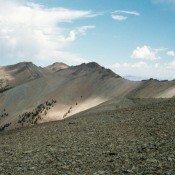 Abel Peak Pioneer Mountains 11,516 ft 336 Climbing information for this peak is found on pages 246-247. Peak 11509 (Cleft Peak) Lost River Range 11,509 ft 849 1998 Route information for this peak is found at pages 282 and 283. 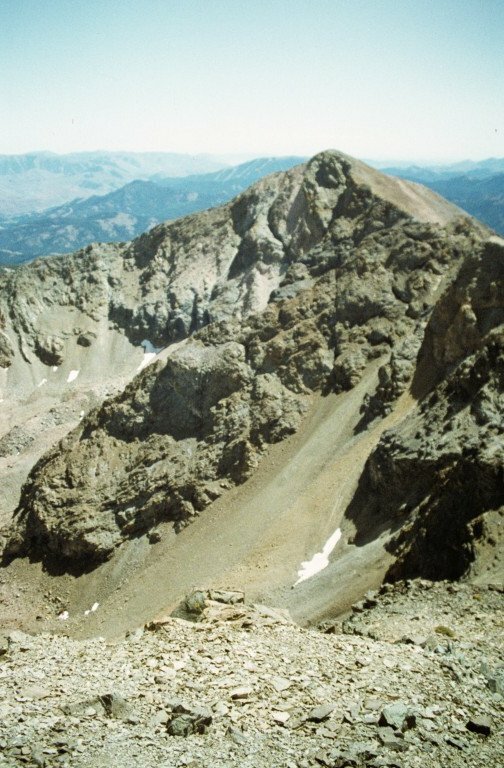 Smiley Mountain Pioneer Mountains 11,508 ft 2648 1989 Climbing and access information for this peak is found on page 257. 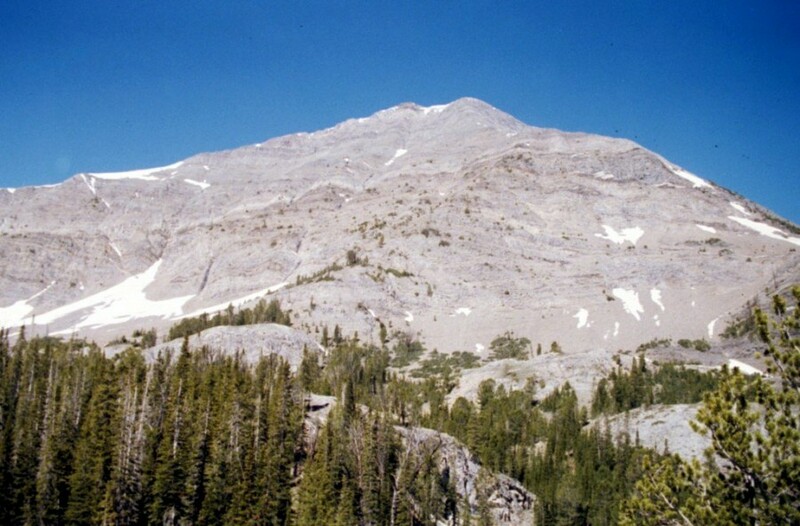 Peak 11473 (Horseshoe Mountain) Lost River Range 11,473 ft 333 Climbing information for this peak is discussed on page 270. 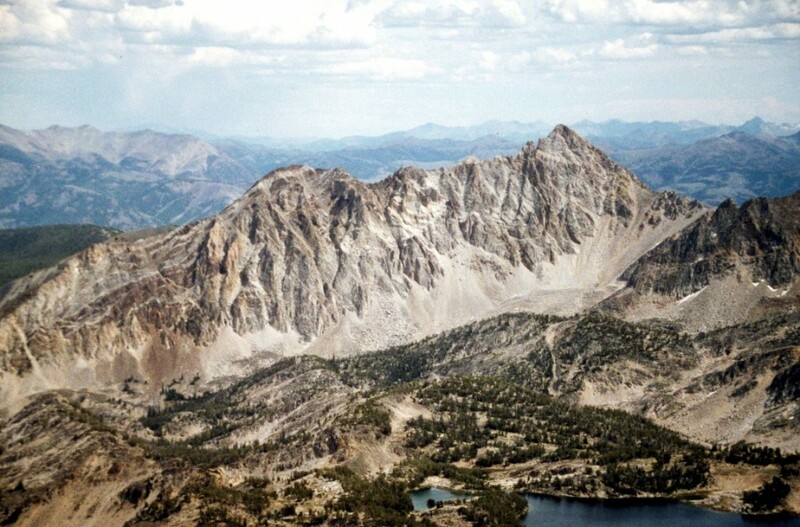 Shadow Lake Peak Lost River Range 11,401 ft 221 1982 Climbing and access information for this peak is found on page 285. 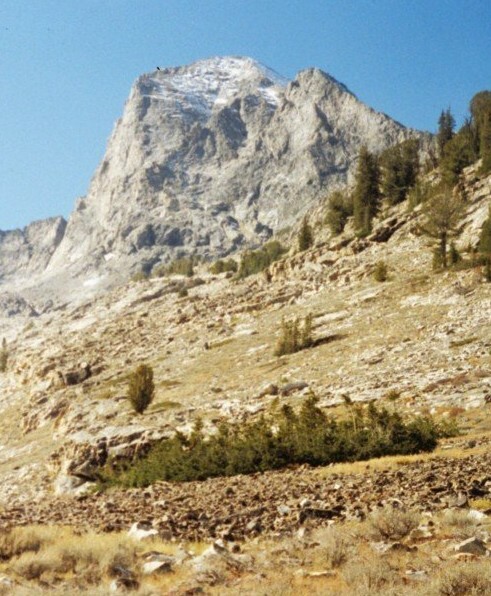 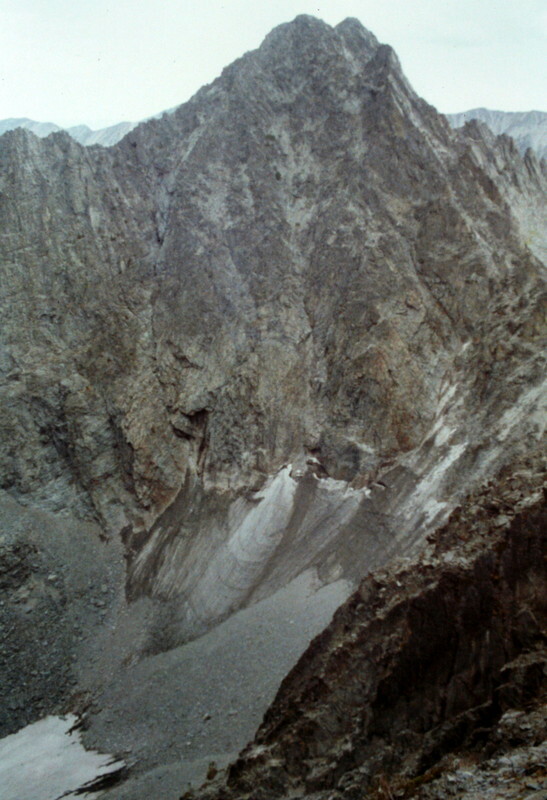 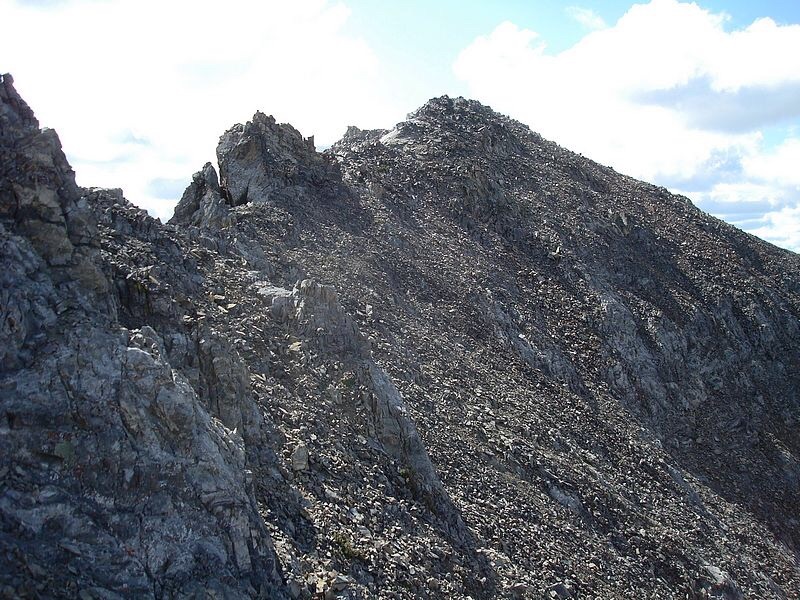 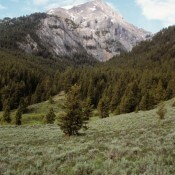 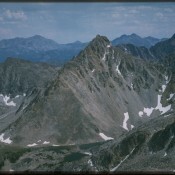 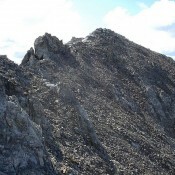 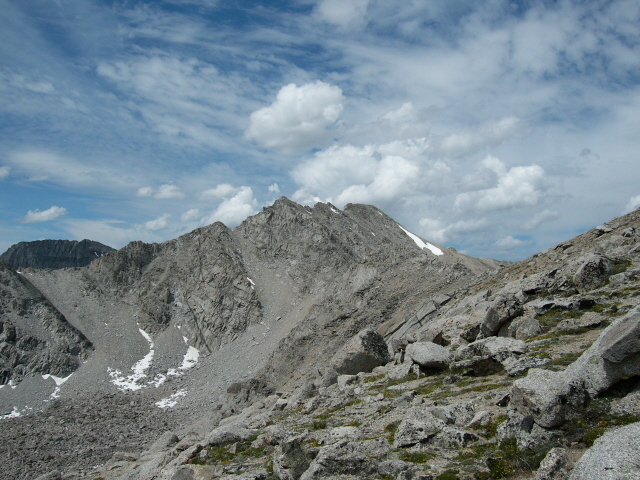 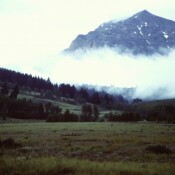 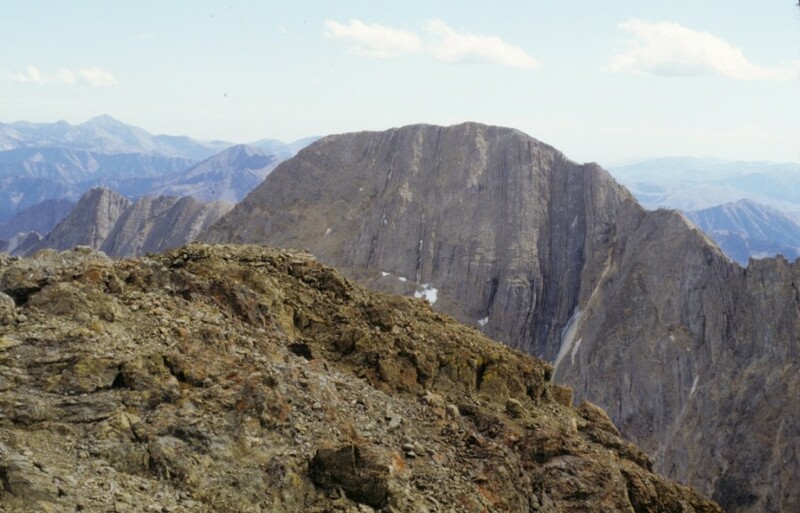 Invisible Mountain Lost River Range 11,330 ft 750 1993 Climbing information for this peak is found on page 287. 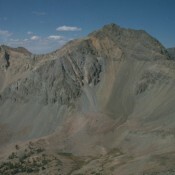 Wet Peak Lost River Range 11,309 ft 609 Climbing and access information for this peak is found on page 287. 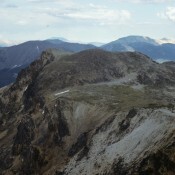 Hidden Peak Lost River Range 11,308 ft 488 Climbing information for this peak is found on page 286. 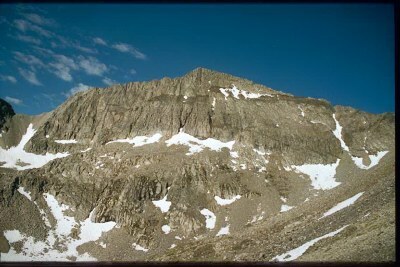 Peak 11305 (The Box) Pioneer Mountains 11,305 ft 325 1979 This peak is found on page 252. 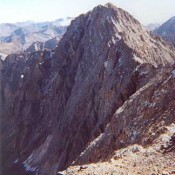 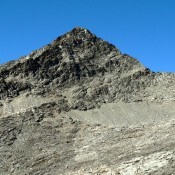 Sheephead Peak Lost River Range 11,276 ft 456 Climbing an access information for this peak is found on page 287. 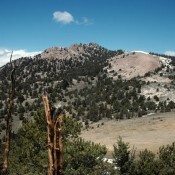 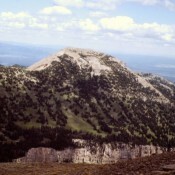 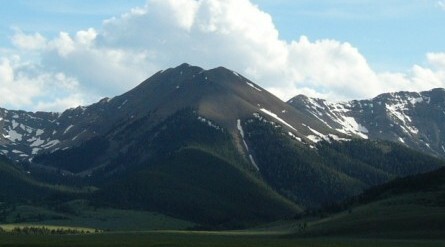 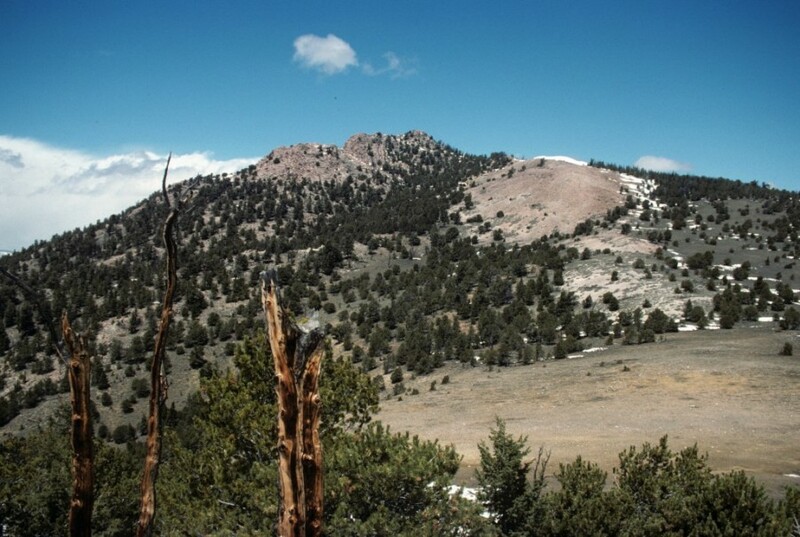 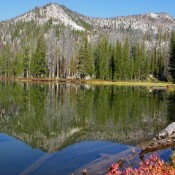 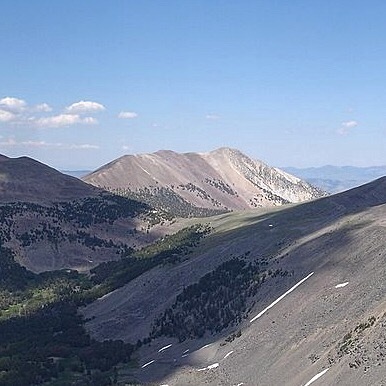 Redbird Mountain White Knob Mountains 11,273 ft 653 Climbing information for this peak is found on pages 263 to 264. 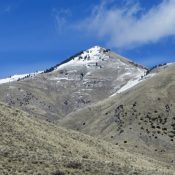 Little Diamond Peak Lemhi Range 11,272 ft 892 Climbing information for this peak is found on page 310. 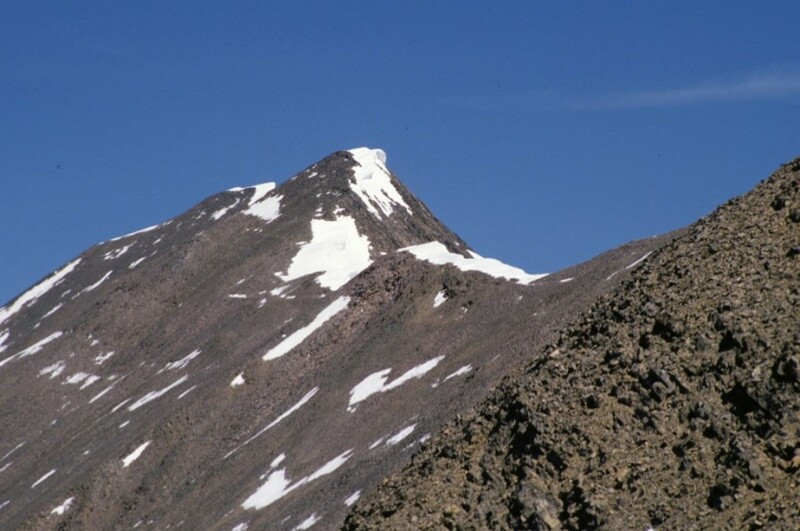 Peak 11258 (Alcyon) Pioneer Mountains 11,258 ft 640 Climbing information for this peak is found on page 257. 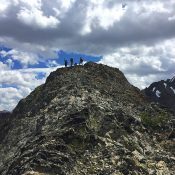 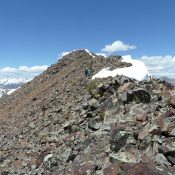 Peak 11220 (Apex Peak) Lost River Range 11,220 ft 440 2017 This peak is not in the book. 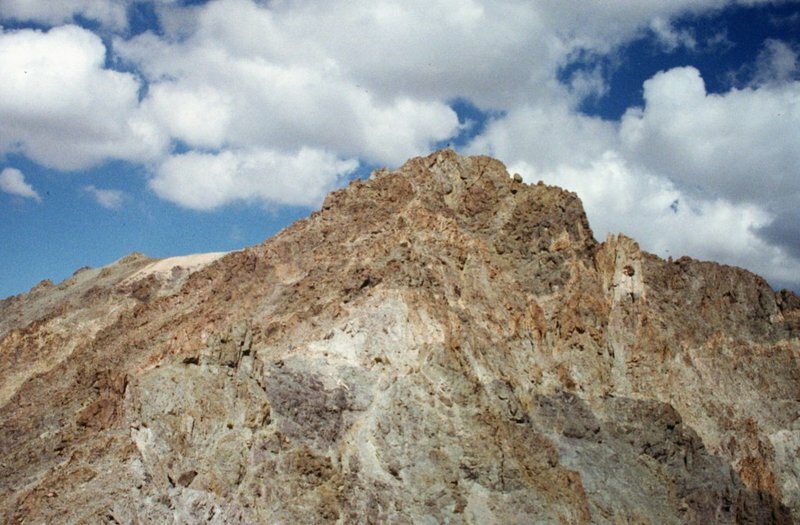 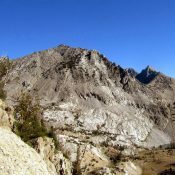 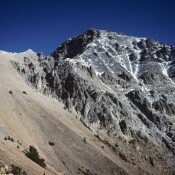 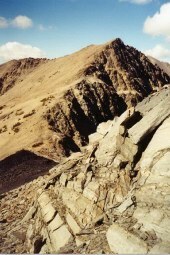 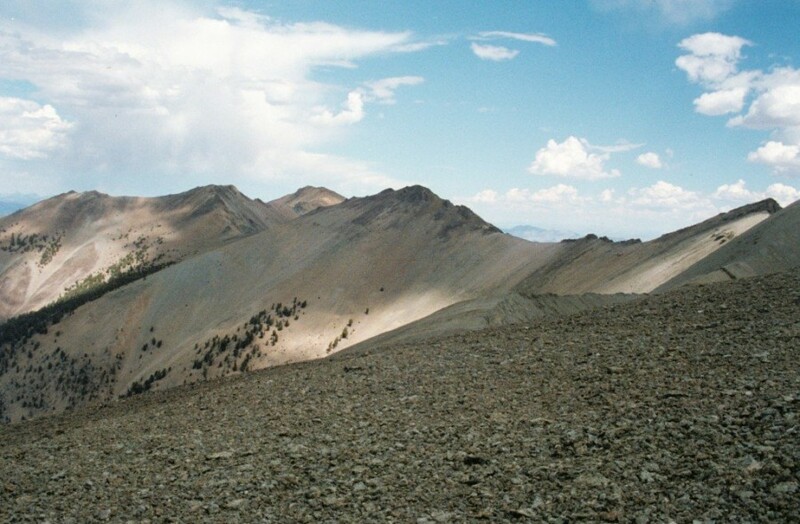 Shoshone John Peak Lemhi Range 11,212 ft 552 Climbing information for this peak is found on pages 309 to 310. 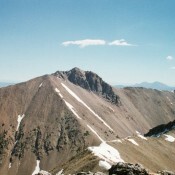 Peak 11210 (McIntyre Peak) Pioneer Mountains 11,210 ft 430 2006 Climbing information for this 11er peak is found on page 251. 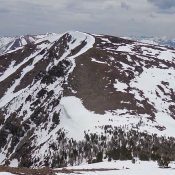 Peak 11189 (Mahogany Trident) Lost River Range 11,189 ft 329 2017 This peak is not in the book. 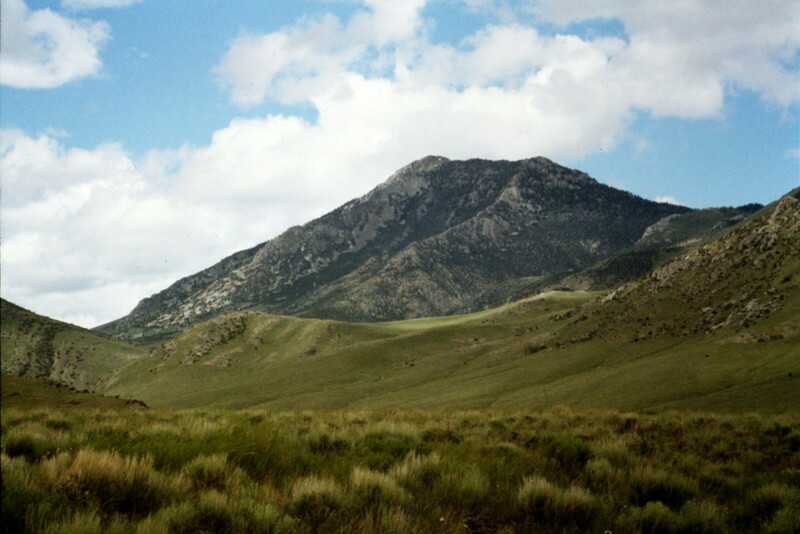 Lime Mountain White Knob Mountains 11,179 ft 319 1997 Climbing information for this peak is found on page 263. 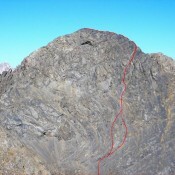 The book lists three routes. 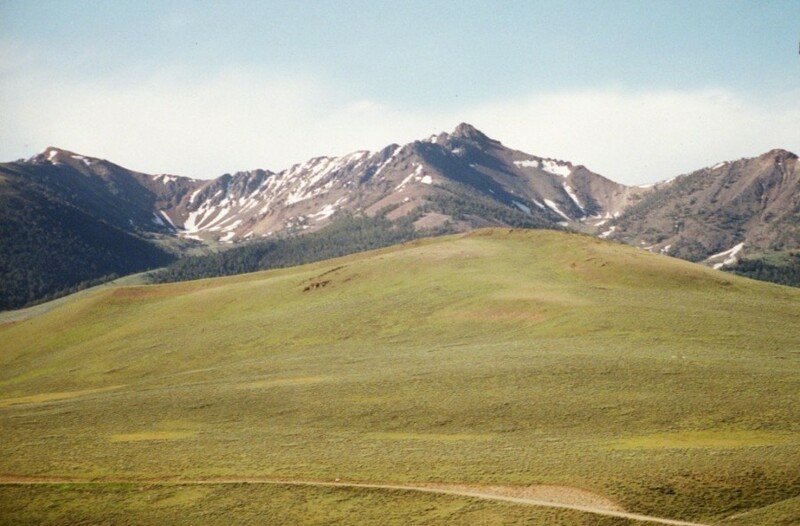 Peak 11163 (North Cabin Mountain) White Knob Mountains 11,163 ft 303 1997 This peak is identified as Cabin Mountain's northern summit in the book at page 263. 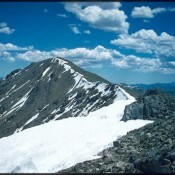 Peak 11151 (The Ramp) Pioneer Mountains 11,151 ft Climbing and access information for this peak is found on page 257. 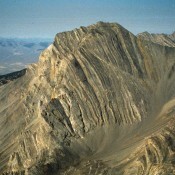 Dickey Peak Lost River Range 11,141 ft 2823 1991 Climbing and access information for this p2k peak is found on pages 268 to 269. 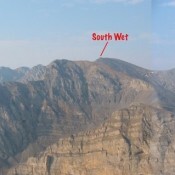 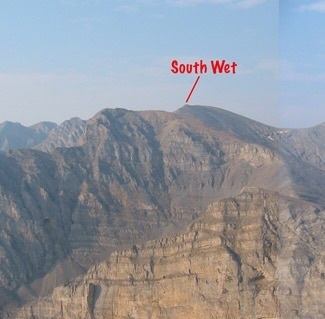 South Wet Peak Lost River Range 11,138 ft 278 Climbing and access information for this peak is found on page 287. 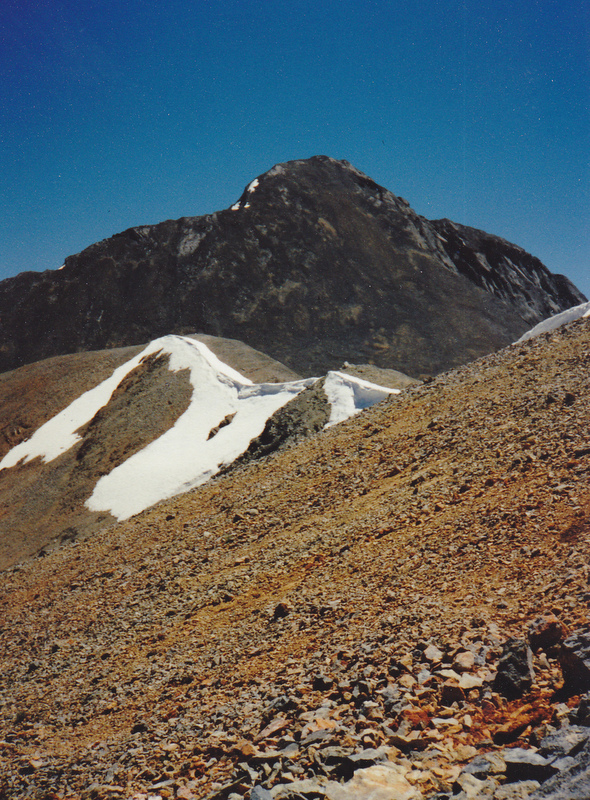 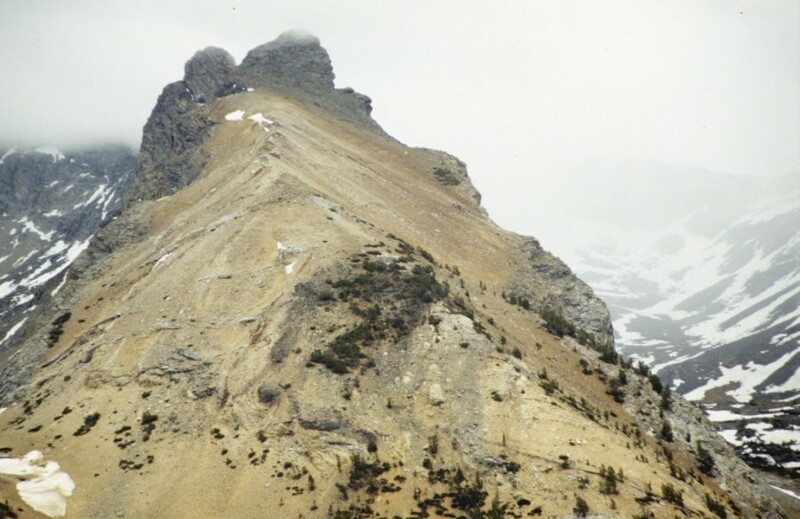 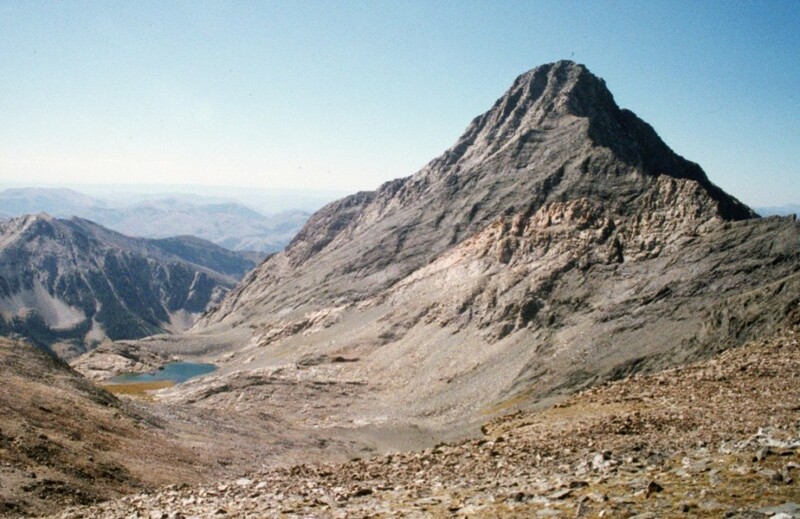 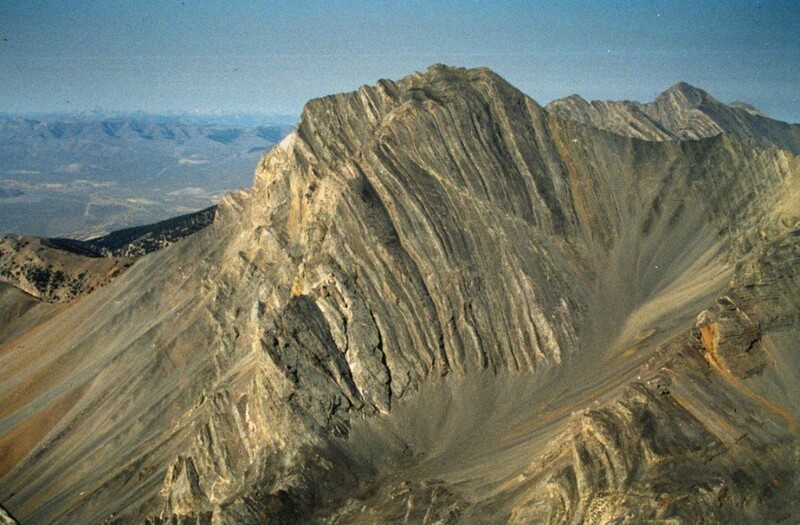 Pavlos Peak Lost River Range 11,109 ft 1209 1995 Route information for this peak is found on page 268. 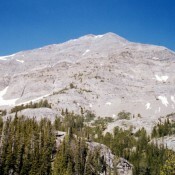 Grouse Creek Mountain Lost River Range 11,085 ft 1185 1999 Climbing and access information for this peak is found on page 266. 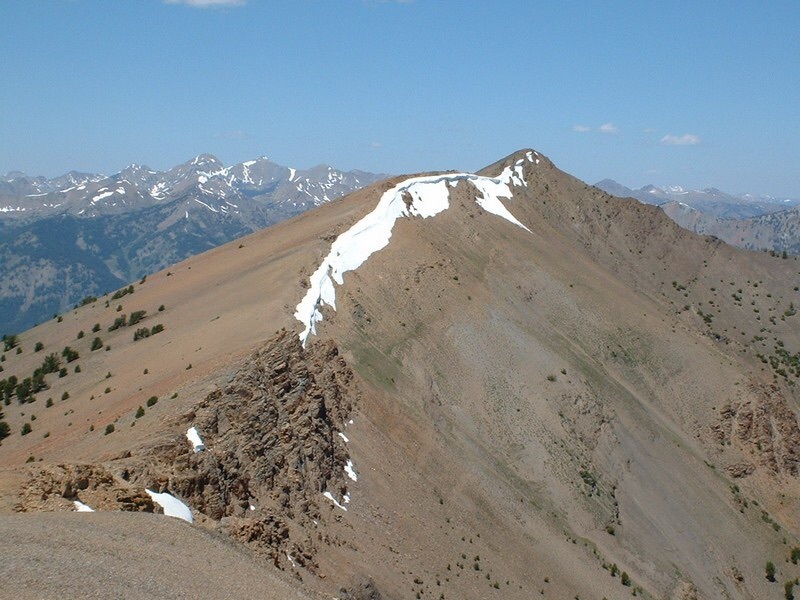 Nicholson Peak Lemhi Range 11,051 ft 805 2006 Climbing information for this peak is on page 310. 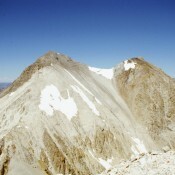 Peak 11039 (Atlas Peak) Pioneer Mountains 11,039 ft 600 This peak is found on page 257. 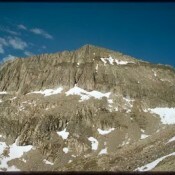 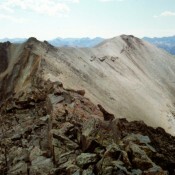 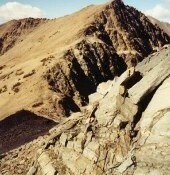 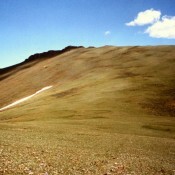 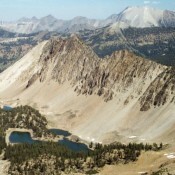 Hope Peak Lost River Range 11,010 ft 560 Climbing and access information for this peak is found on page 262. 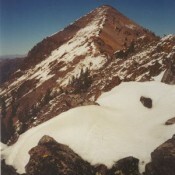 Peak 10995 (Double U Peak) Pioneer Mountains 10,995 ft 495 This peak is not in the book. 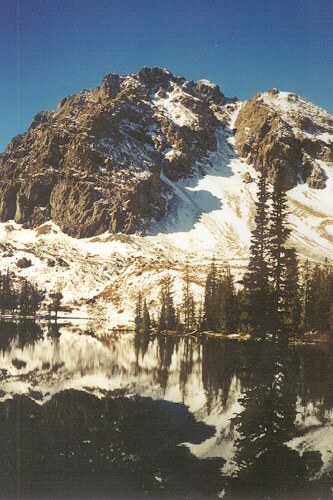 Published January 2018. 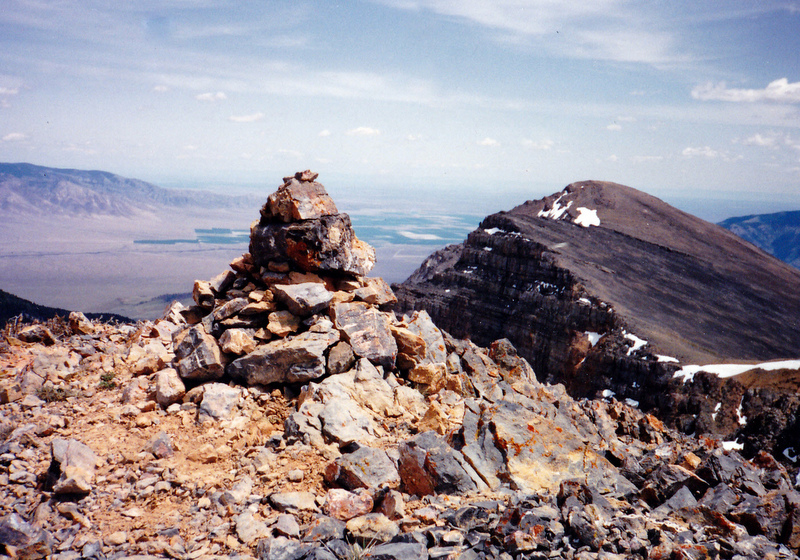 Peak 10972 (No Respect Peak) Lemhi Range 10,972 ft 352 This peak is not discussed in the book, though it is pictured on page 303. 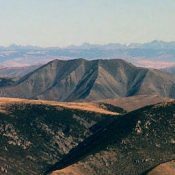 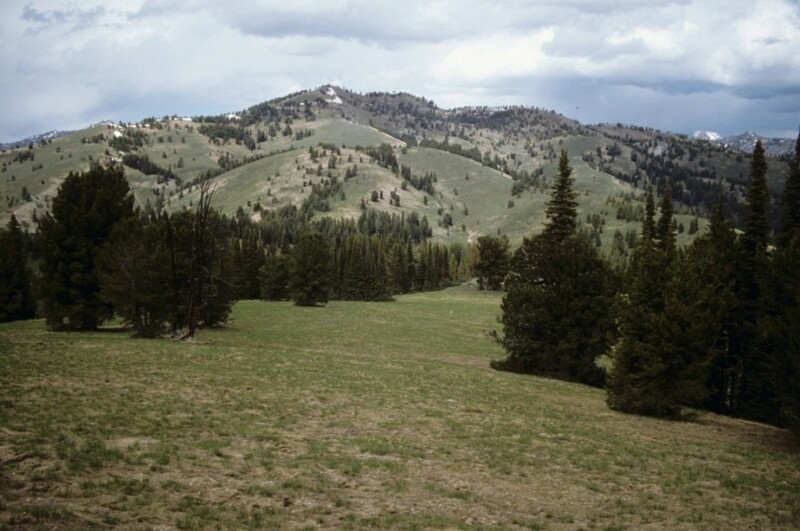 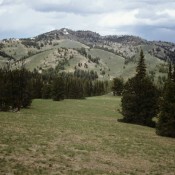 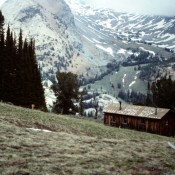 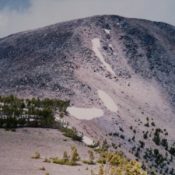 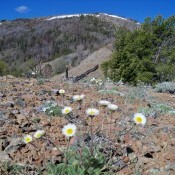 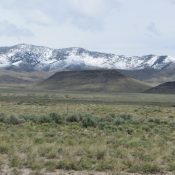 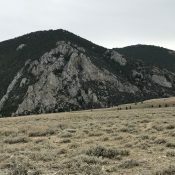 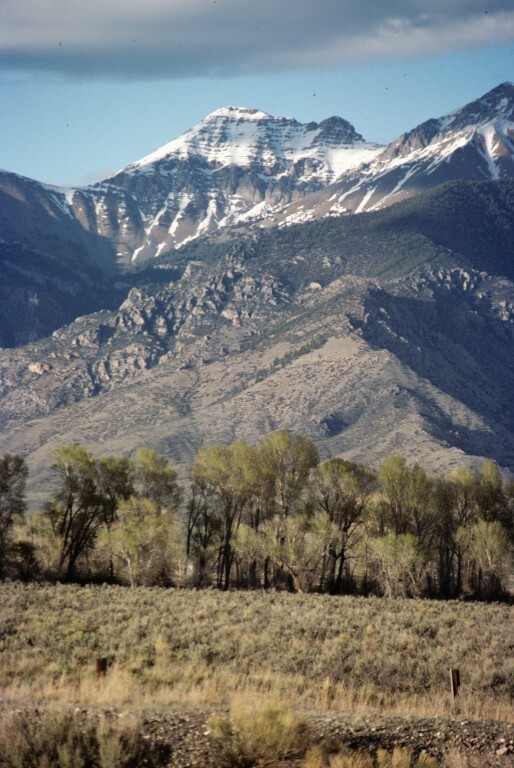 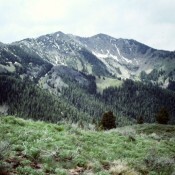 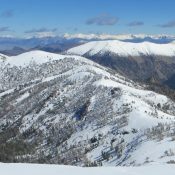 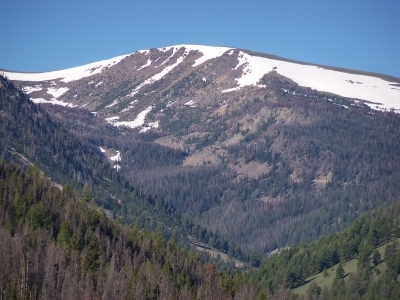 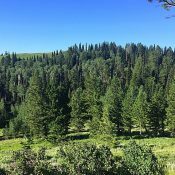 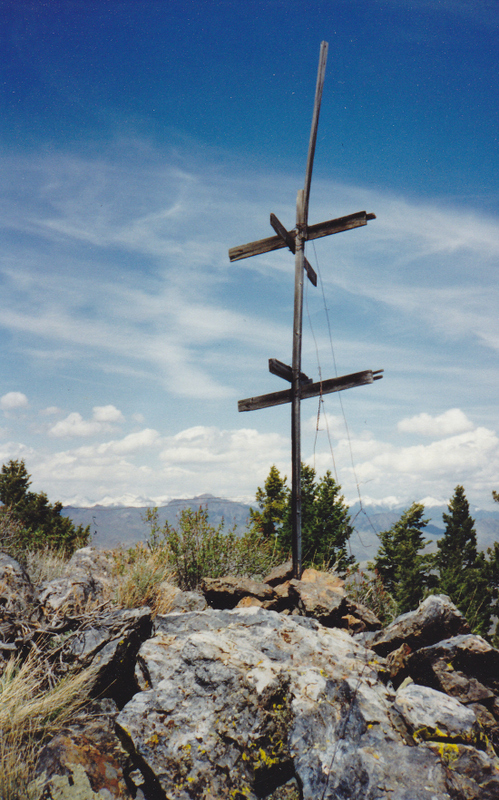 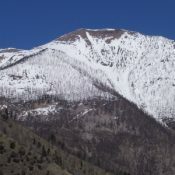 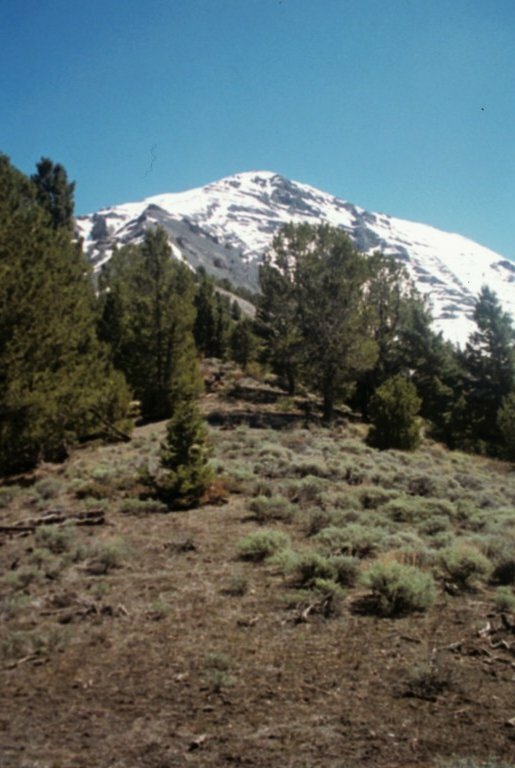 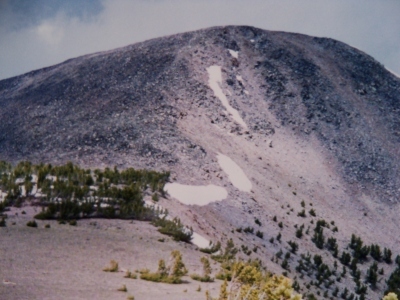 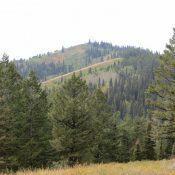 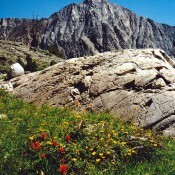 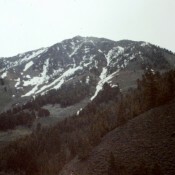 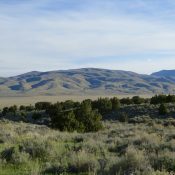 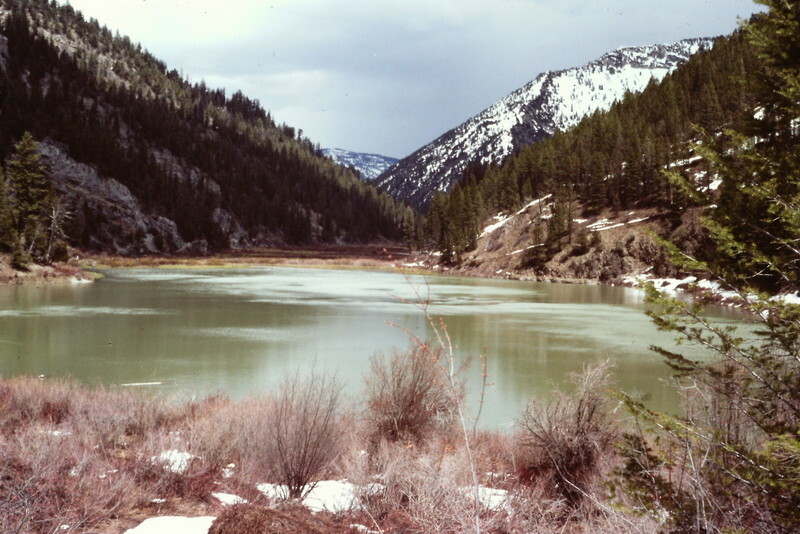 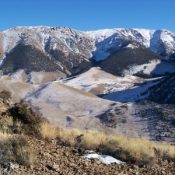 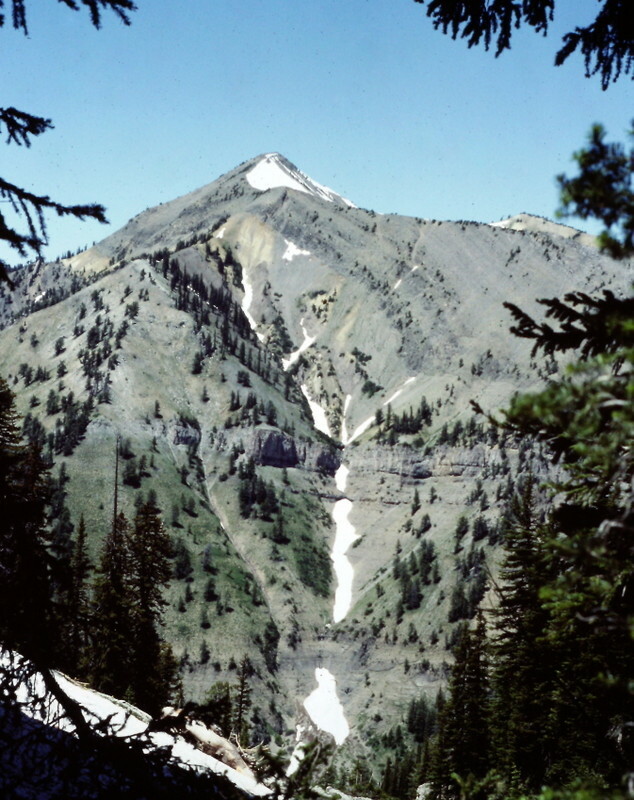 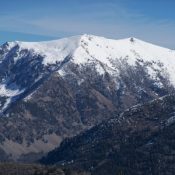 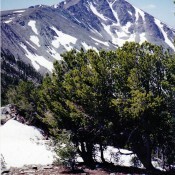 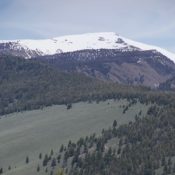 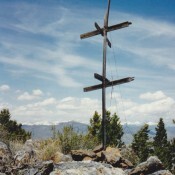 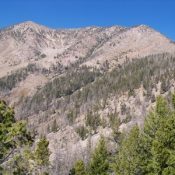 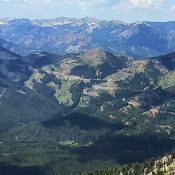 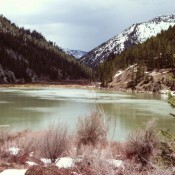 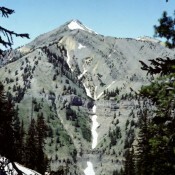 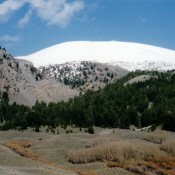 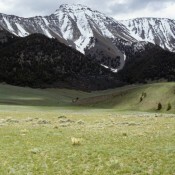 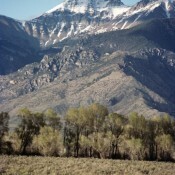 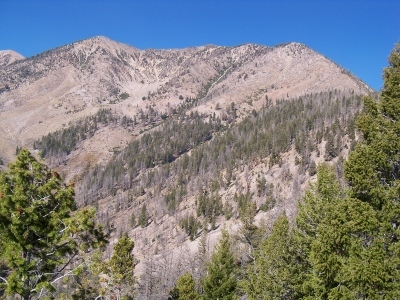 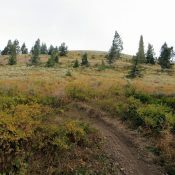 May Mountain Lemhi Range 10,971 ft 1151 1989 Climbing and access information for May Mountain is on page 298. 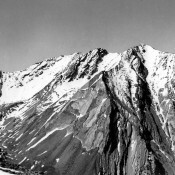 Black and White Peak Lemhi Range 10,970 ft 350 Climbing and access information for this peak is found on pages 309 and 310. 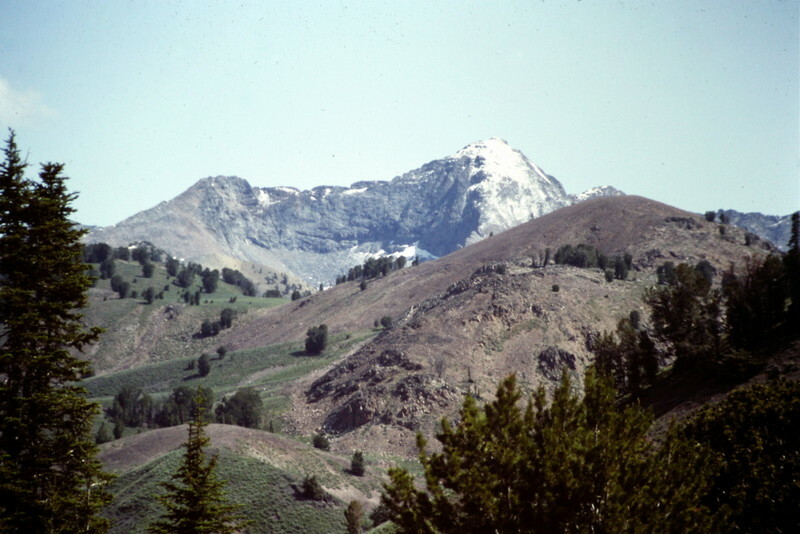 Yellow Peak Lemhi Range 10,968 ft 1308 1987 Climbing and access information for this peak is found on page 302. 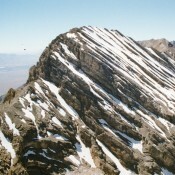 Peak 10965 Lemhi Range 10,965 ft 465 2006 Climbing and access information for this peak is described on page 310. 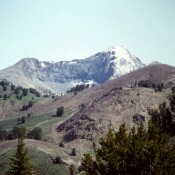 Big Sister Peak Lemhi Range 10,954 ft 1054 Climbing information for this peak is found on page 309. 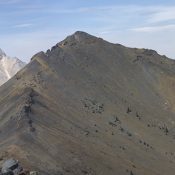 Peak 10942 (Purgatory Peak) Pioneer Mountains 10,942 ft 362 This peak is not in the book. 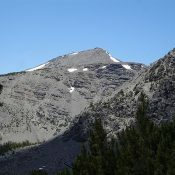 Peak 10882 (Basin Peak) Lemhi Range 10,882 ft 1371 Climbing and access information for this peak is found on page 302. 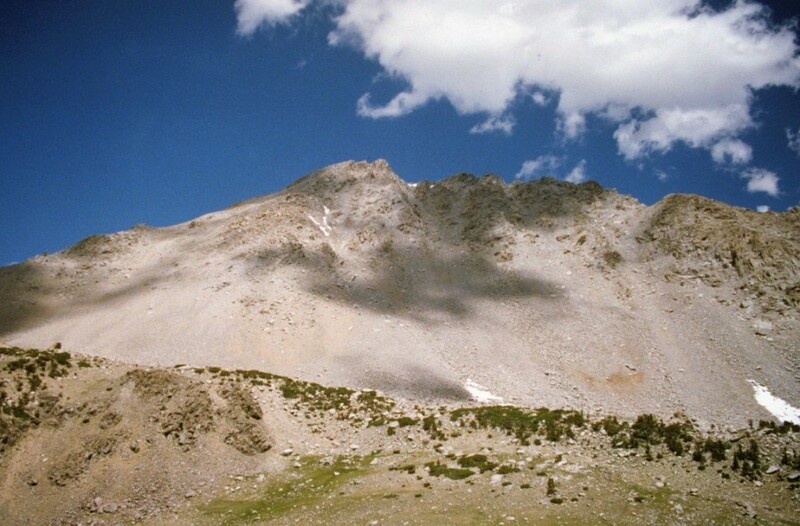 Peak 10878 Lost River Range 10,878 ft 418 2003 This peak is not in the book. 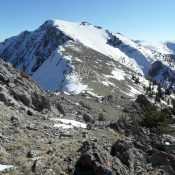 Handwerk Peak / West Peak Boulder Mountains 10,840 ft 240 1988 Climbing and access information for Handwerk Peak is found on pages 247 and 248. 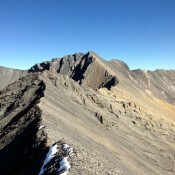 Peak 10840 (Long Ridge Peak) Pioneer Mountains 10,840 ft 300 This peak is not in the book. 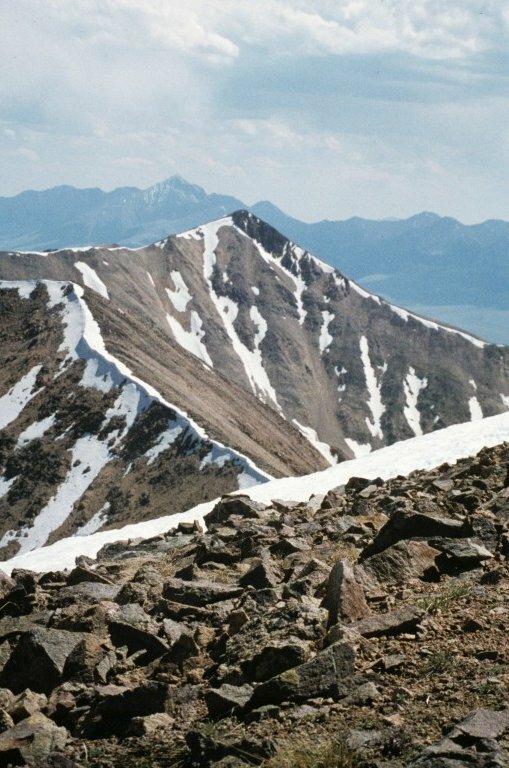 White Knob Mountain White Knob Mountains 10,835 ft 775 1989 Climbing and access information for this summit is found on page 262. 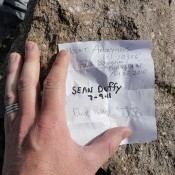 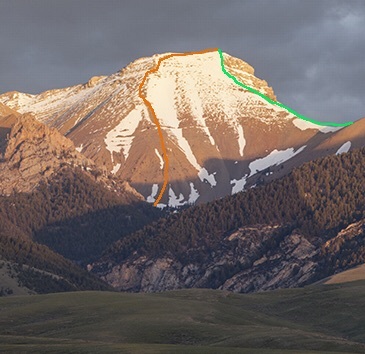 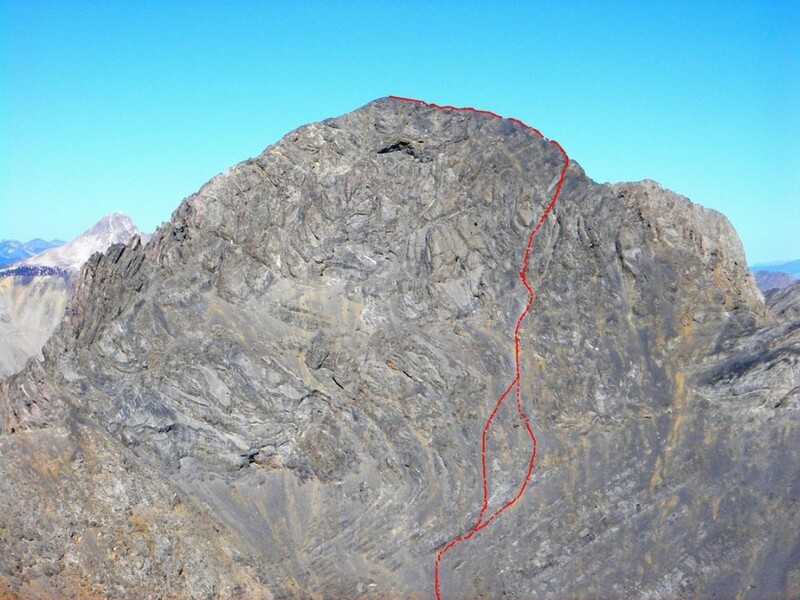 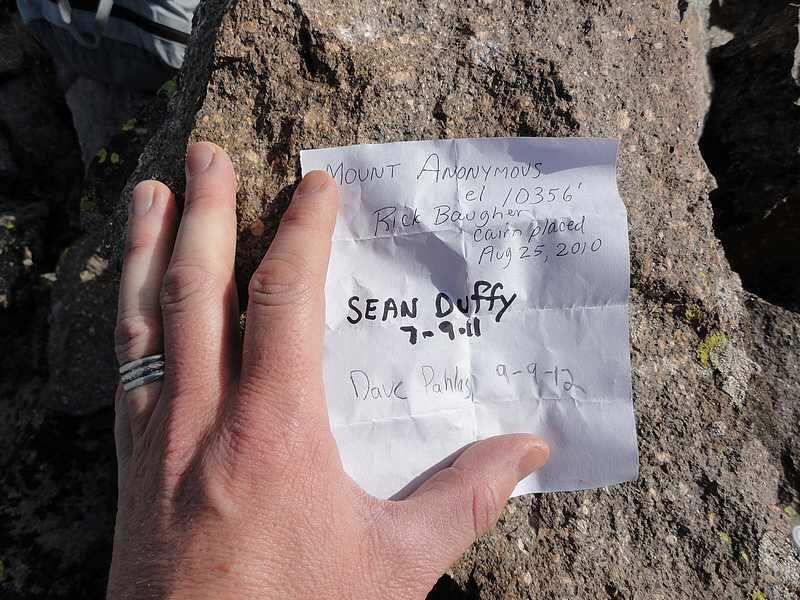 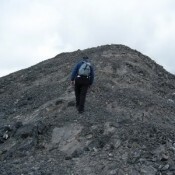 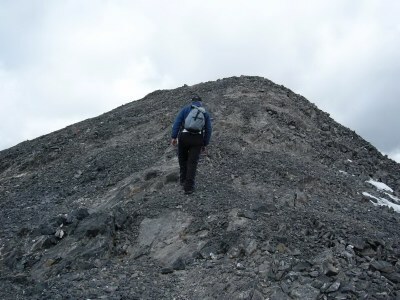 Additional climbing information for this p2k peak is found on pages 311 to 312. 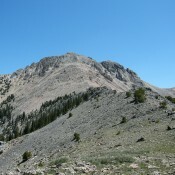 Swanson Peak Lemhi Range 10,808 ft 338 Route information for this peak is found on page 310. 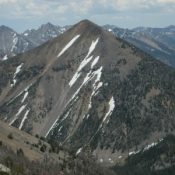 Peak 10805 (Iron Mountain) Pioneer Mountains 10,805 ft 825 2008, 2008 This peak is found on page 252. 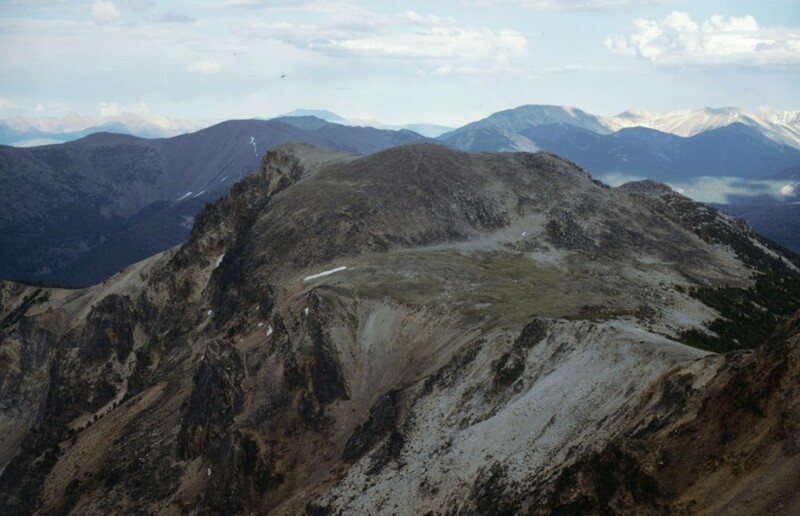 Octoberfest Peak Lost River Range 10,800 ft 1993 This peak is found on page 286. 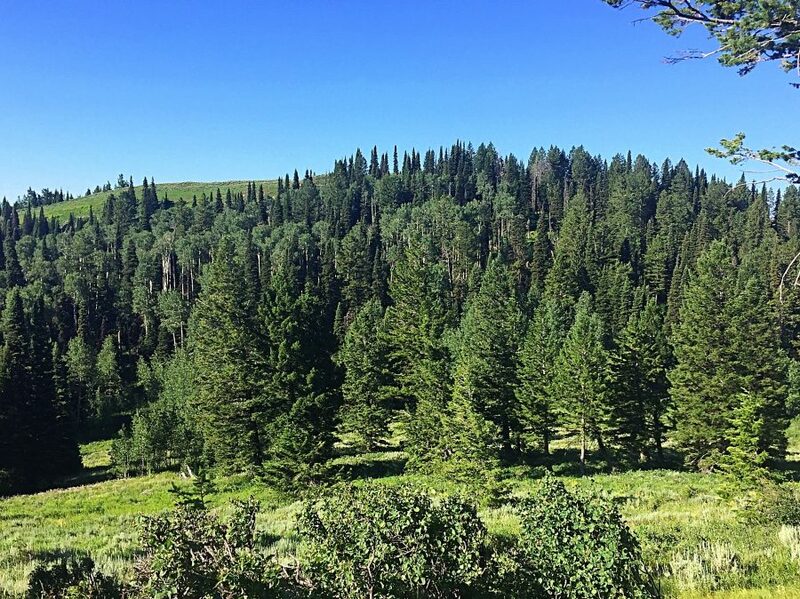 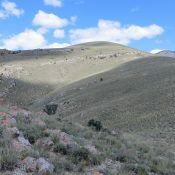 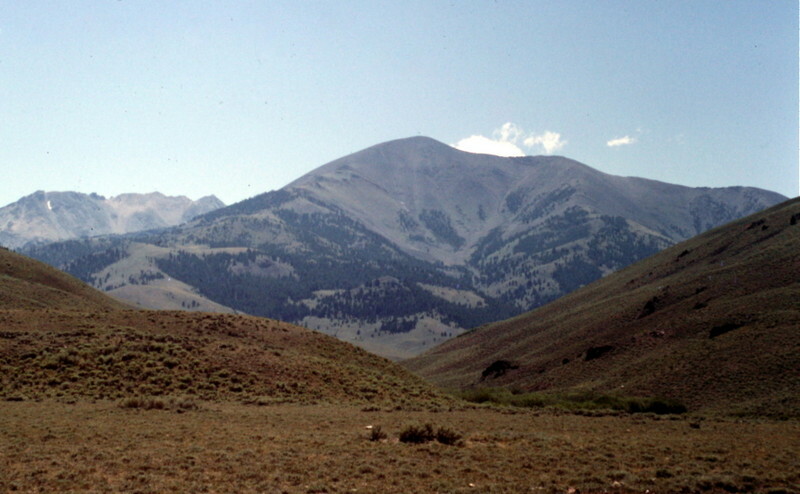 Mill Mountain Lemhi Range 10,793 ft 1515 Climbing and access information for this peak is found on page 299. 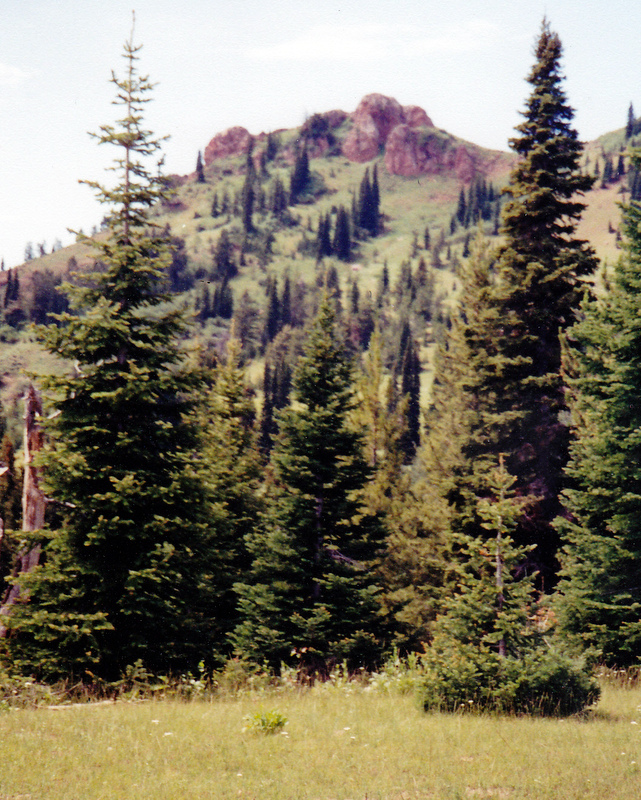 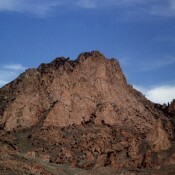 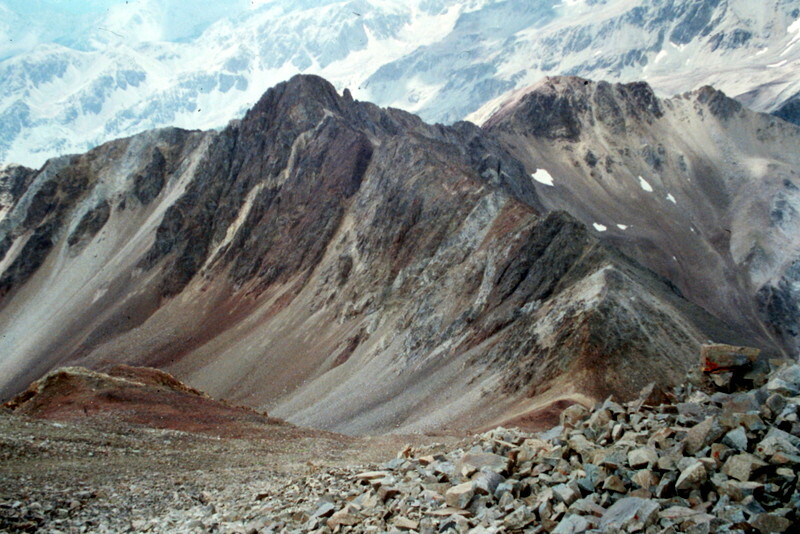 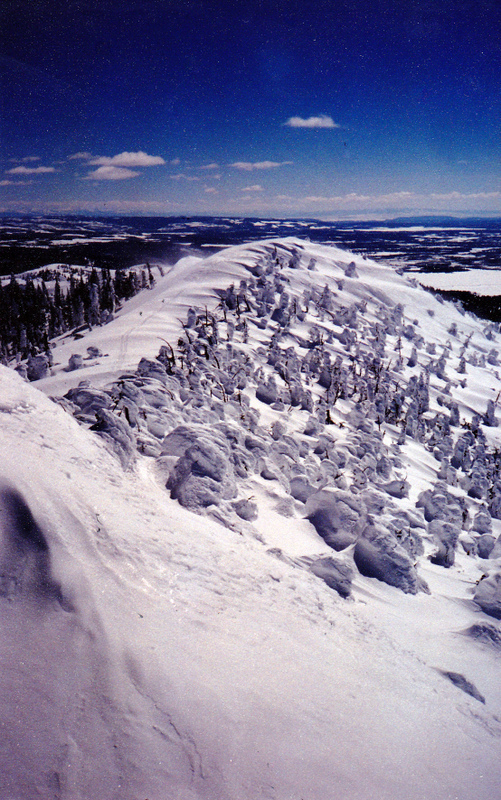 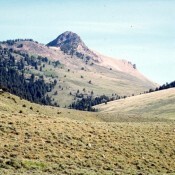 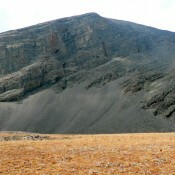 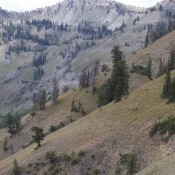 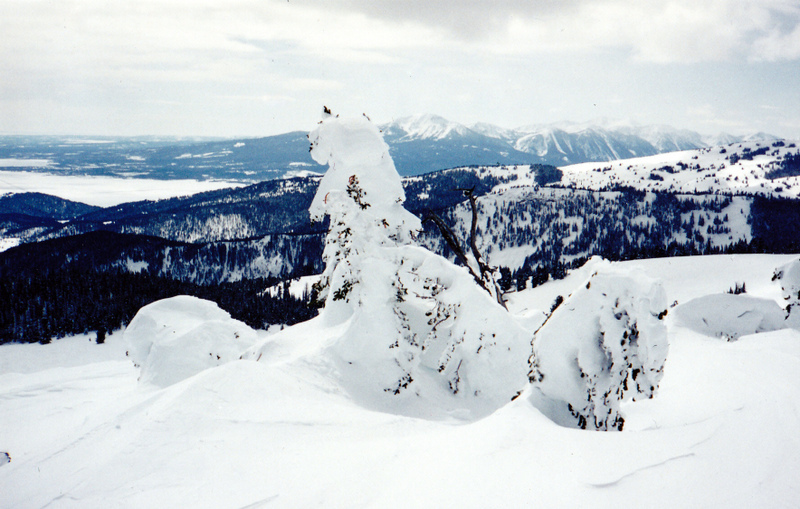 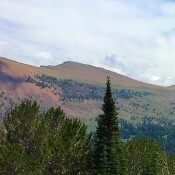 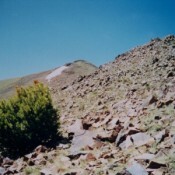 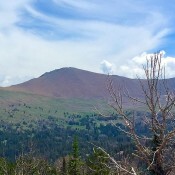 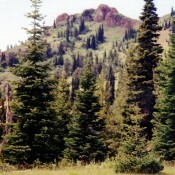 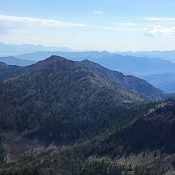 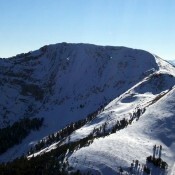 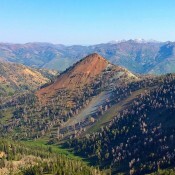 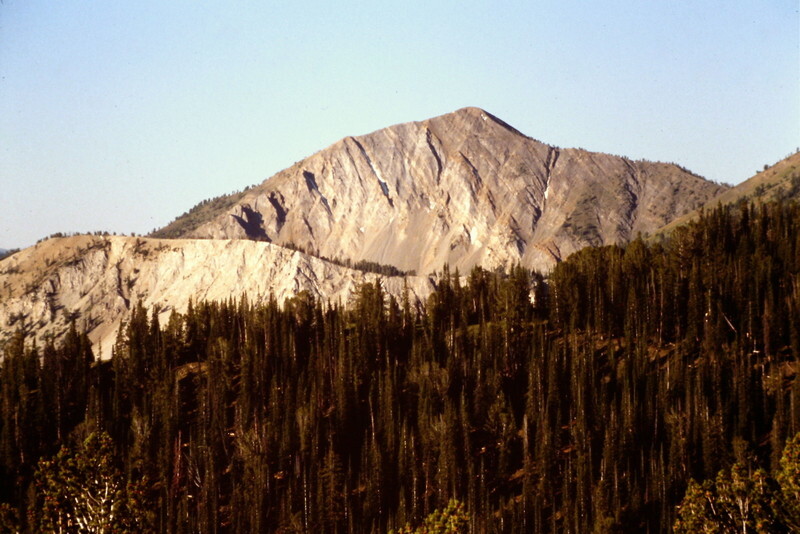 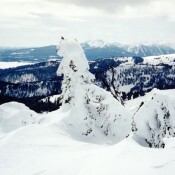 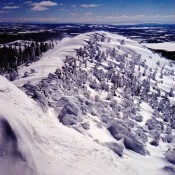 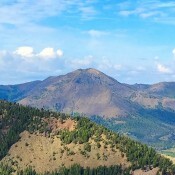 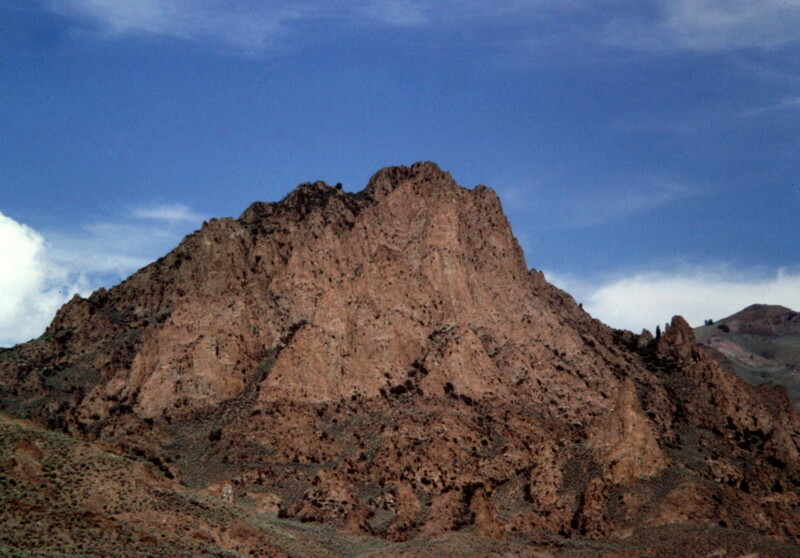 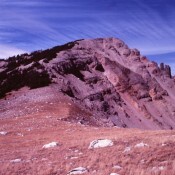 Copper Basin Knob. 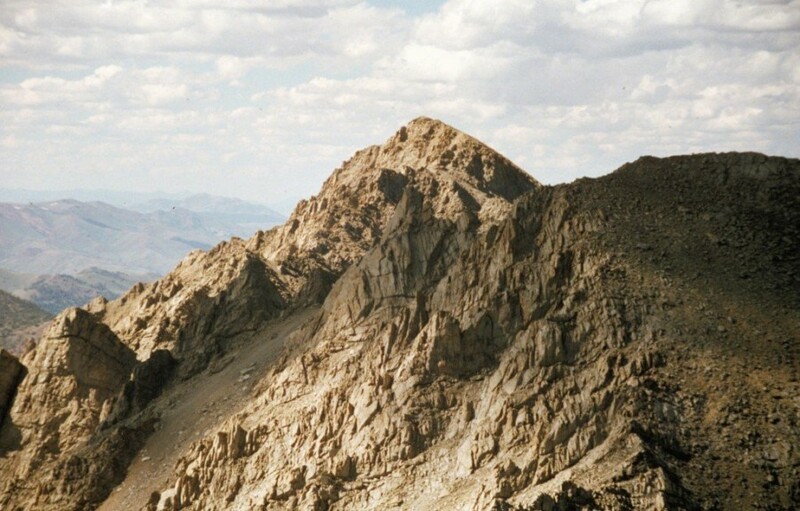 Pioneer Mountains 10,784 ft Climbing and access information for this peak is found on pages 256 and 257. 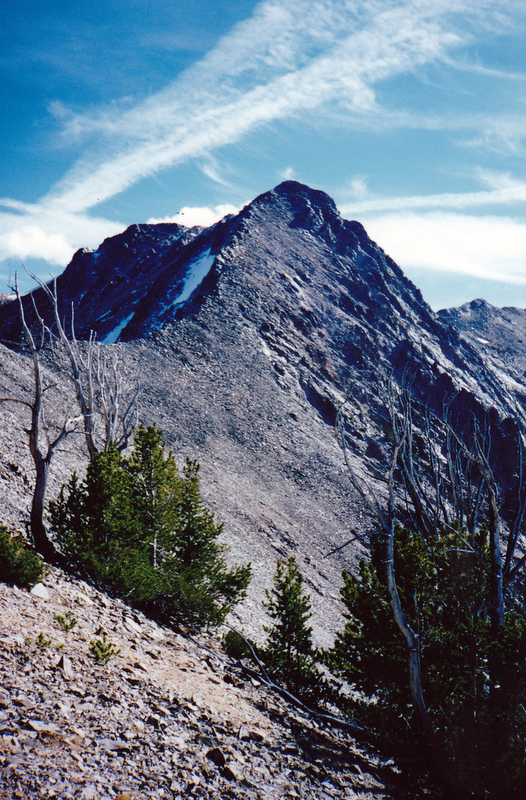 King Mountain Lost River Range 10,760 ft 1991 This peak is found on page 289. 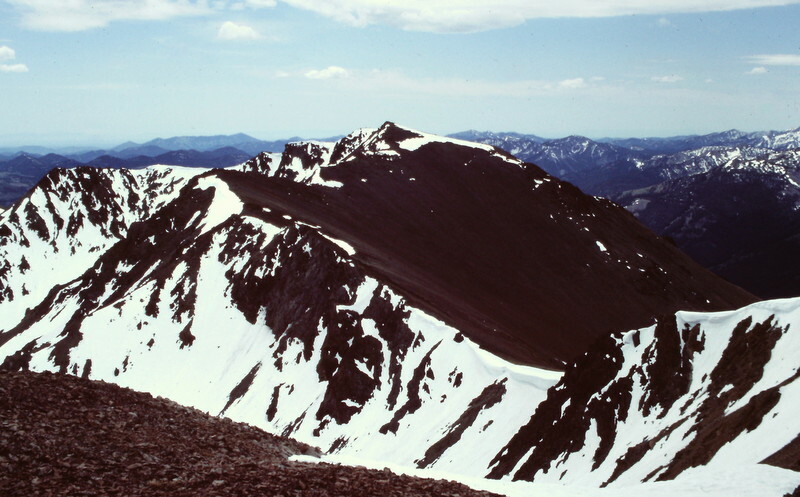 Peak 10759 (Rust Peak) Lemhi Range 10,759 ft 979 This peak is found on pages 307-8 in the book. 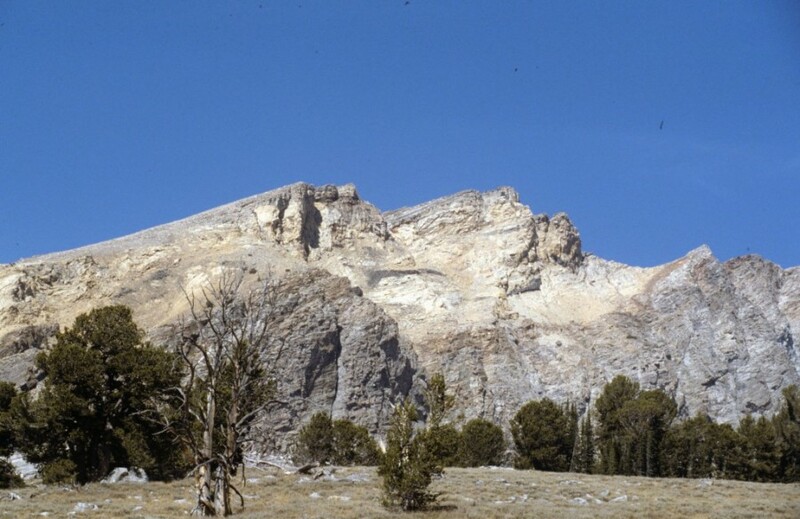 Peak 10757 (Mexaty) Lost River Range 10,757 ft 297 1991 Climbing and access information for this peak is found on page 267. 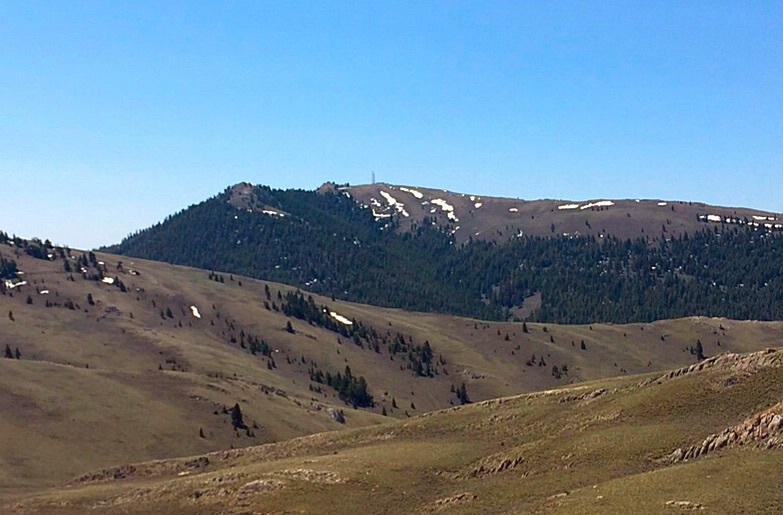 Peak 10751 (Midway Mountain) Lemhi Range 10,751 ft 451 This peak is not in the book. 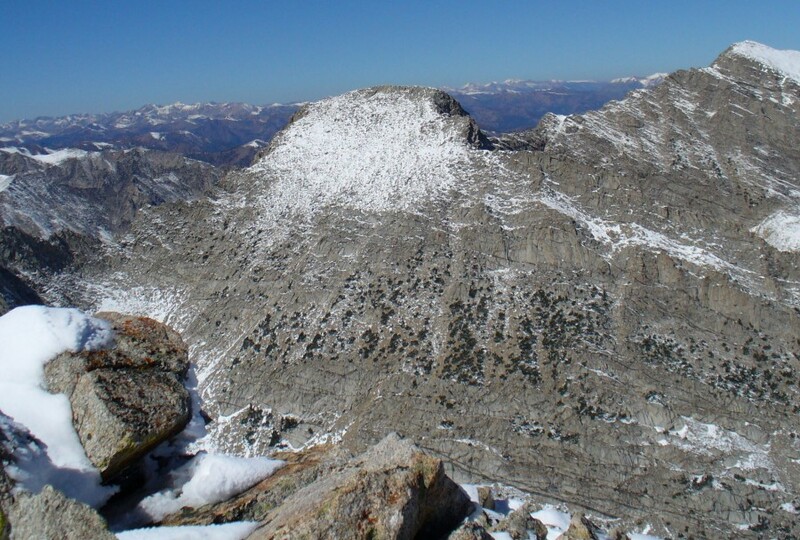 Peak 10749 (Pahsimeroi Pyramid) Lost River Range 10,749 ft This peak is found on page 267. 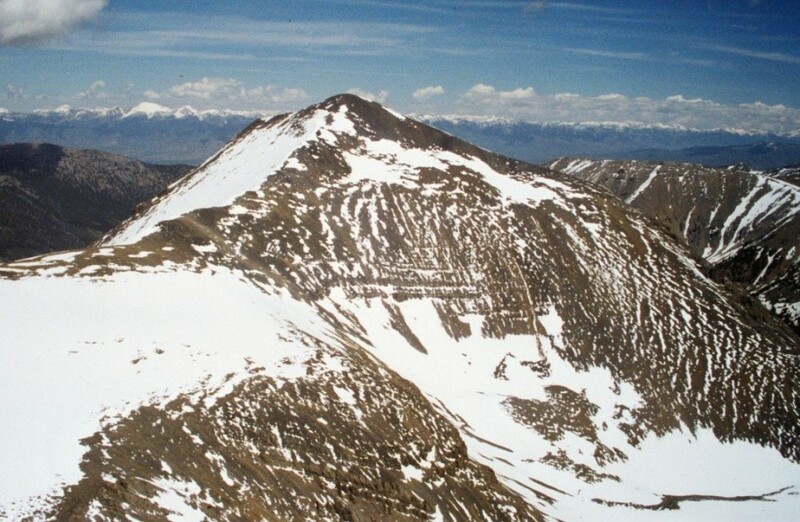 Gilmore Peak Lemhi Range 10,748 ft 608 2000, 2013 Climbing and access information for this peak is found on page 304. 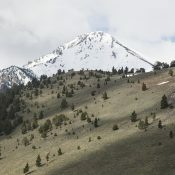 Peak 10744 (Wright Peak) Lemhi Range 10,744 ft 604 Climbing and access information for this peak is found on page 297. 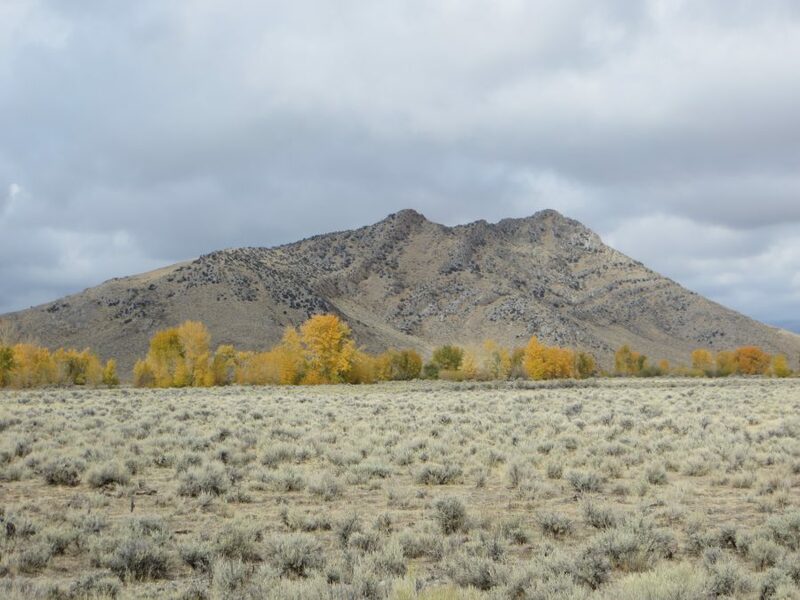 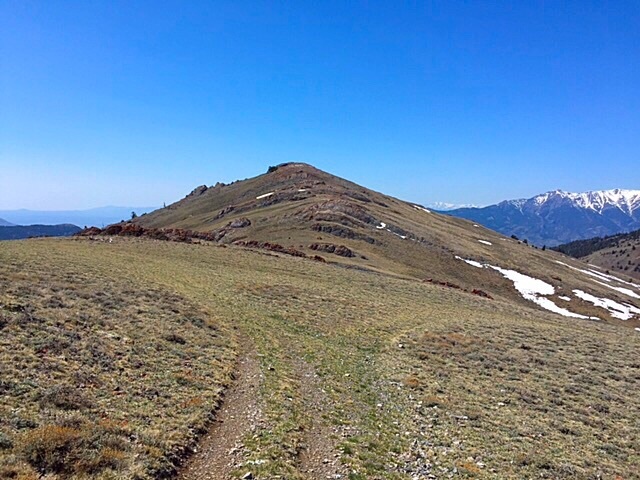 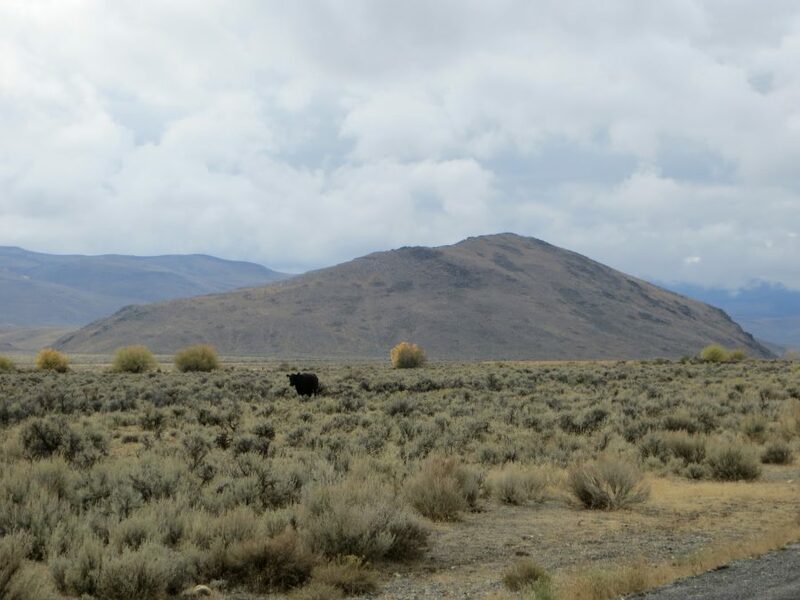 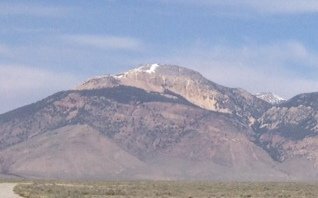 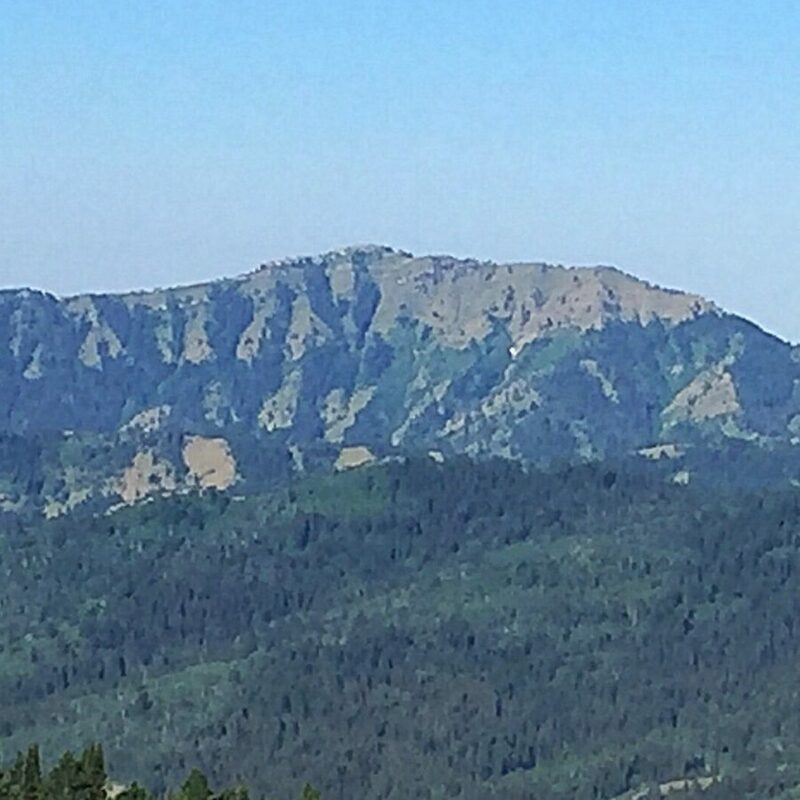 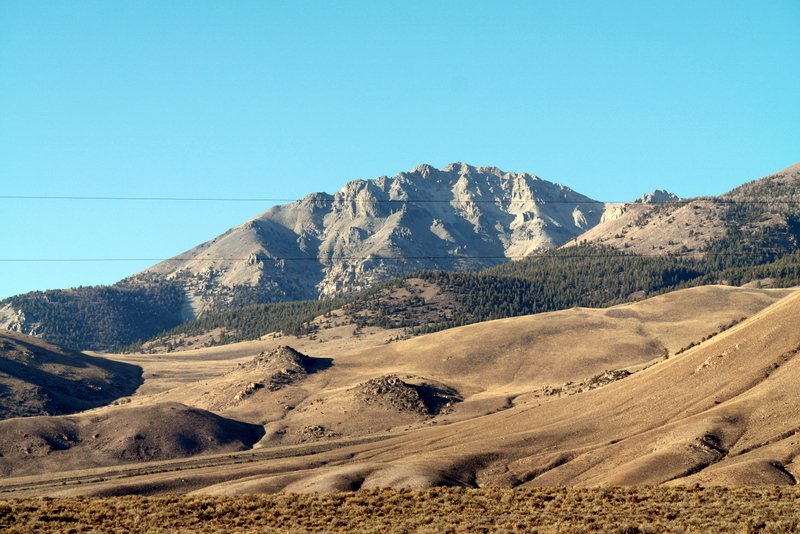 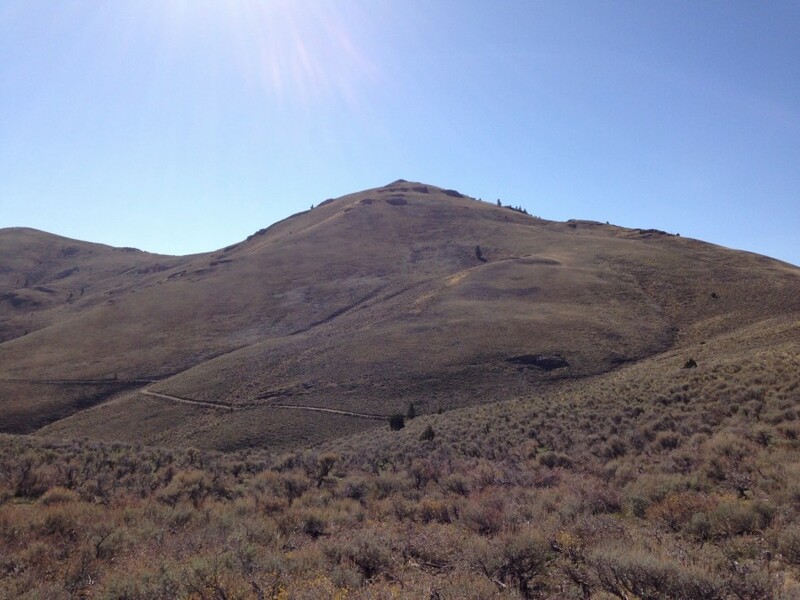 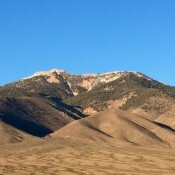 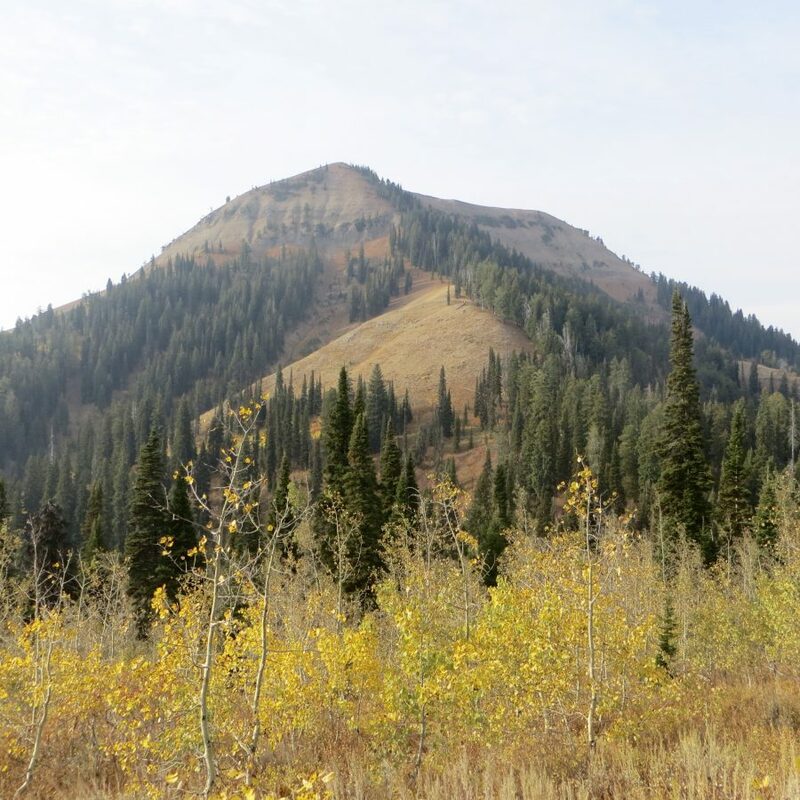 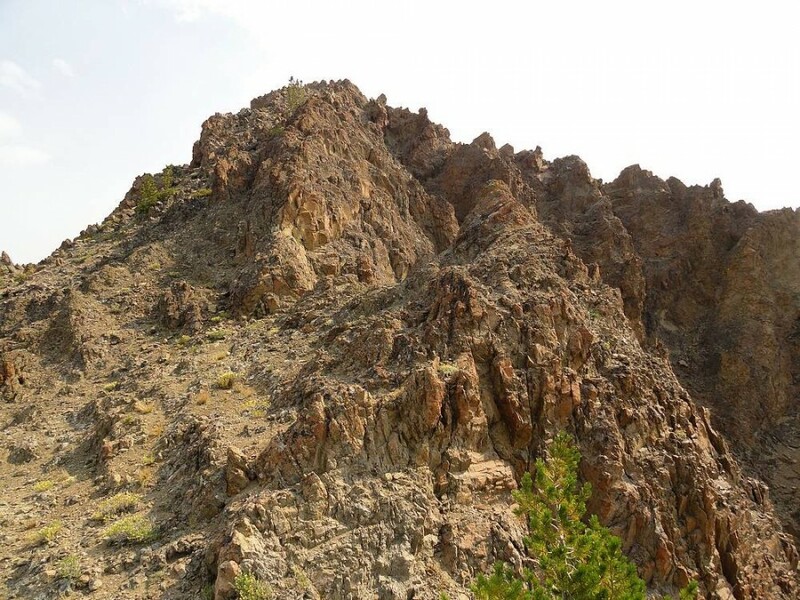 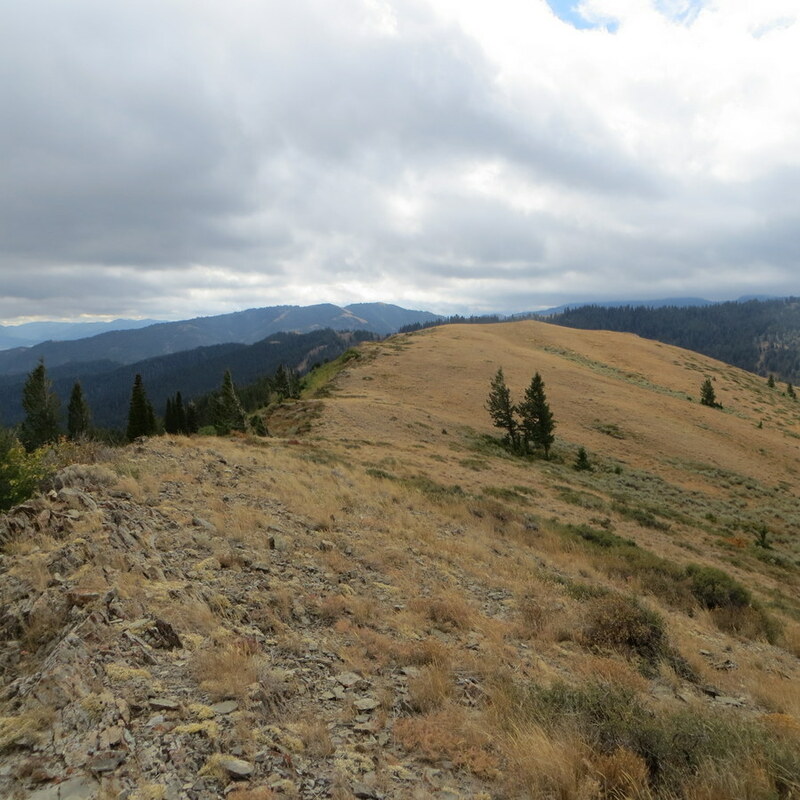 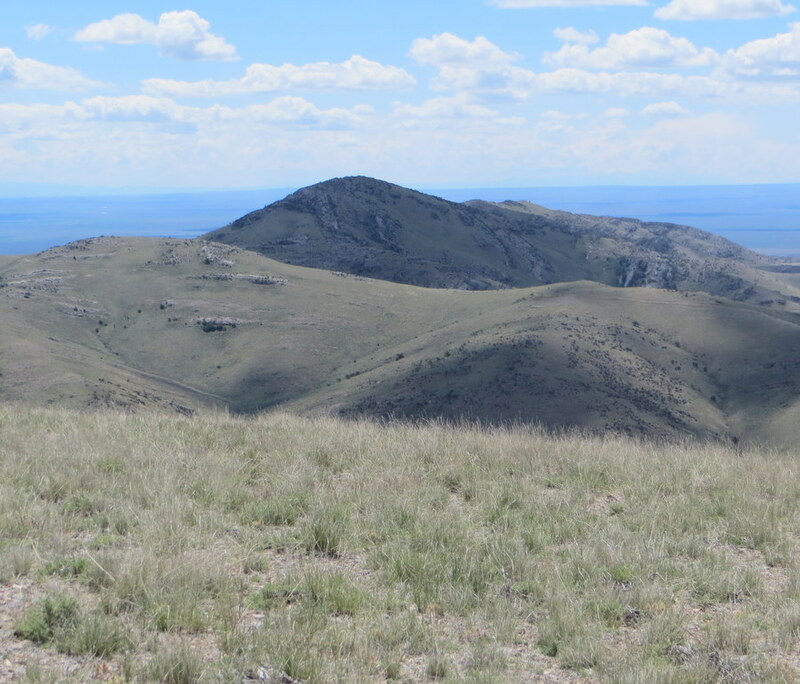 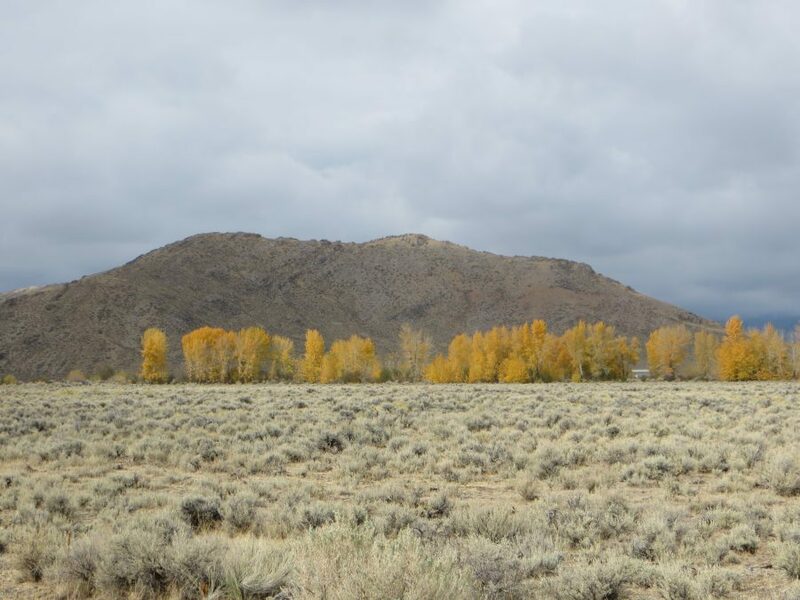 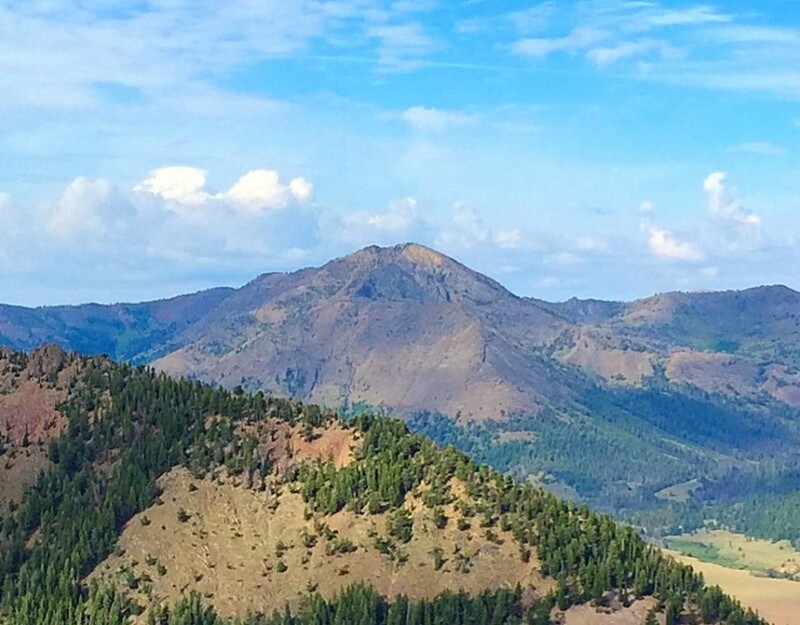 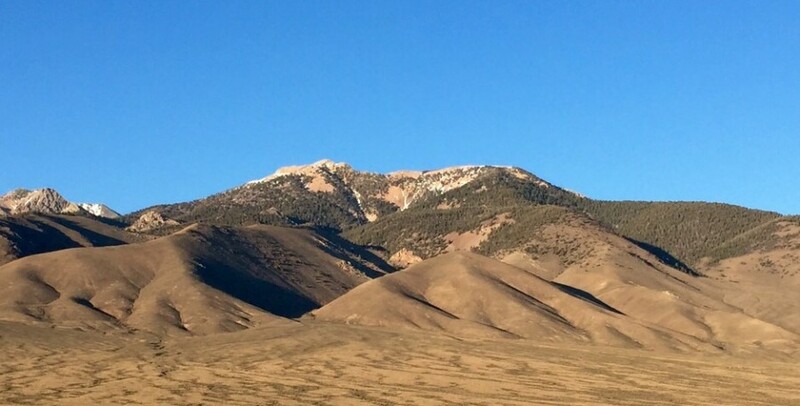 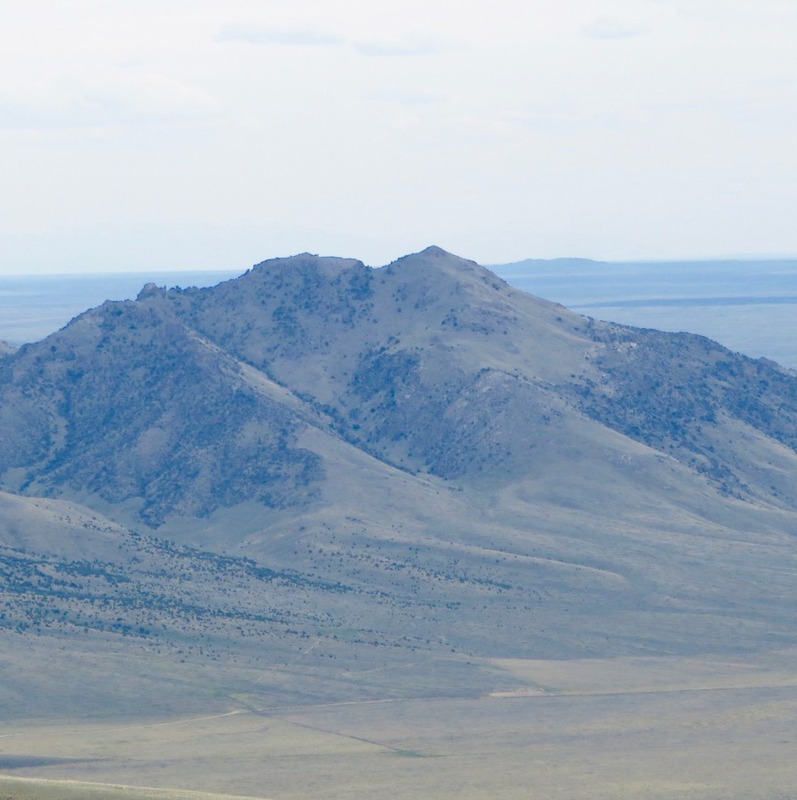 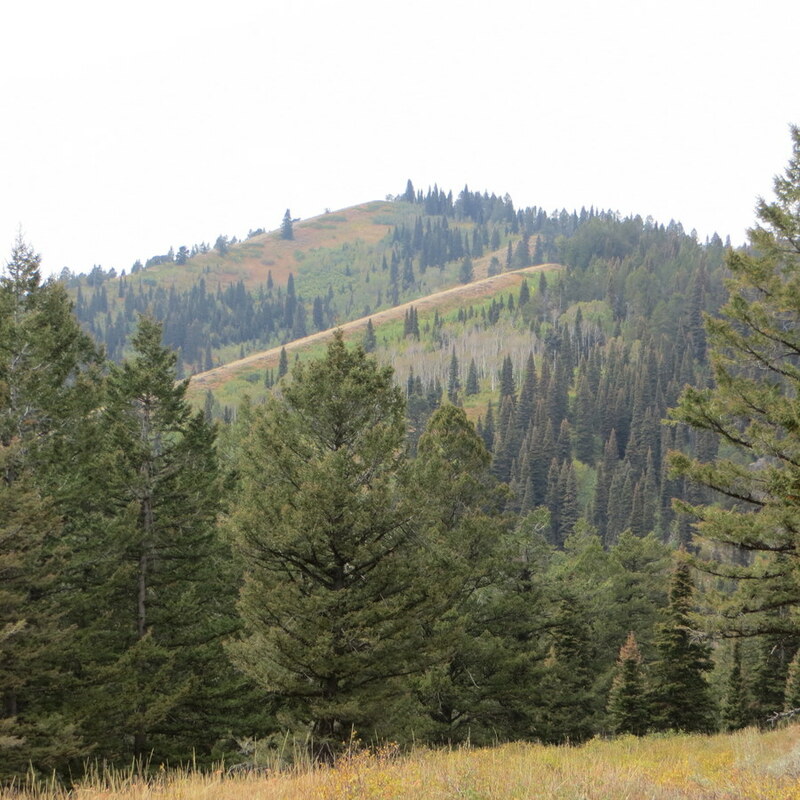 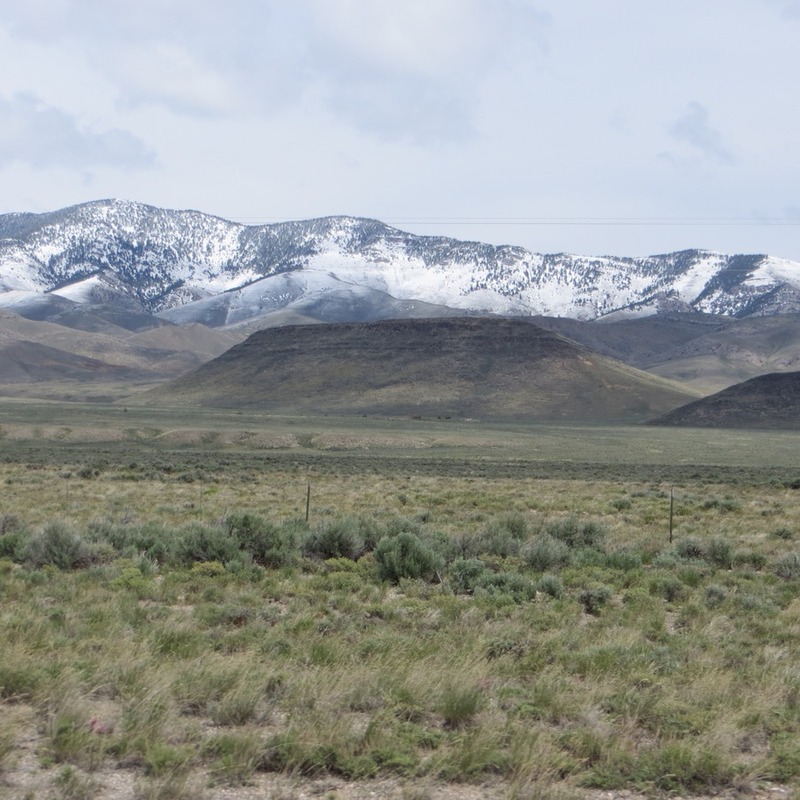 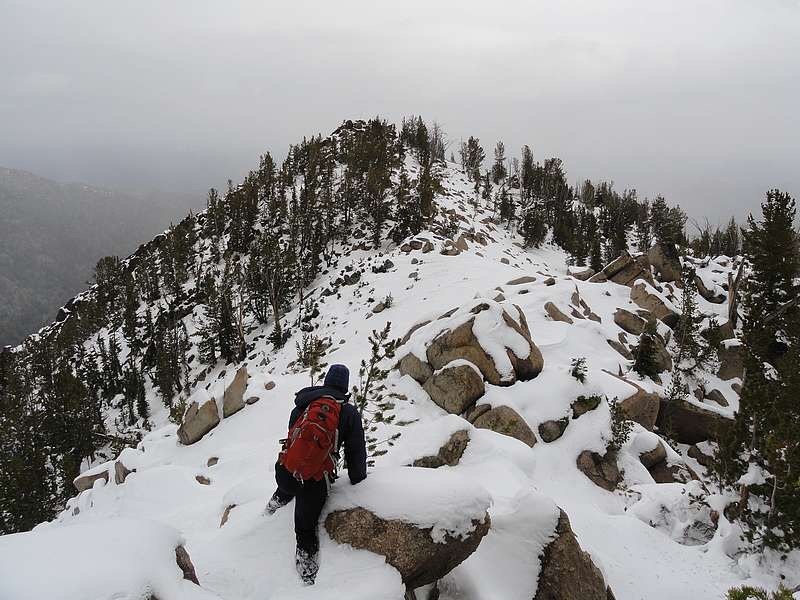 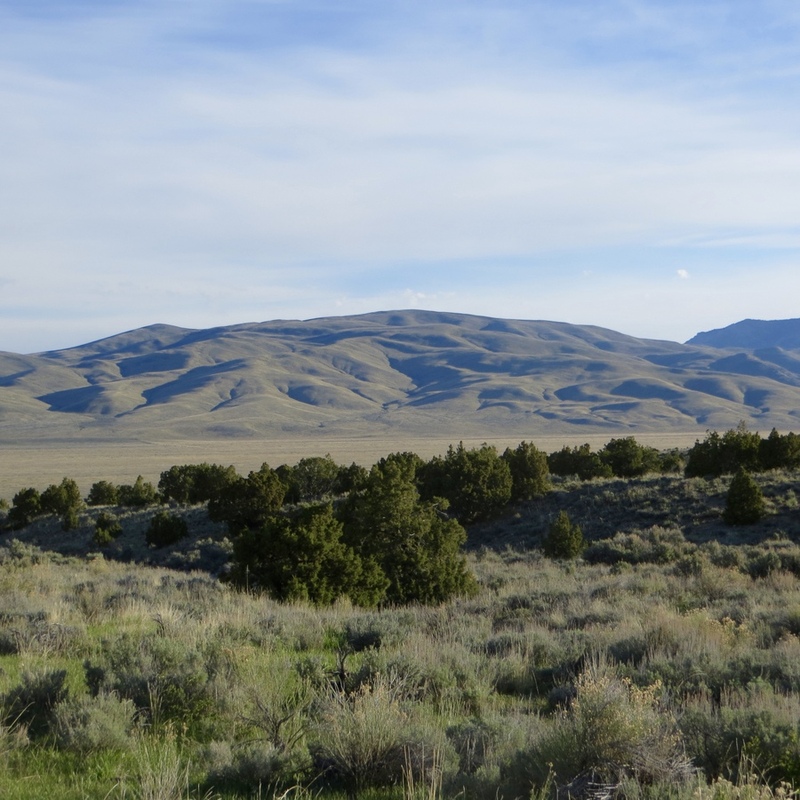 Bear Mountain Lemhi Range 10,744 ft 1604 2015 Climbing and access information for this peak is found on page 304. 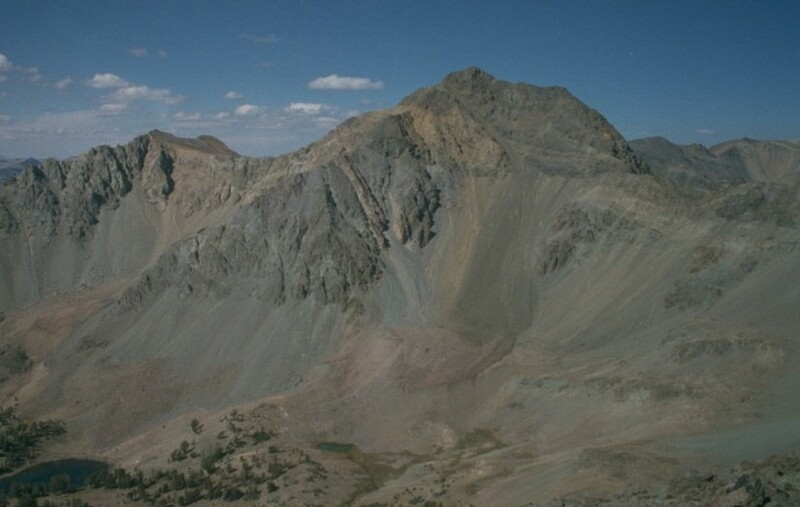 Err Peak Pioneer Mountains 10,744 ft 1164 2017 Climbing information for peak is found on page 256. 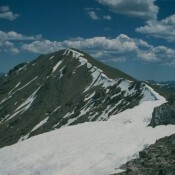 Peak 10740 (Williams Peak) Lost River Range 10,740 ft 760 2003 This Class 2 summit is not in the book. 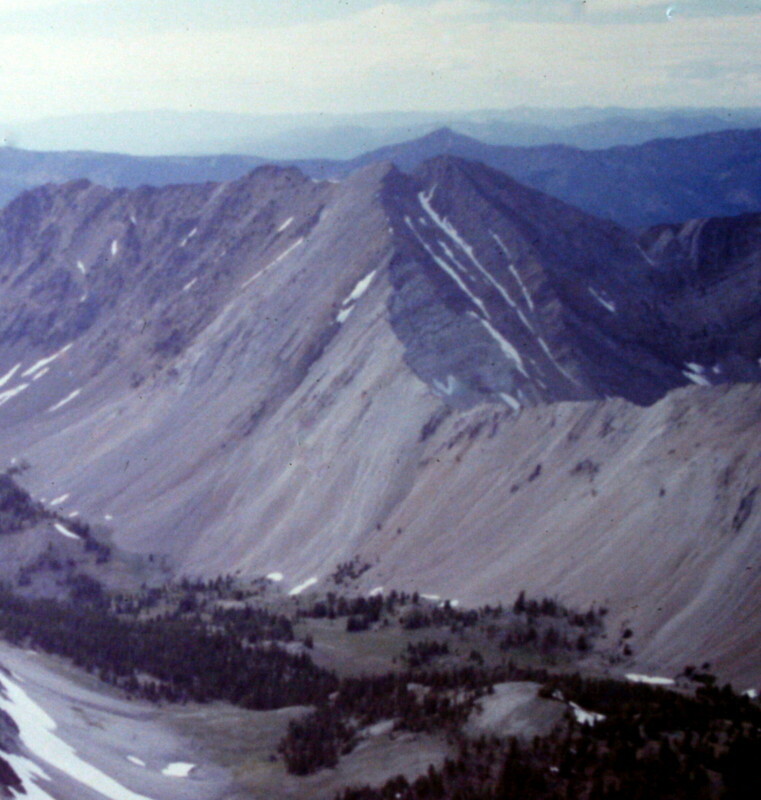 McGowan Peak Lost River Range 10,740 ft 680 1991 Climbing and access information for this peak is found on pages 267 and 268. 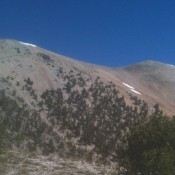 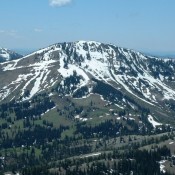 The Clapper Lemhi Range 10,740 ft 480 Climbing information for this peak is found on page 307. 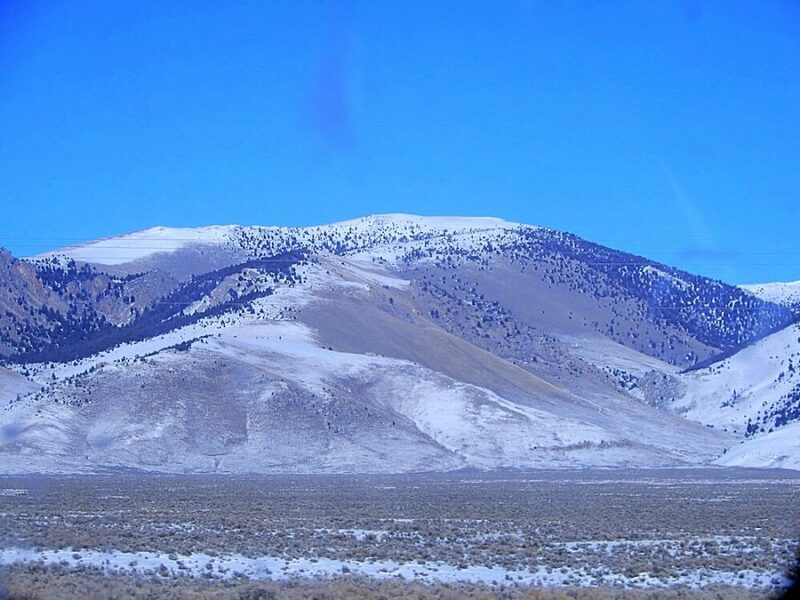 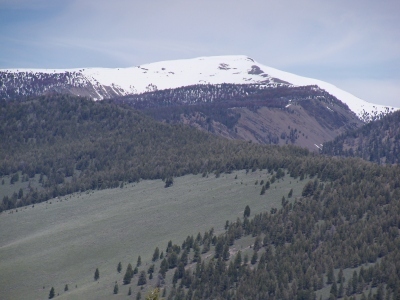 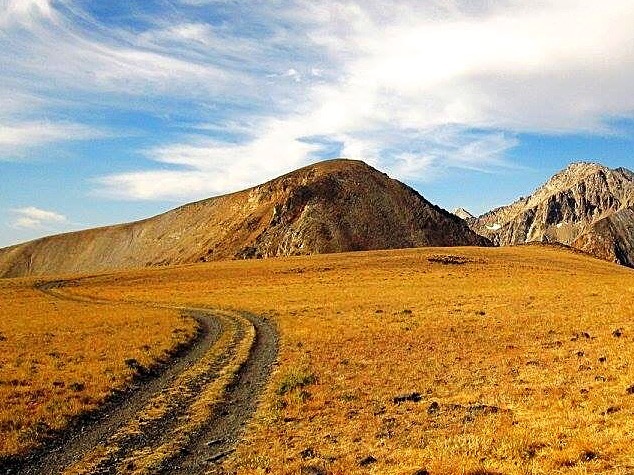 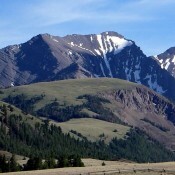 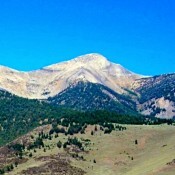 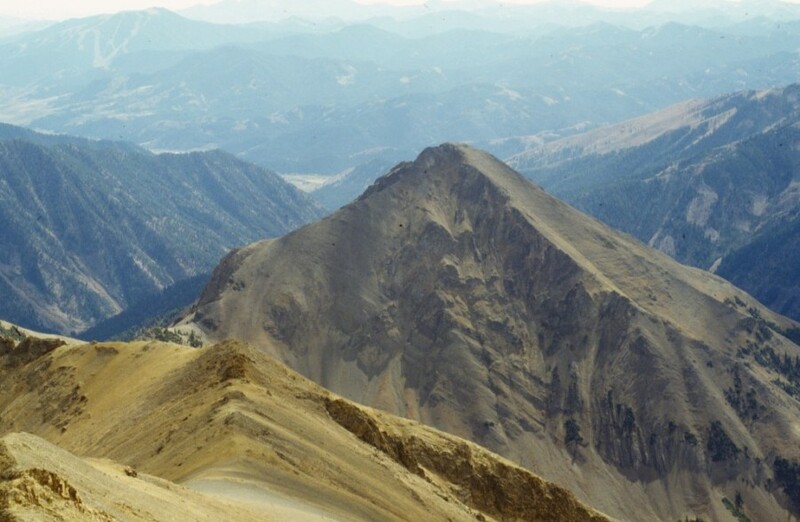 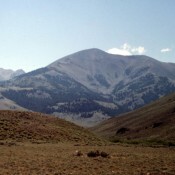 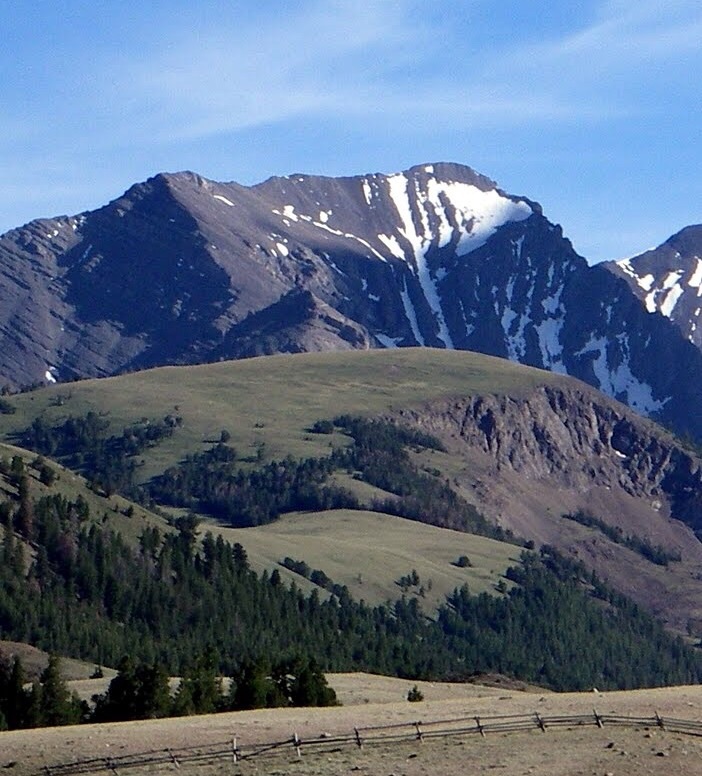 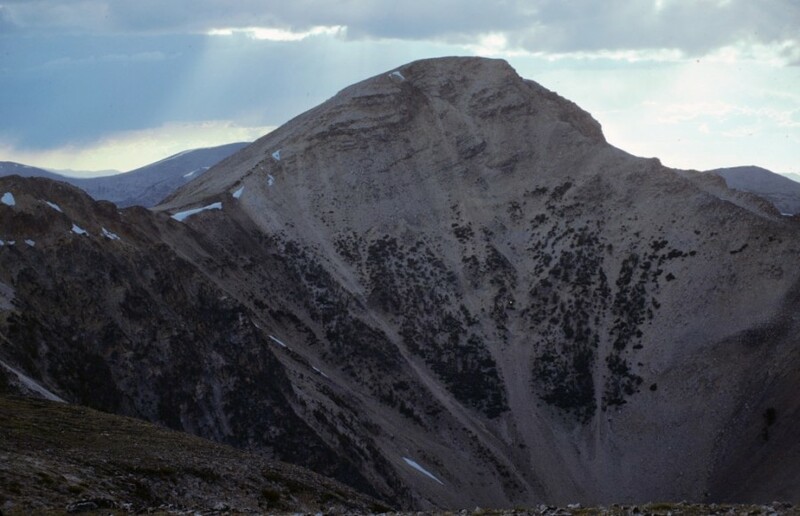 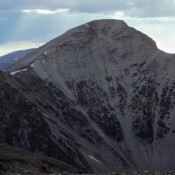 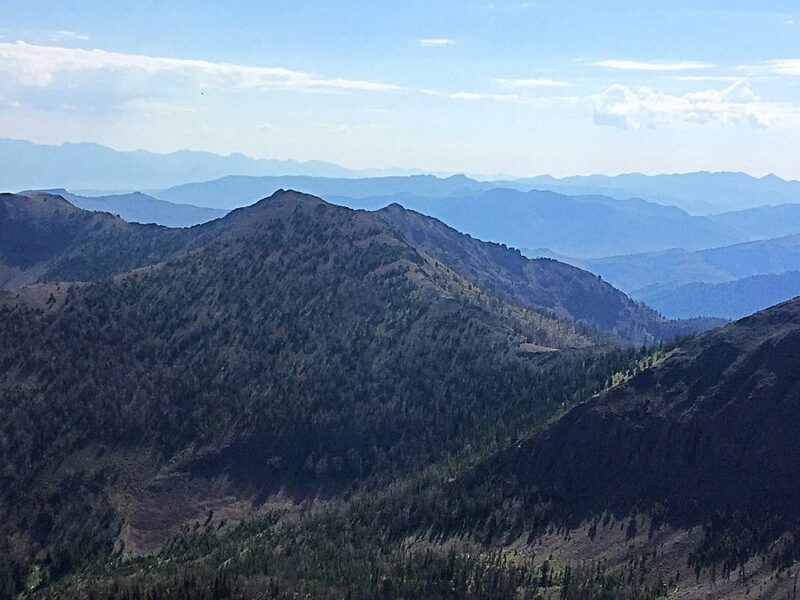 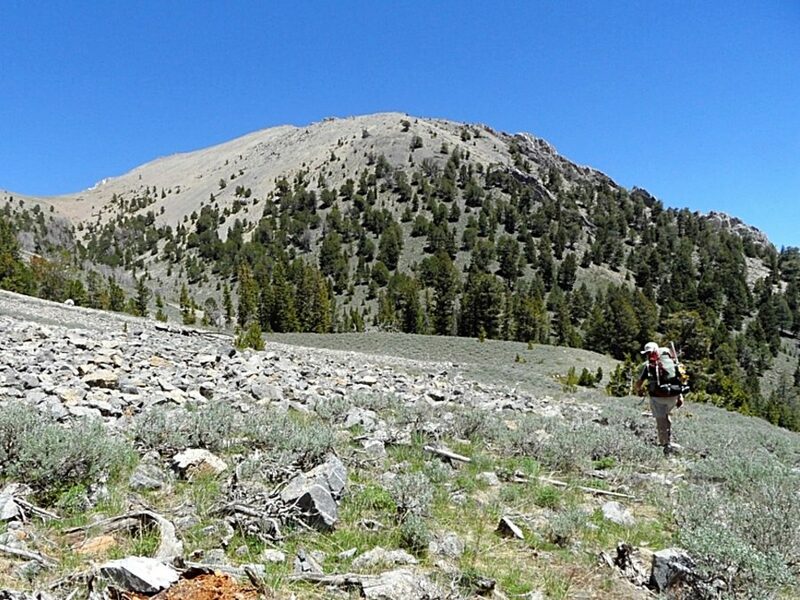 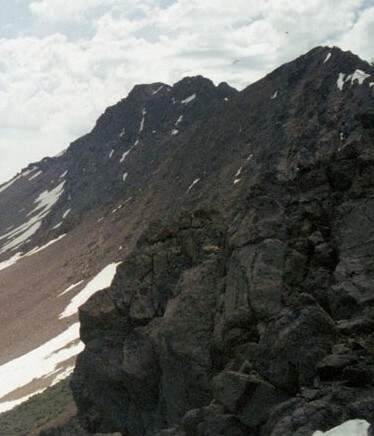 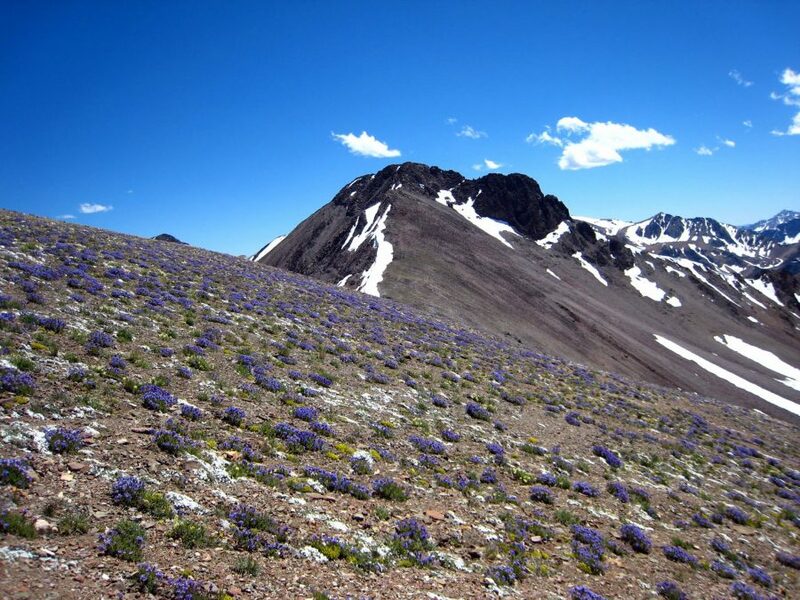 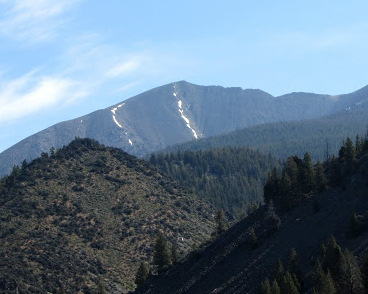 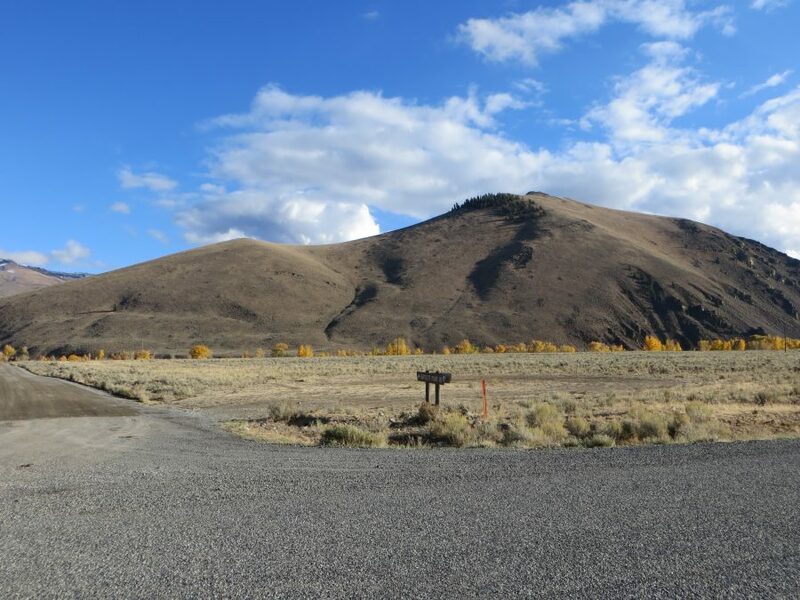 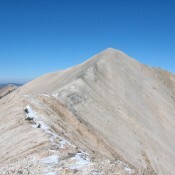 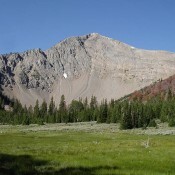 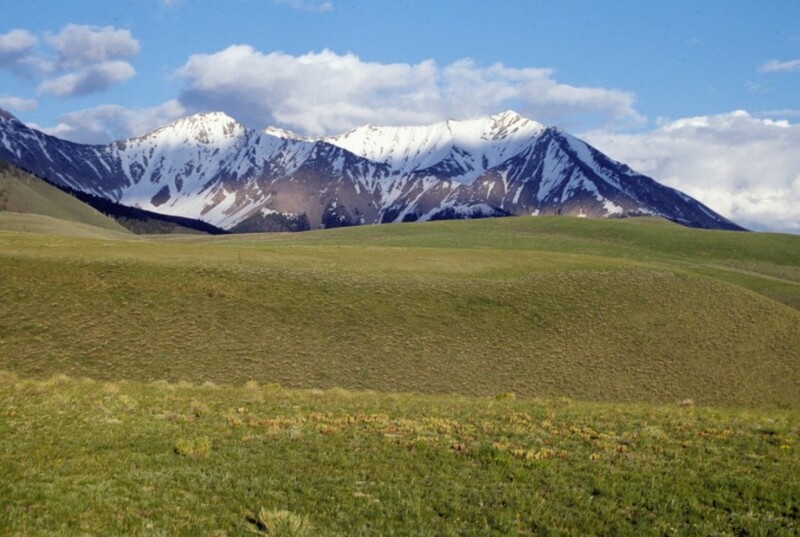 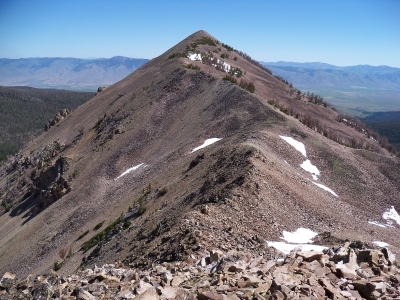 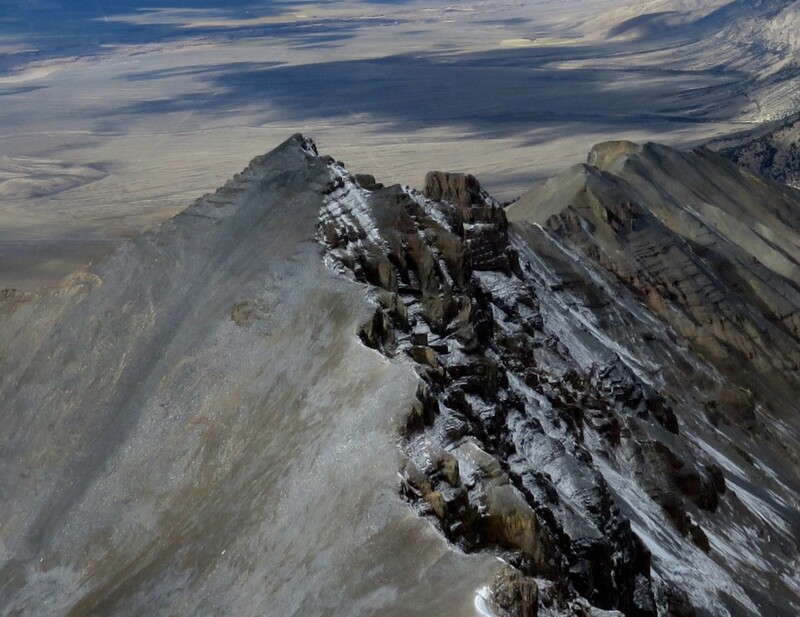 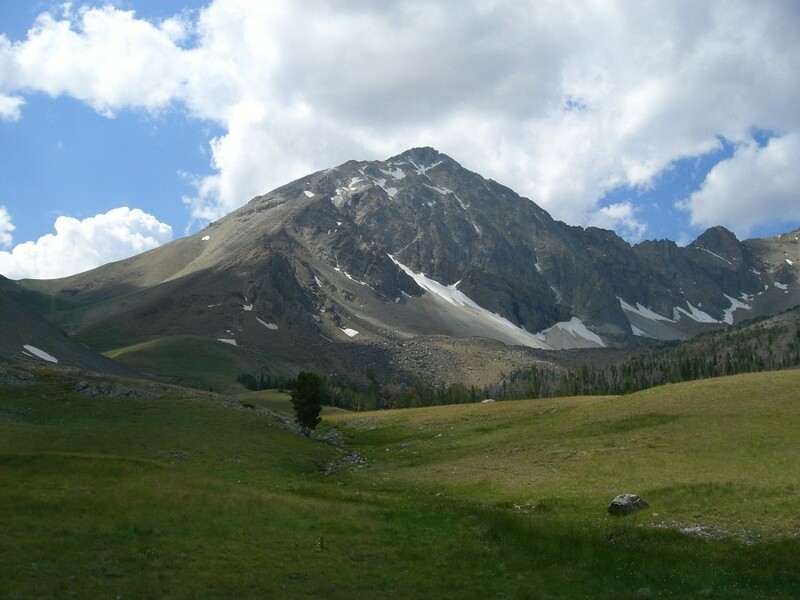 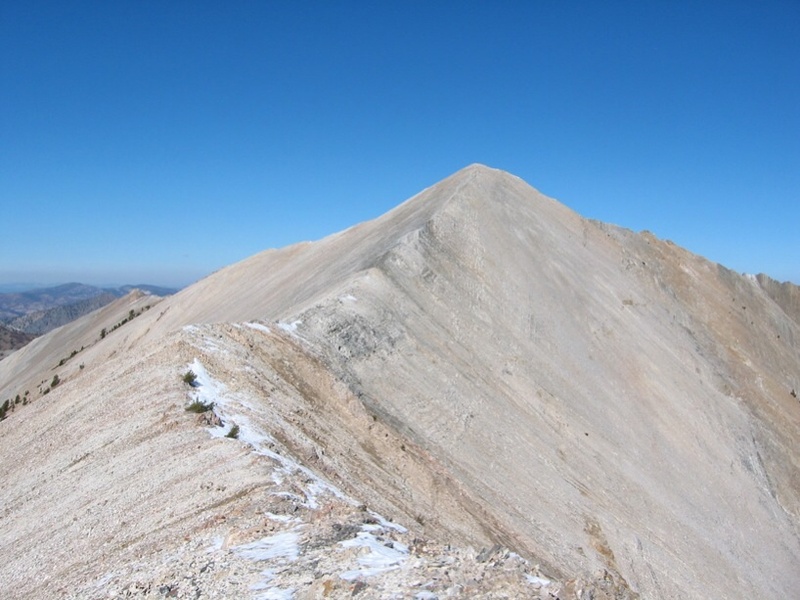 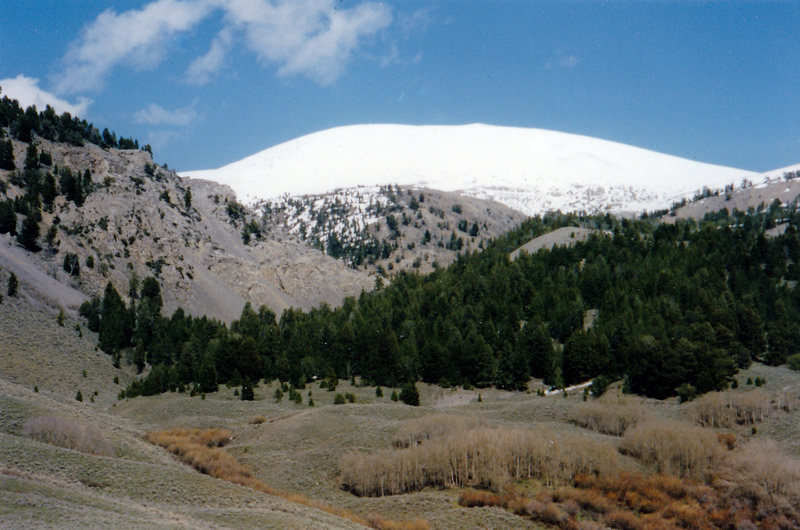 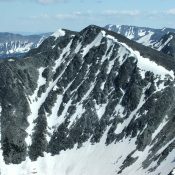 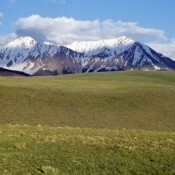 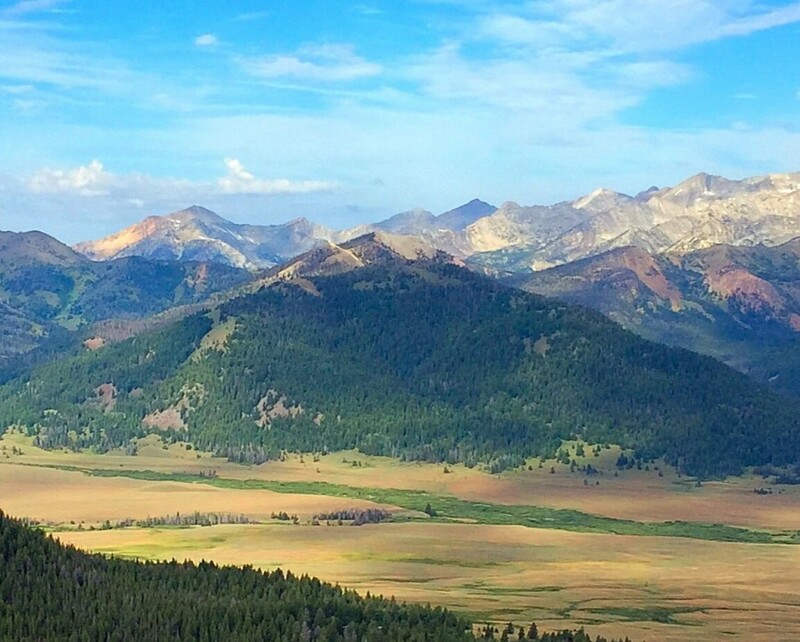 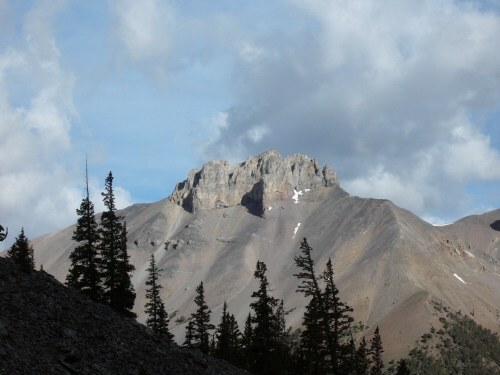 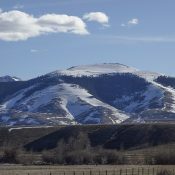 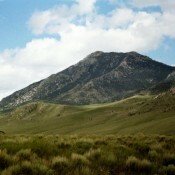 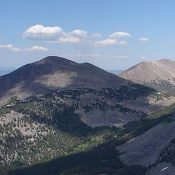 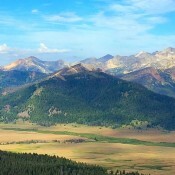 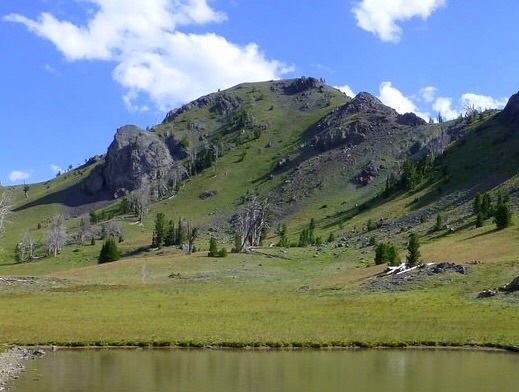 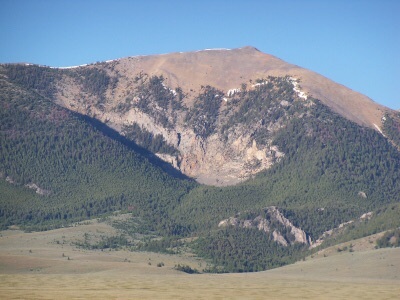 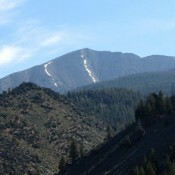 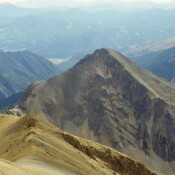 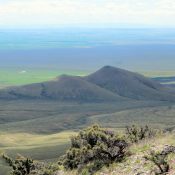 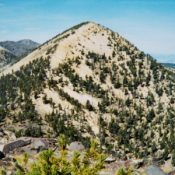 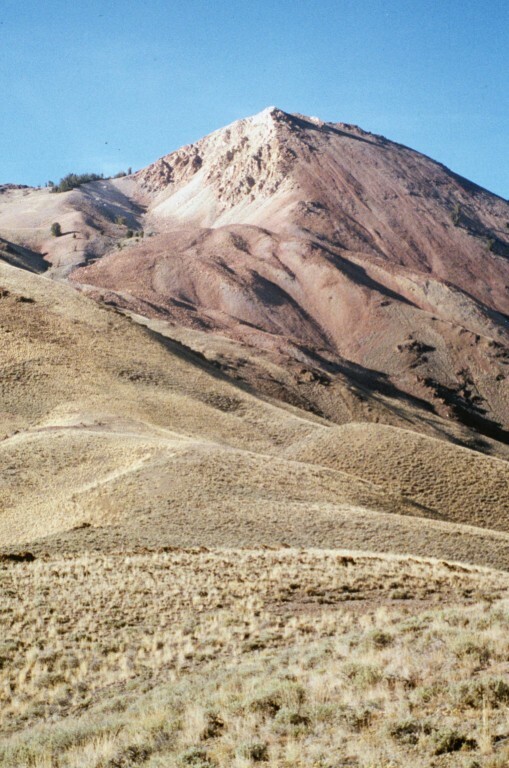 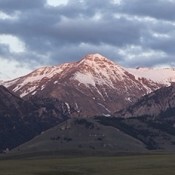 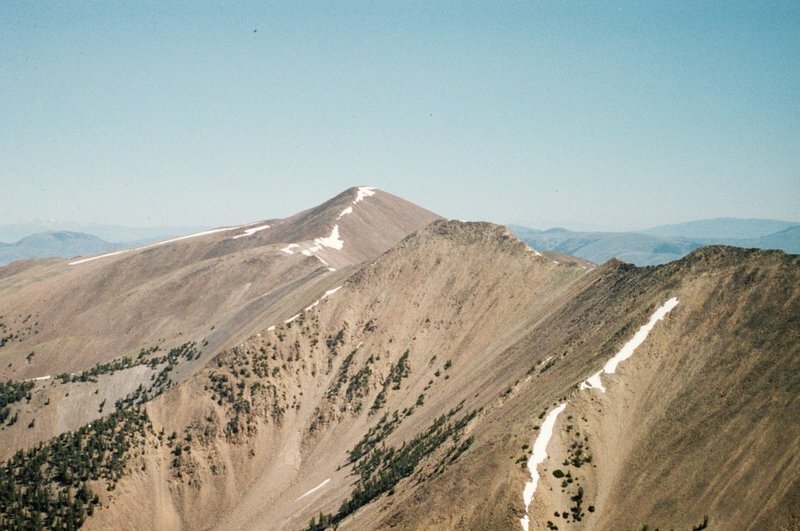 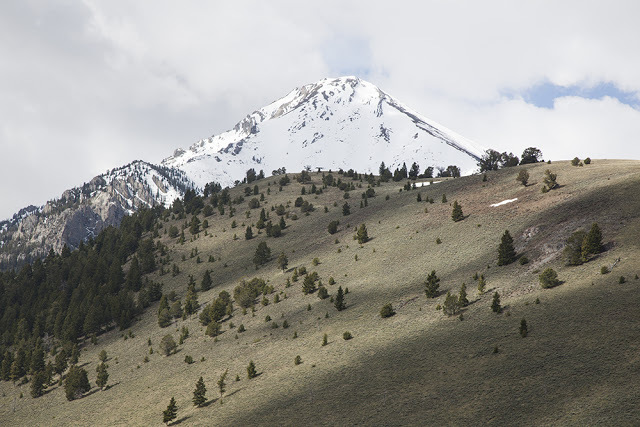 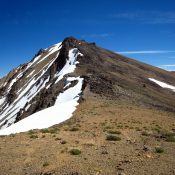 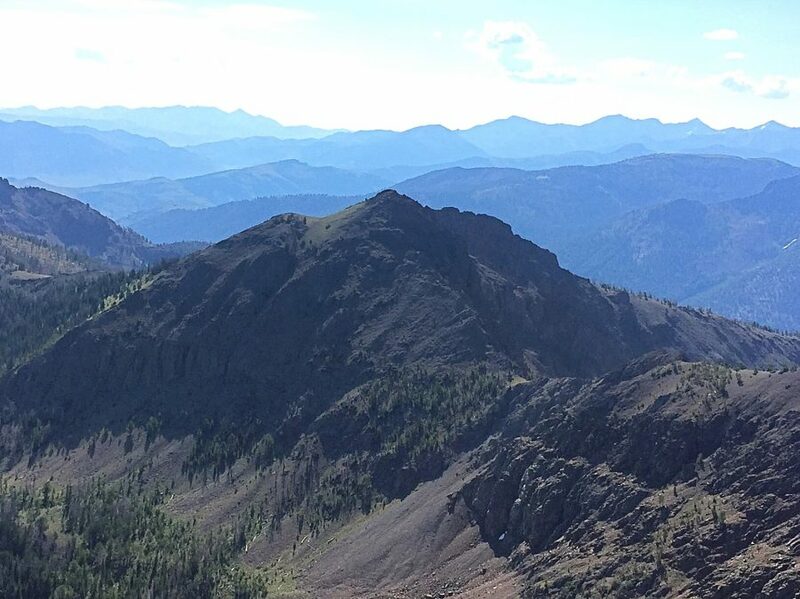 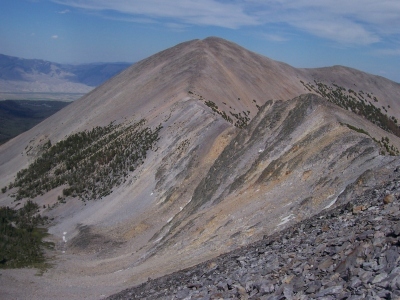 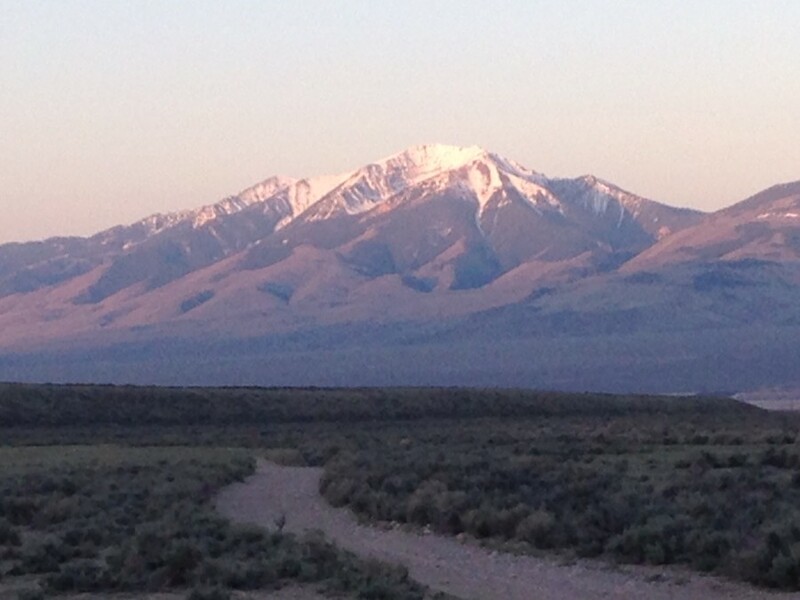 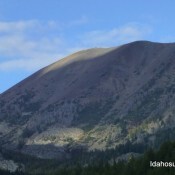 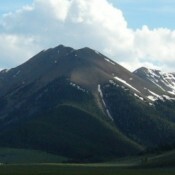 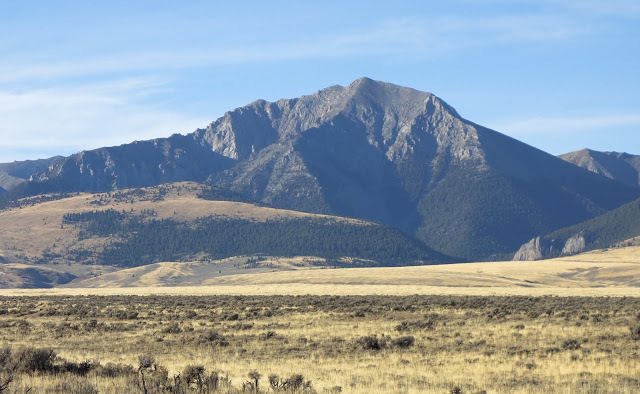 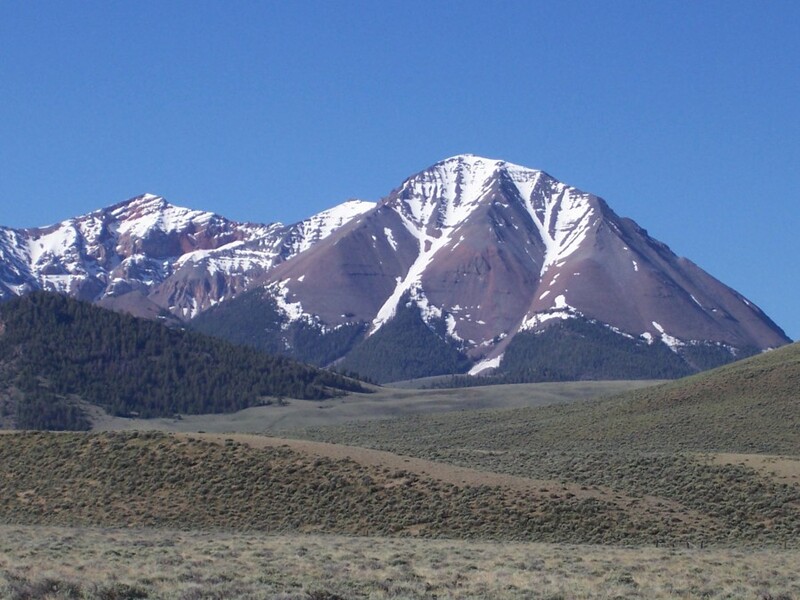 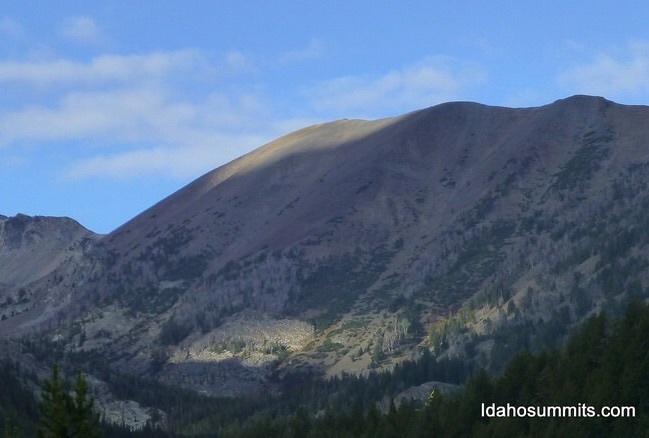 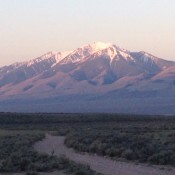 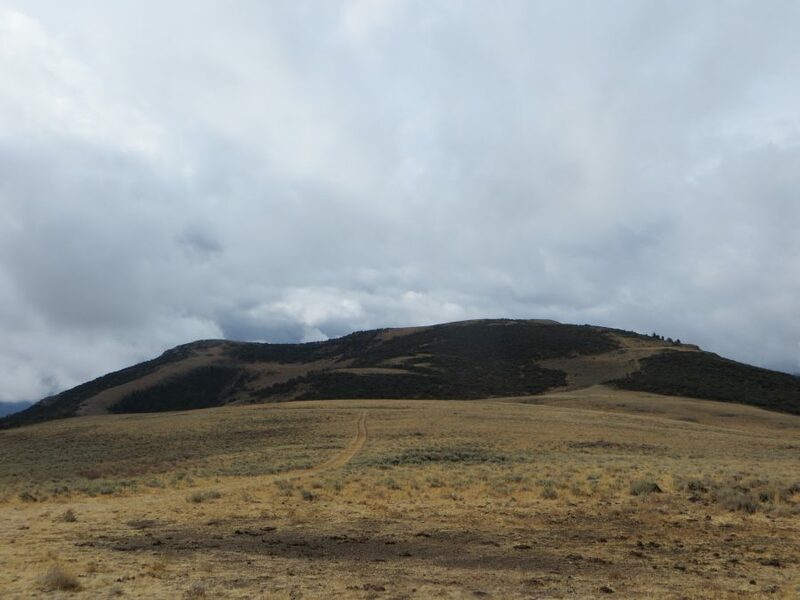 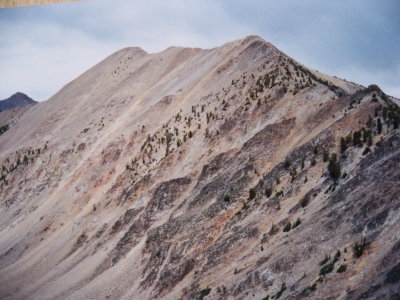 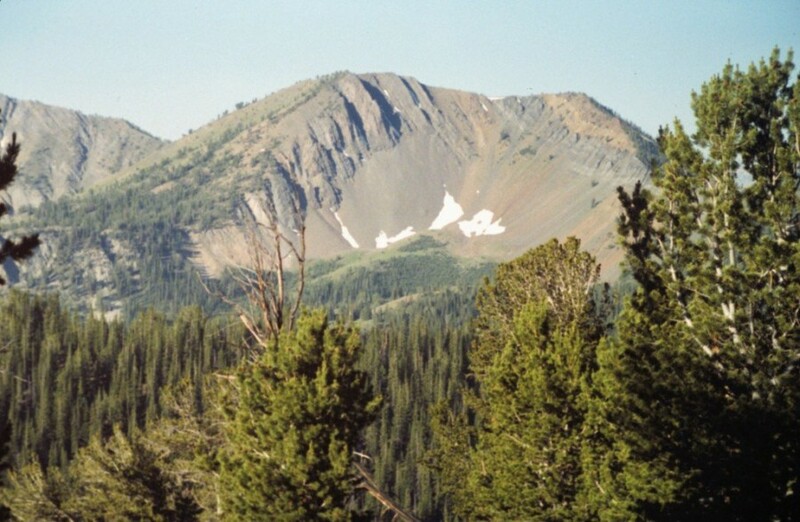 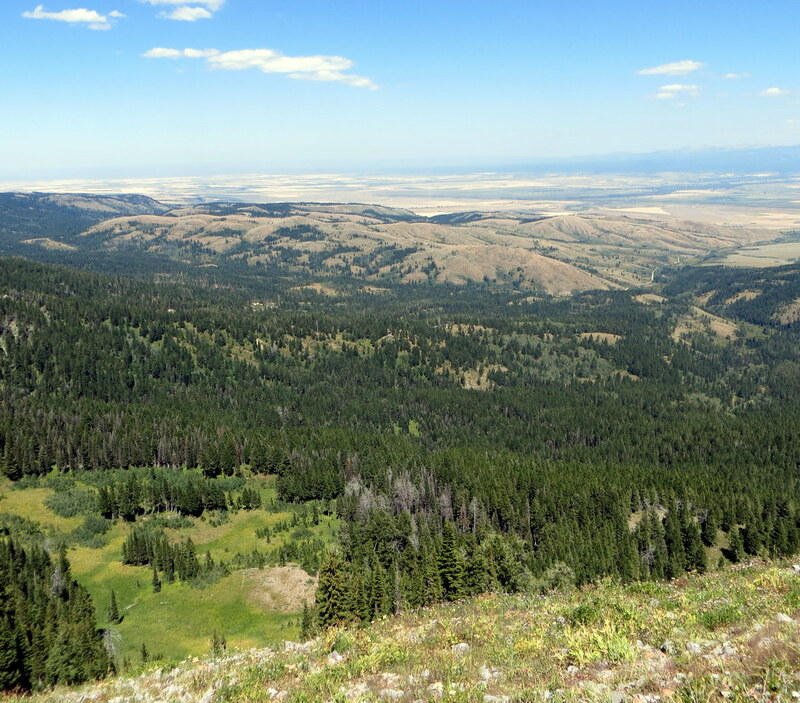 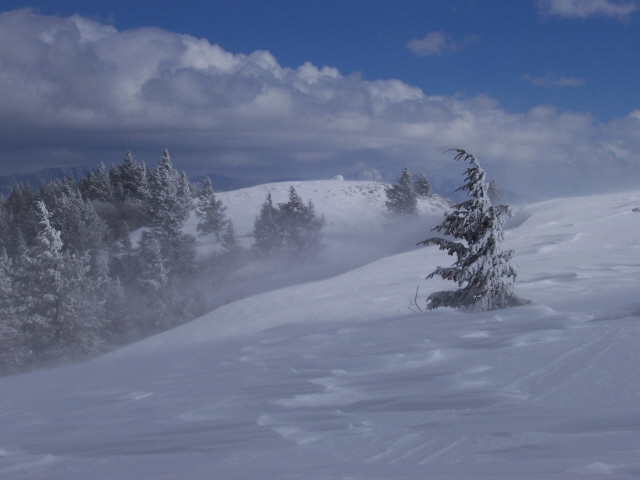 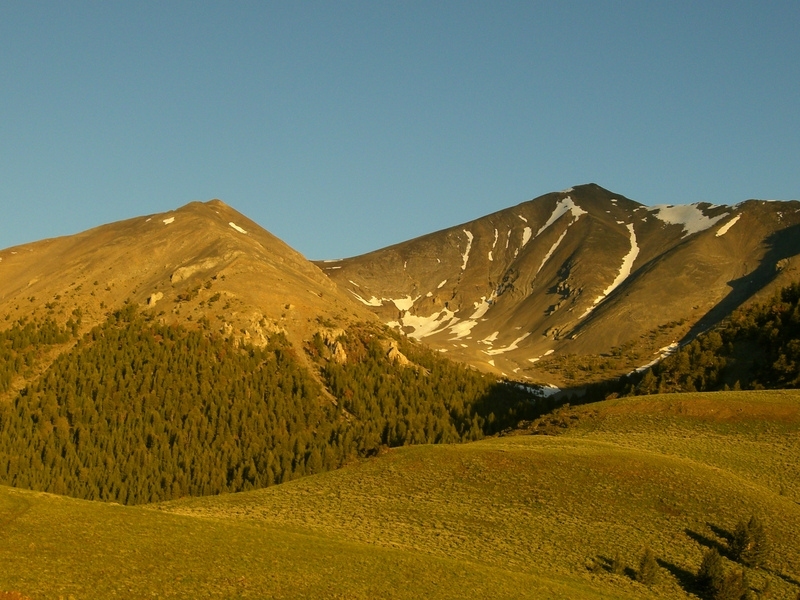 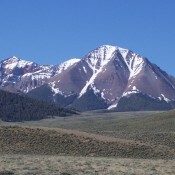 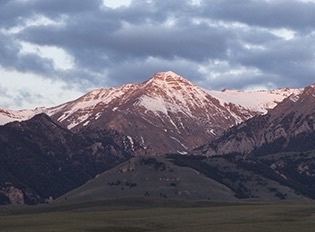 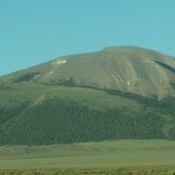 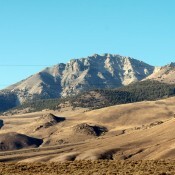 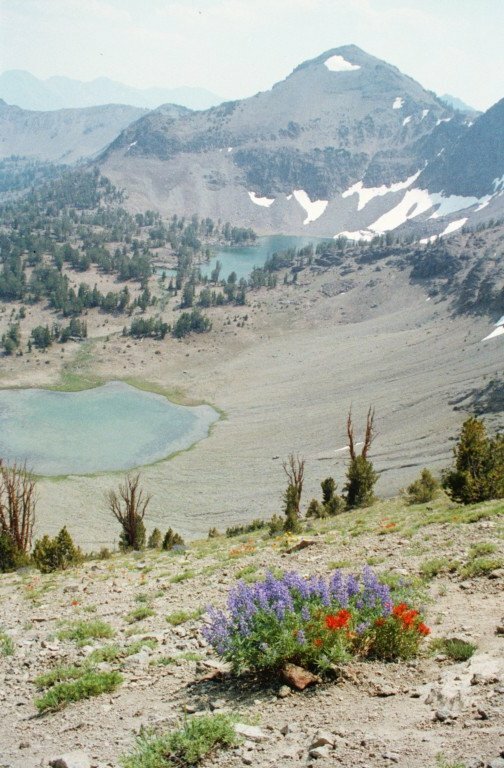 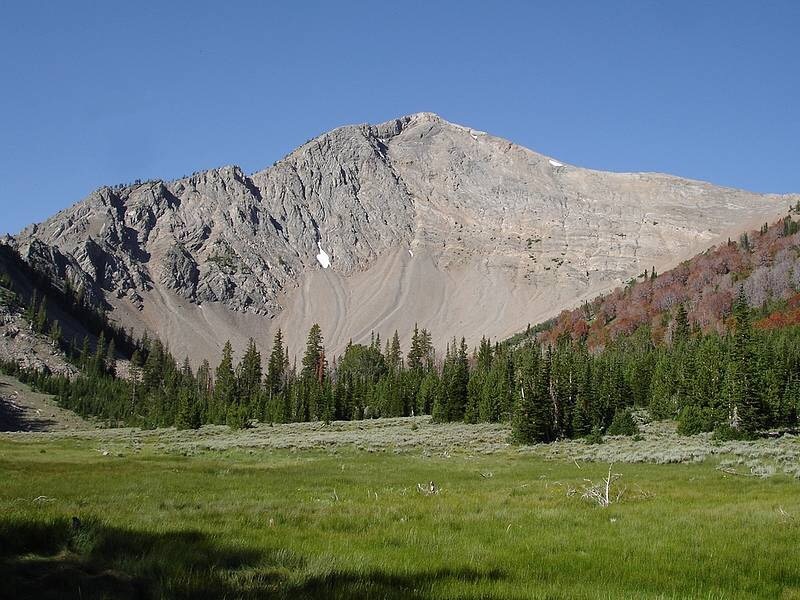 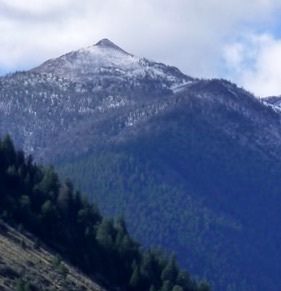 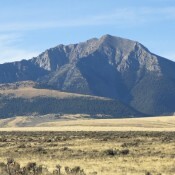 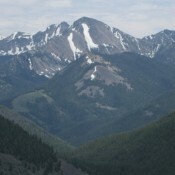 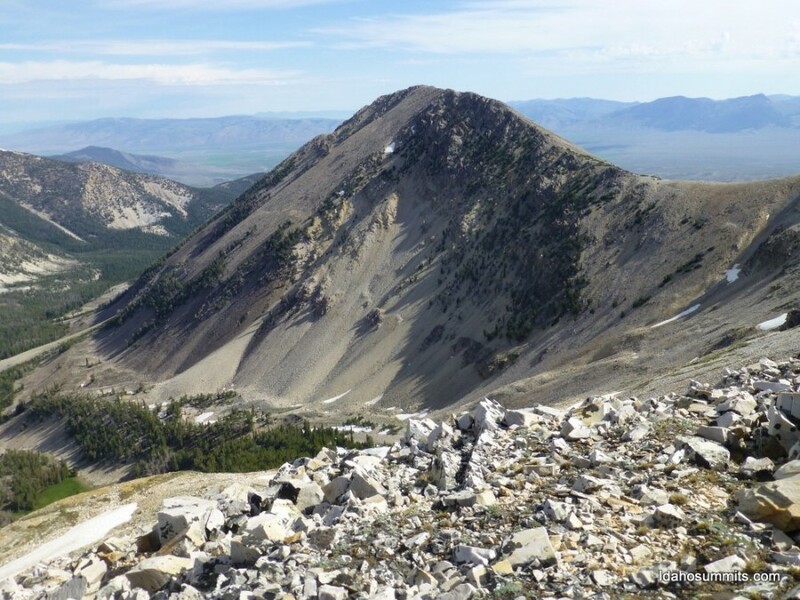 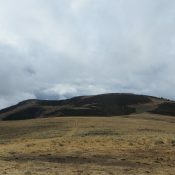 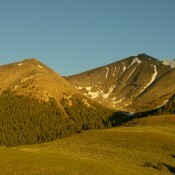 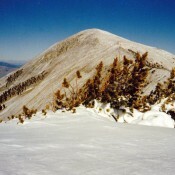 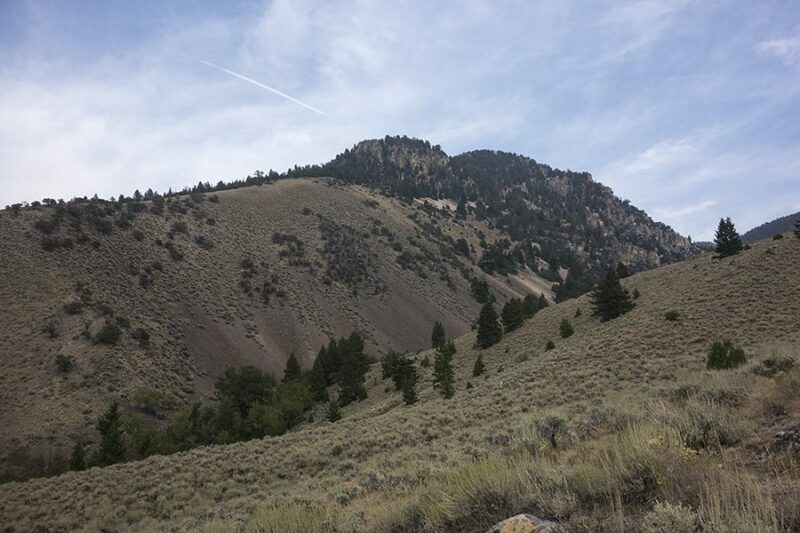 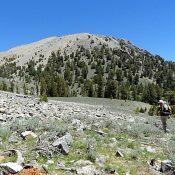 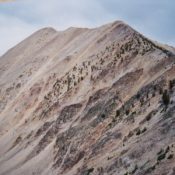 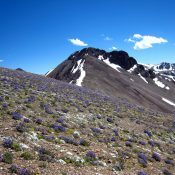 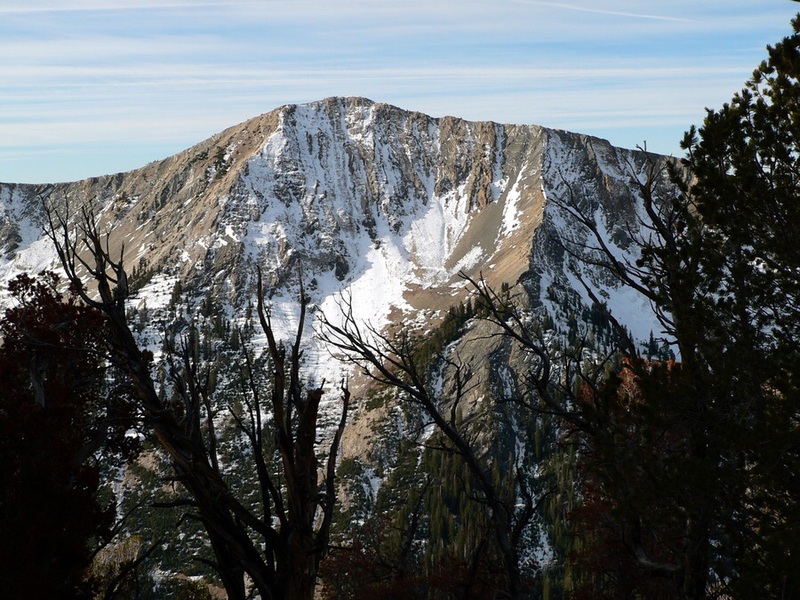 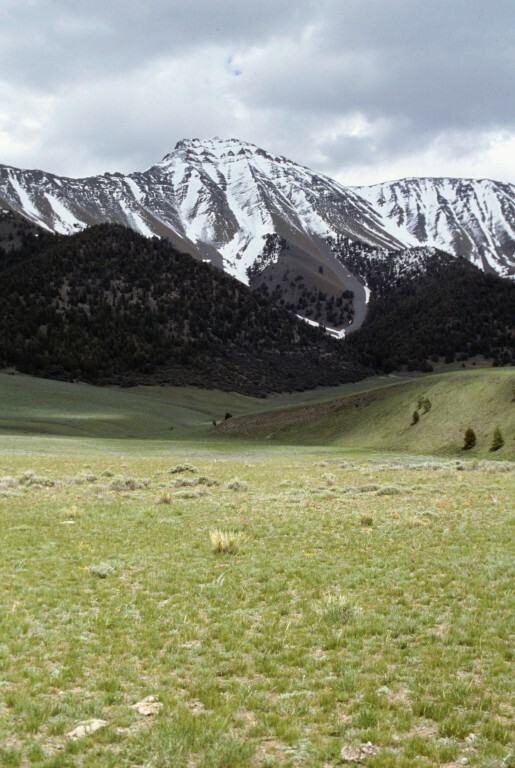 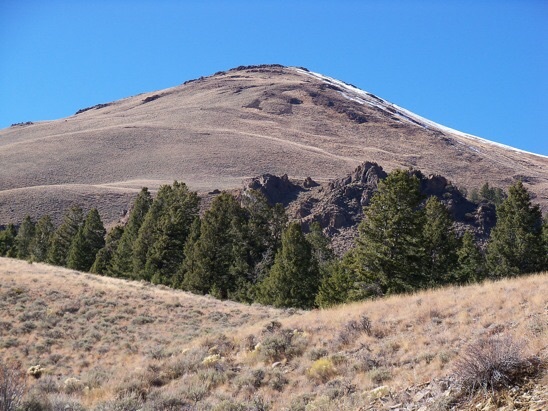 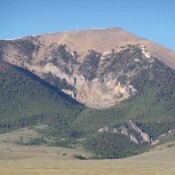 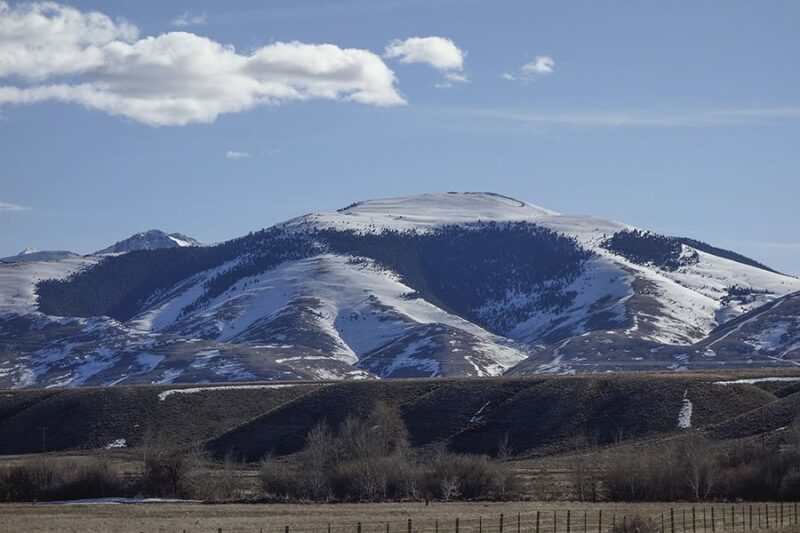 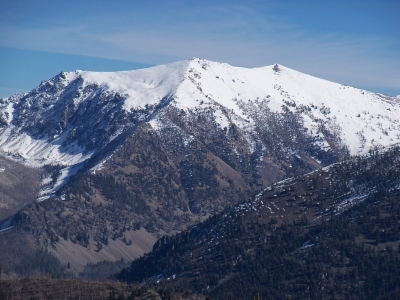 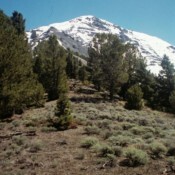 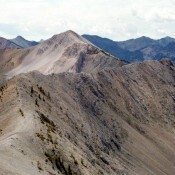 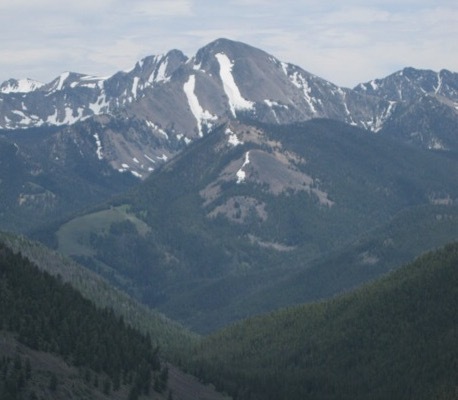 Mount Hoopes Lemhi Range 10,740 ft 520 Climbing and access information for this Lemhi peak is found on page 311. 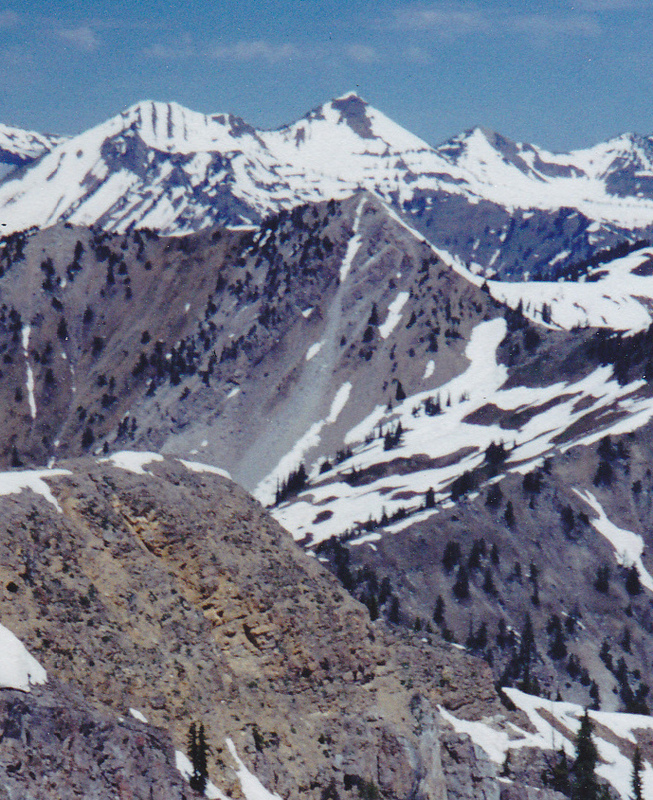 Tyler Peak Lemhi Range 10,740 ft 1080 This peak is found on page 311. 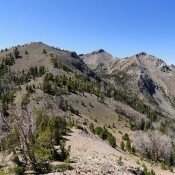 Little Brother Lemhi Range 10,737 ft 317 This peak is not in the book. 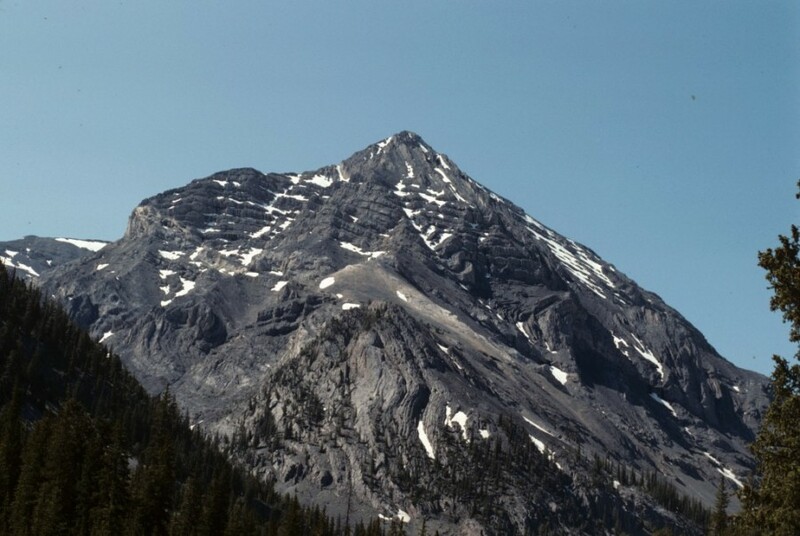 Peak 10737 Lemhi Range 10,737 ft 317 This peak is not in the book. 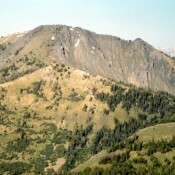 Iron Creek Point Lemhi Range 10,736 ft 476 1992 Climbing and access information for this peak is found on page 304. 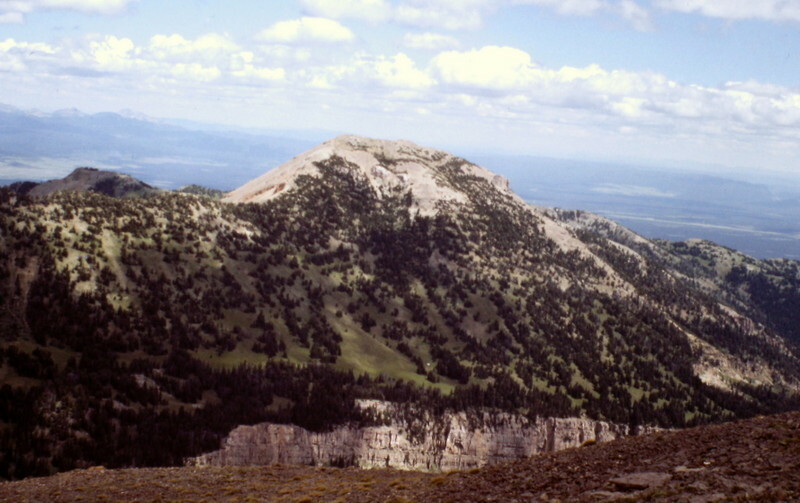 Buffalo Skull Peak Lemhi Range 10,735 ft 1275 Climbing and access information for this peak is found on pages 299 and 300. 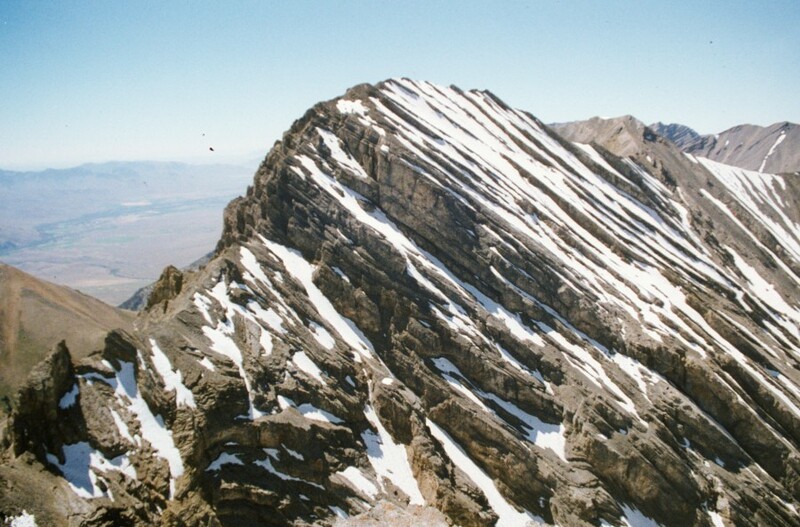 Peak 10723 Lemhi Range 10,723 ft 343 2013 Climbing and access information for this peak is found on page 304. 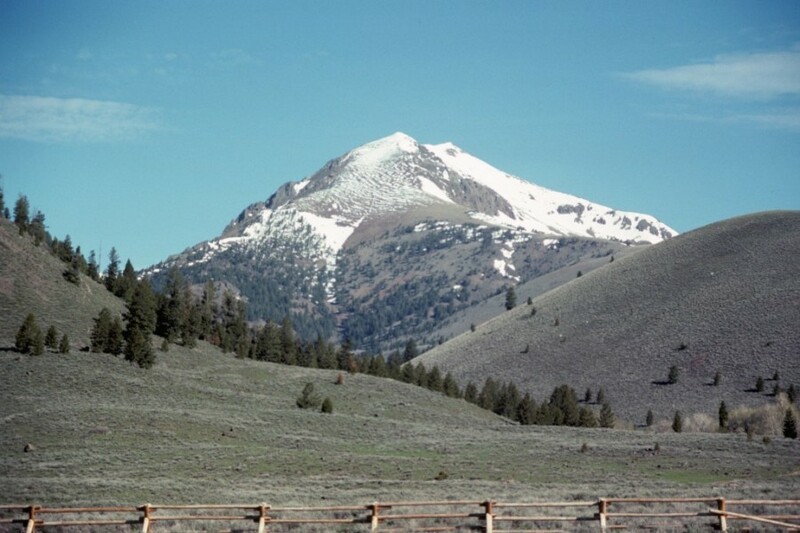 Ray Lode Peak Lemhi Range 10,723 ft 597 Climbing and access information for this peak is found on page 301. 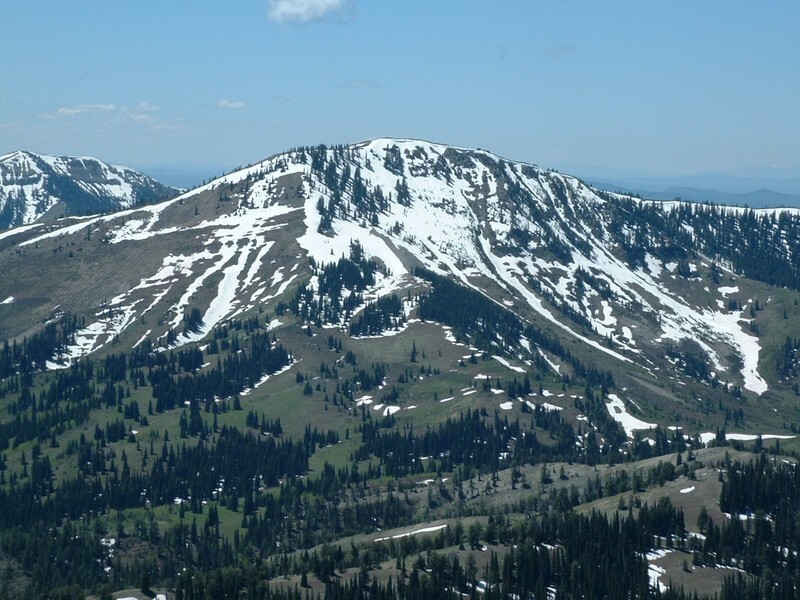 Tendoy Peak Lemhi Range 10,720 ft 780 Climbing and access information for this Lemhi Range peak is found on page 296. 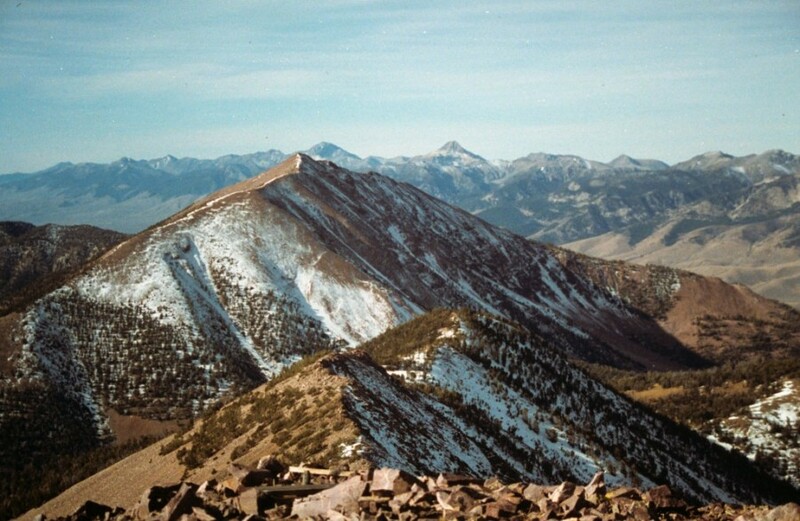 Little Sister Peak Lemhi Range 10,717 ft 577 Climbing and access information for this peak is found on page 308. 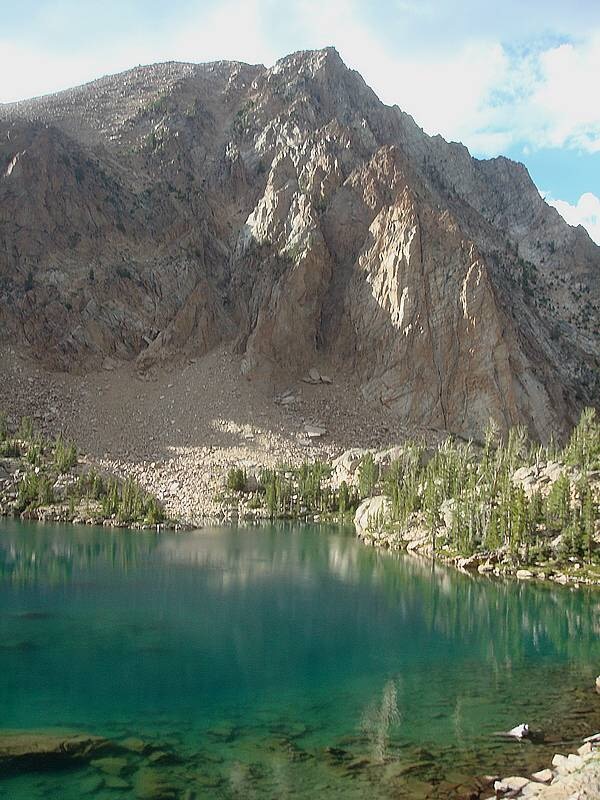 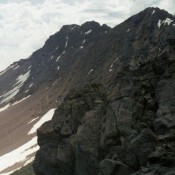 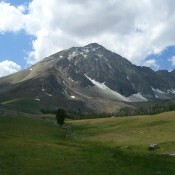 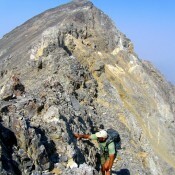 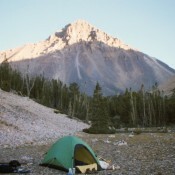 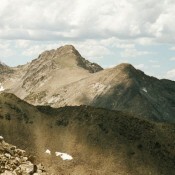 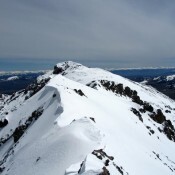 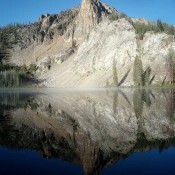 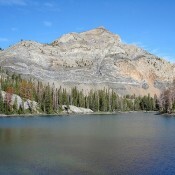 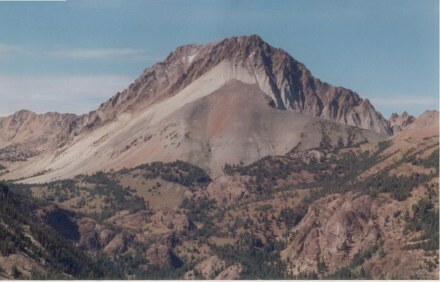 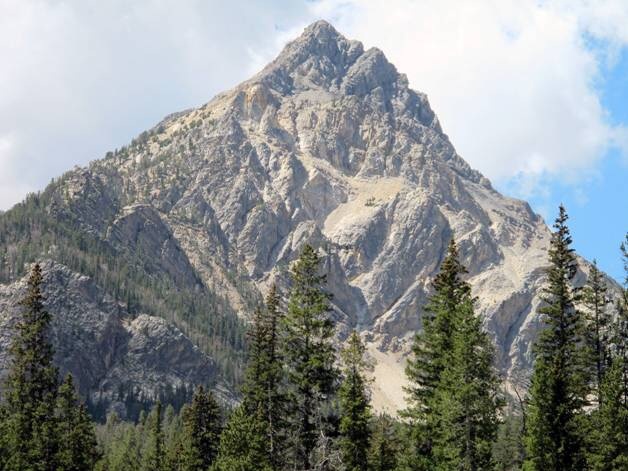 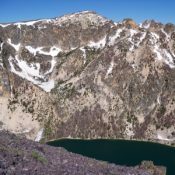 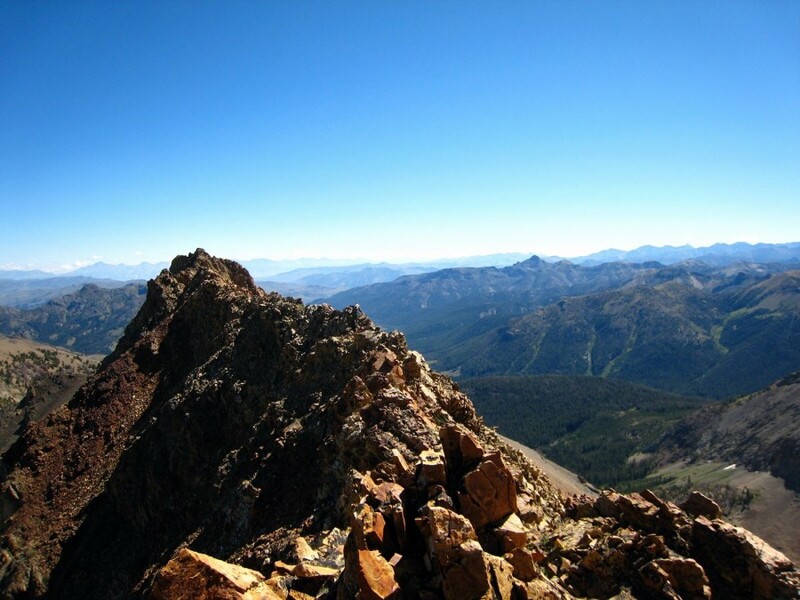 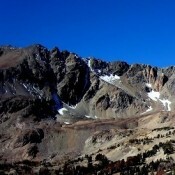 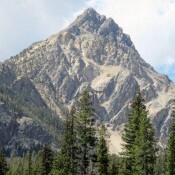 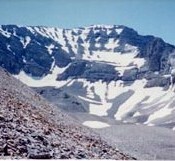 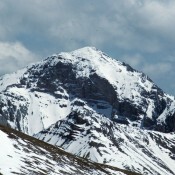 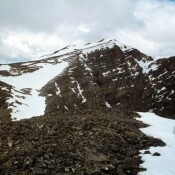 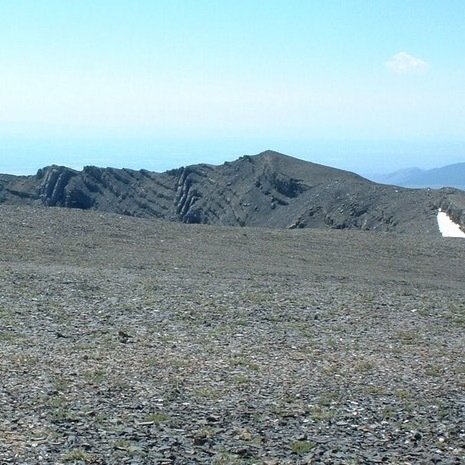 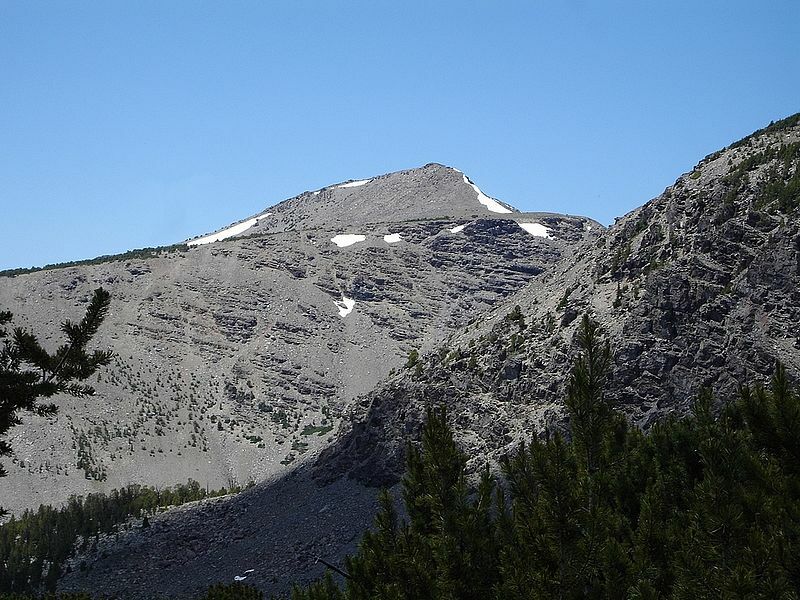 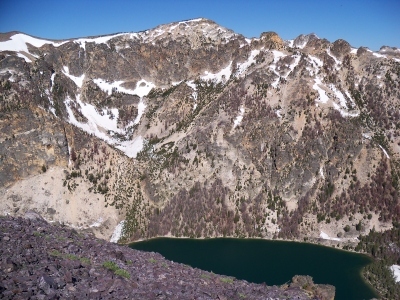 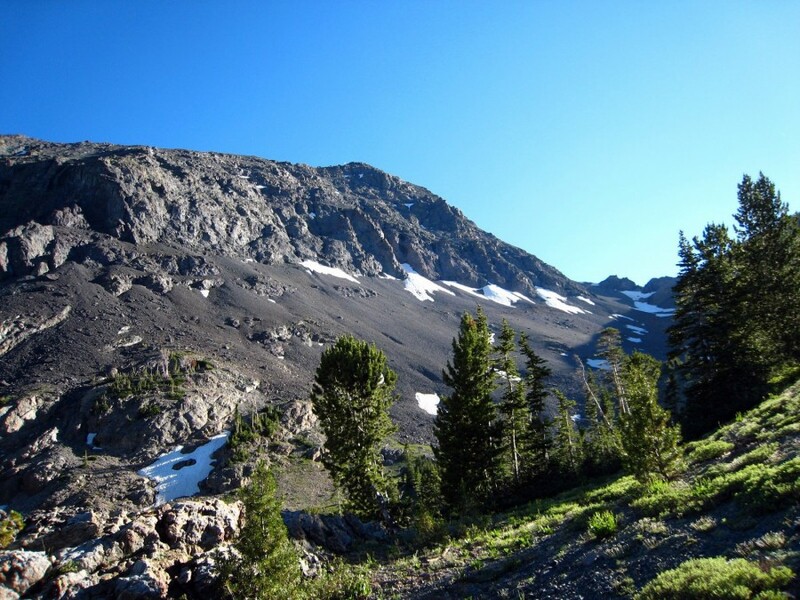 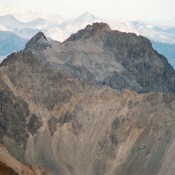 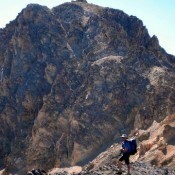 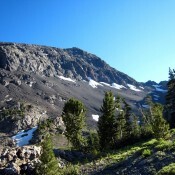 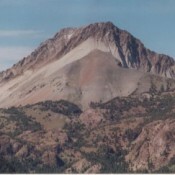 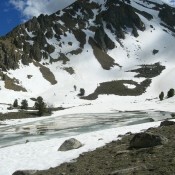 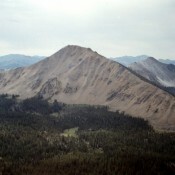 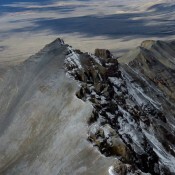 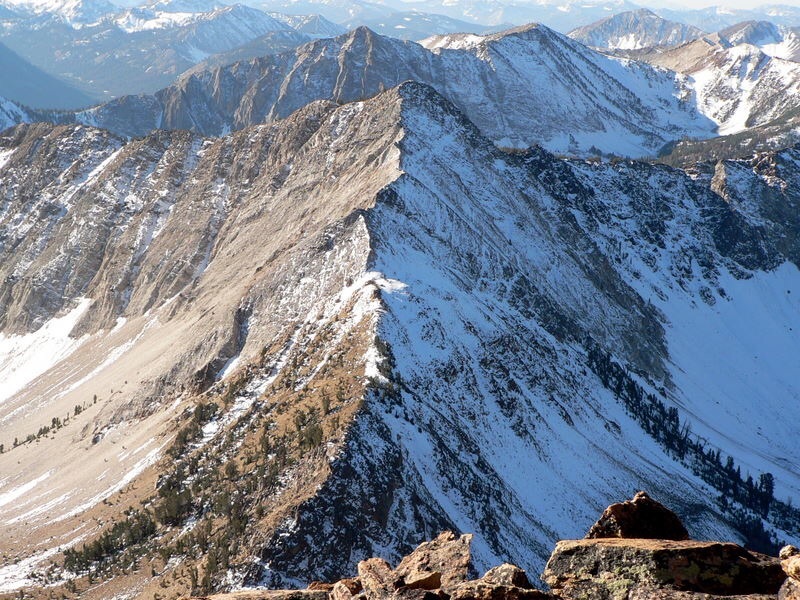 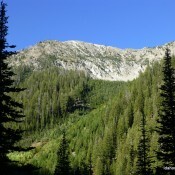 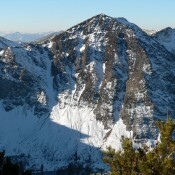 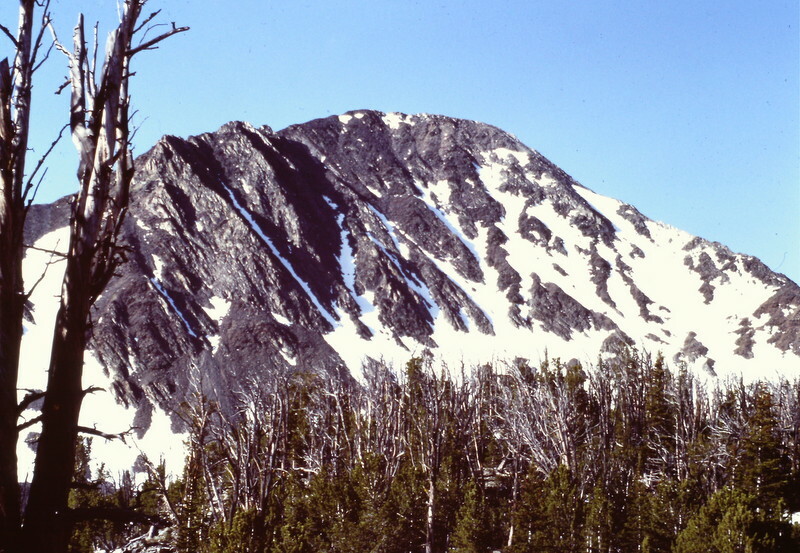 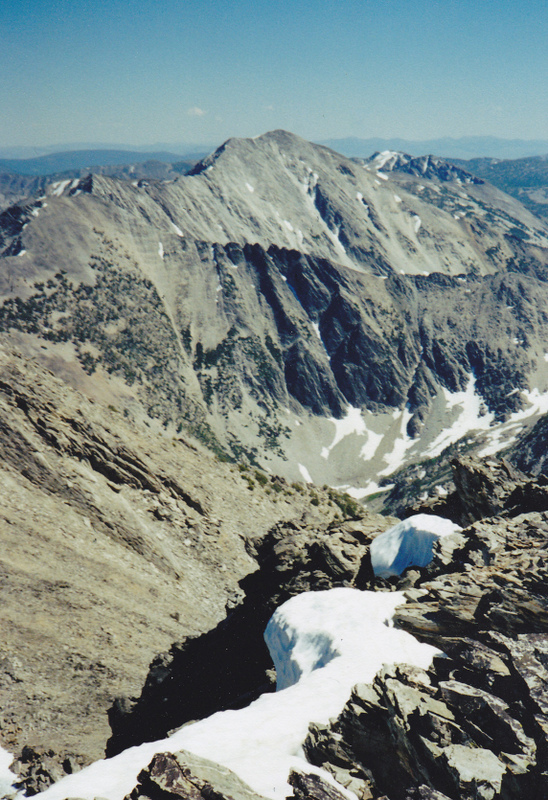 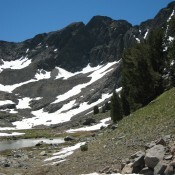 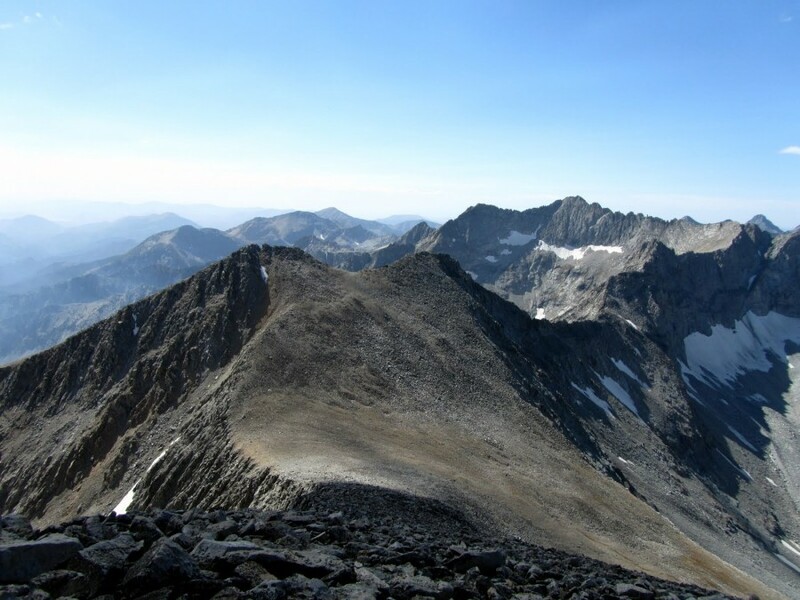 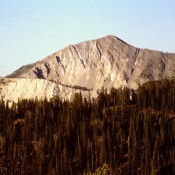 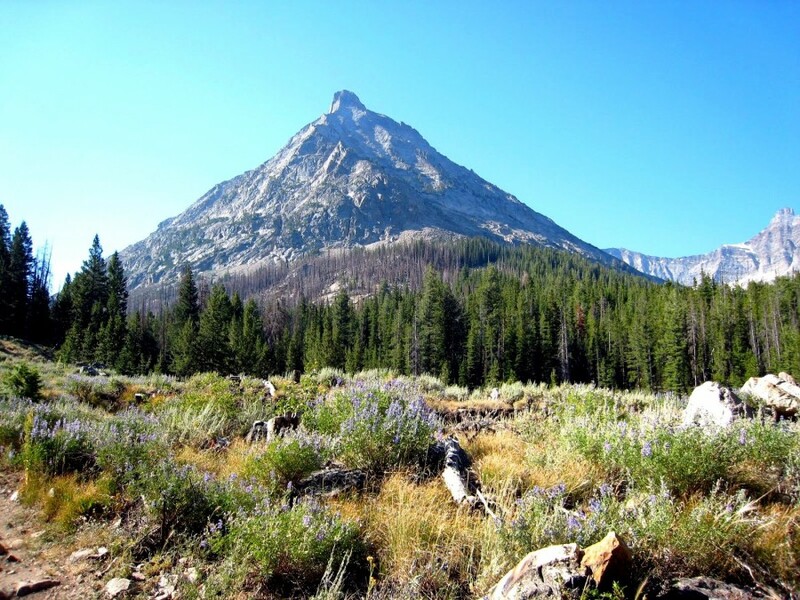 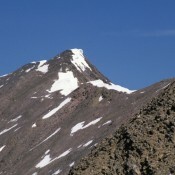 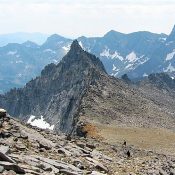 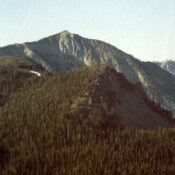 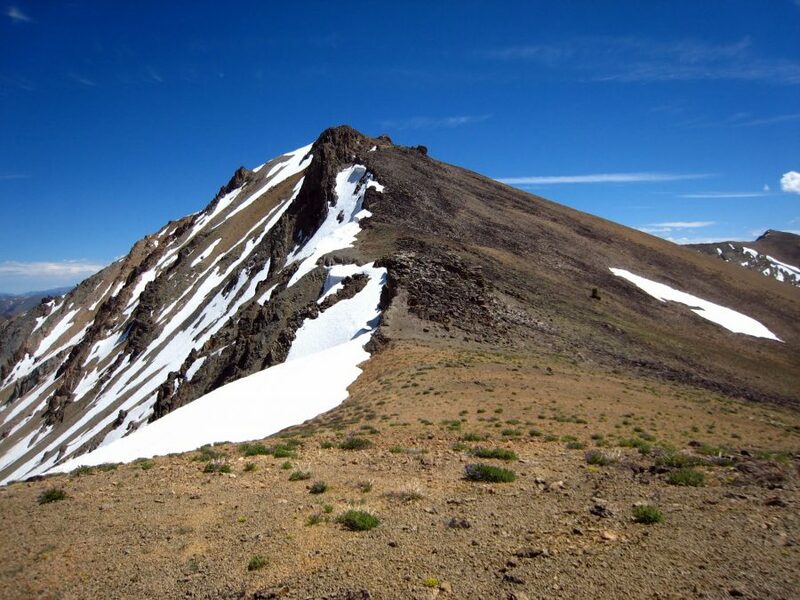 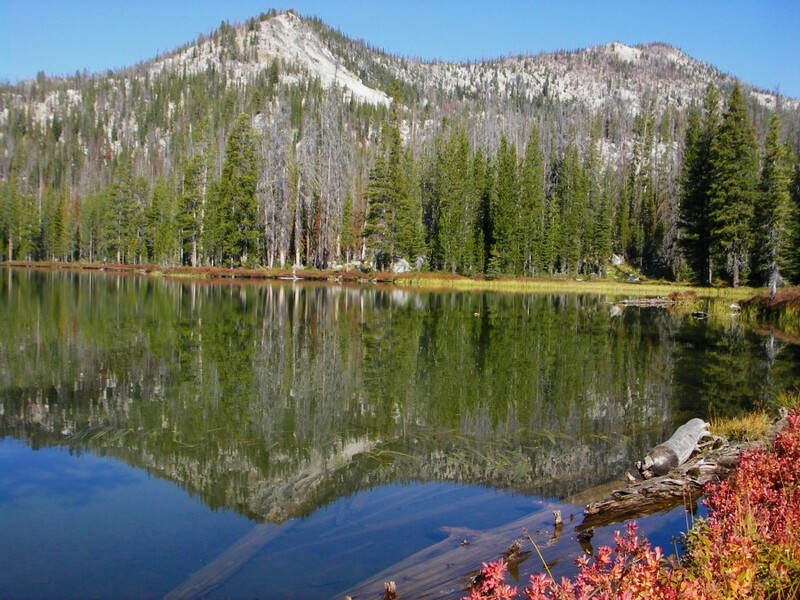 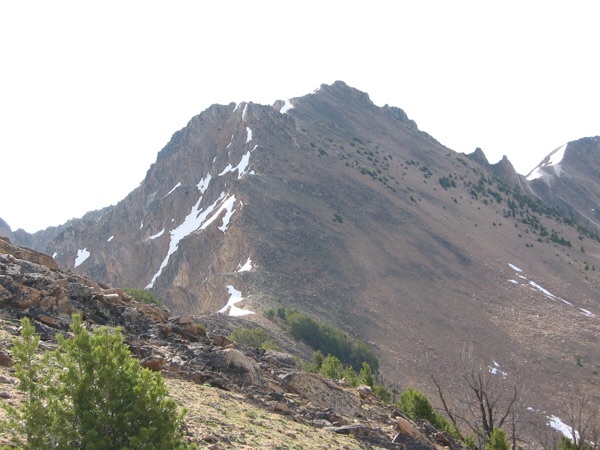 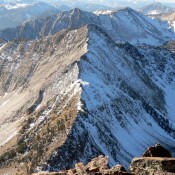 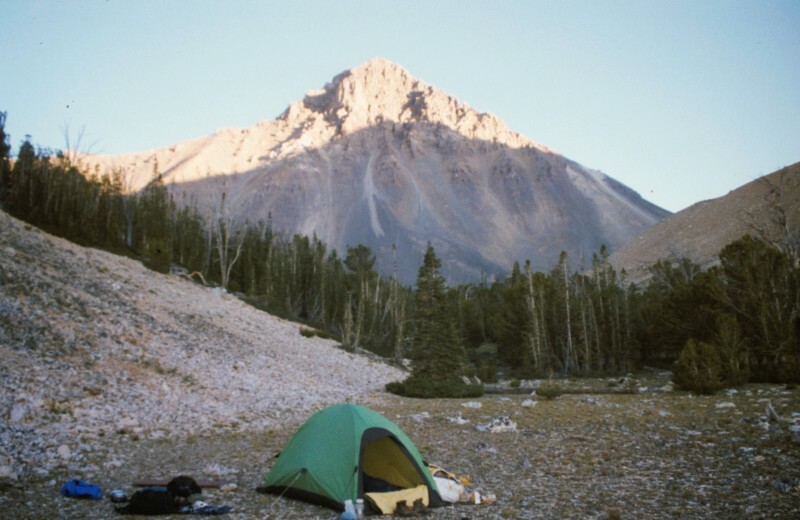 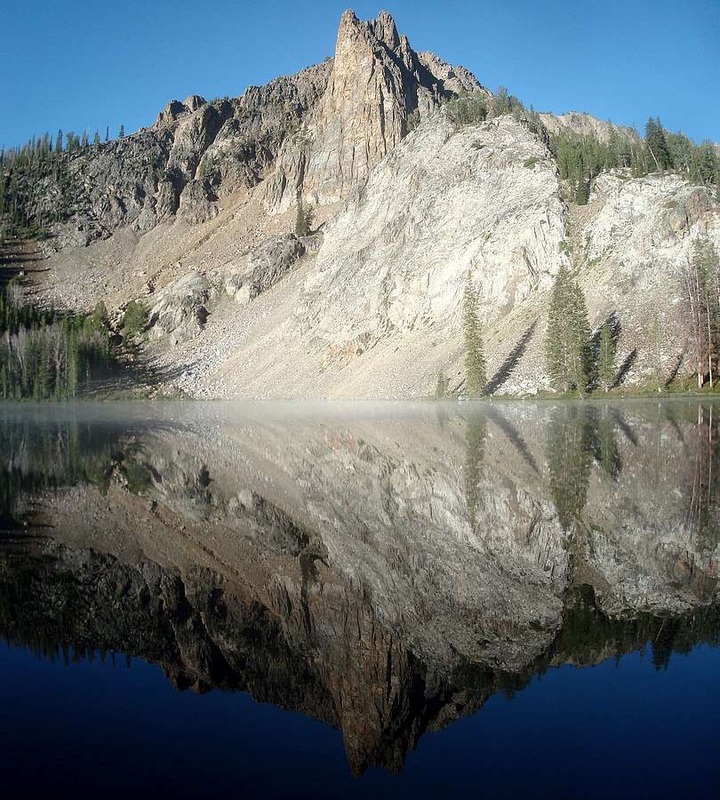 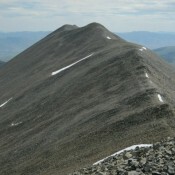 Mount Inspiration Lemhi Range 10,715 ft 1239 Climbing and access information for this peak is found on page 305. 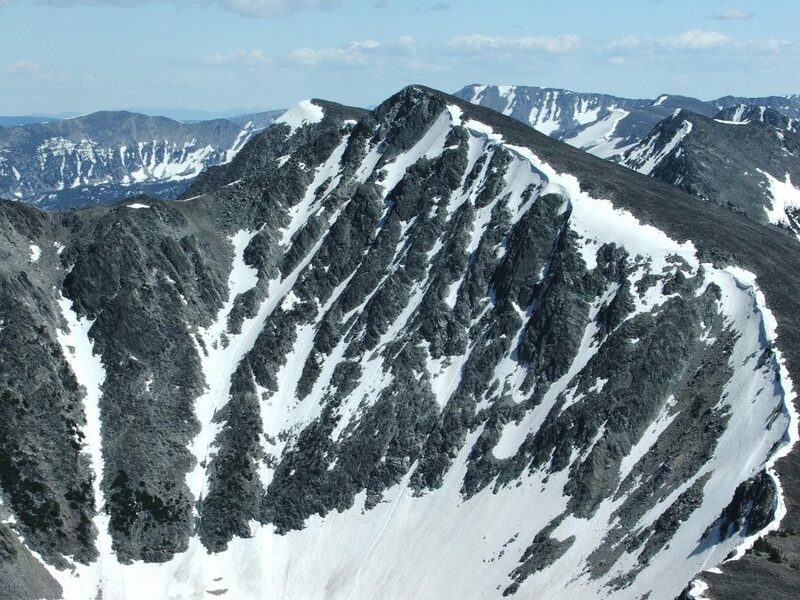 Peak 10715 (Mount Inspiration) Lemhi Range 10,715 ft 1239 Climbing information for this peak is found on page 305. 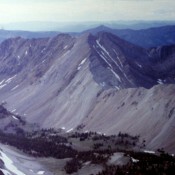 Umpleby Peak Lemhi Range 10,713 ft 773 2005 Climbing information for Umpleby Peak is found on page 305. 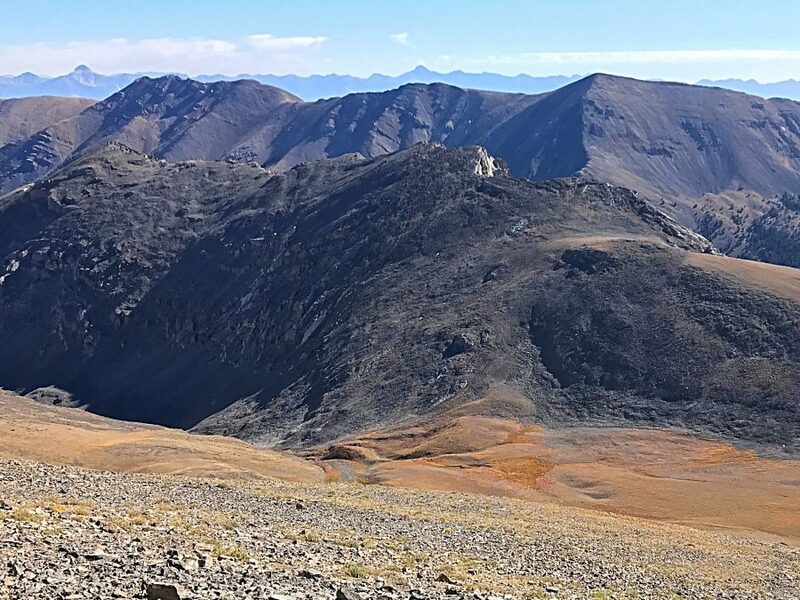 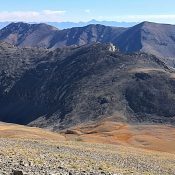 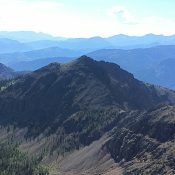 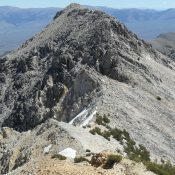 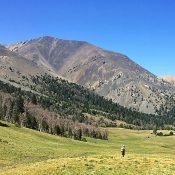 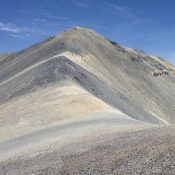 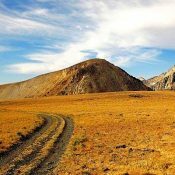 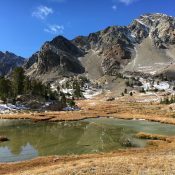 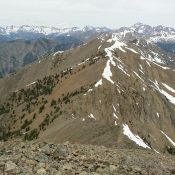 Pion Peak Pioneer Mountains 10,700 ft 400 2017 Route information for this peak is found on page 256. 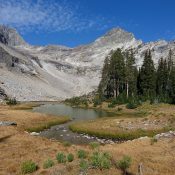 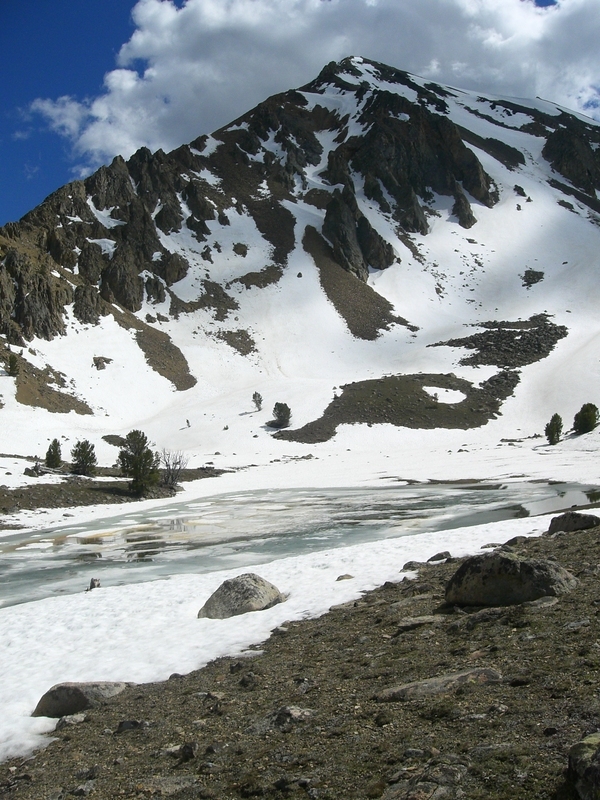 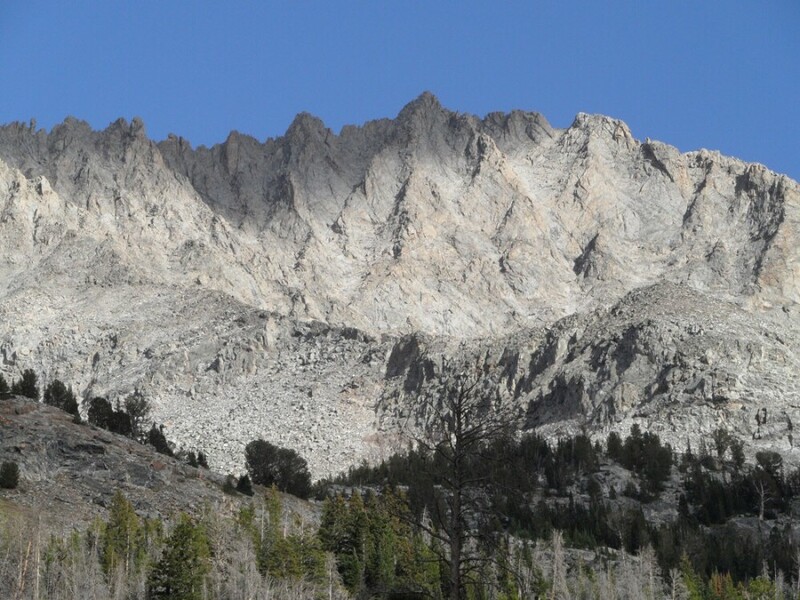 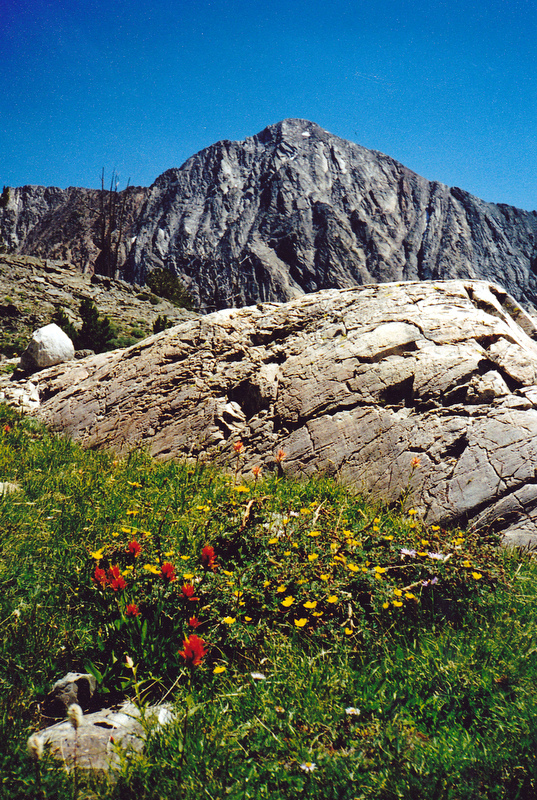 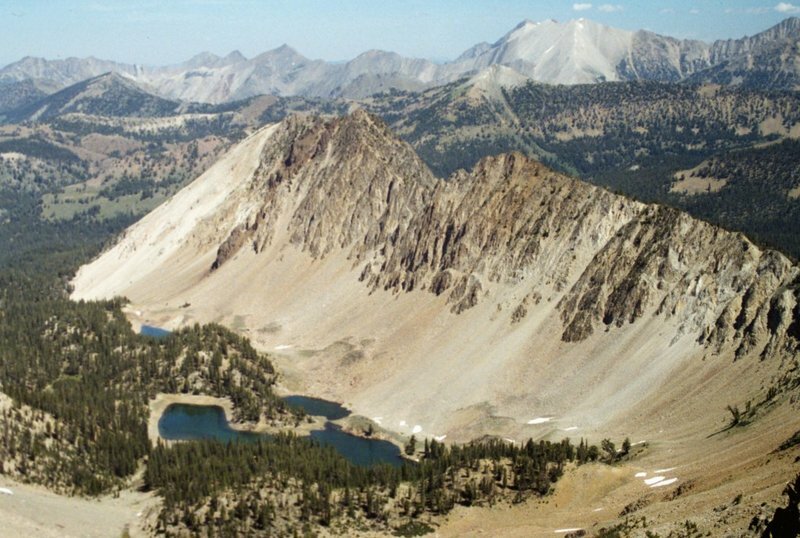 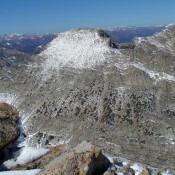 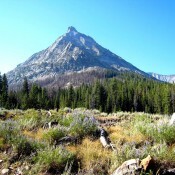 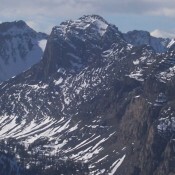 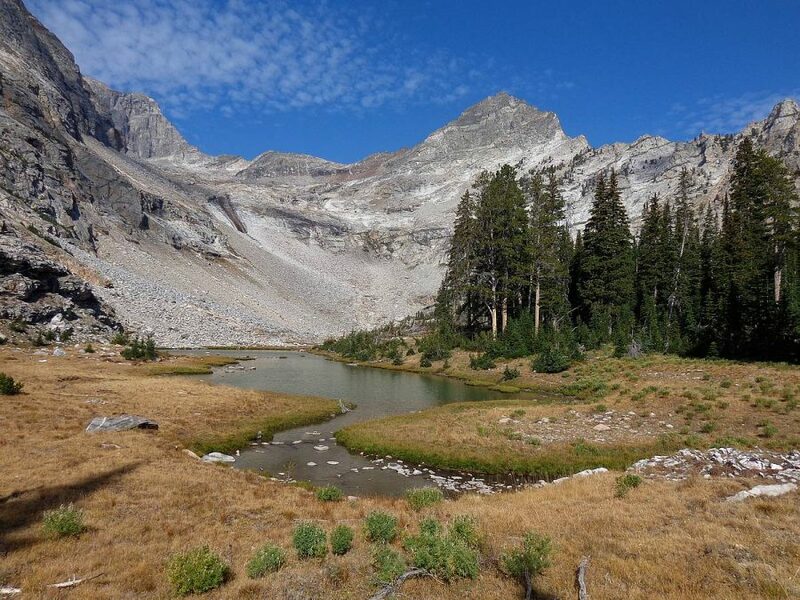 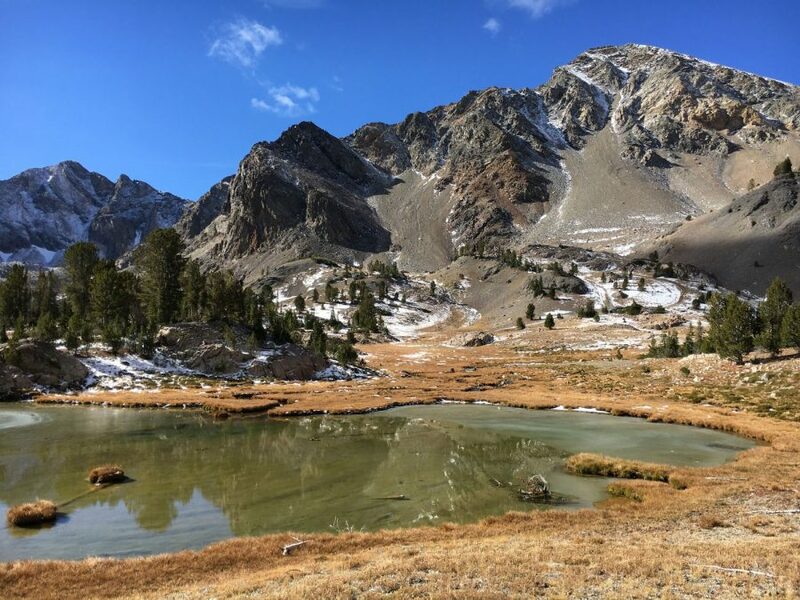 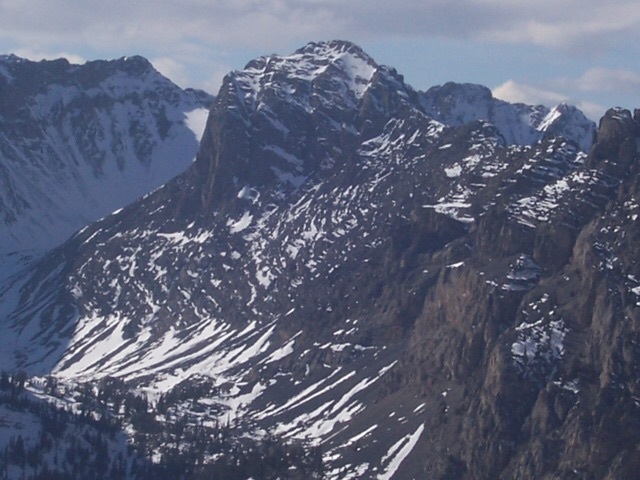 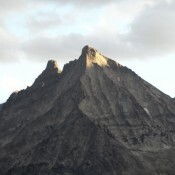 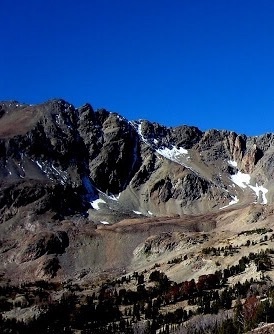 Sunset Peak Lost River Range 10,693 ft 2014 This peak is discussed on page 288. 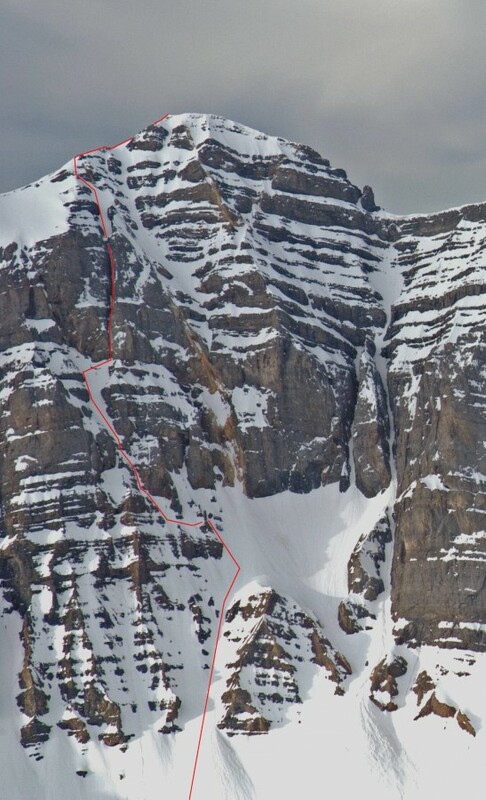 The route described below is not in the book. 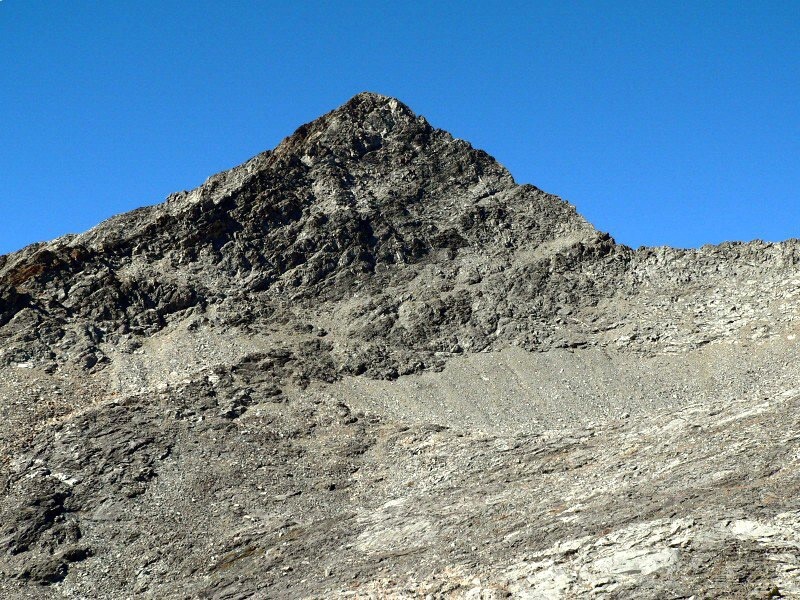 Peak 10693 (Mount Perspiration a.k.a. 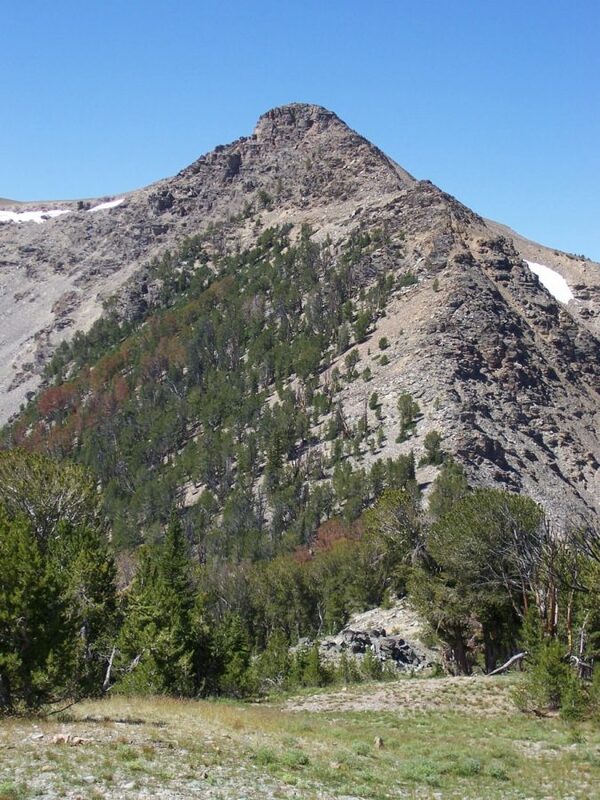 Prescott Peak) Lemhi Range 10,693 ft 393 This peak is not in the book. 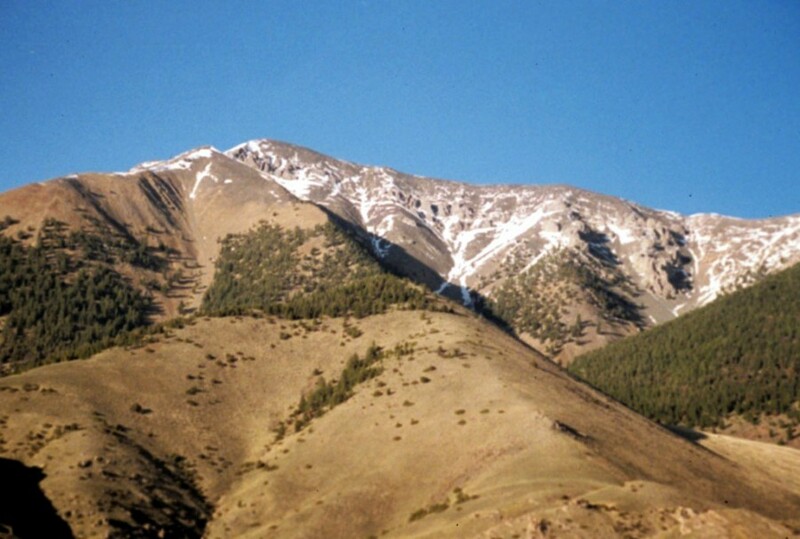 Shril Peak Lemhi Range 10,690 ft 1070 Climbing and access information for this peak is found on page 311. 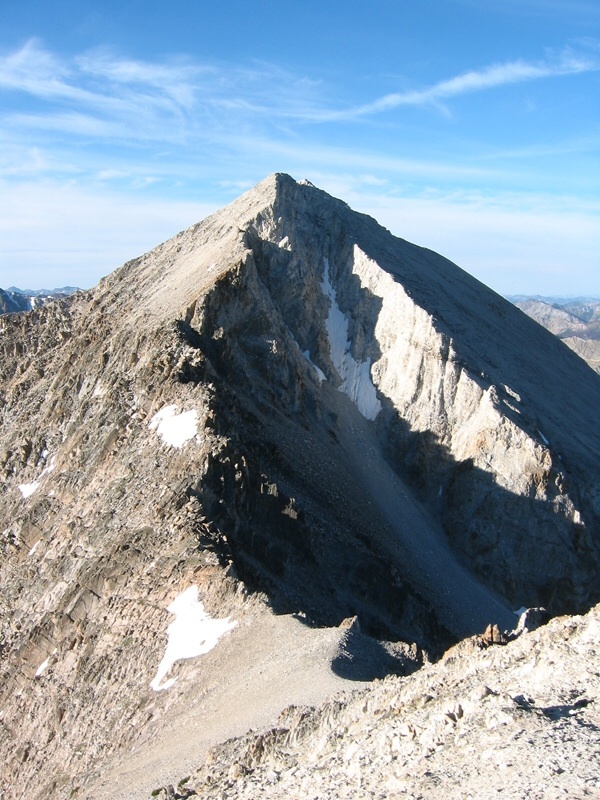 Peak 10688 (The Wedge) Lemhi Range 10,688 ft 868 Climbing and access information for this peak is found on page 300. 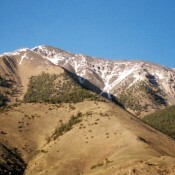 Peak 10681 Lemhi Range 10,681 ft 461 1981 This peak is not in the book. 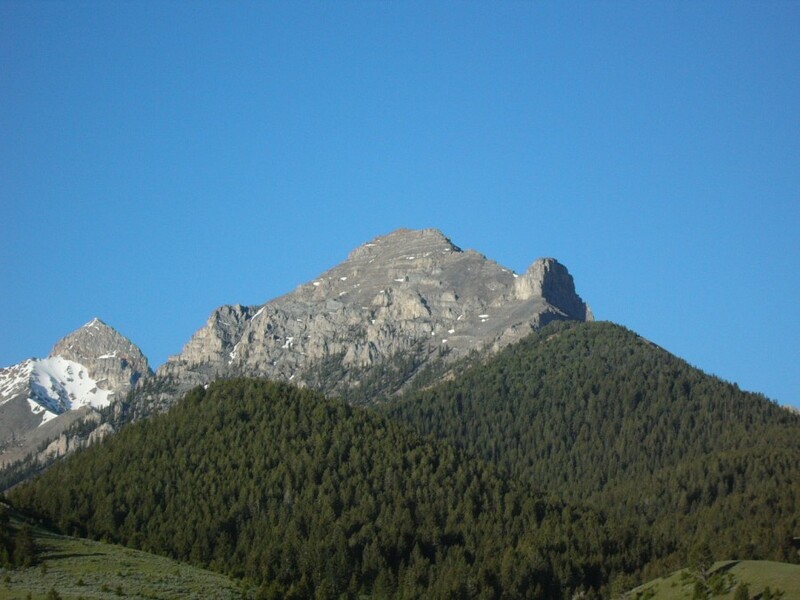 Peak 10677 Lost River Range 10,677 ft 417 This peak is not in the book. 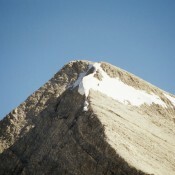 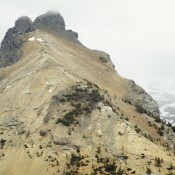 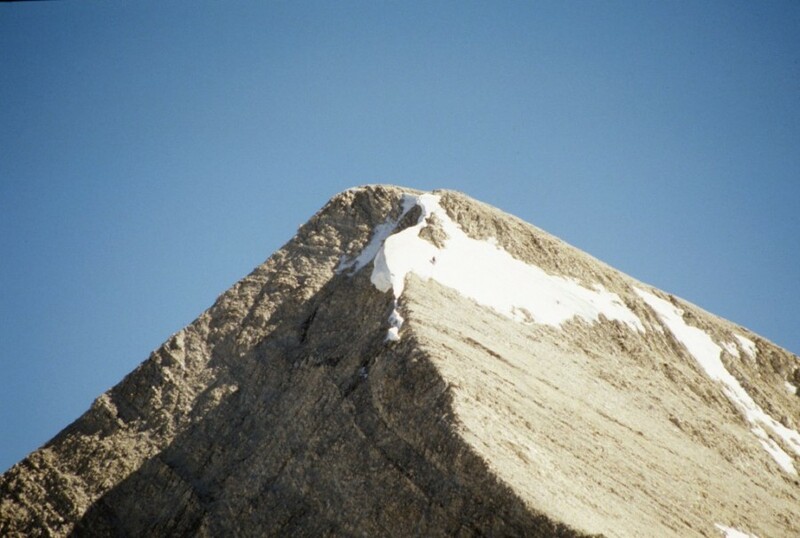 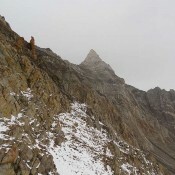 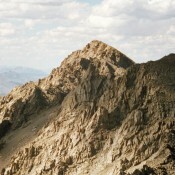 Find this peak on page 256. 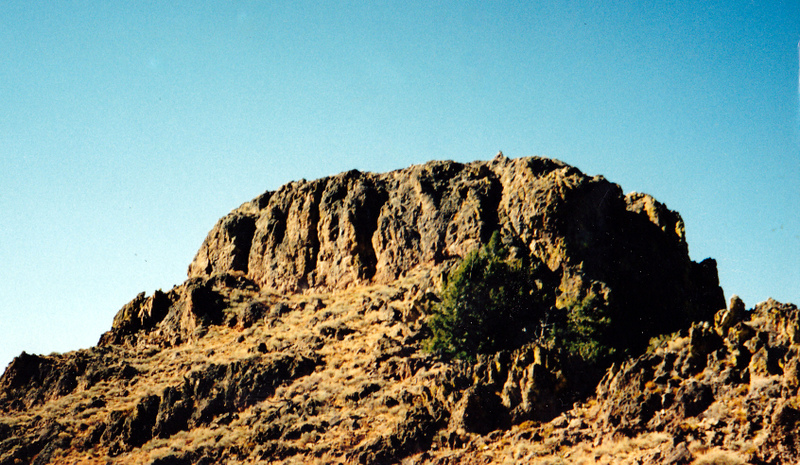 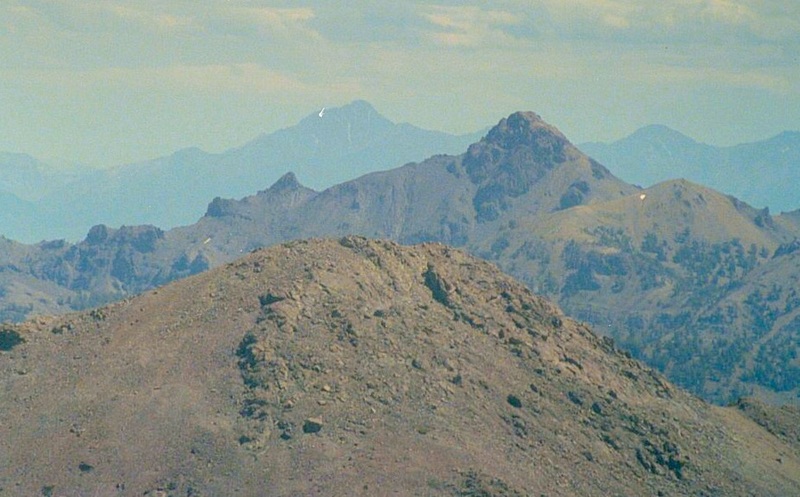 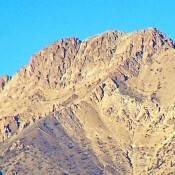 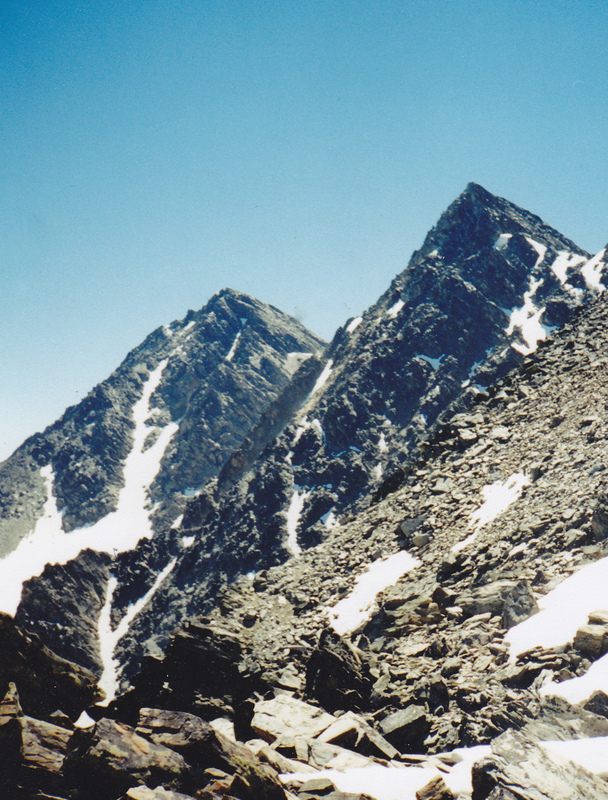 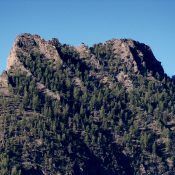 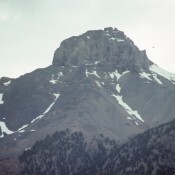 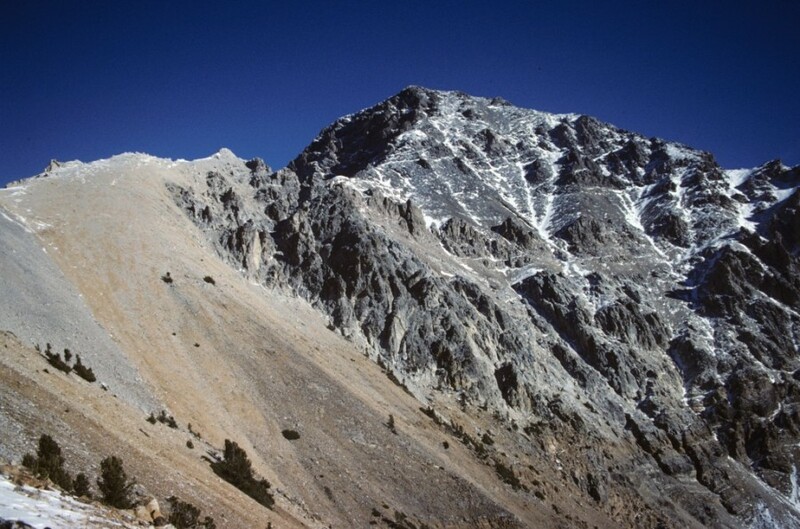 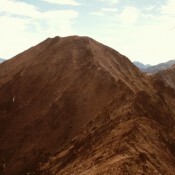 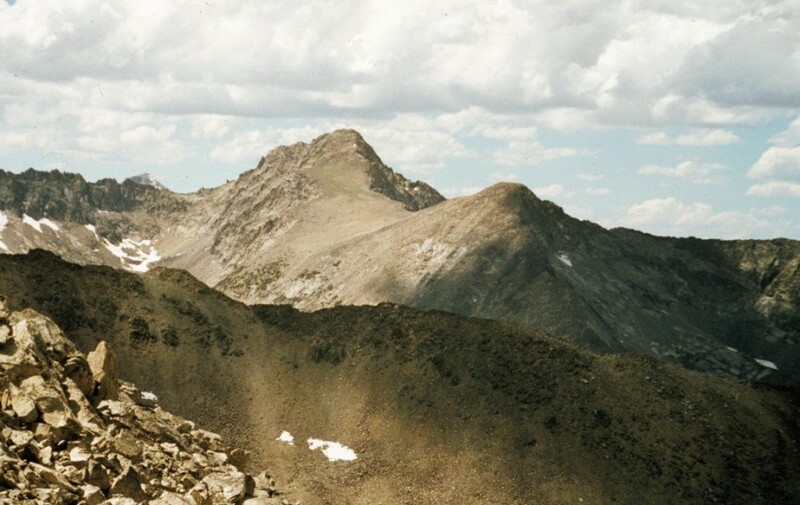 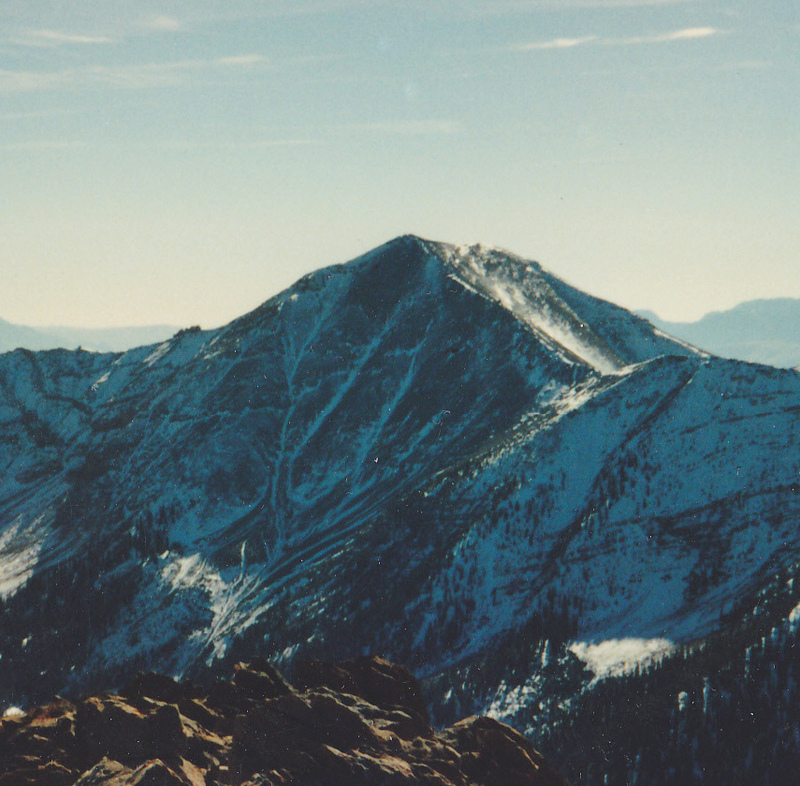 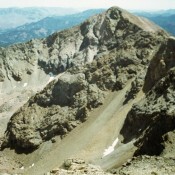 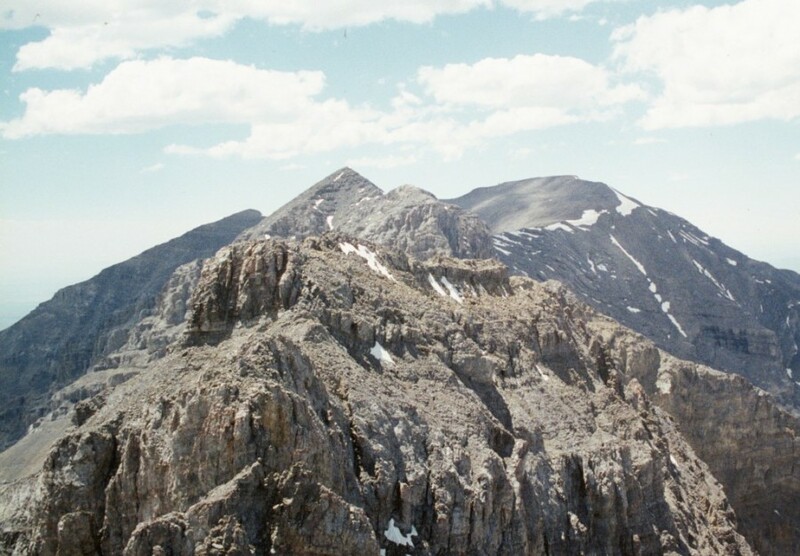 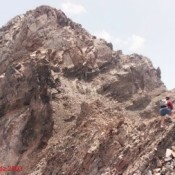 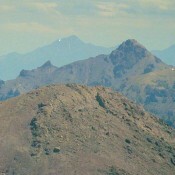 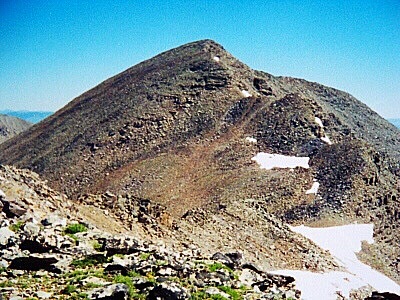 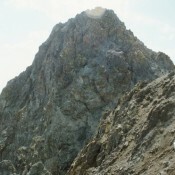 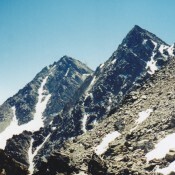 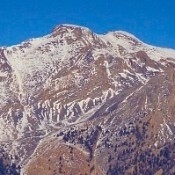 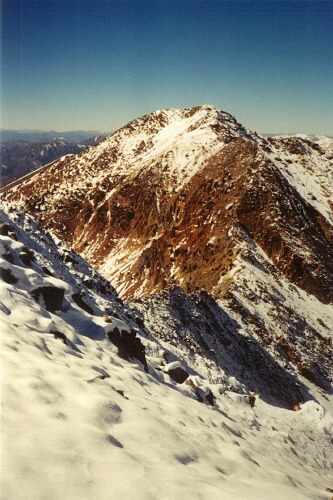 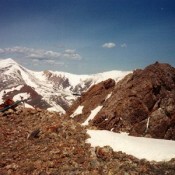 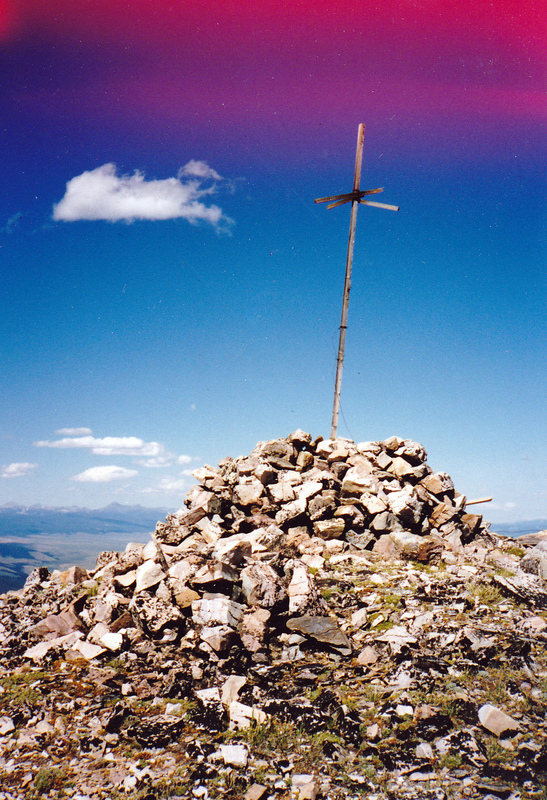 PEAK 10650 (Pincer Peak) Pioneer Mountains 10,650 ft 1994 This peak is found on page 256. 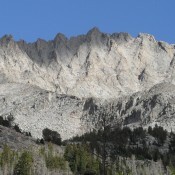 Peak 10648 Lost River Range 10,648 ft 388 This peak is not in the book. 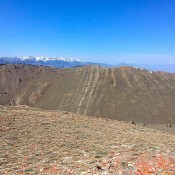 Meadow Peak Lemhi Range 10,633 ft 1173 2013 Climbing and access information for this peak is found on page 307. 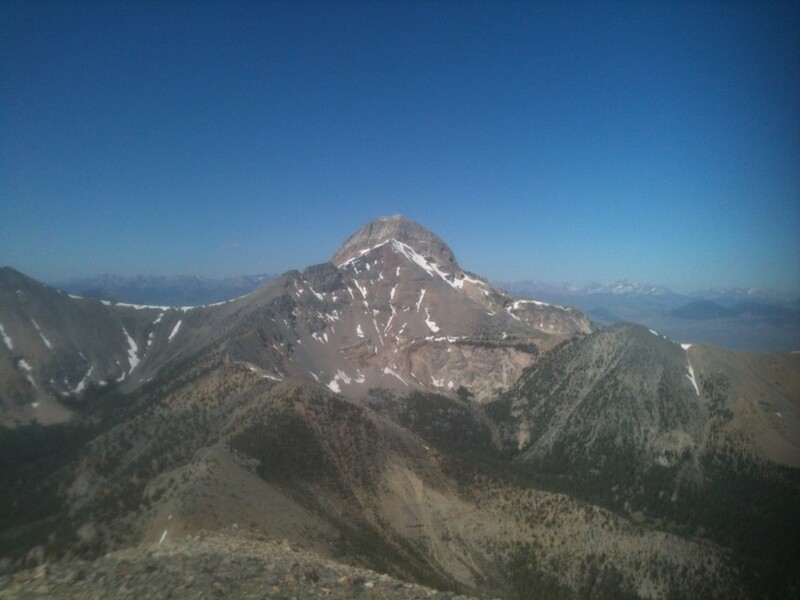 Peak 10624 Lemhi Range 10,624 ft 316 This peak is not in the book. 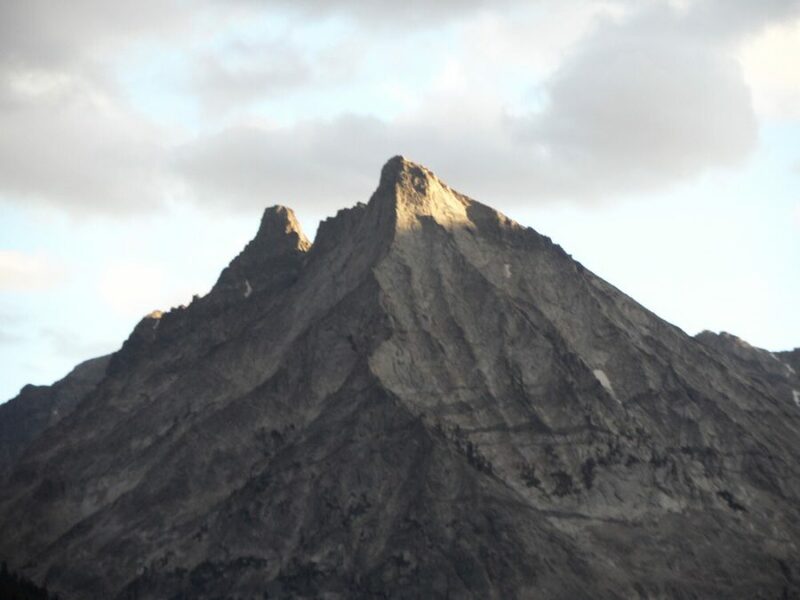 Peak 10618 (Sunrise Peak) Lost River Range 10,618 ft 638 Climbing and access information for this peak is found on page 288. 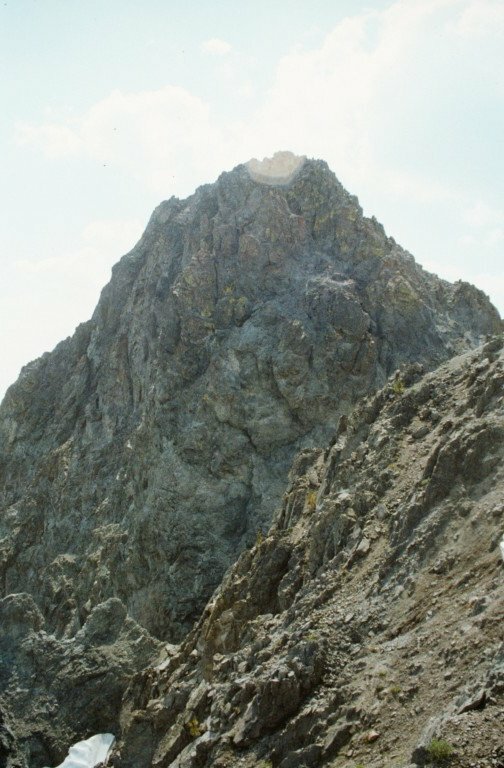 Peak 10613 (The Claw) Pioneer Mountains 10,613 ft This peak is described on page 256. 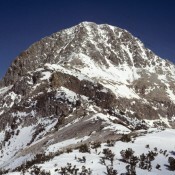 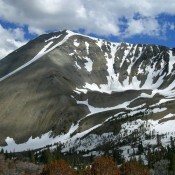 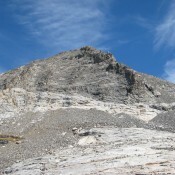 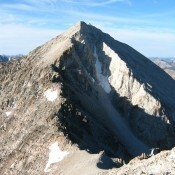 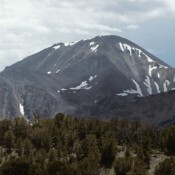 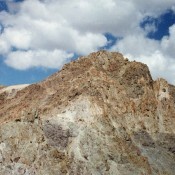 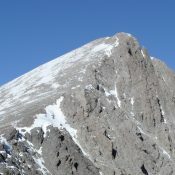 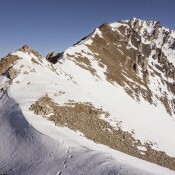 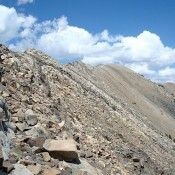 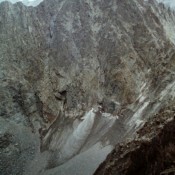 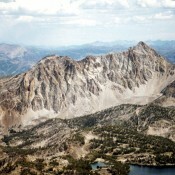 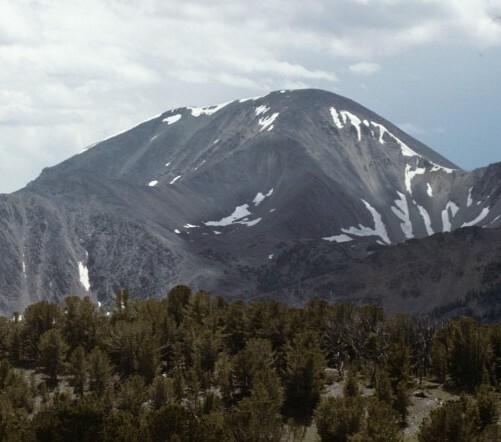 Inyo Benchmark (Inyo Peak) Lemhi Range 10,611 ft 471 Climbing and access information for this peak is found on page 302. 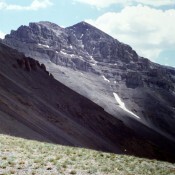 Peak 10604 Lemhi Range 10,604 ft 424 Climbing and access information for this peak is found on page 311. 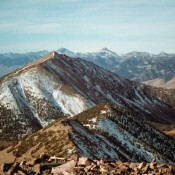 Patterson Peak Lemhi Range 10,602 ft 782 Climbing and access information for this peak is found on page 300. 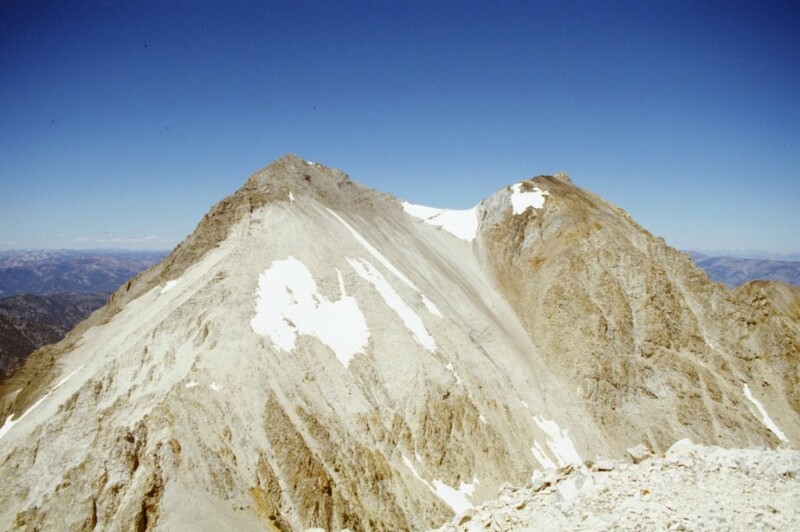 Peak 10601 (Ramshorn Peak) Lost River Range 10,601 ft Access and climbing information for this peak is found on page 289. 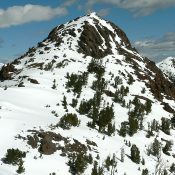 Peak 10601 (Big Eightmile Peak) Lemhi Range 10,601 ft 709 Climbing and access information for this peak is found on page 301. 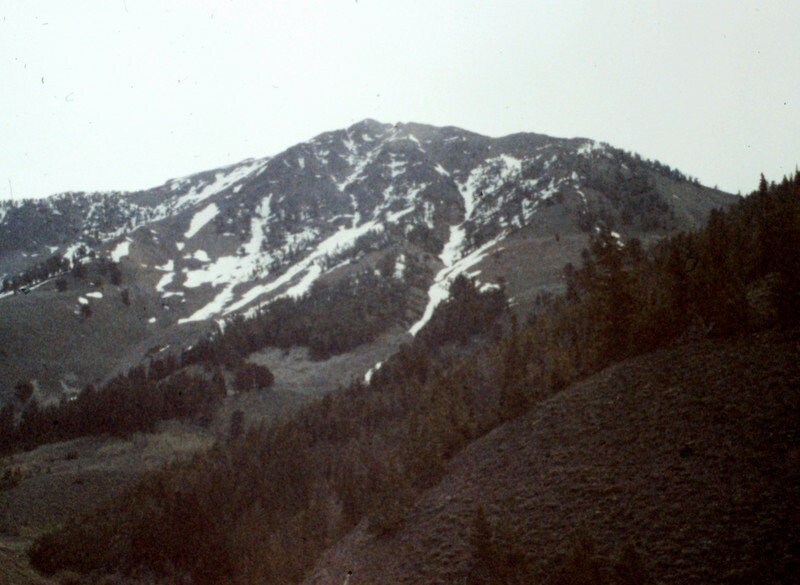 Peak 10585 (Summit Creek Peak) Pioneer Mountains 10,584 ft 1095 1989 This peak is found on page 244. 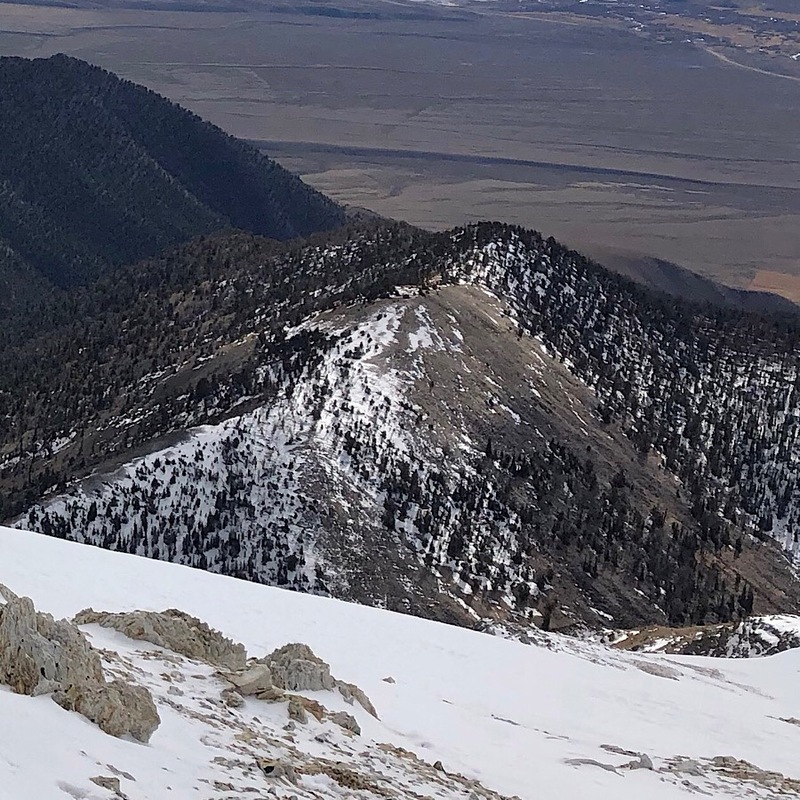 Revised January 2019. 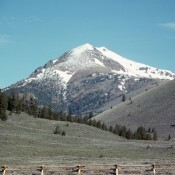 Mogg Mountain Lemhi Range 10,573 ft 793 Climbing and access information for this peak is discussed on page 299. 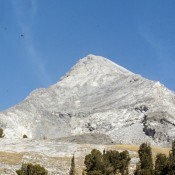 Peak 10571 (Smokescreen Peak) Lemhi Range 10,571 ft 511 This peak is not in the book. 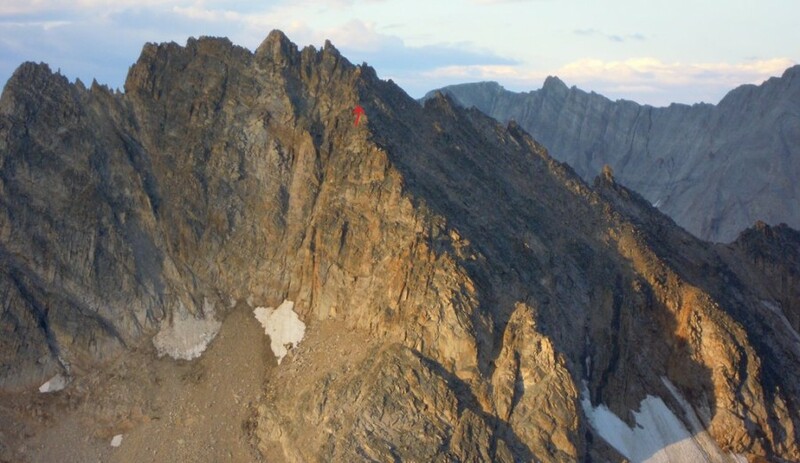 Peak 10571 Lost River Range 10,571 ft 511 Climbing and access information for this peak is found on page 289. 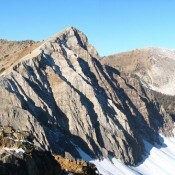 Peak 10569 (The Ledge) Lemhi Range 10,569 ft 549 Climbing and access information for this peak is found on page 300. 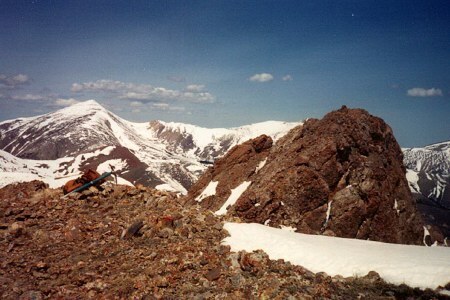 Grays Peak Pioneer Mountains 10,563 ft 1223 1987 Grays Peak is found on page 252. 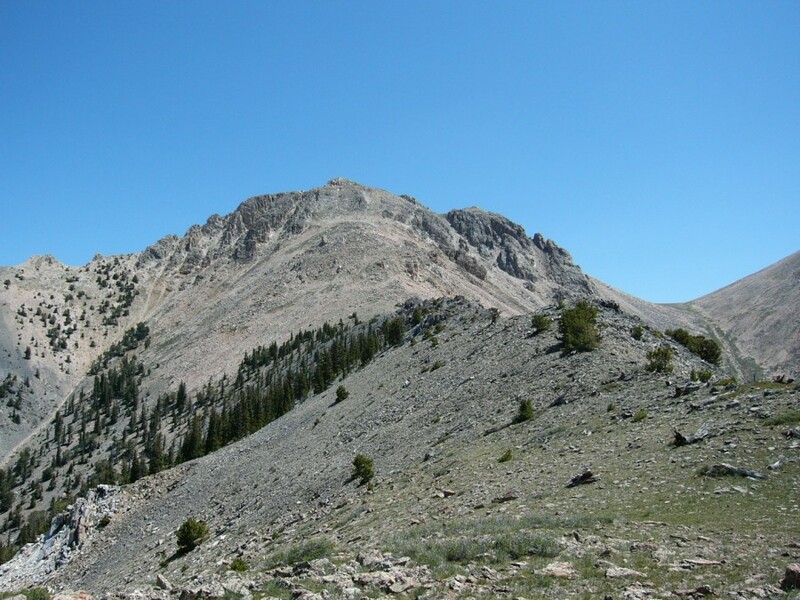 Rocky Peak Lemhi Range 10,555 ft 1015 Climbing and access information for this peak is found on page 301. 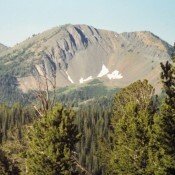 Timber Creek Peak Lemhi Range 10,553 ft 858 Climbing and access information for this peak is found on page 302. 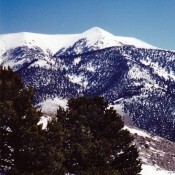 Scorpion Mountain Pioneer Mountains 10,545 ft 1994 This peak is found on page 256. 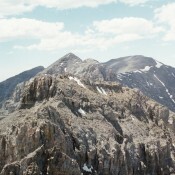 Peak 10536 Pioneer Mountains 10,536 ft 396 This peak is not in the book. 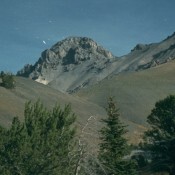 Peak 10533 (Medusa) Lemhi Range 10,533 ft 633 This peak is not in the book. Trail Peak Lemhi Range 10,533 ft 1007 Climbing and access information for this peak is found on page 305. 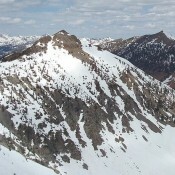 Peak 10523 Lemhi Range 10,523 ft 343 This peak is not in the book. 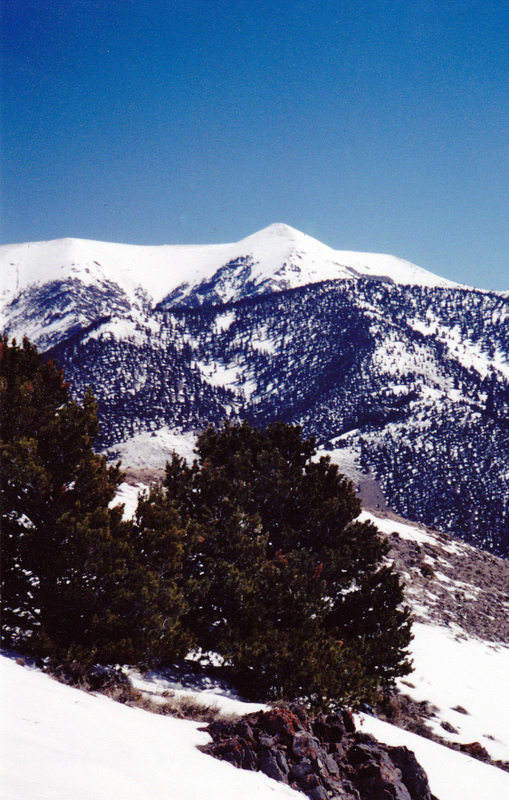 Phi Kappa Mountain Pioneer Mountains 10,516 ft 296 1989 This peak is found on page 244. 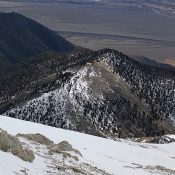 Revised January 2019. 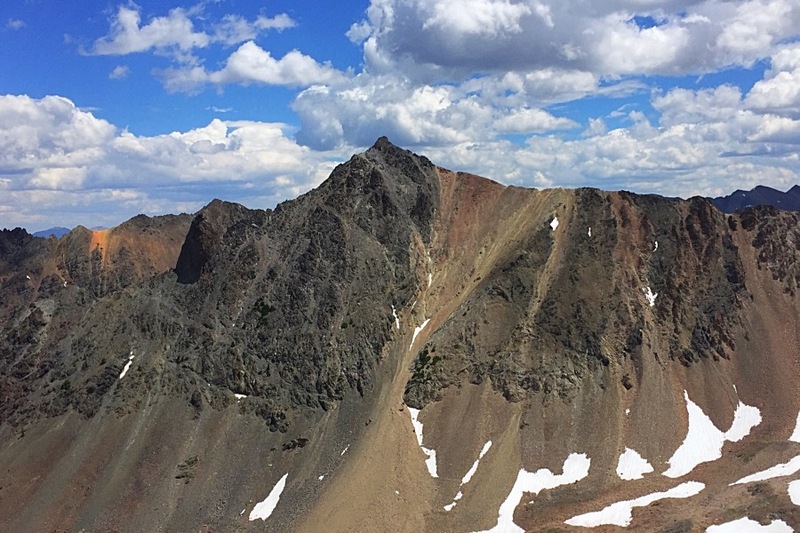 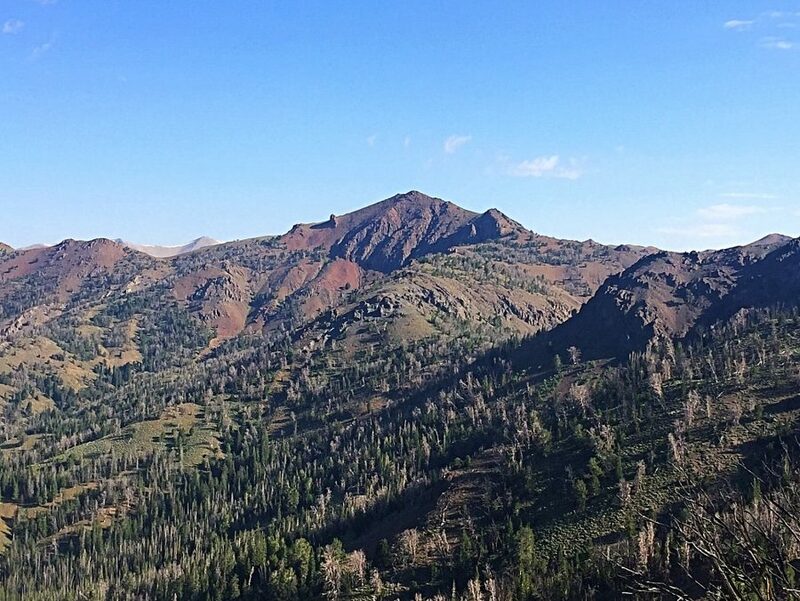 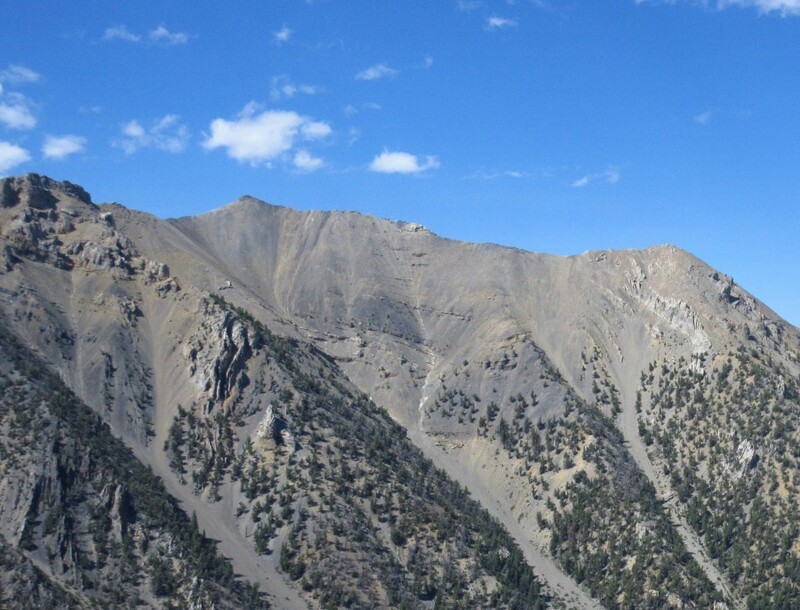 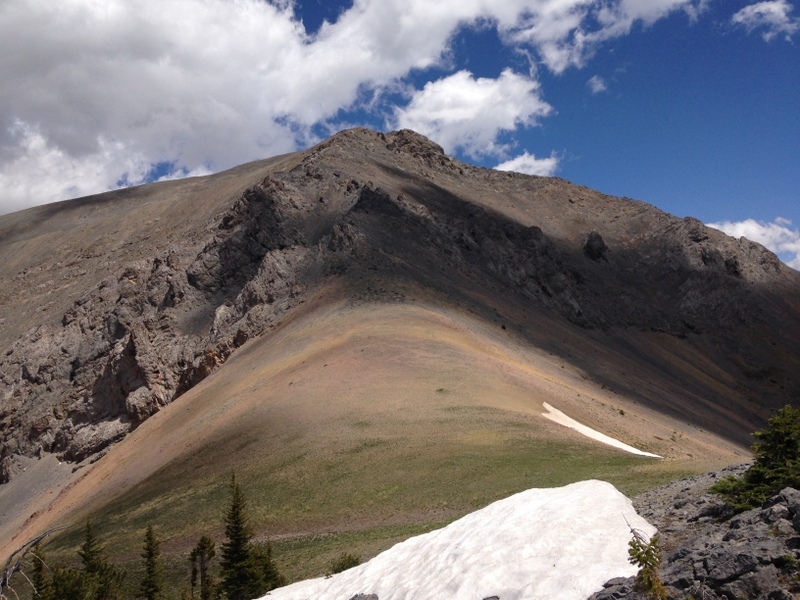 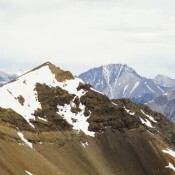 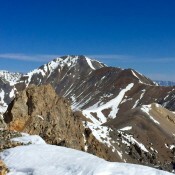 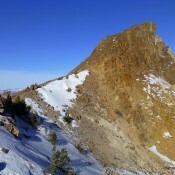 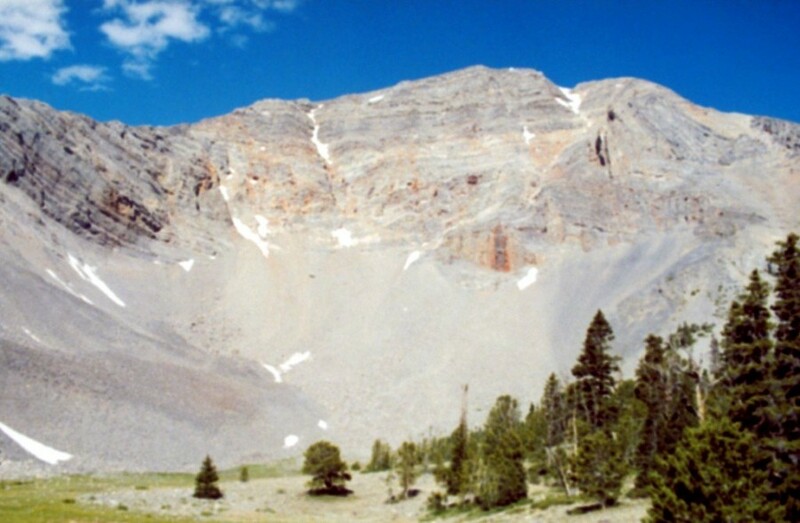 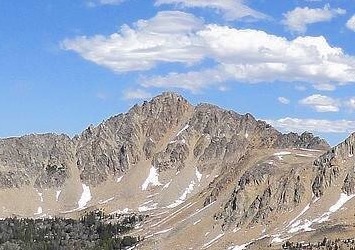 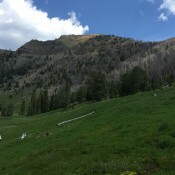 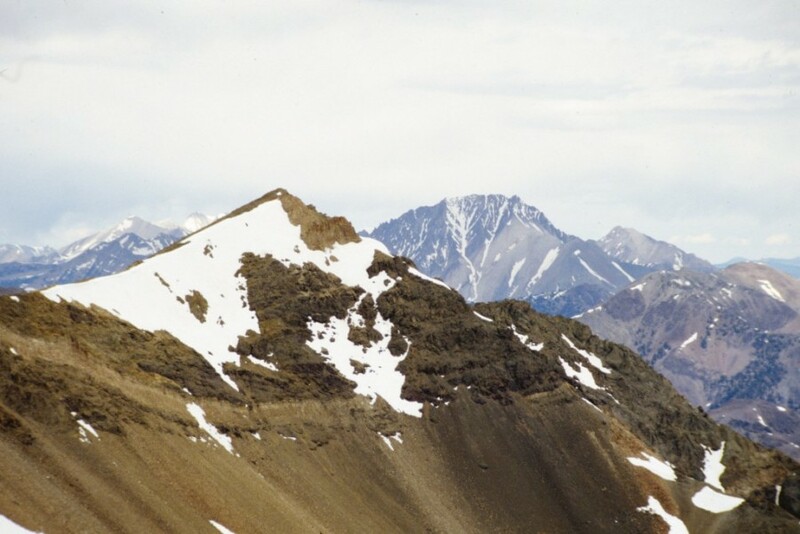 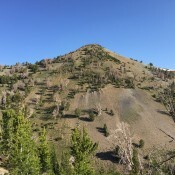 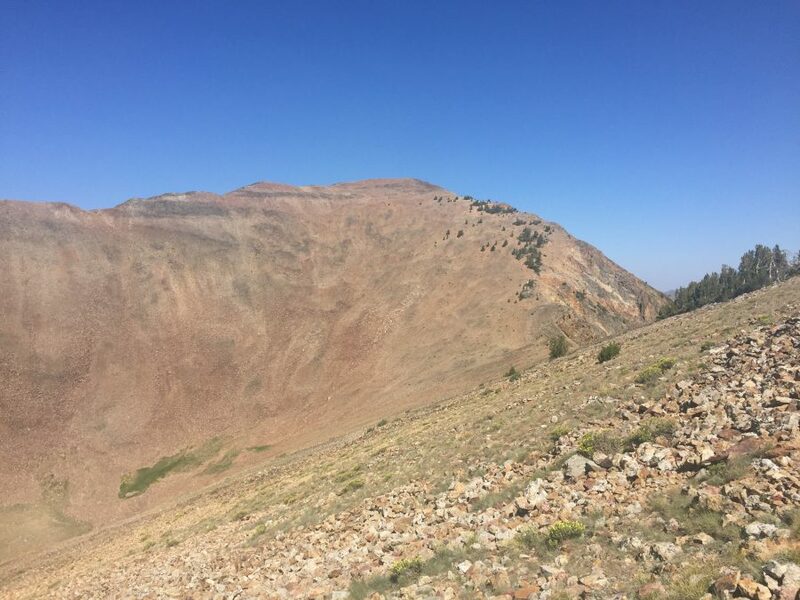 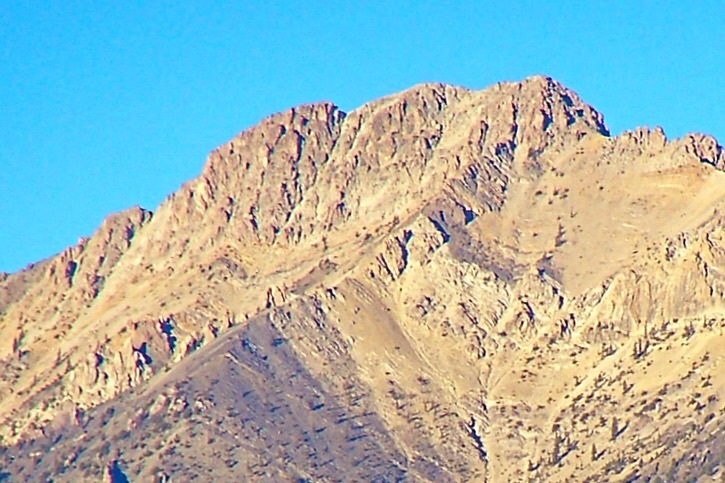 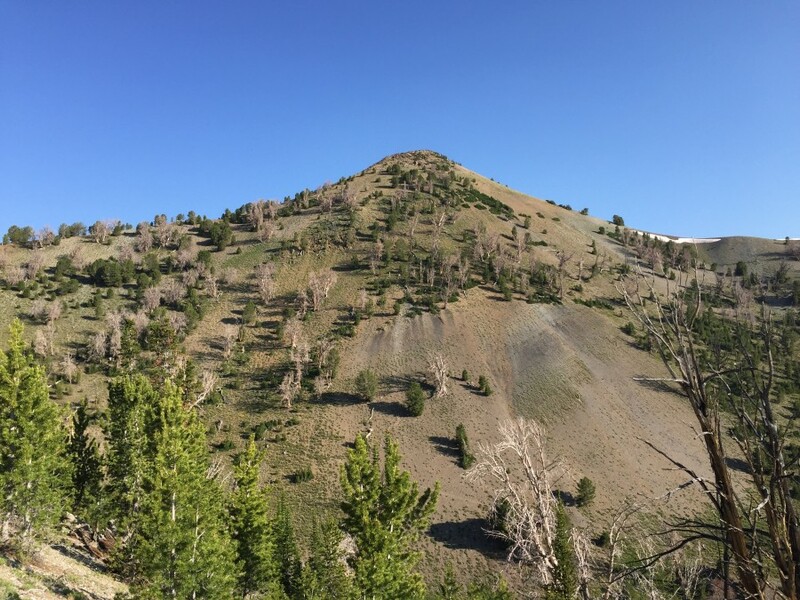 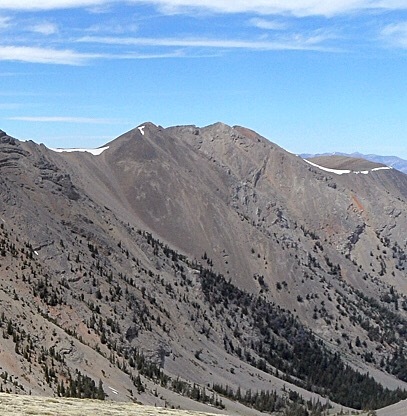 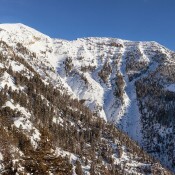 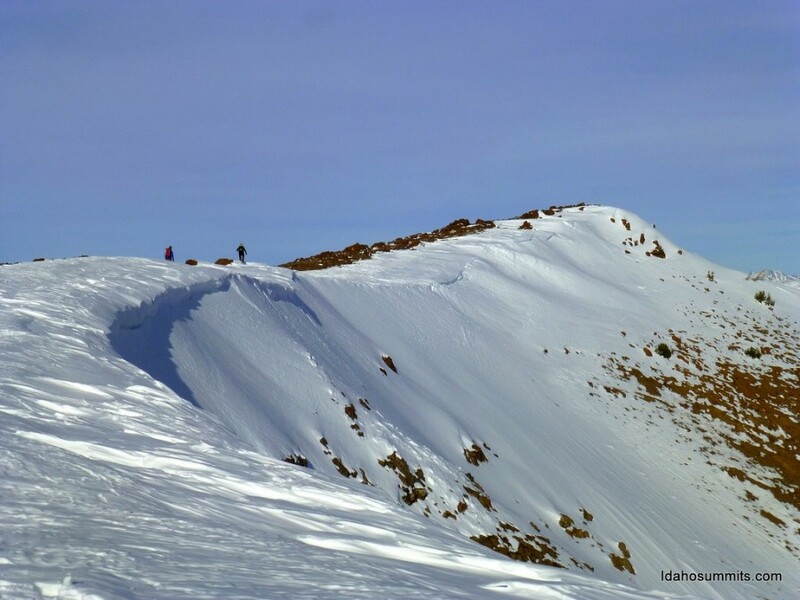 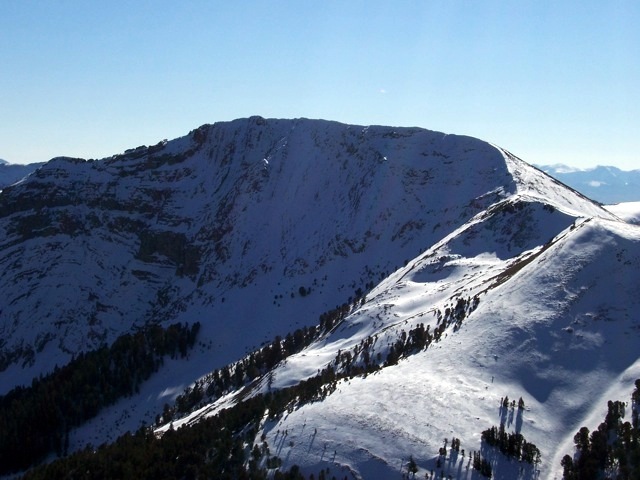 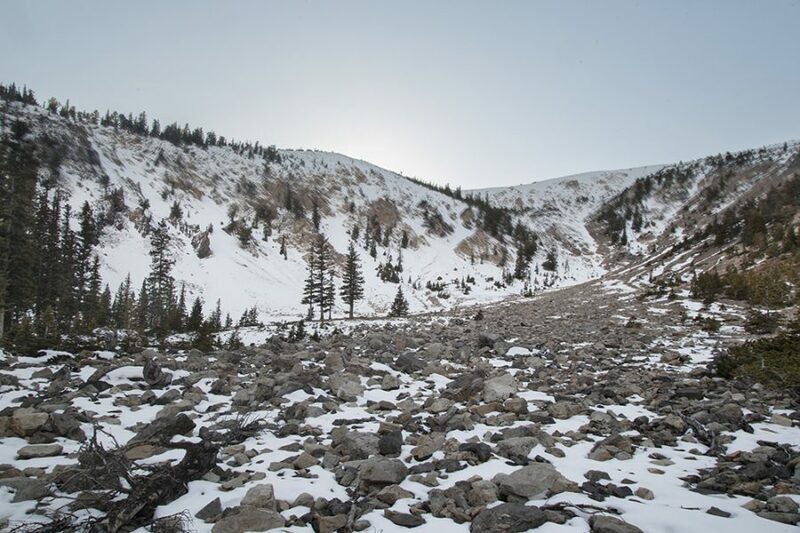 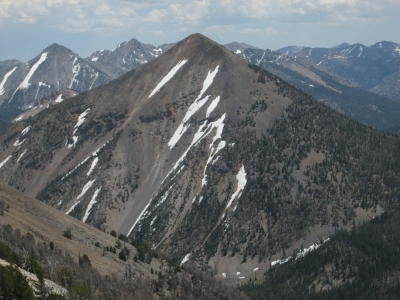 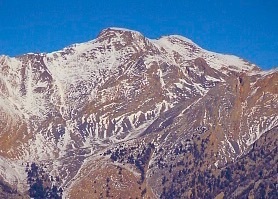 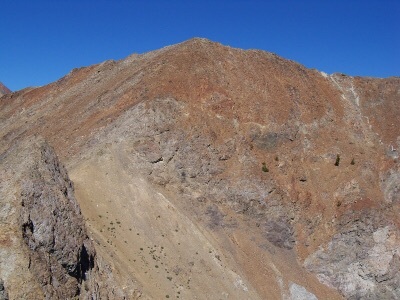 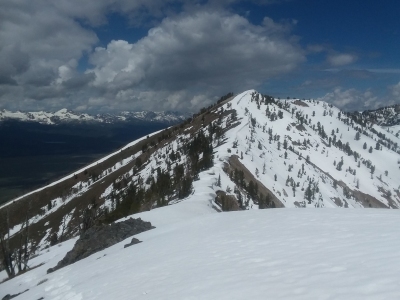 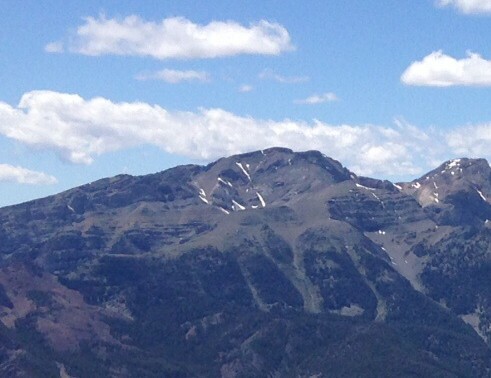 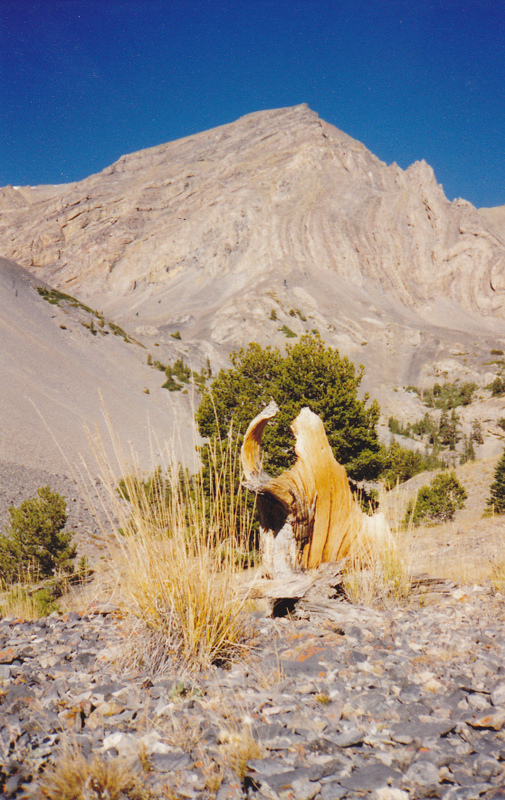 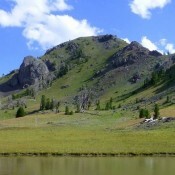 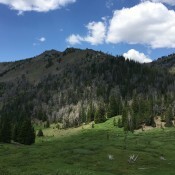 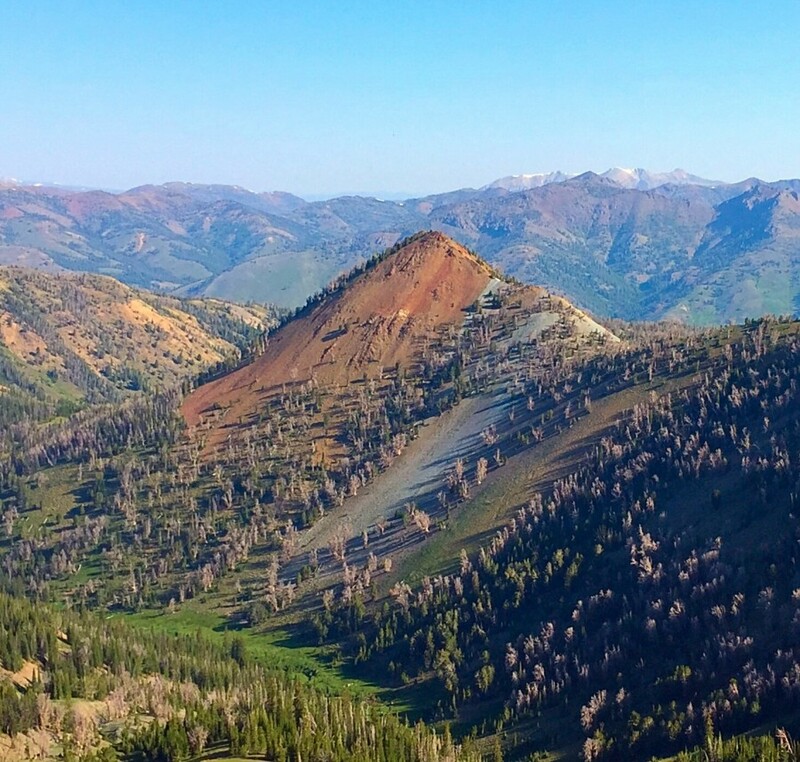 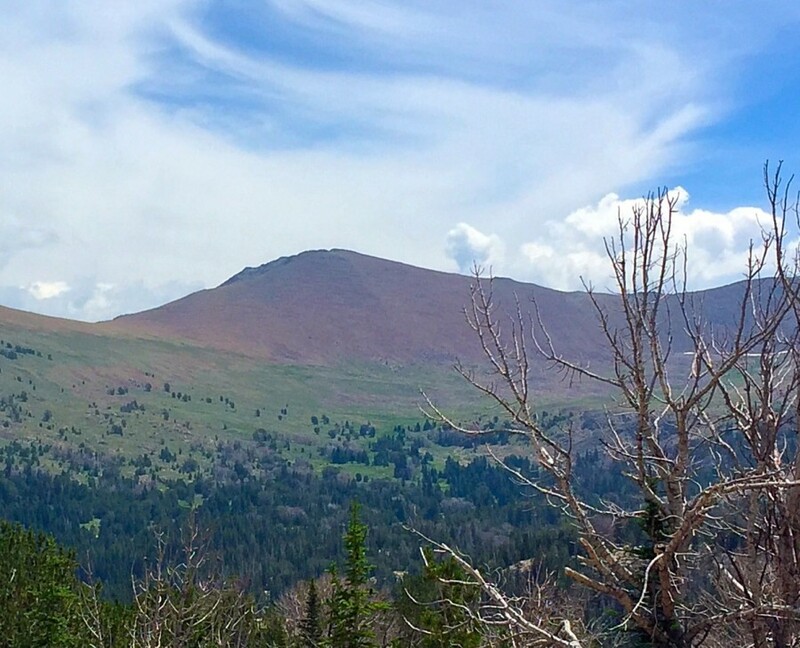 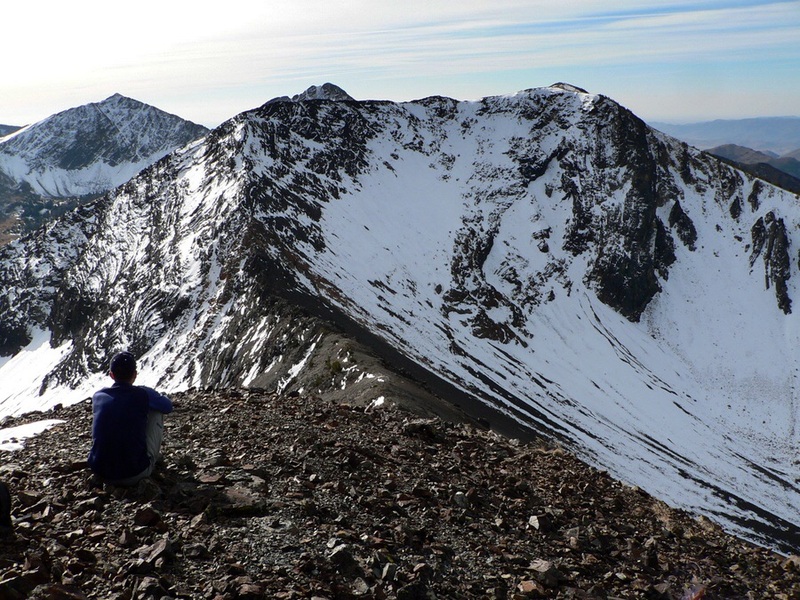 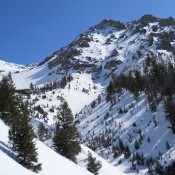 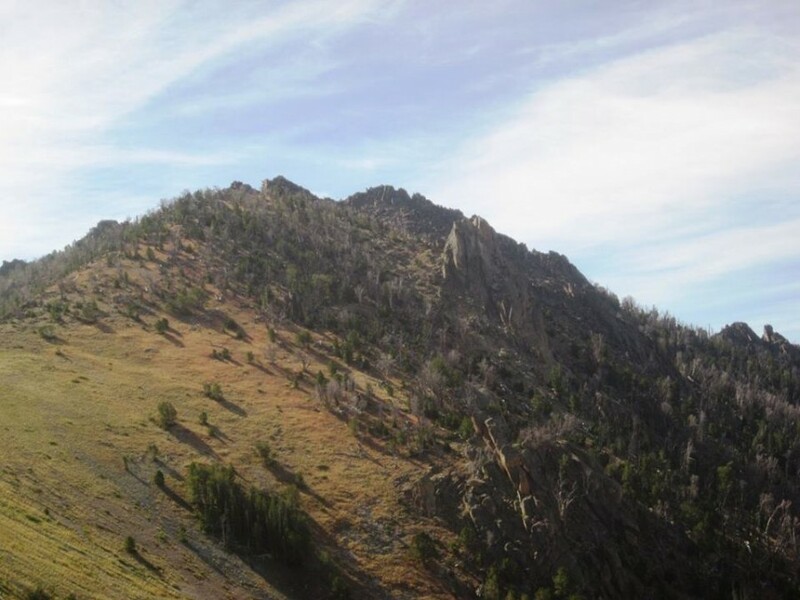 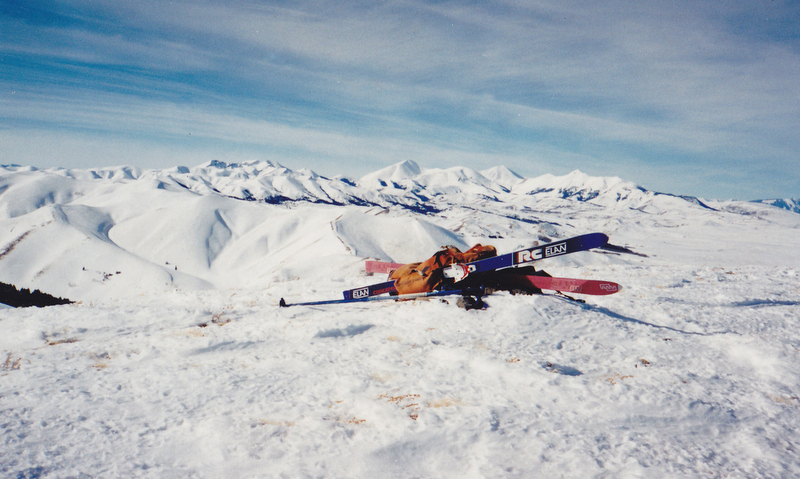 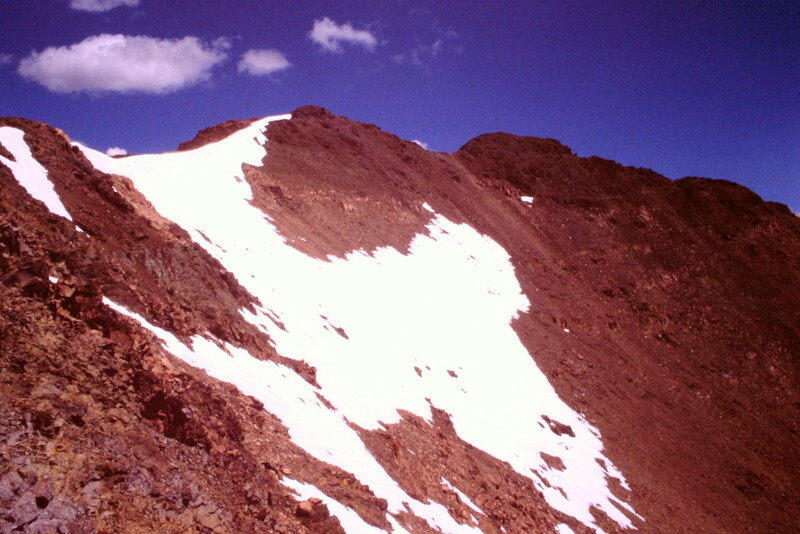 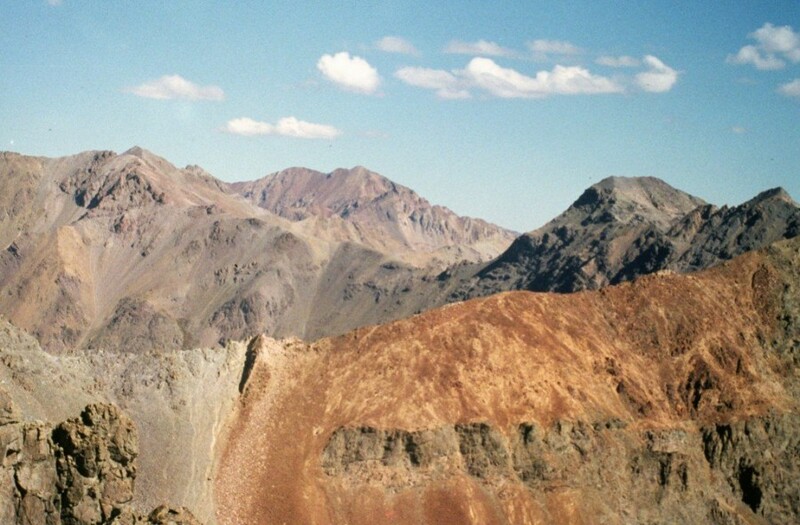 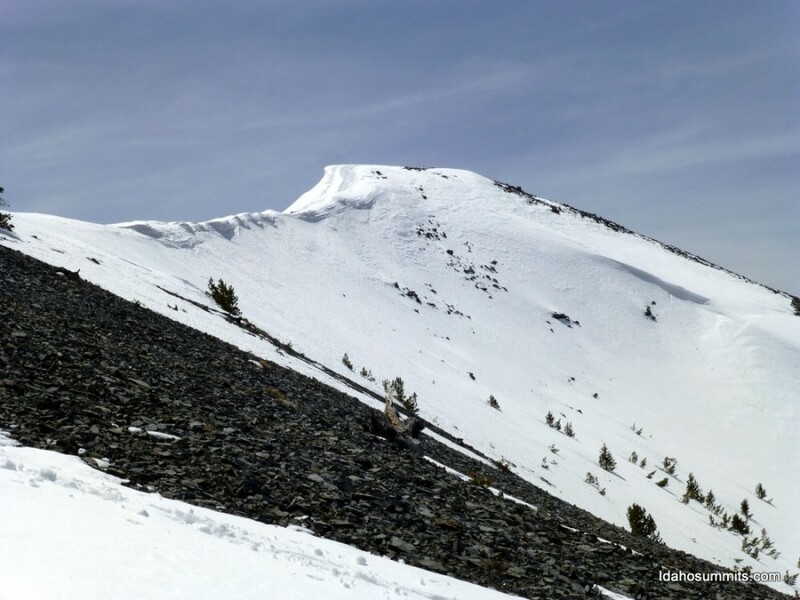 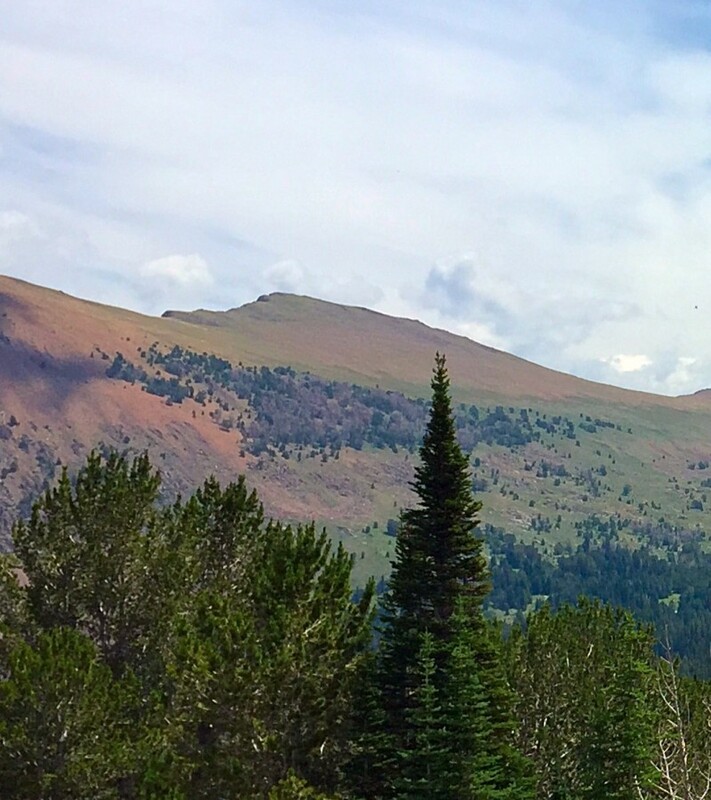 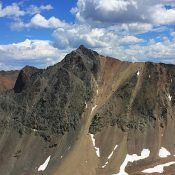 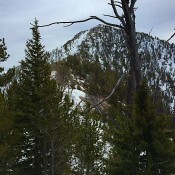 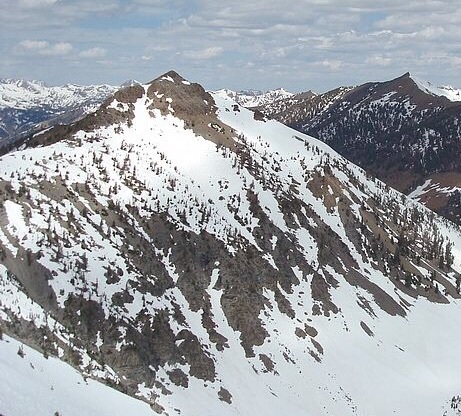 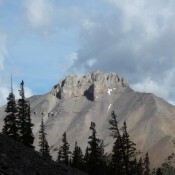 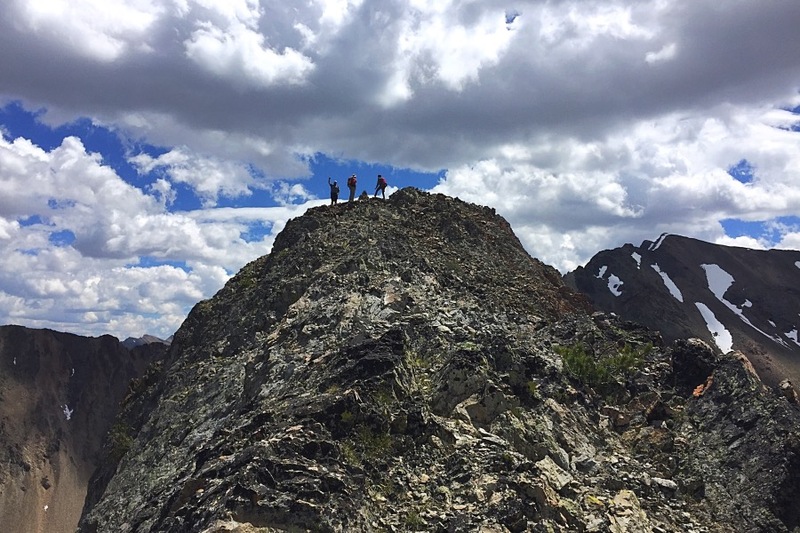 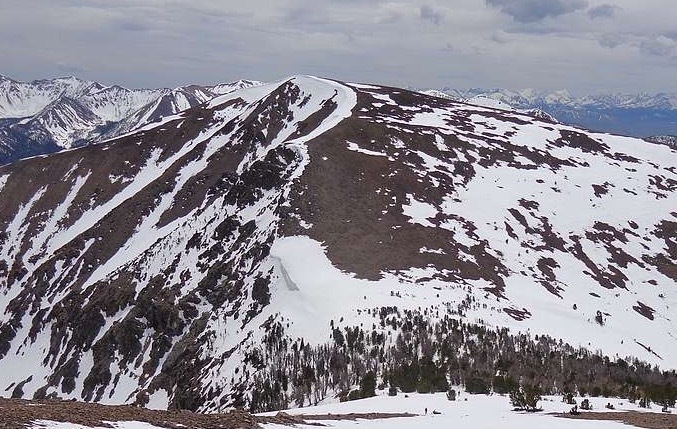 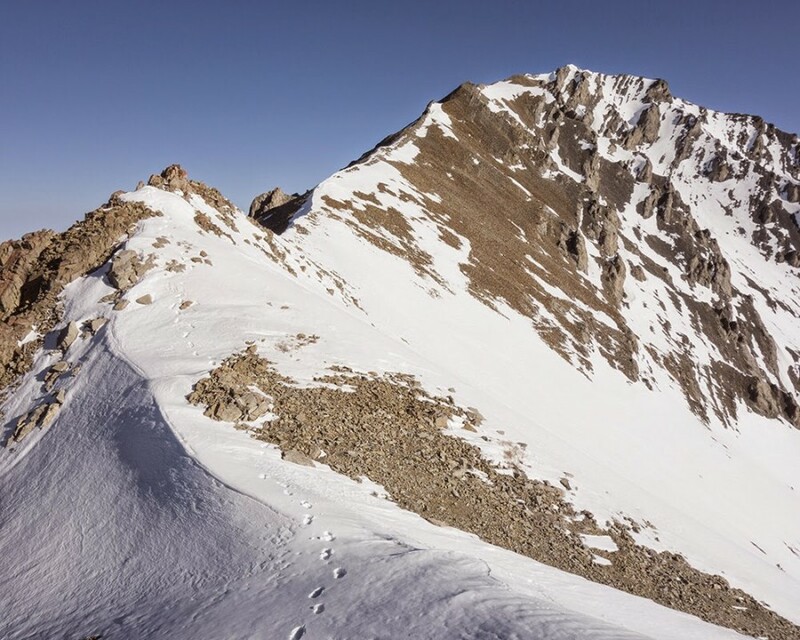 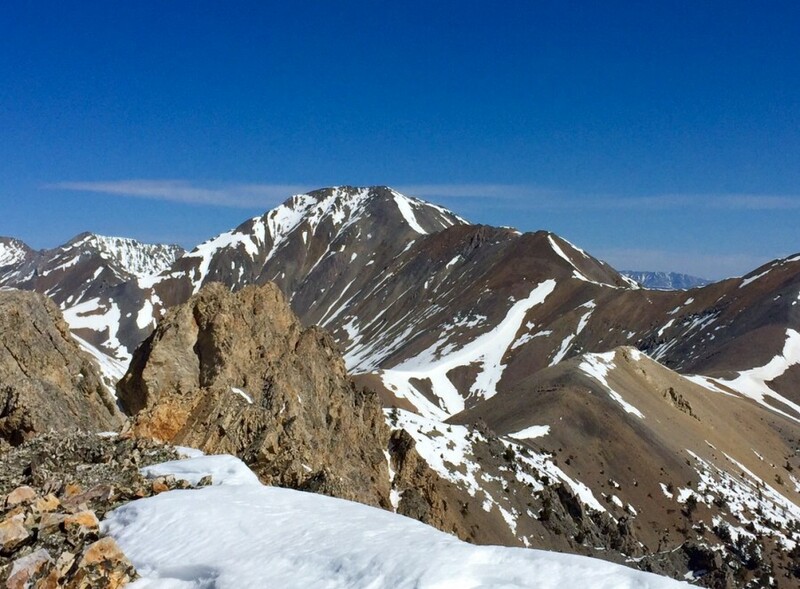 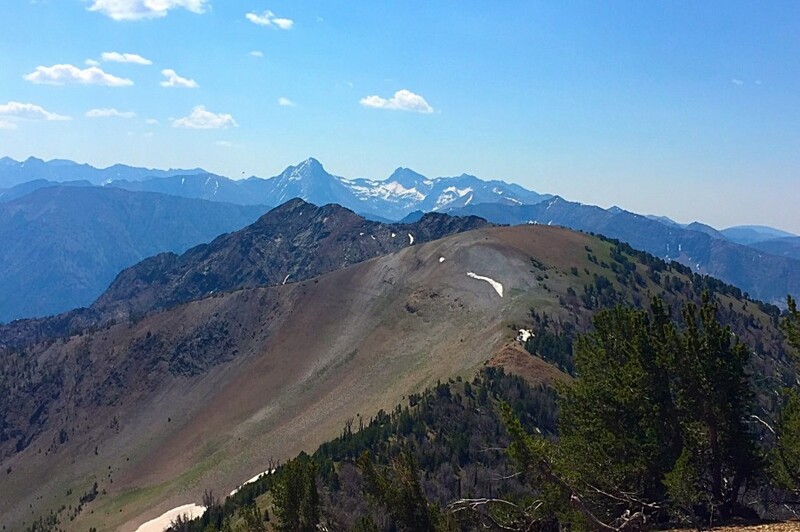 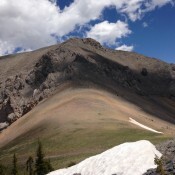 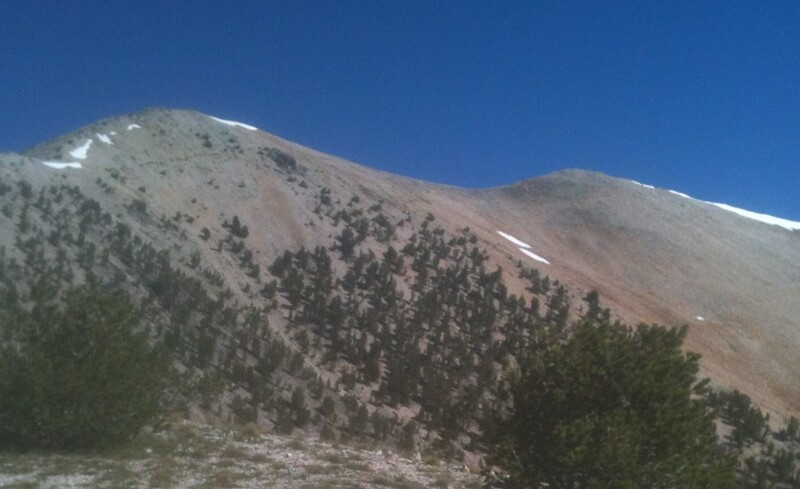 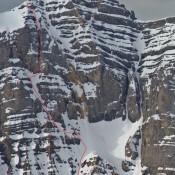 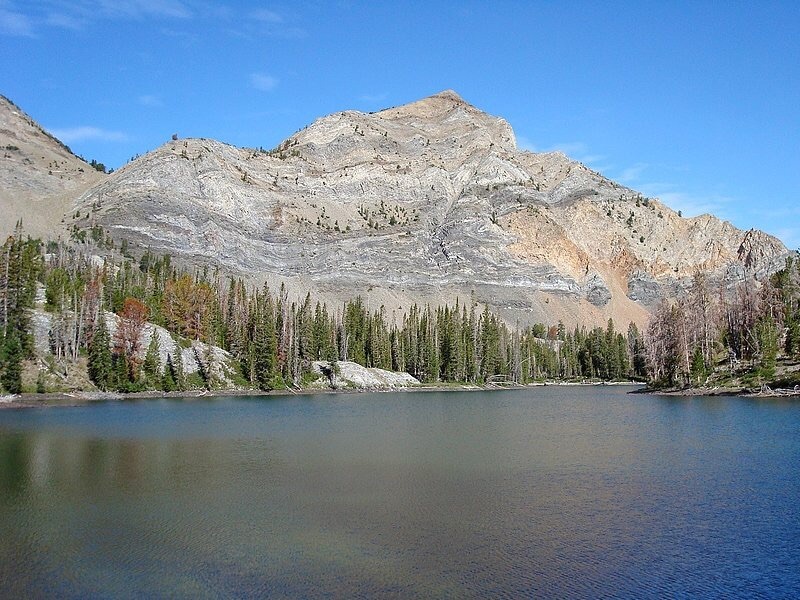 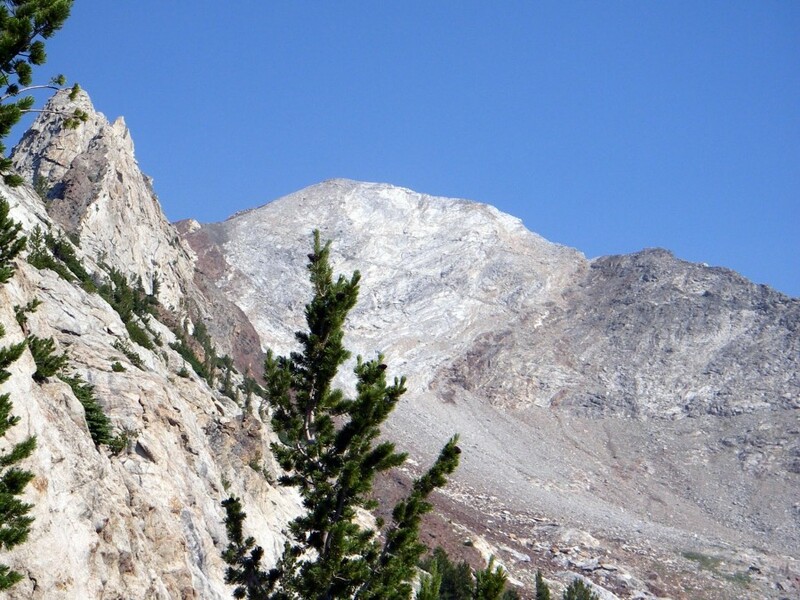 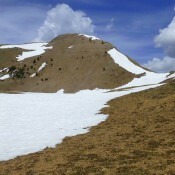 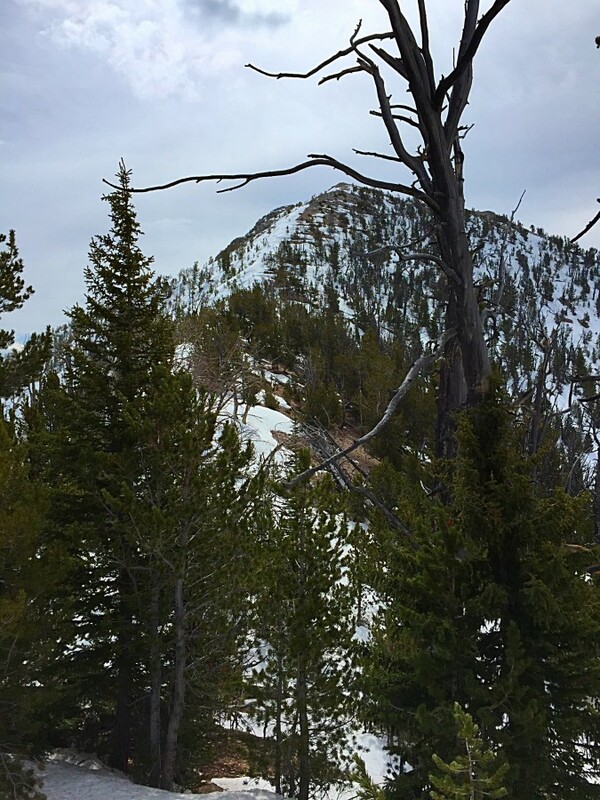 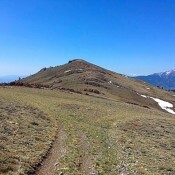 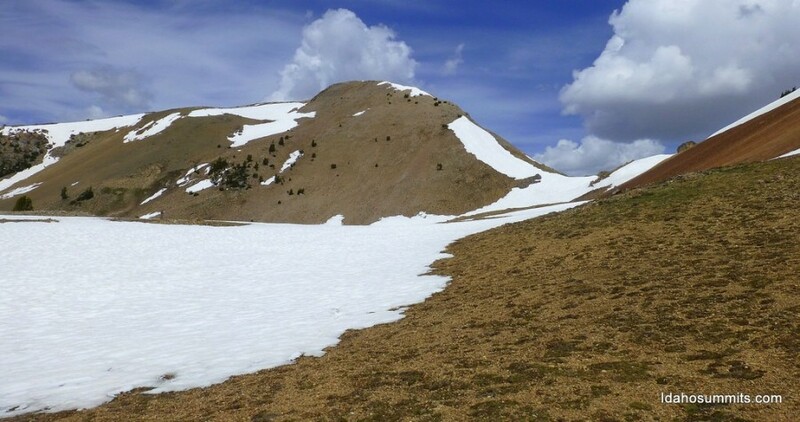 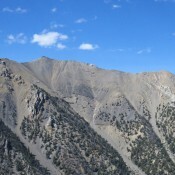 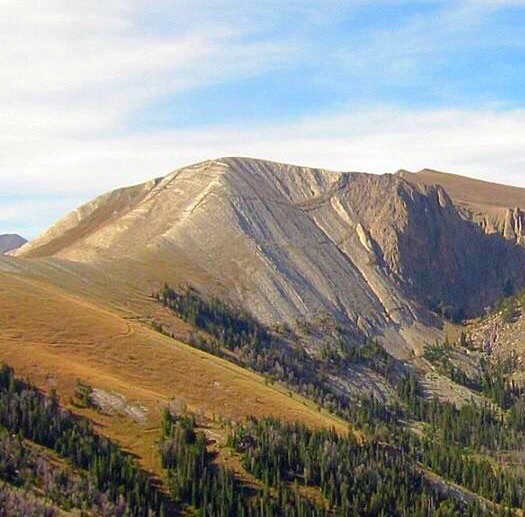 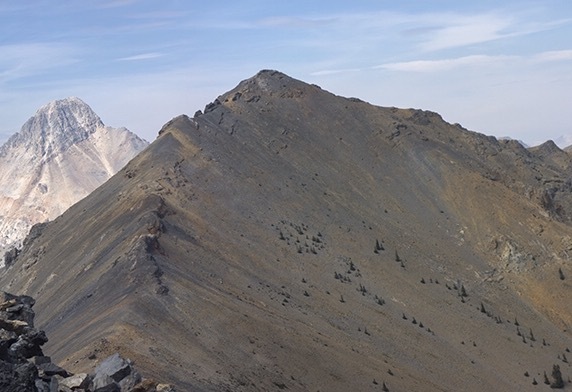 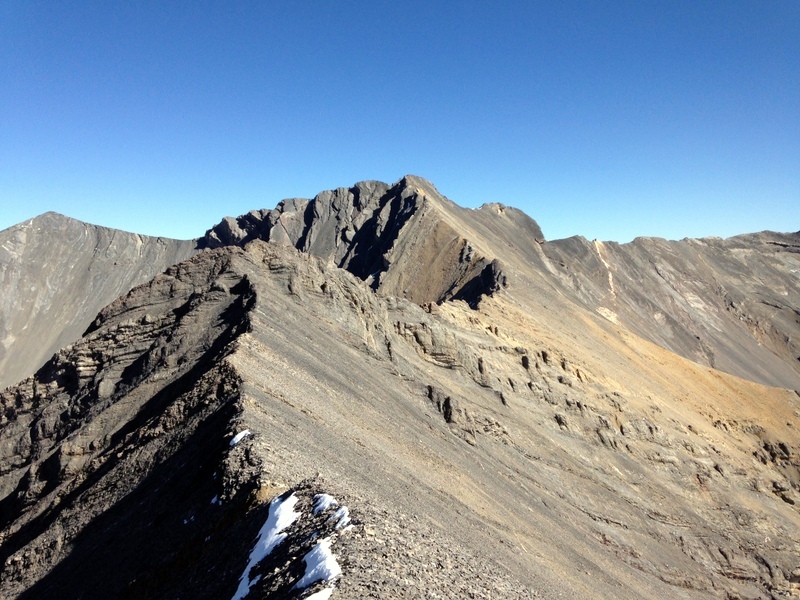 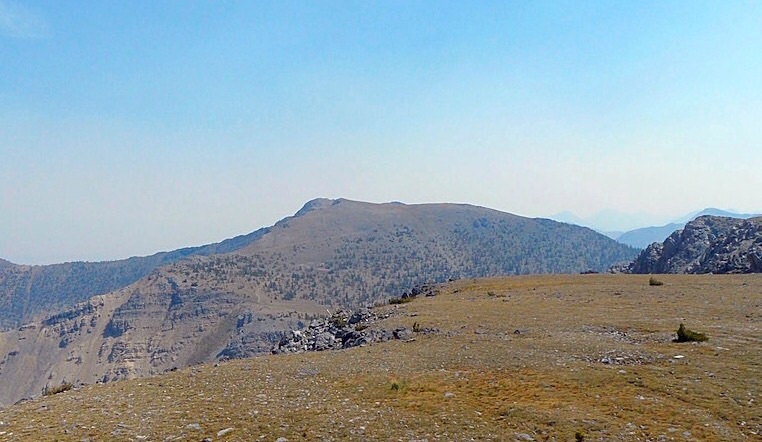 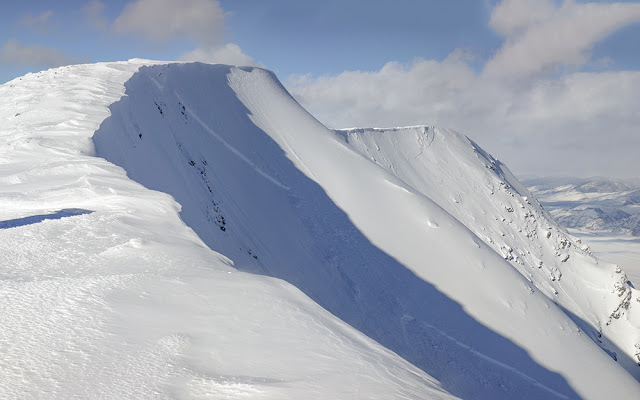 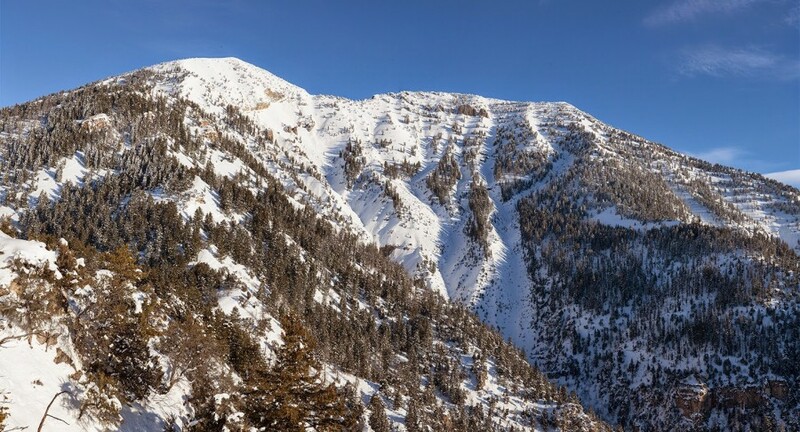 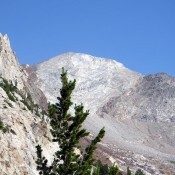 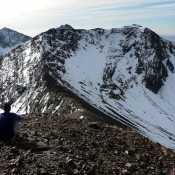 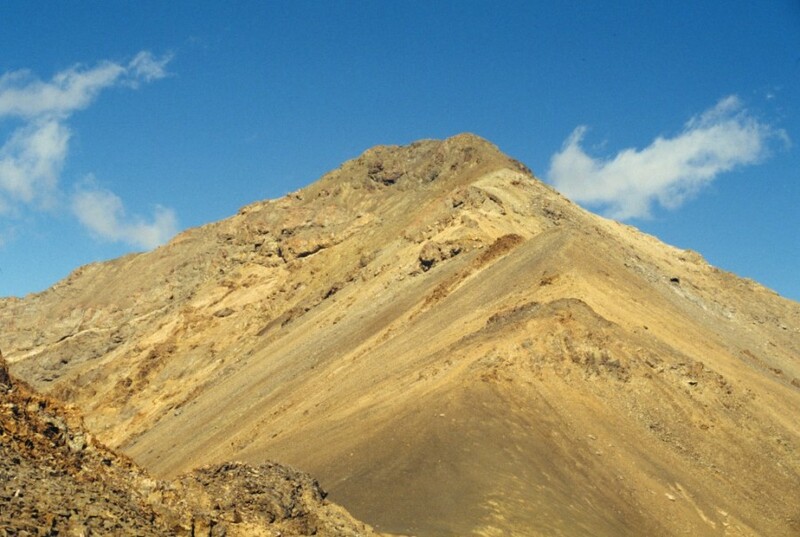 Sunny Bar Peak Lemhi Range 10,512 ft 452 2015 This peak is found on page 310. 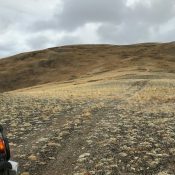 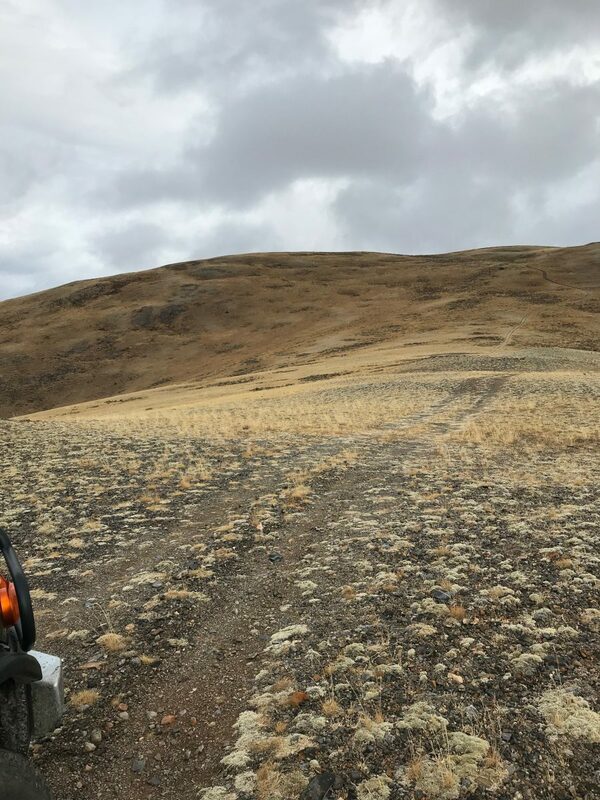 A new route is added below. 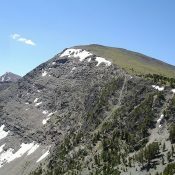 Peak 10507 (Slate Roof Peak) Lemhi Range 10,507 ft 687 Climbing and access information for this peak is found on page 301. 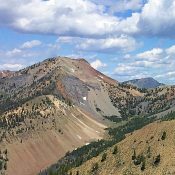 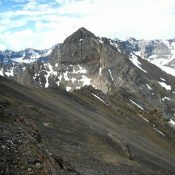 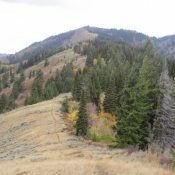 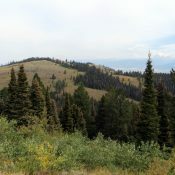 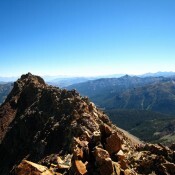 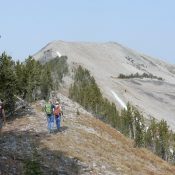 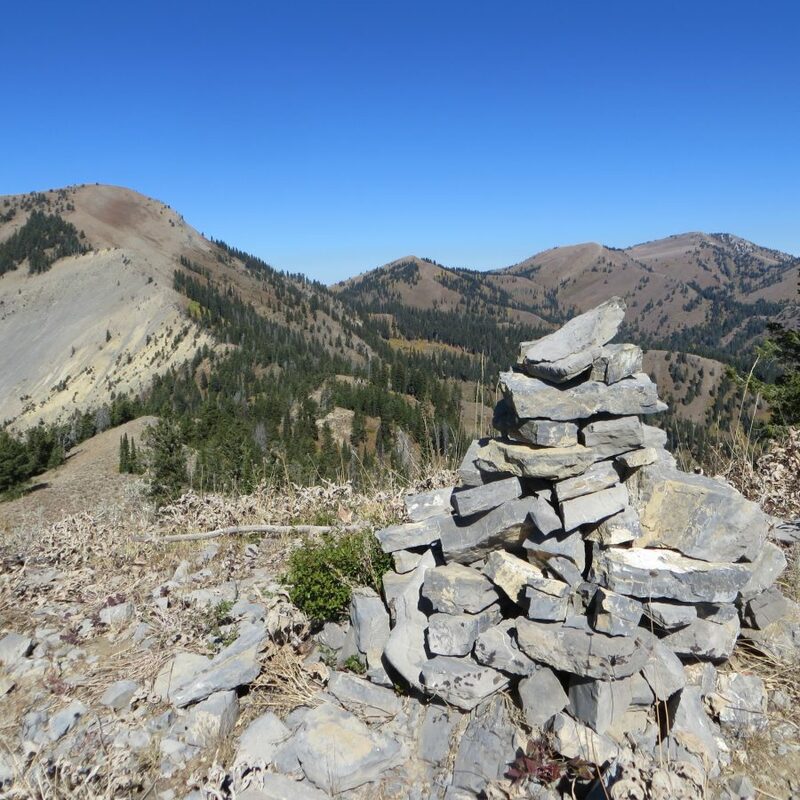 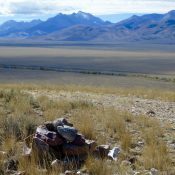 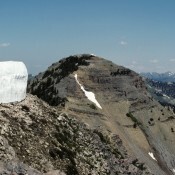 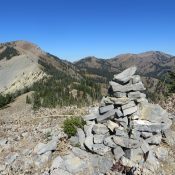 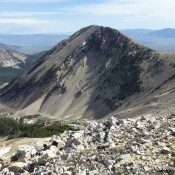 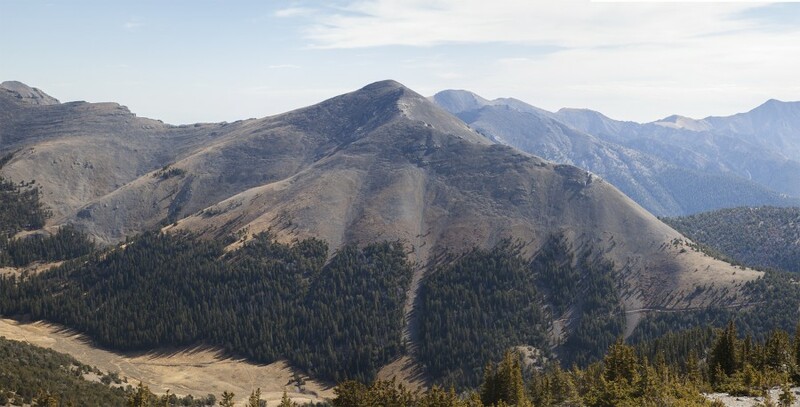 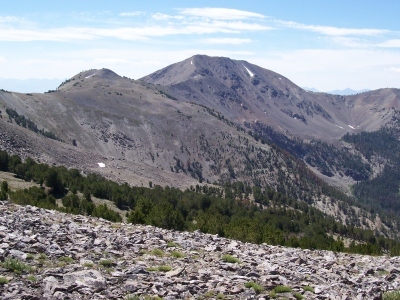 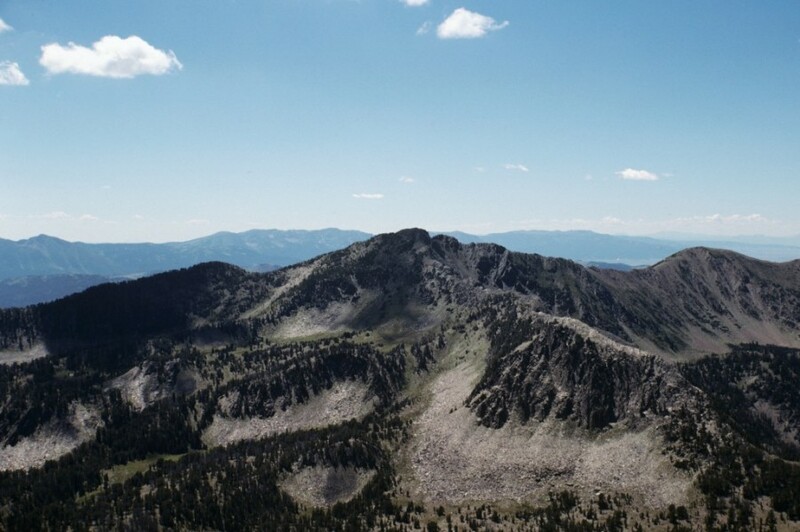 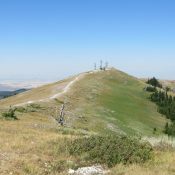 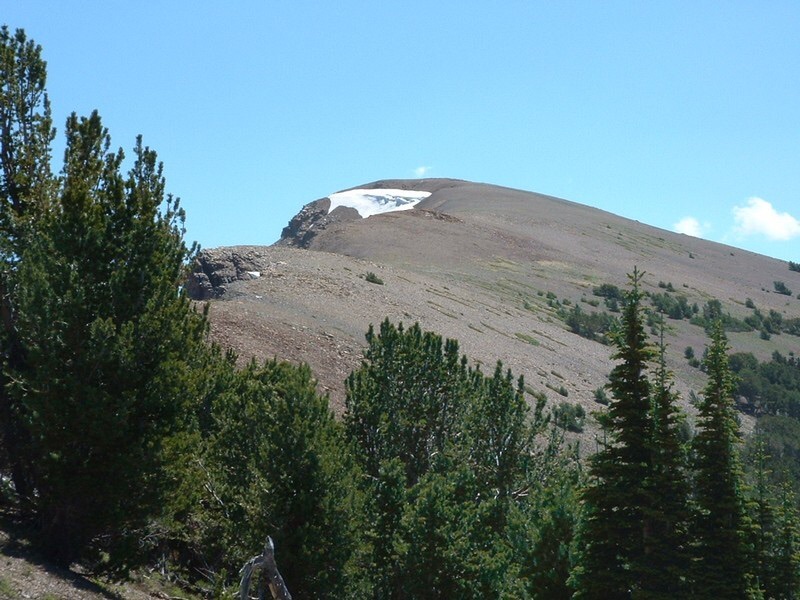 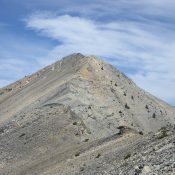 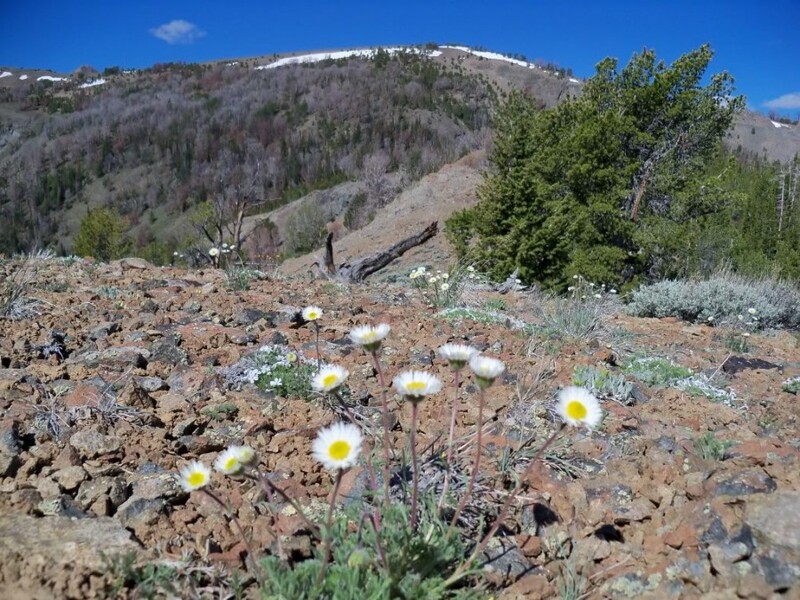 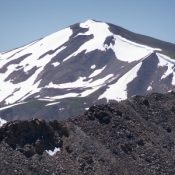 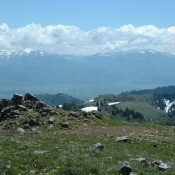 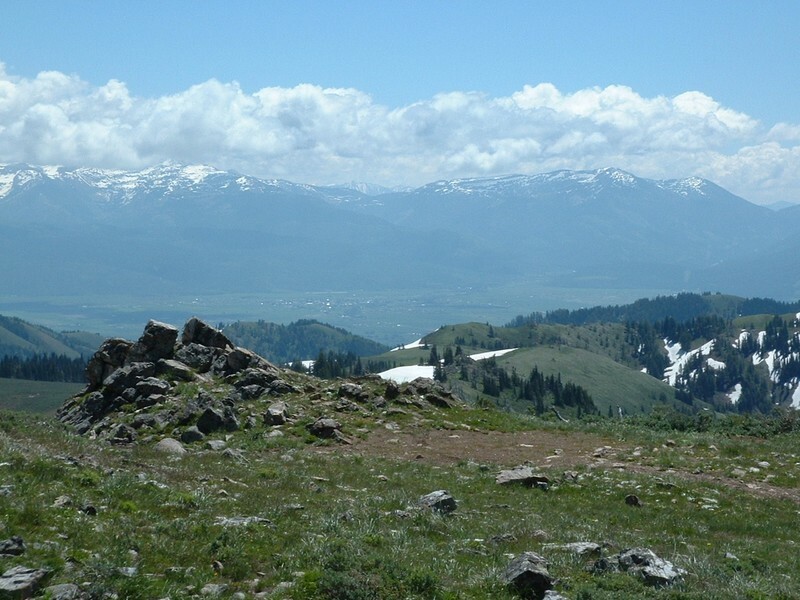 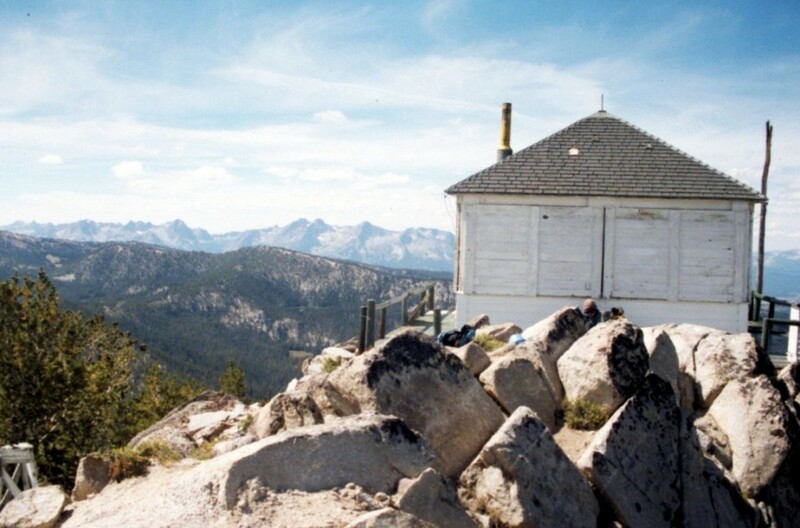 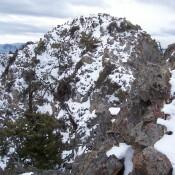 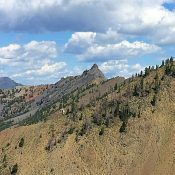 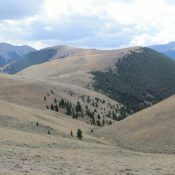 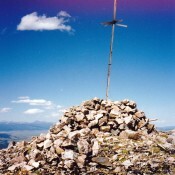 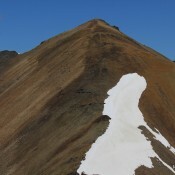 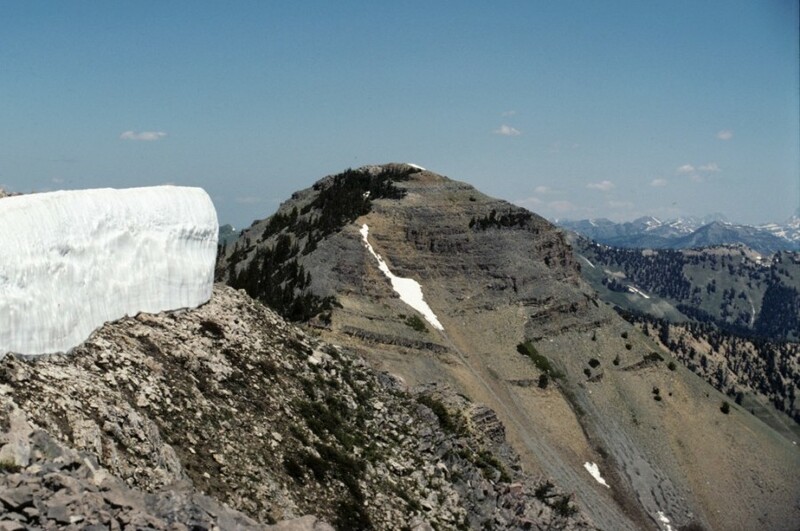 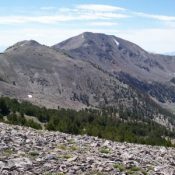 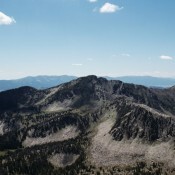 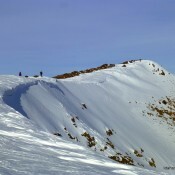 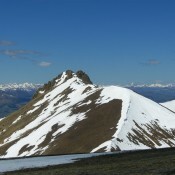 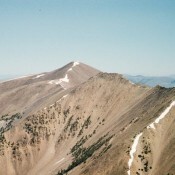 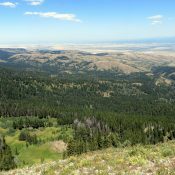 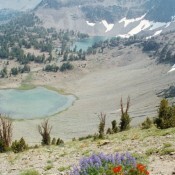 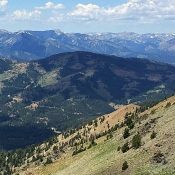 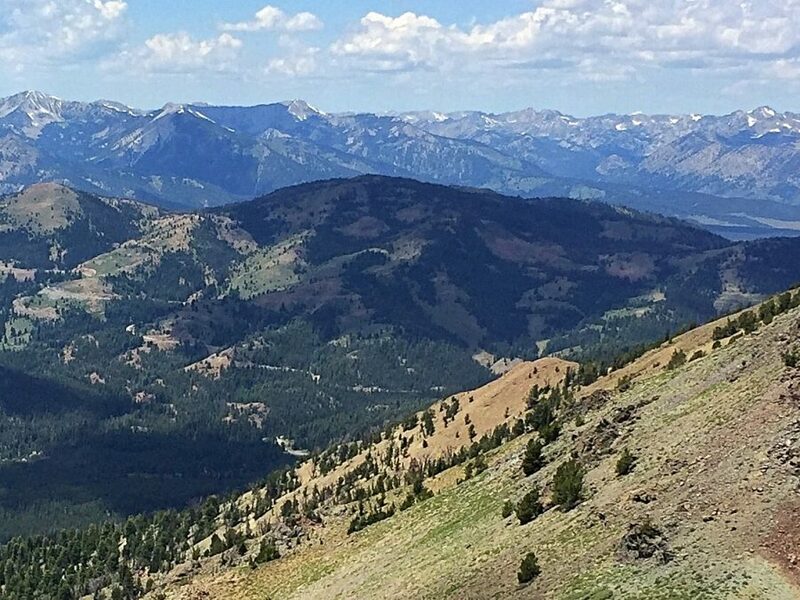 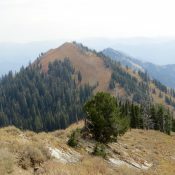 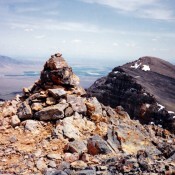 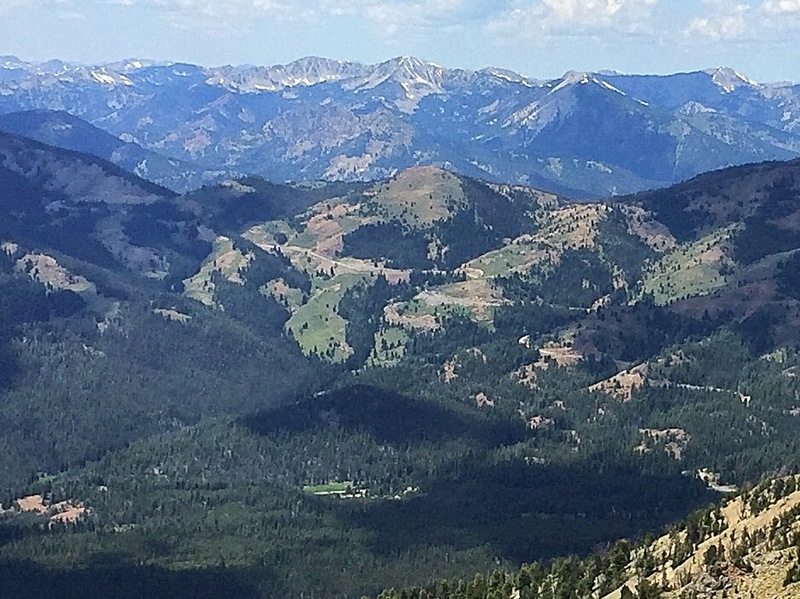 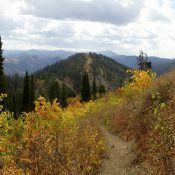 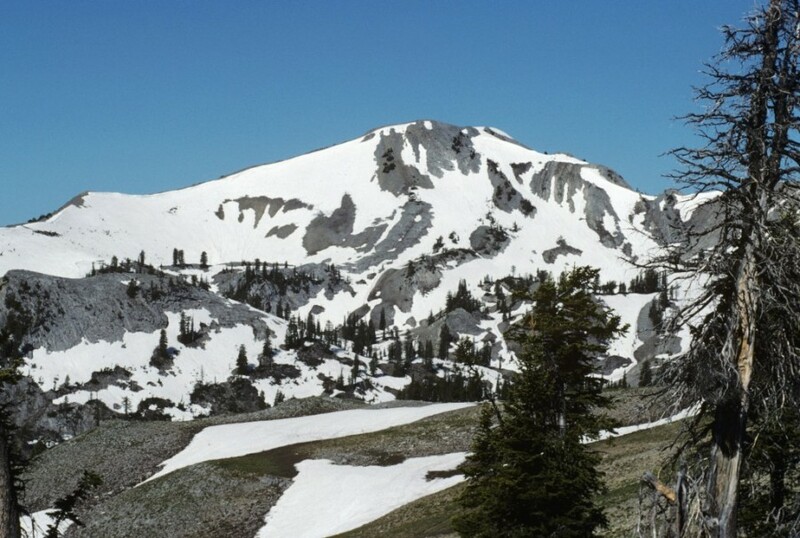 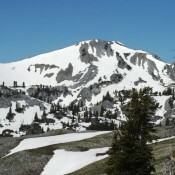 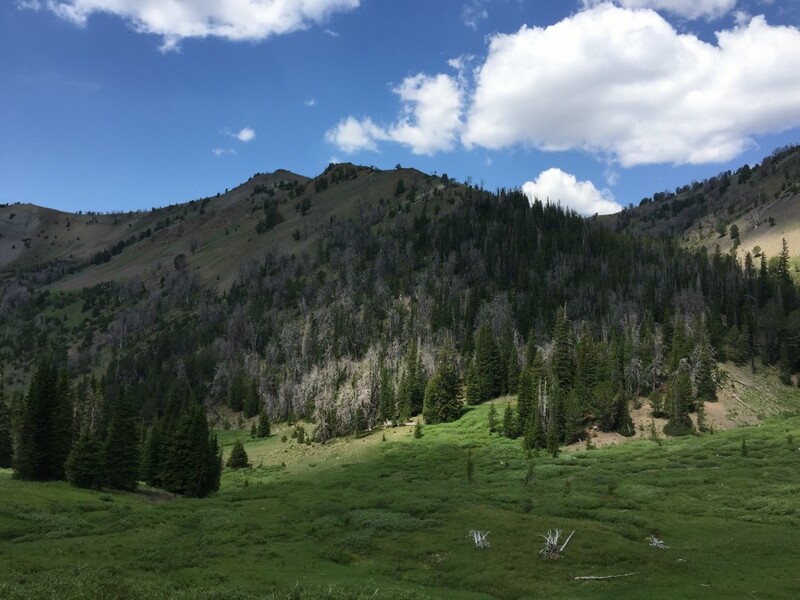 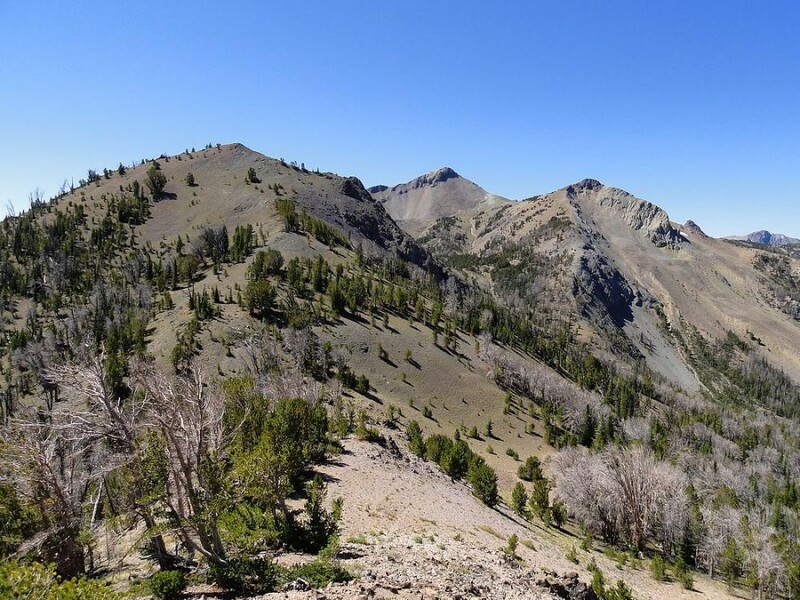 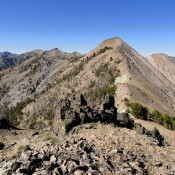 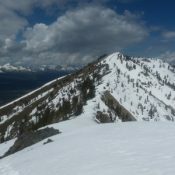 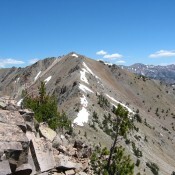 White Bird Peak Lemhi Range 10,502 ft 882 Climbing and access information for White Bird Peak is found on page 310. 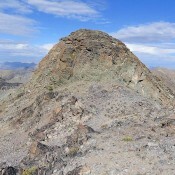 South Star Hope Peak Pioneer Mountains 10,493 ft This peak is not in the book. 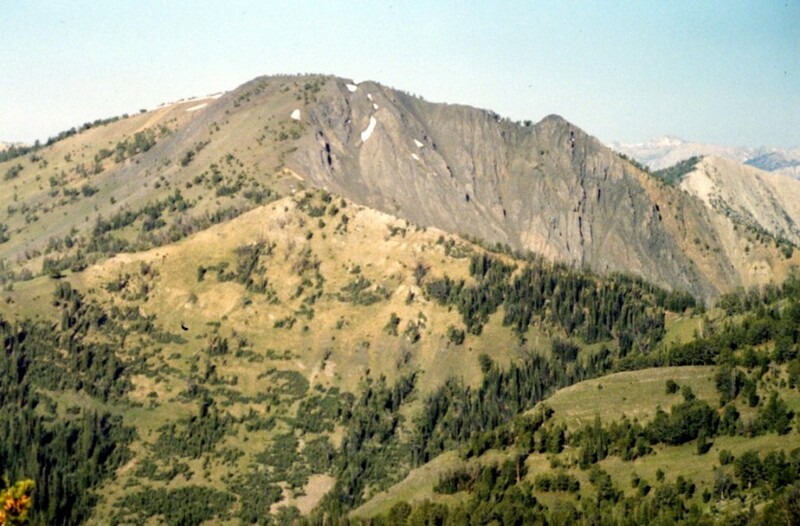 Knoll, the Lemhi Range 10,490 ft 550 2005 Climbing information for this peak is found on page 305. 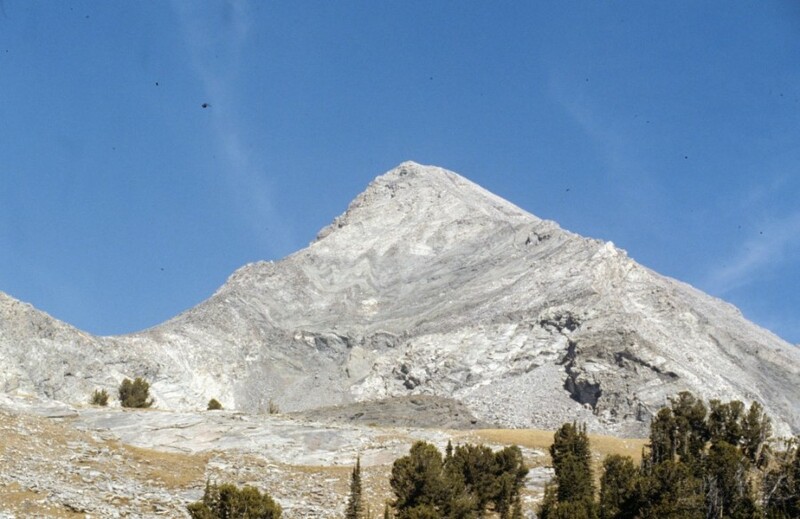 Peak 10482 Lemhi Range 10,482 ft 366 This peak is not in the book. 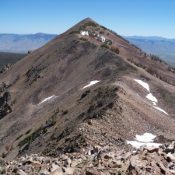 Peak 10475 (Dome Peak) Lemhi Range 10,475 ft 495 Climbing and access information for this peak is found on pages 310 and 311. 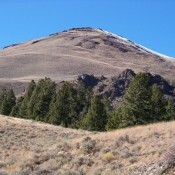 Peak 10470 (Little Mill Mountain) Lemhi Range 10,470 ft 370 This peak is not in the book. 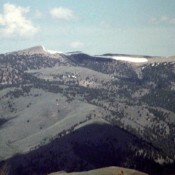 Peak 10456 (Little Lem Peak) Lemhi Range 10,456 ft 356 Climbing and access information for this peak is discussed on page 296 of the book. 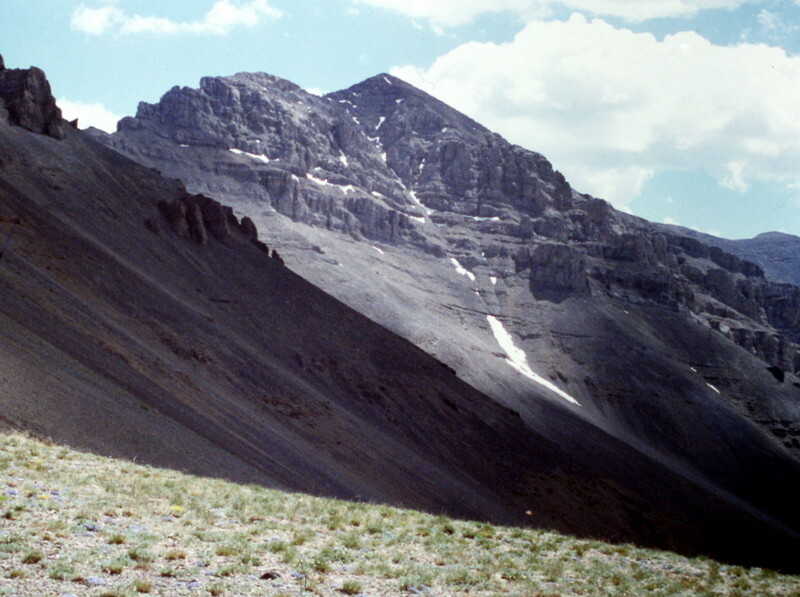 Peak 10450 Lemhi Range 10,450 ft 350 This peak is not in the book. 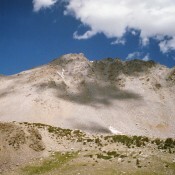 Peak 10439 Lost River Range 10,439 ft 499 This peak is not in the book. 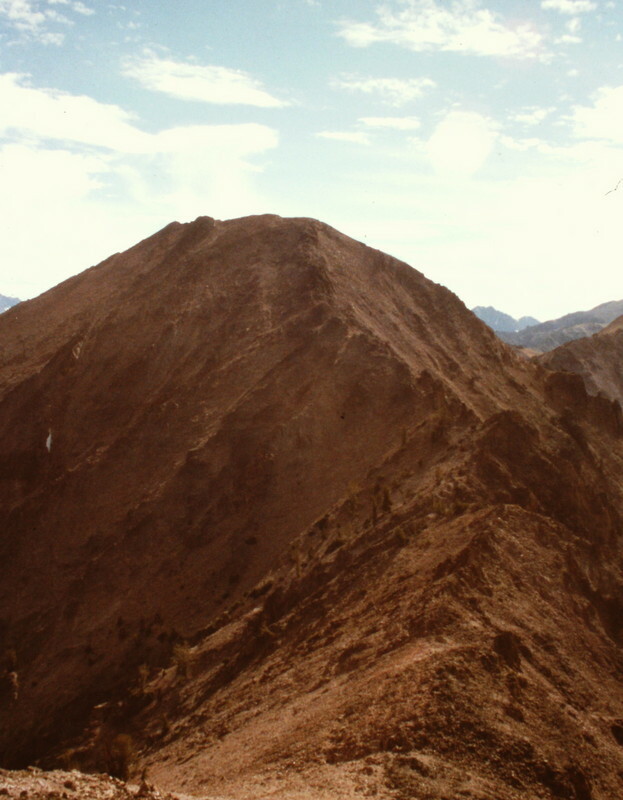 Peak 10420 (Coco Peak) Pioneer Mountains 10,420 ft This peak is not in the book. 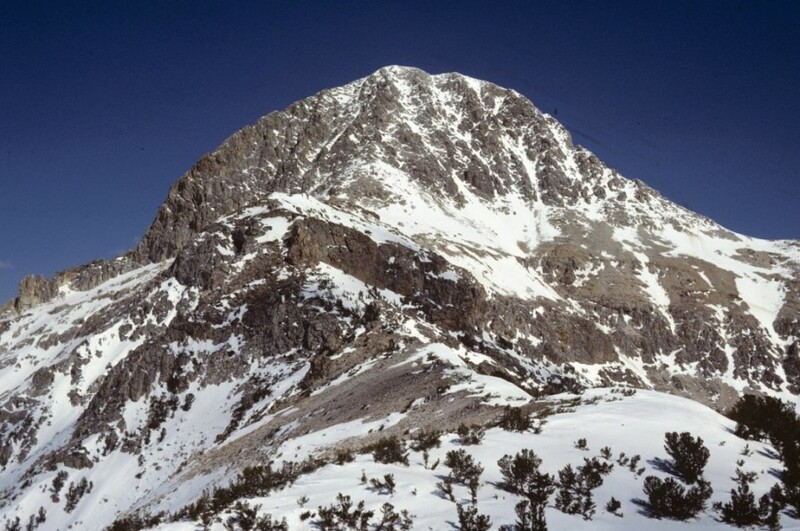 Peak 10420 Lost River Range 10,420 ft 760 Climbing and access information for this peak is found on page 269. 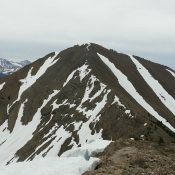 Peak 10419 (Wilson Creek Peak) Pioneer Mountains 10,419 ft This peak is not in the book. 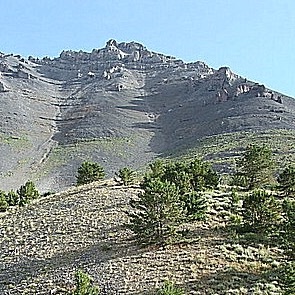 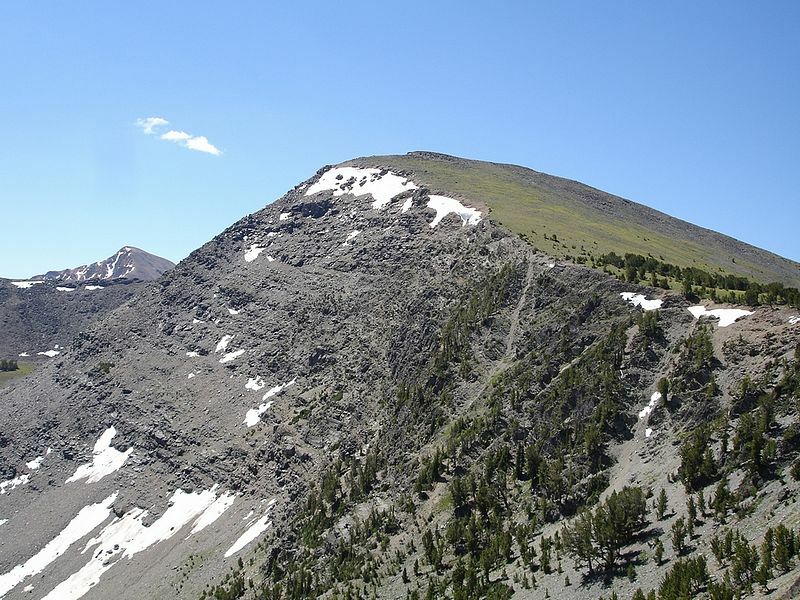 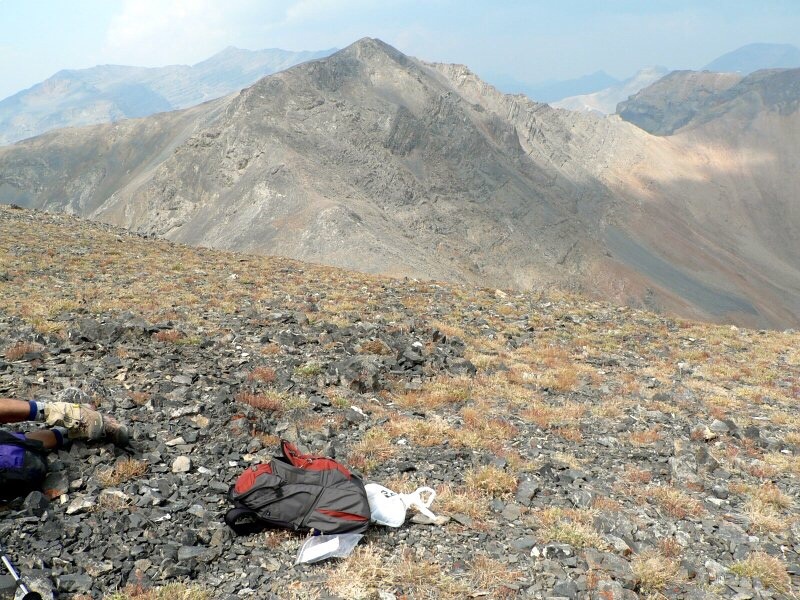 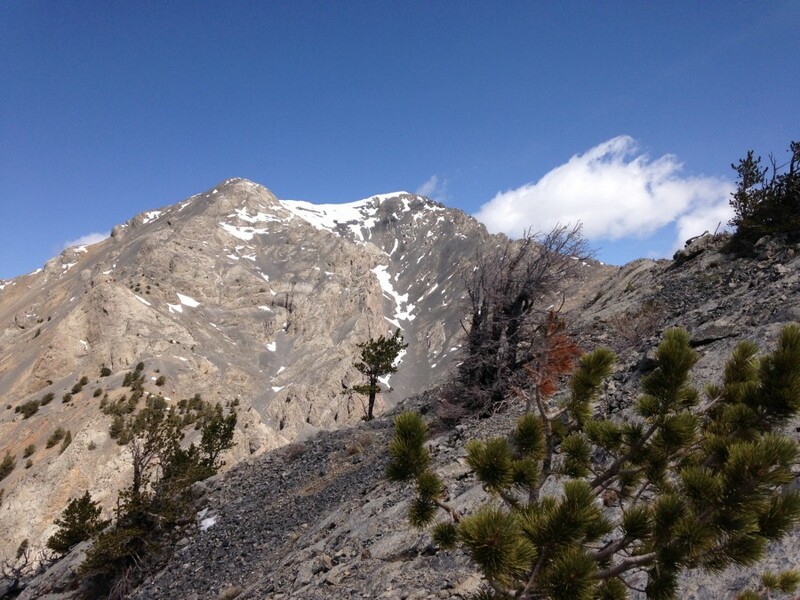 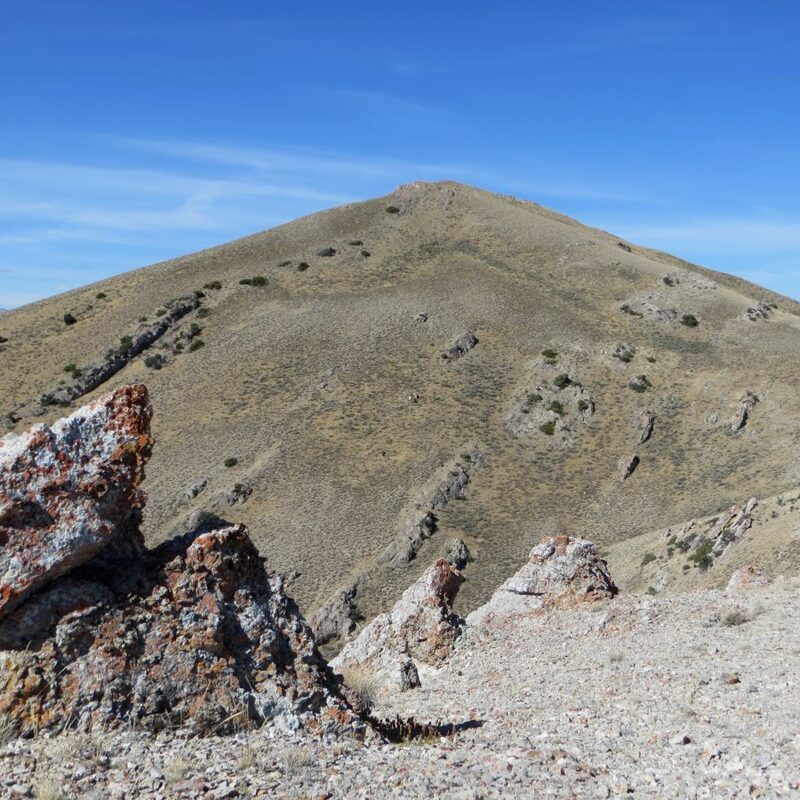 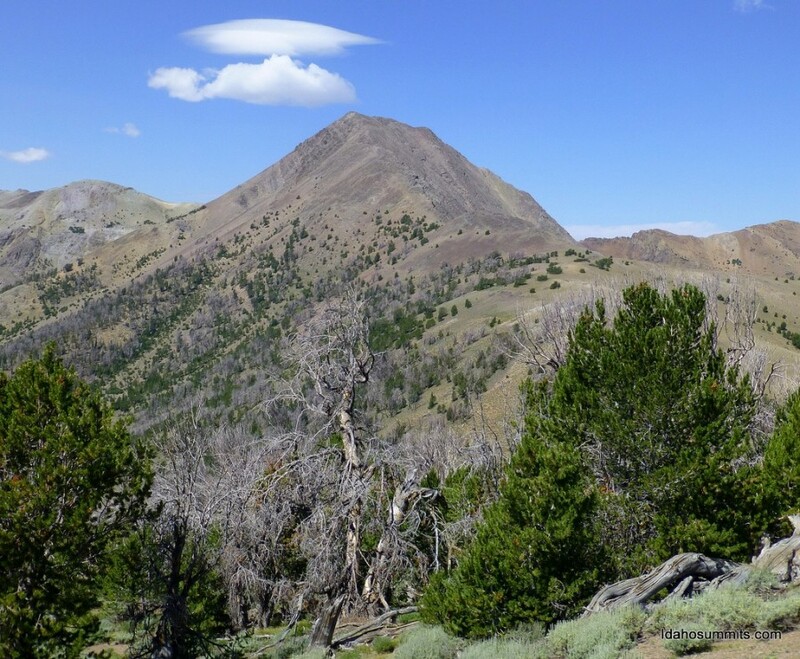 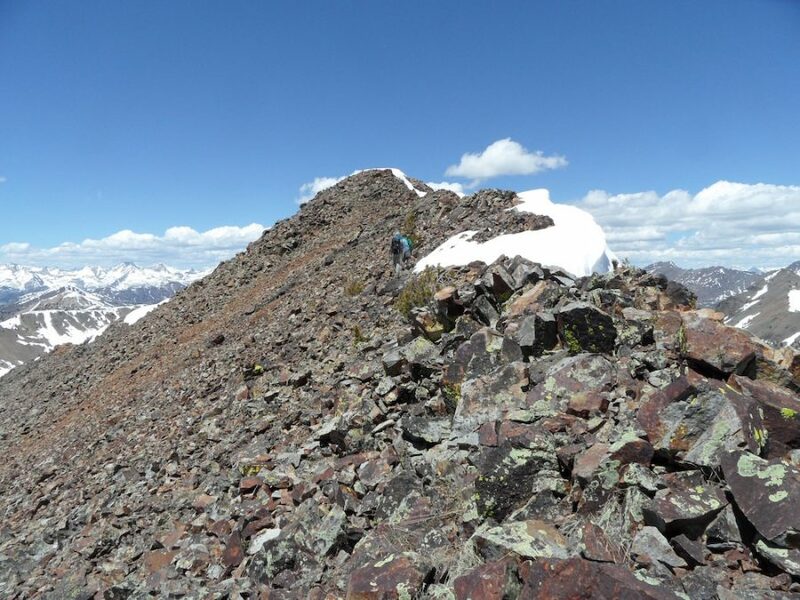 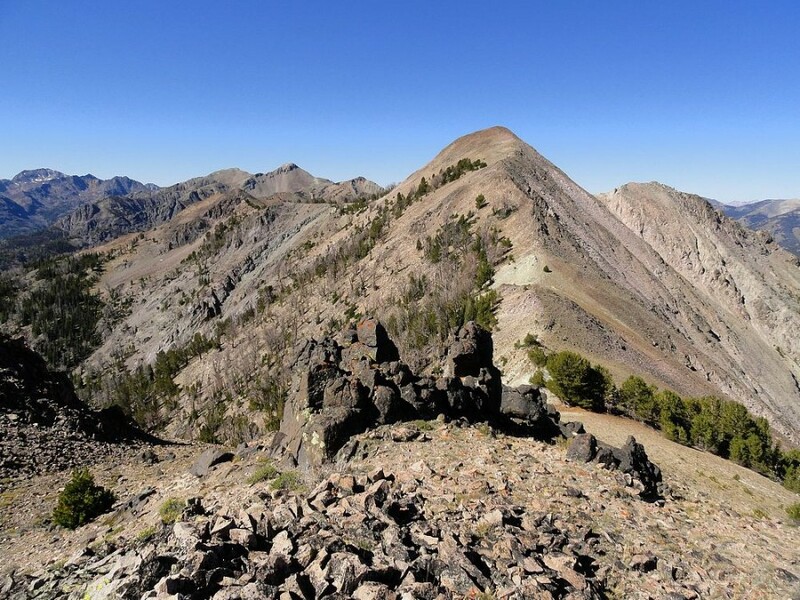 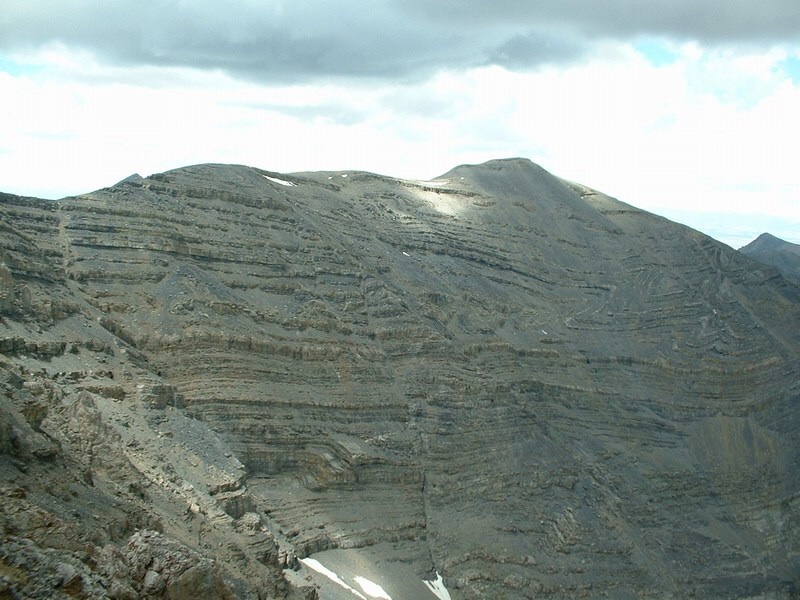 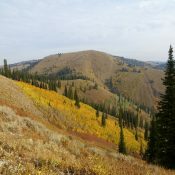 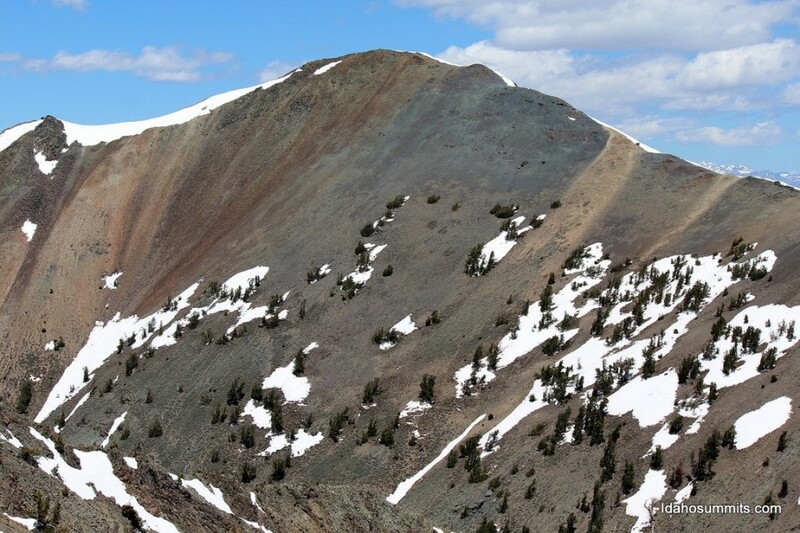 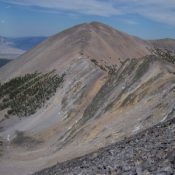 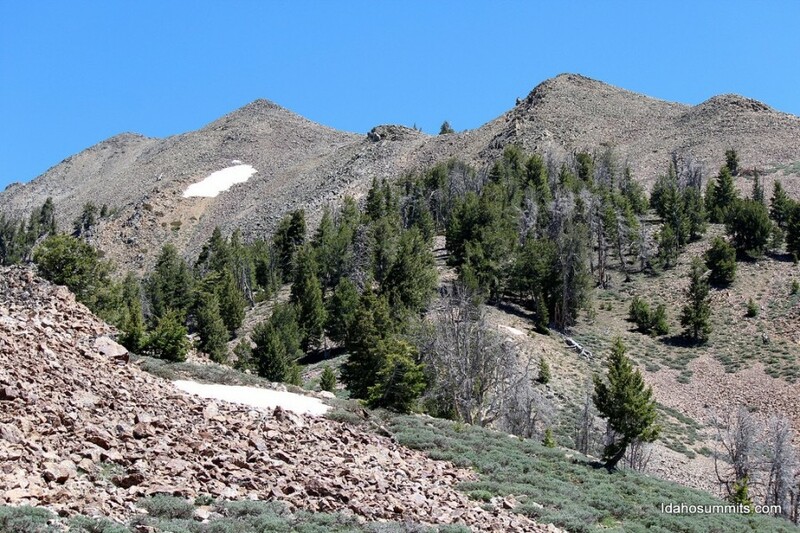 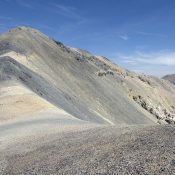 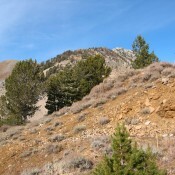 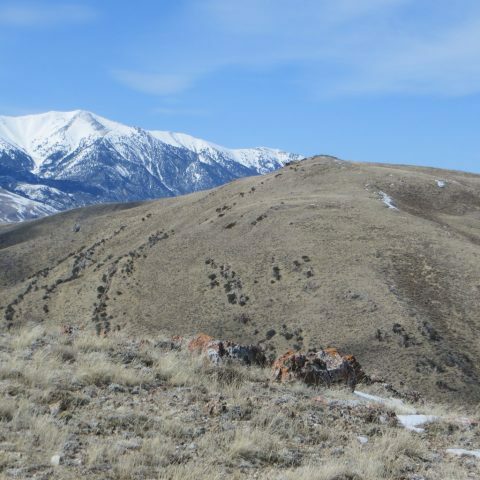 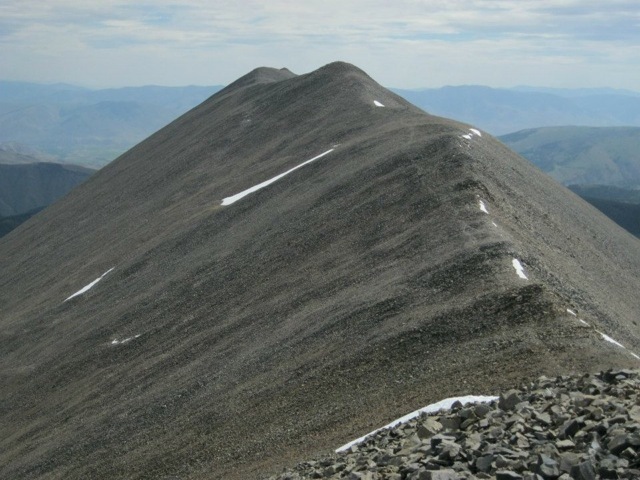 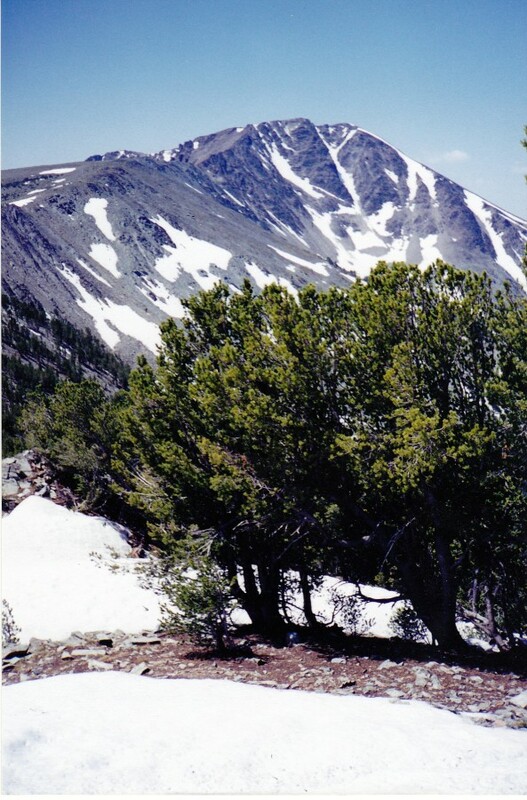 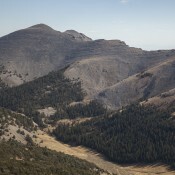 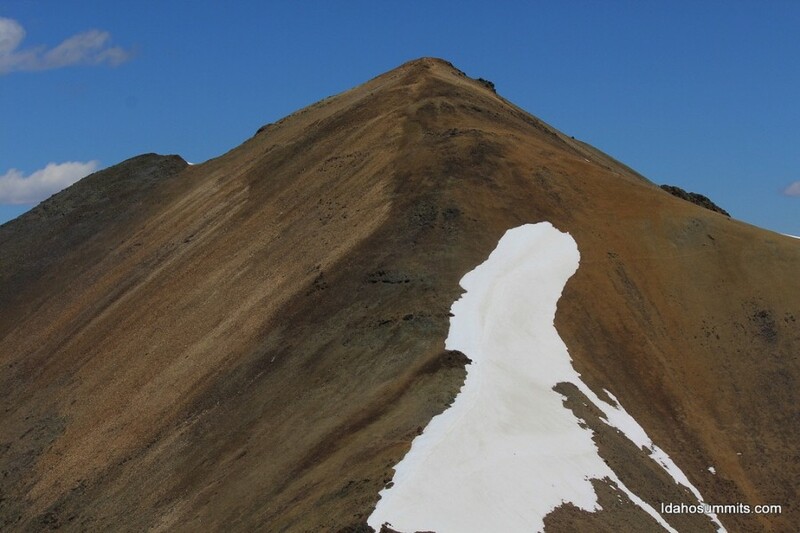 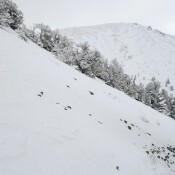 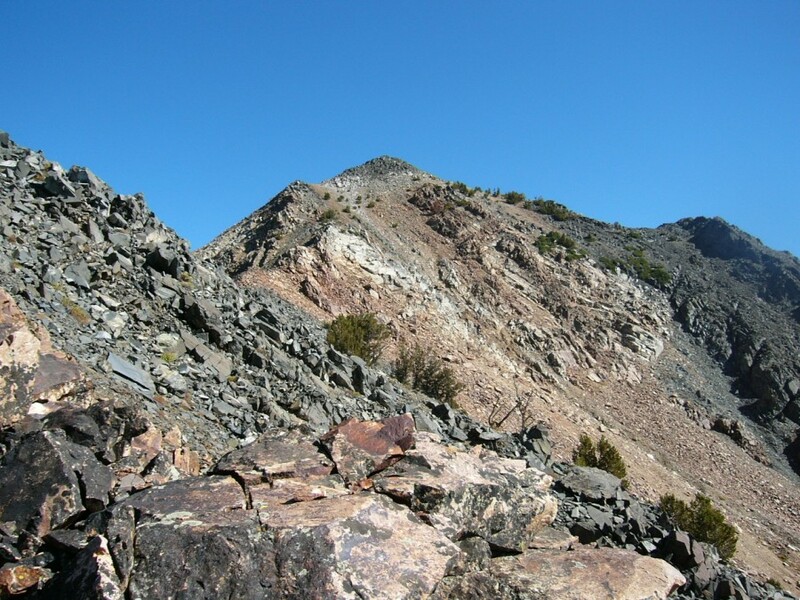 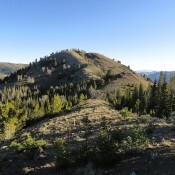 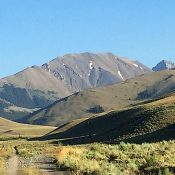 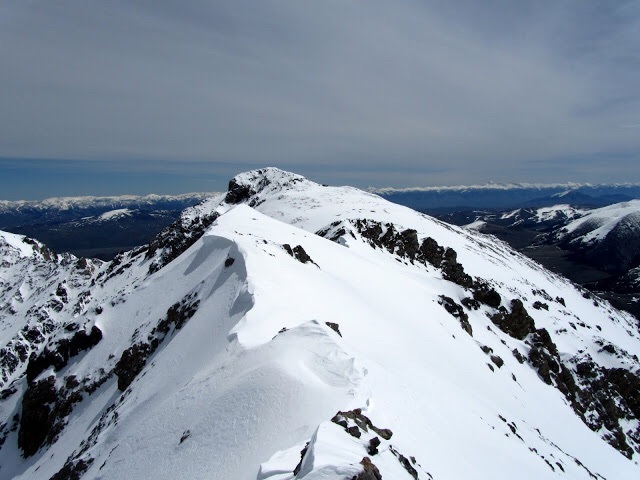 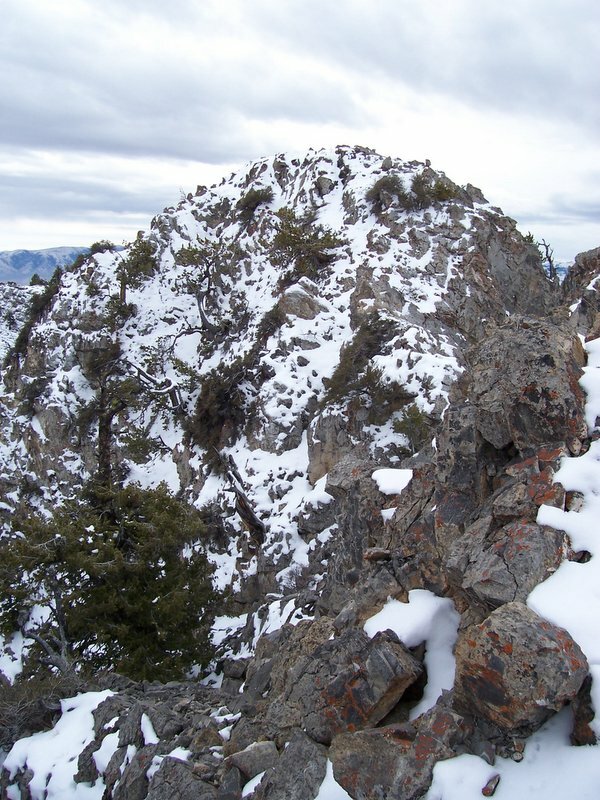 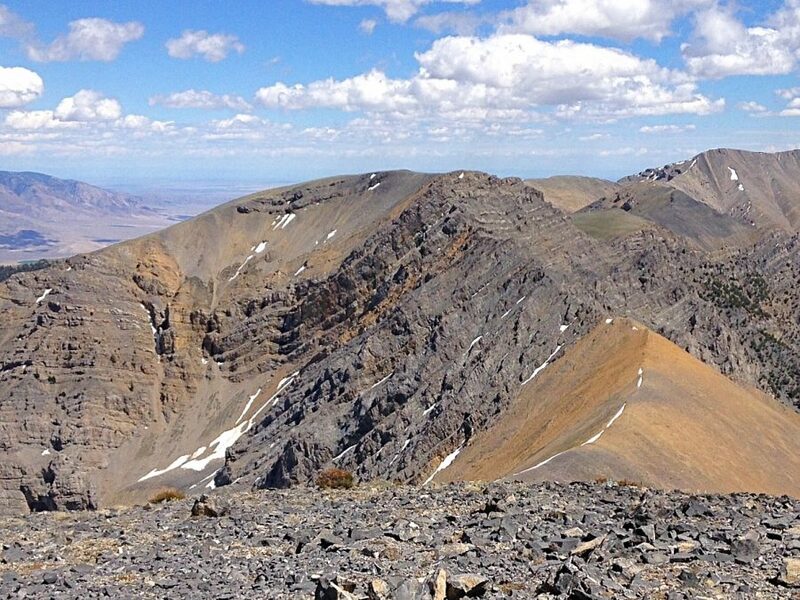 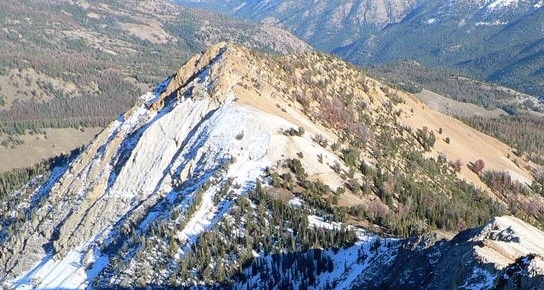 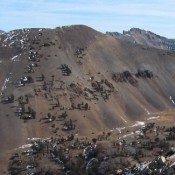 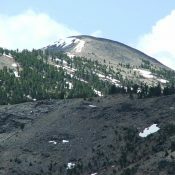 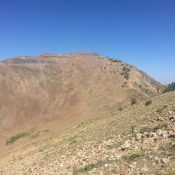 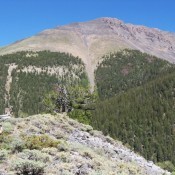 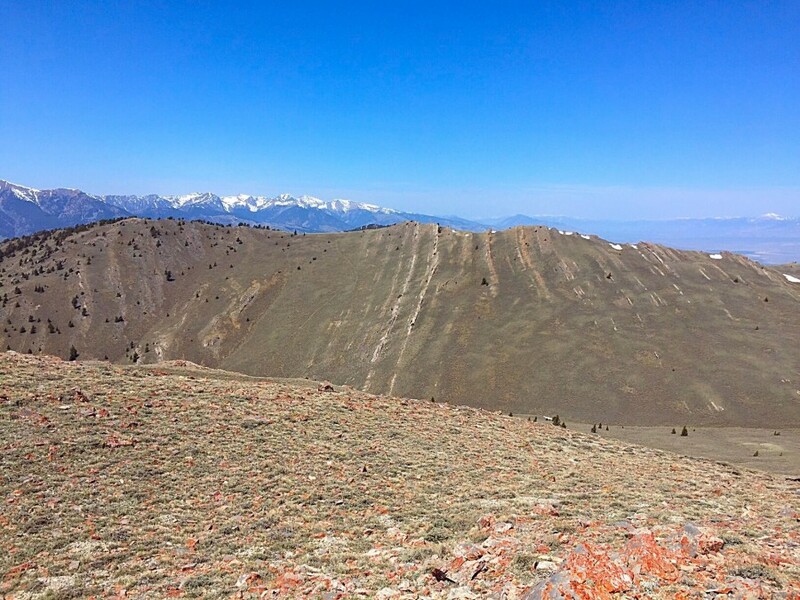 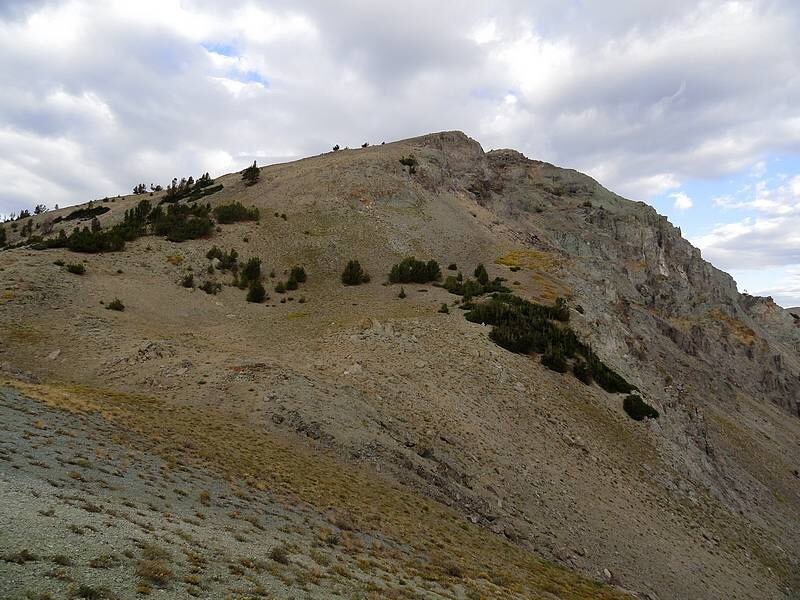 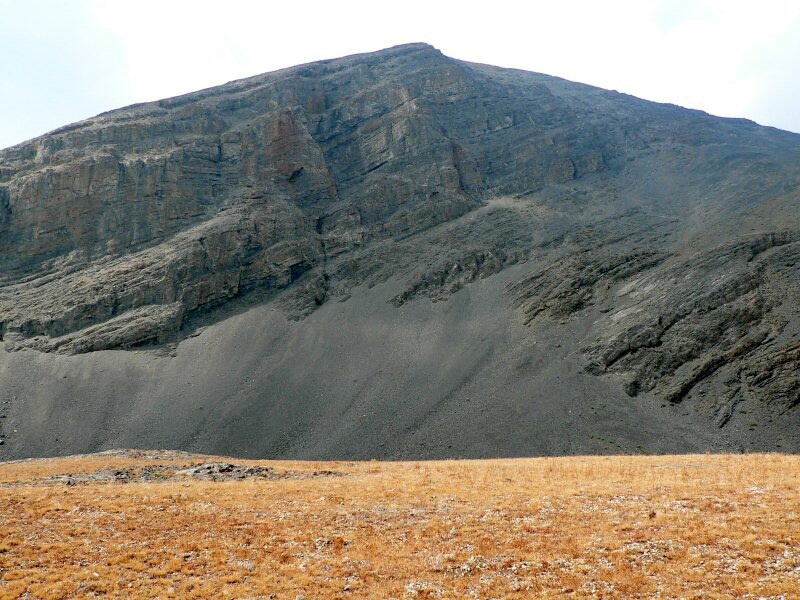 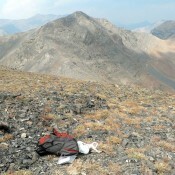 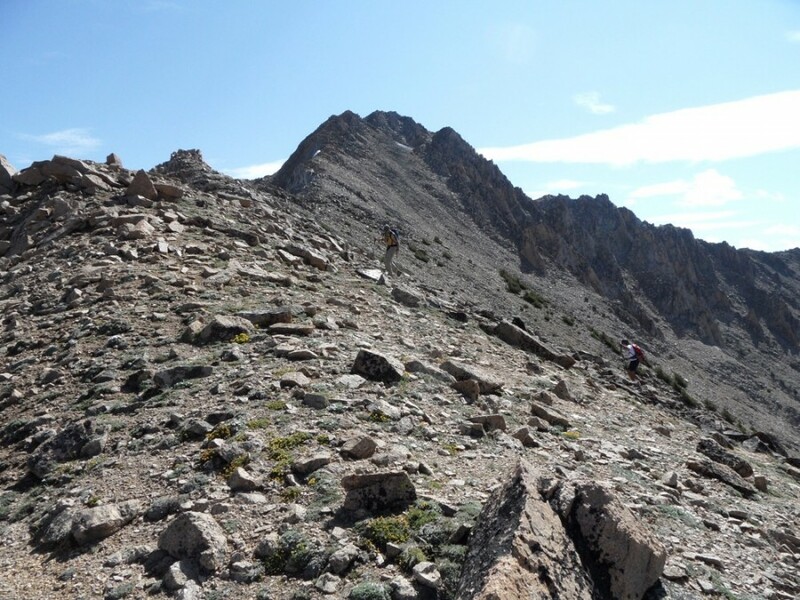 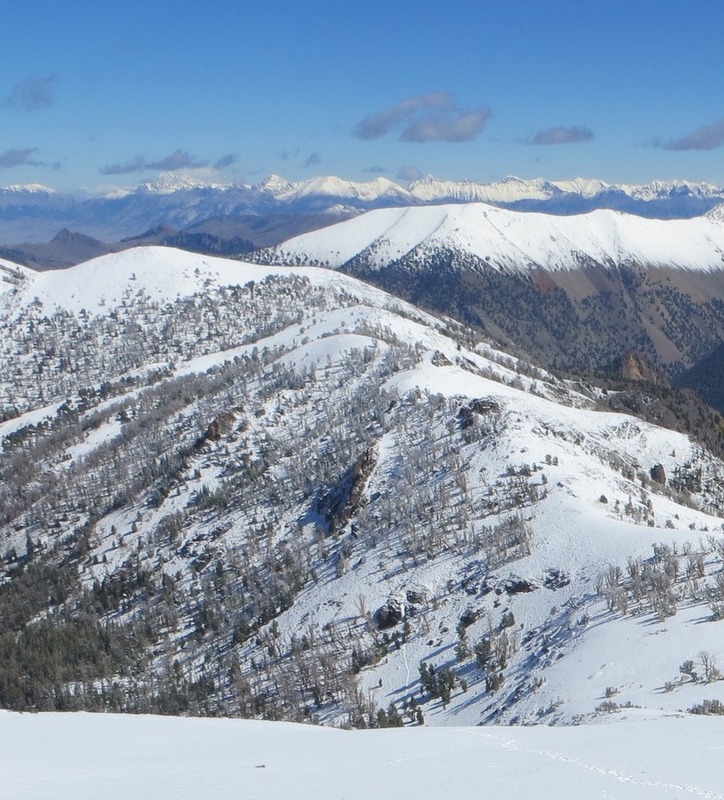 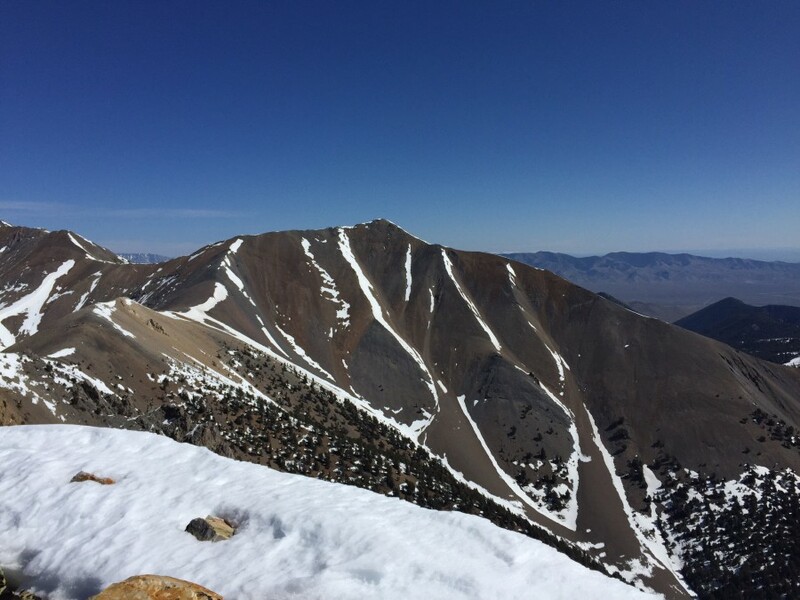 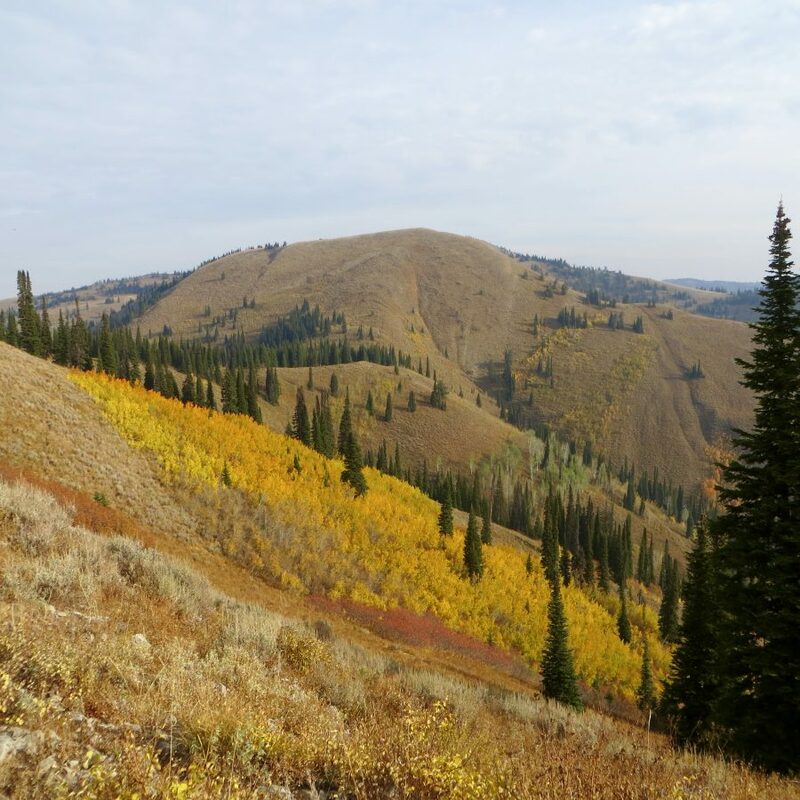 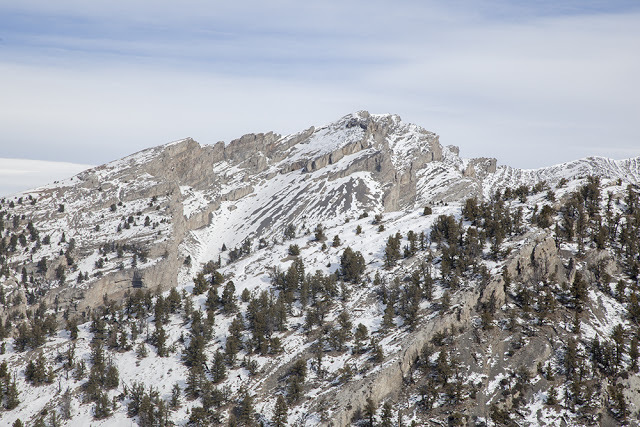 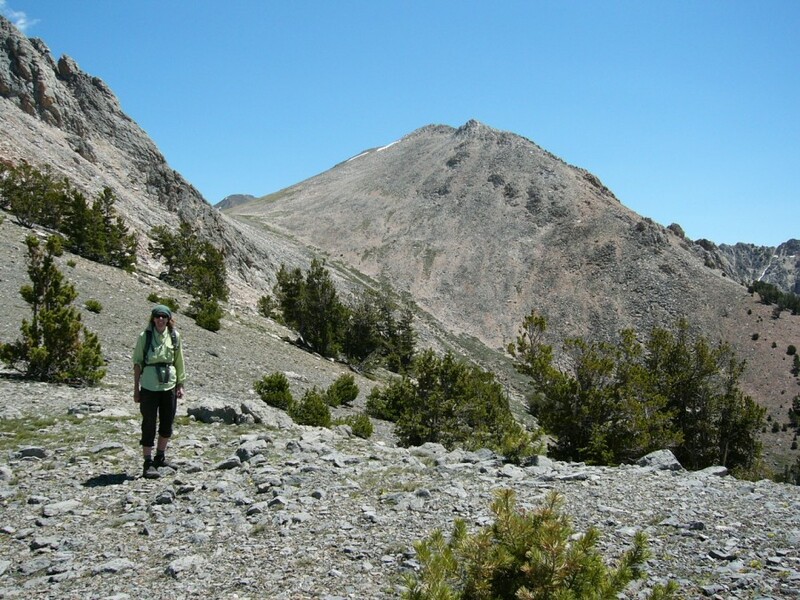 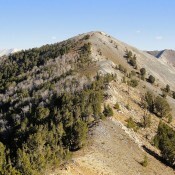 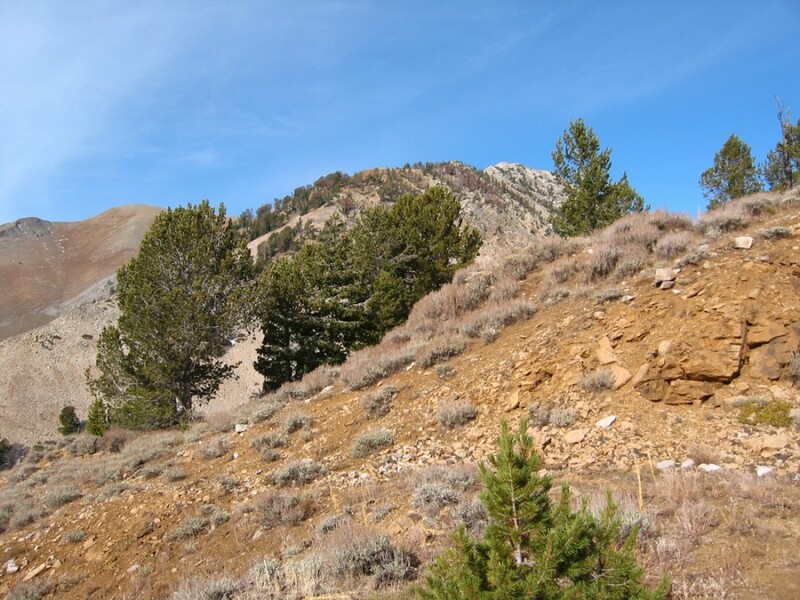 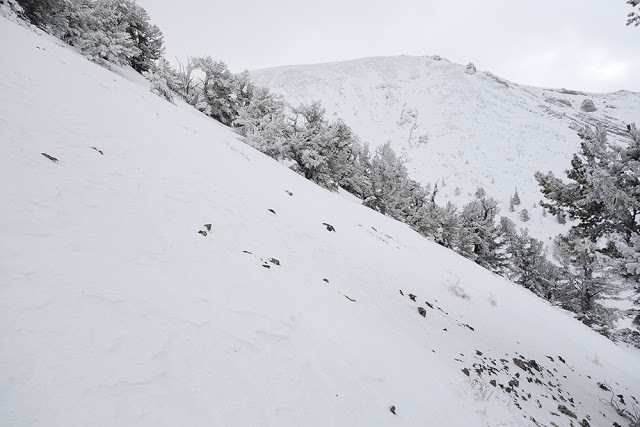 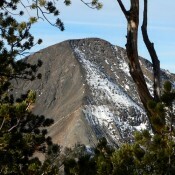 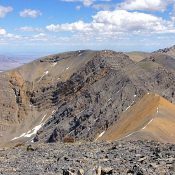 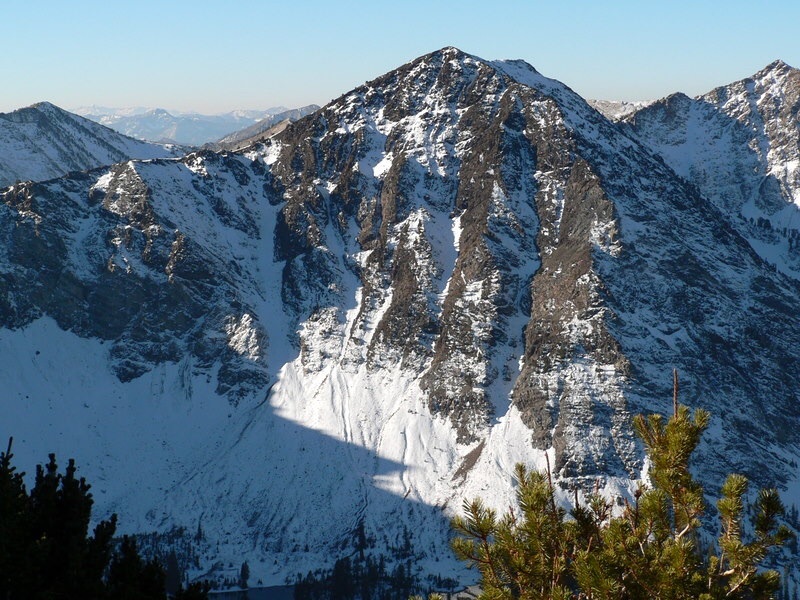 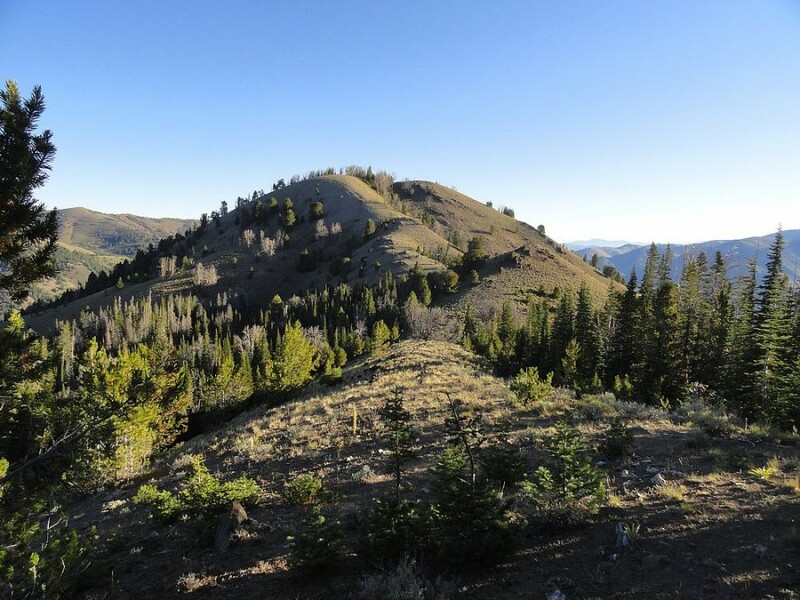 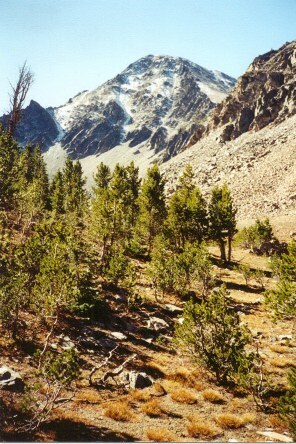 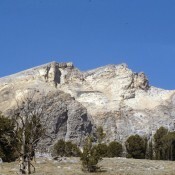 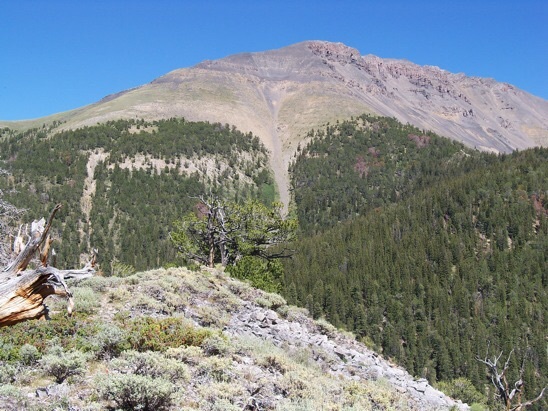 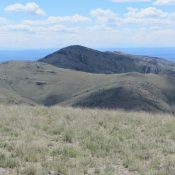 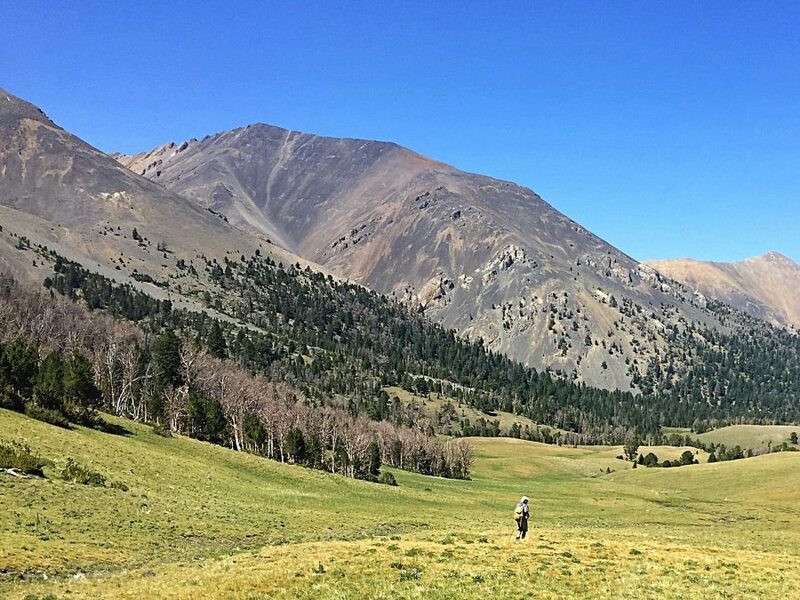 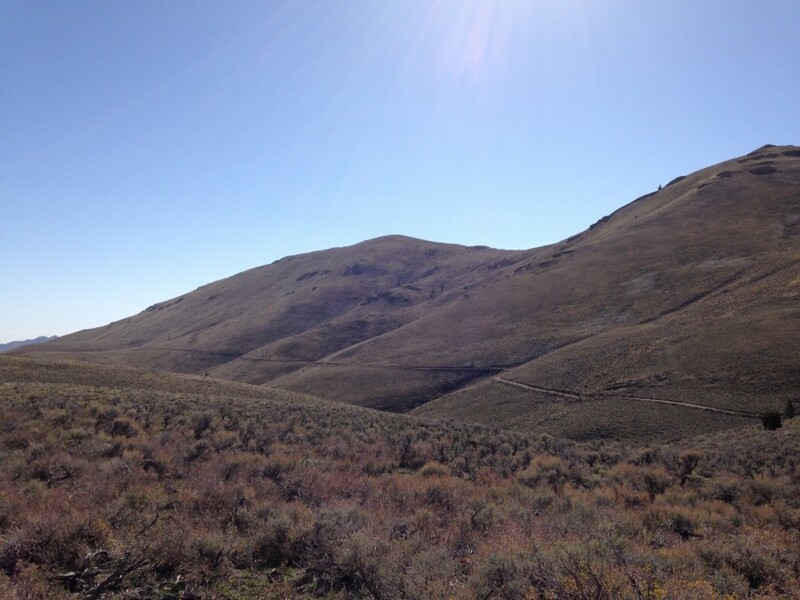 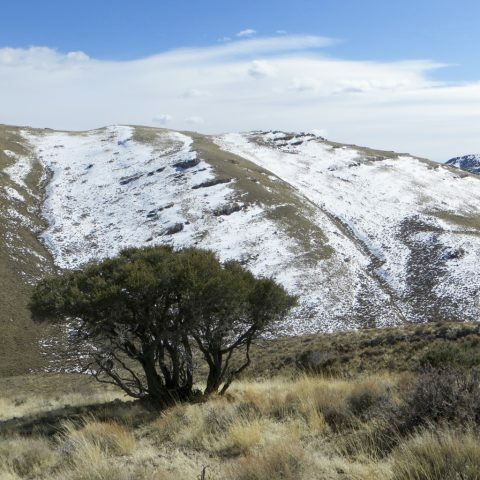 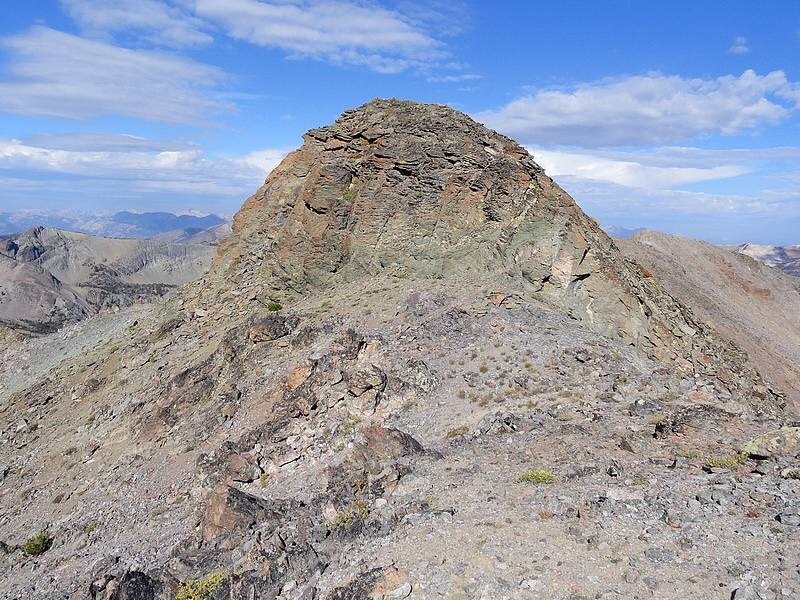 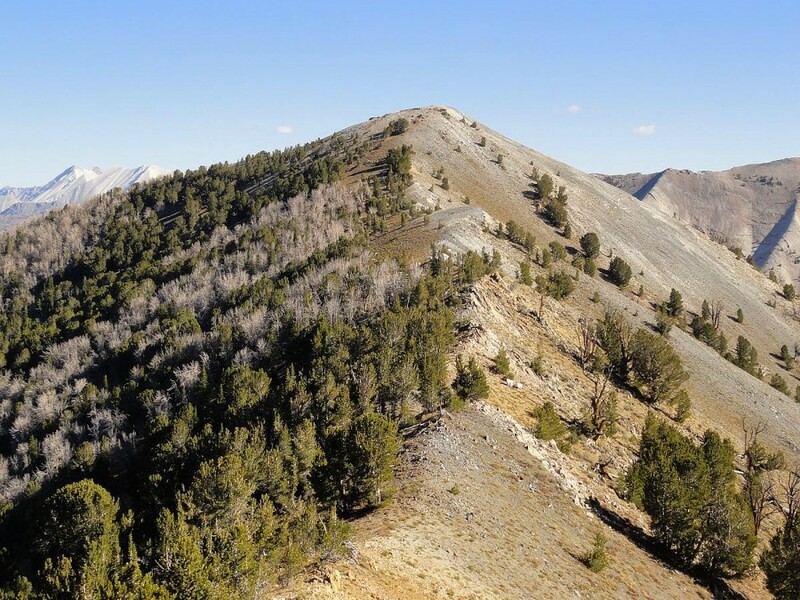 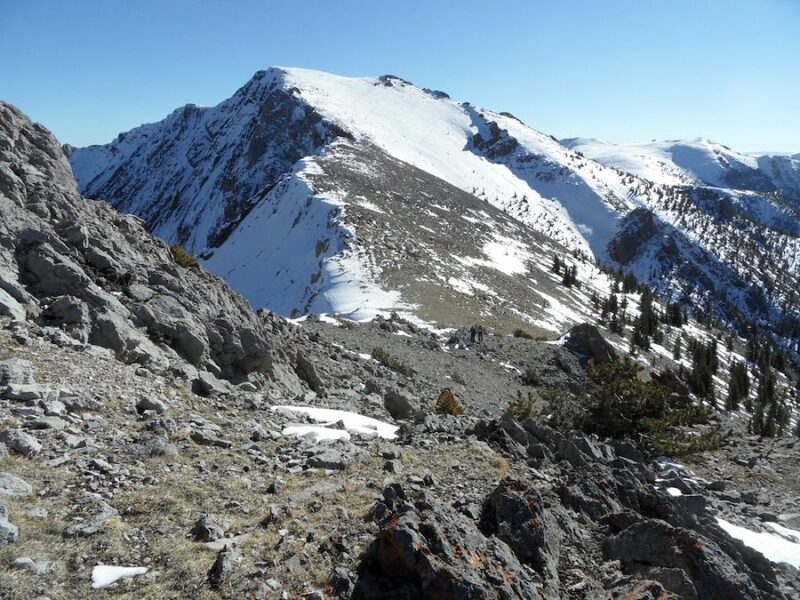 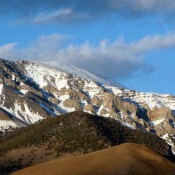 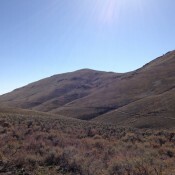 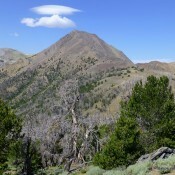 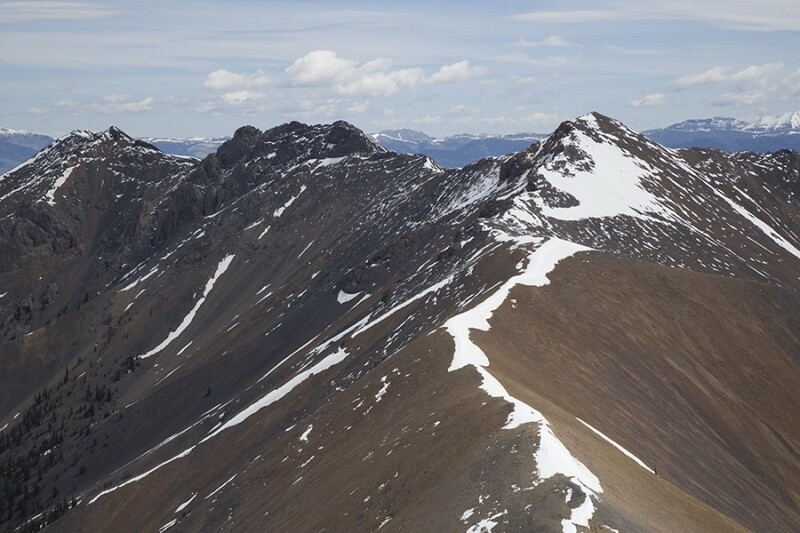 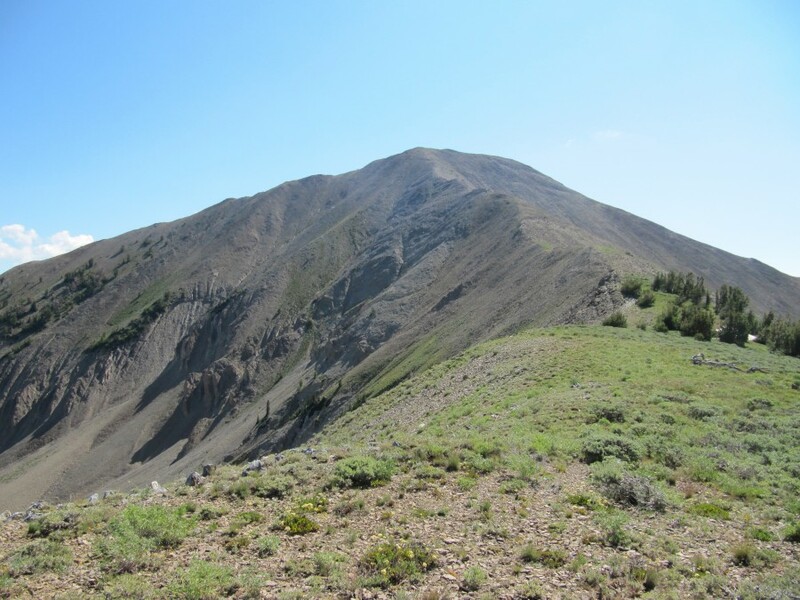 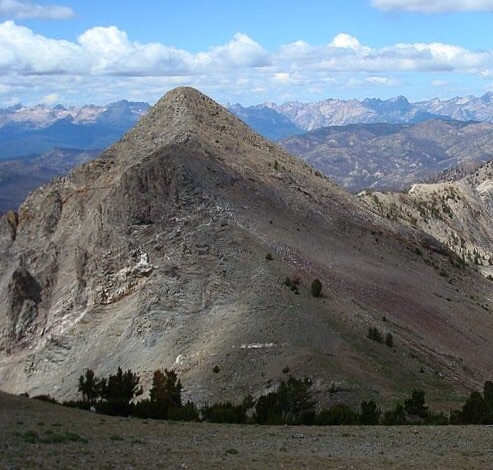 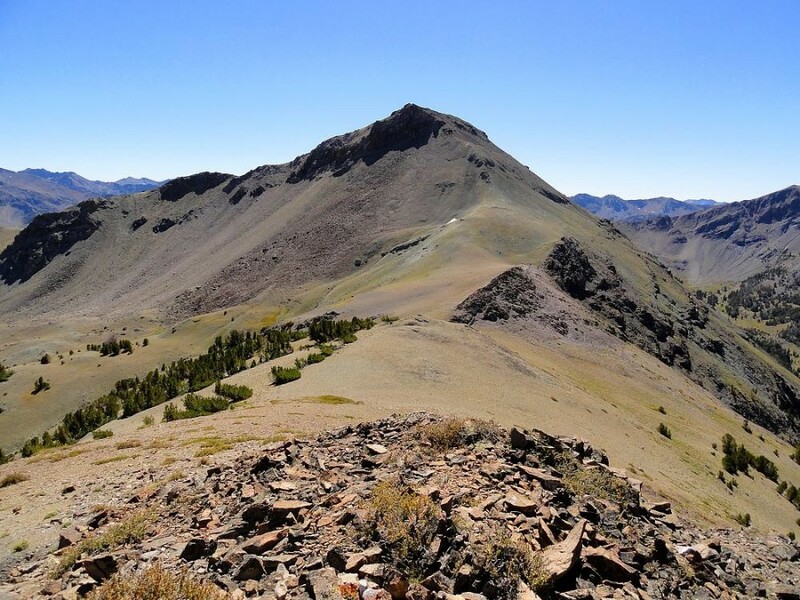 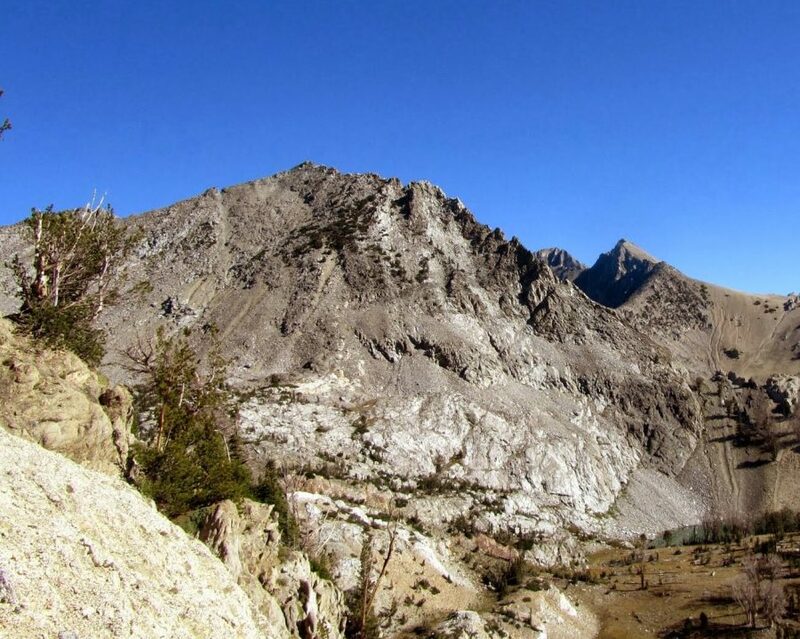 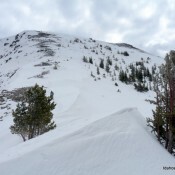 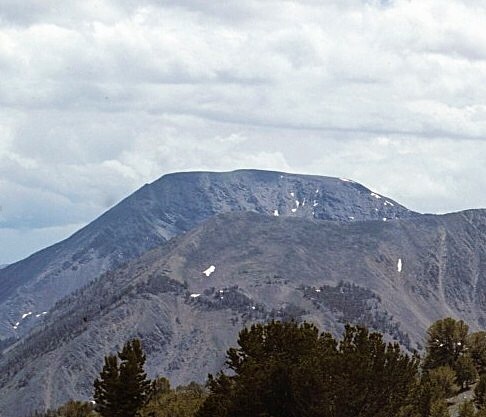 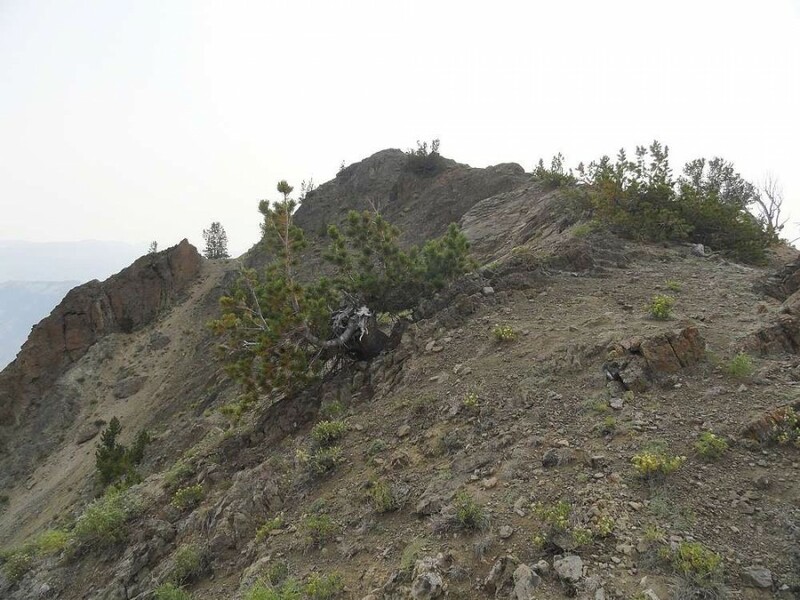 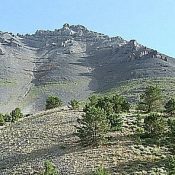 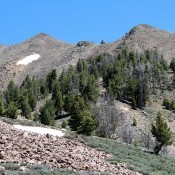 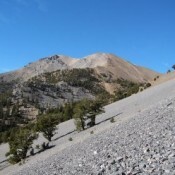 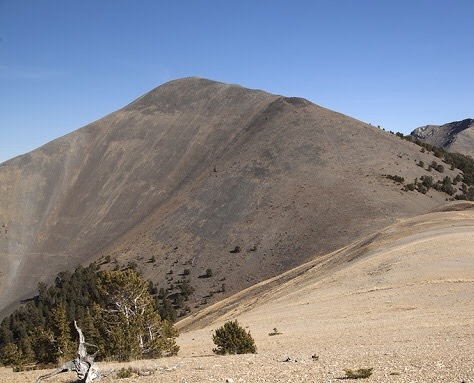 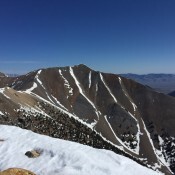 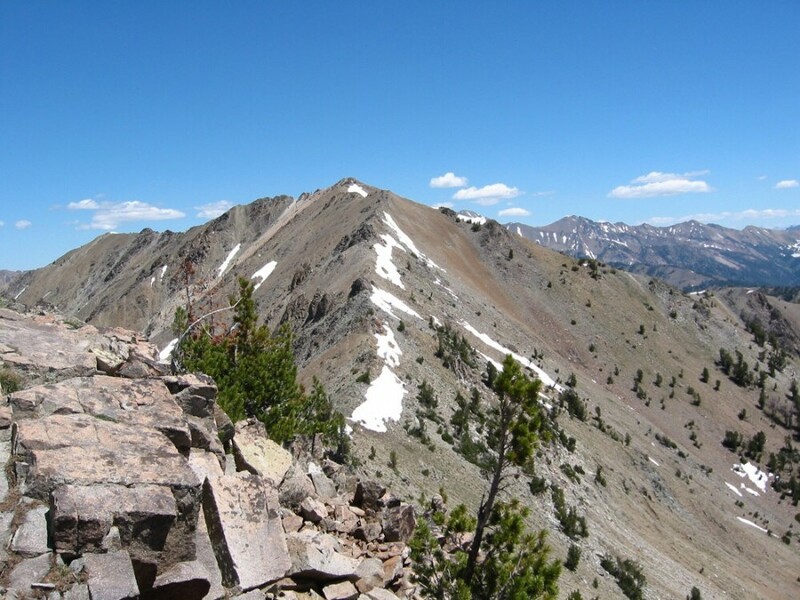 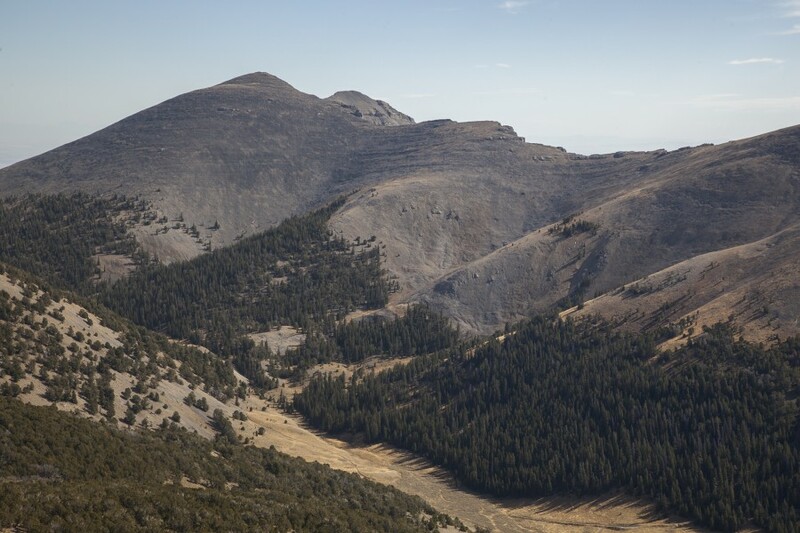 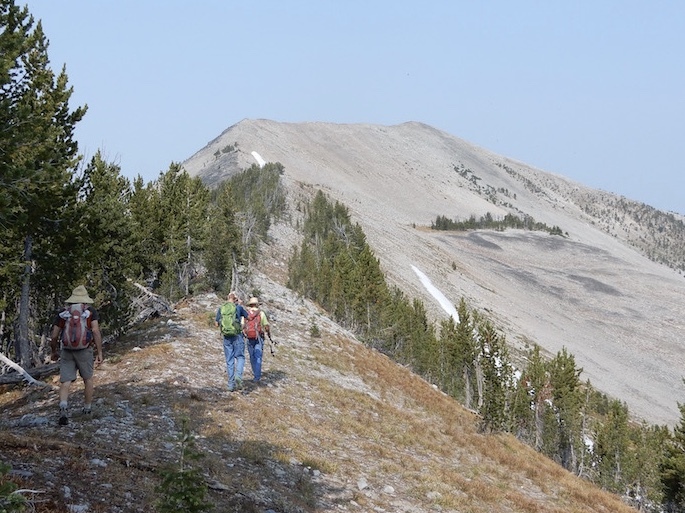 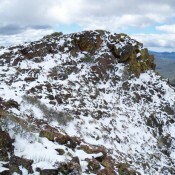 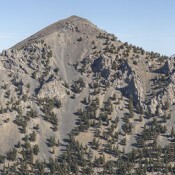 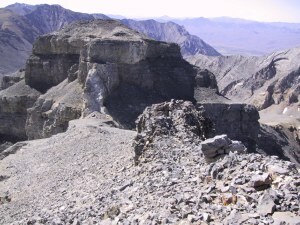 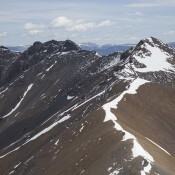 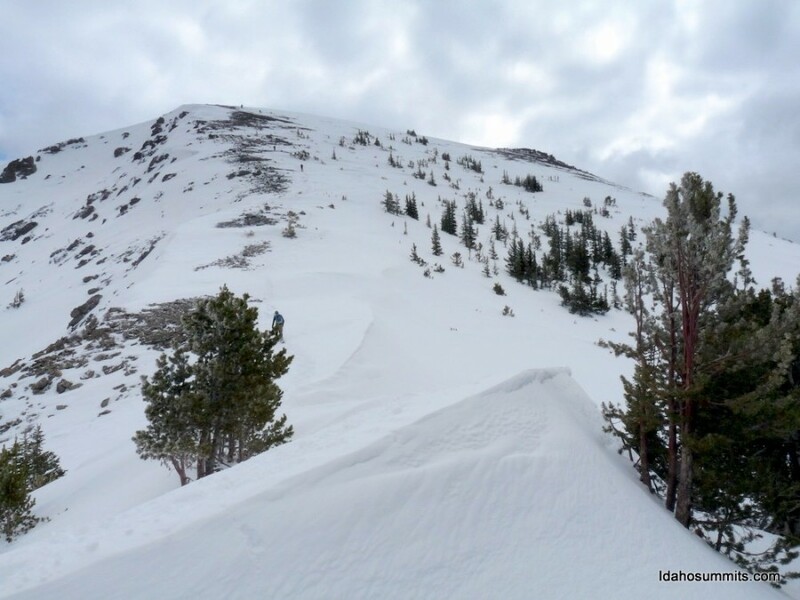 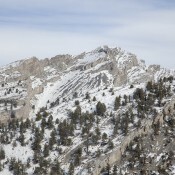 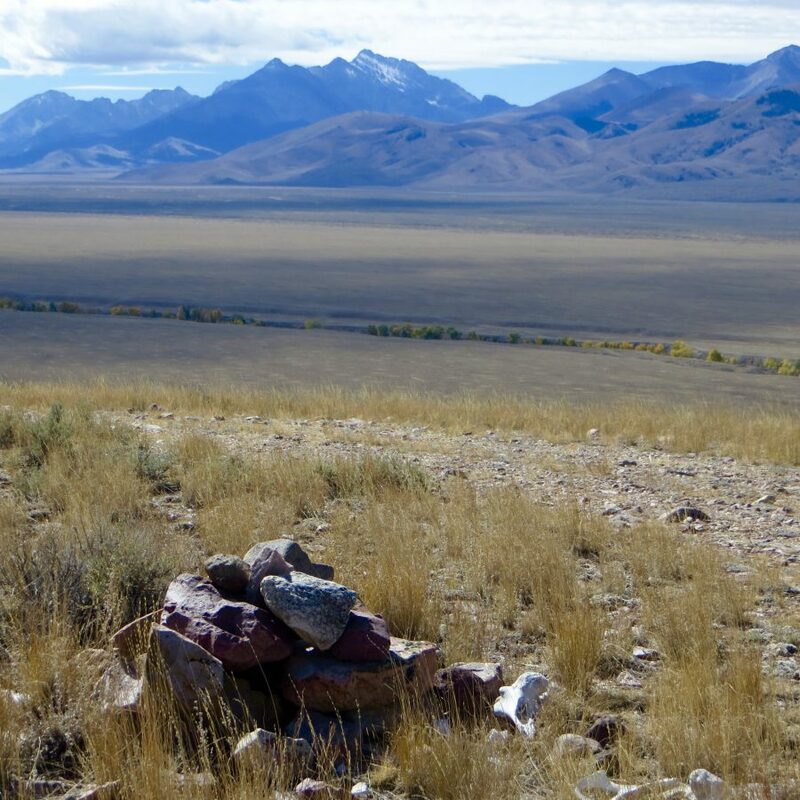 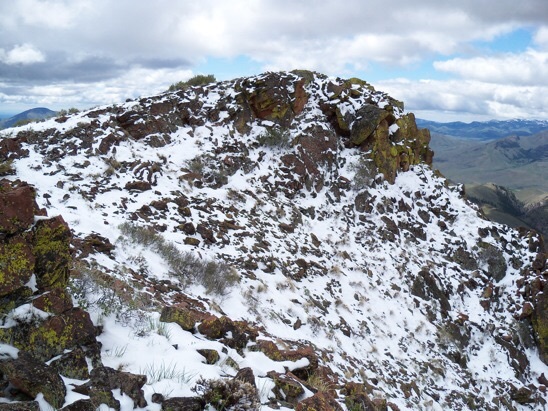 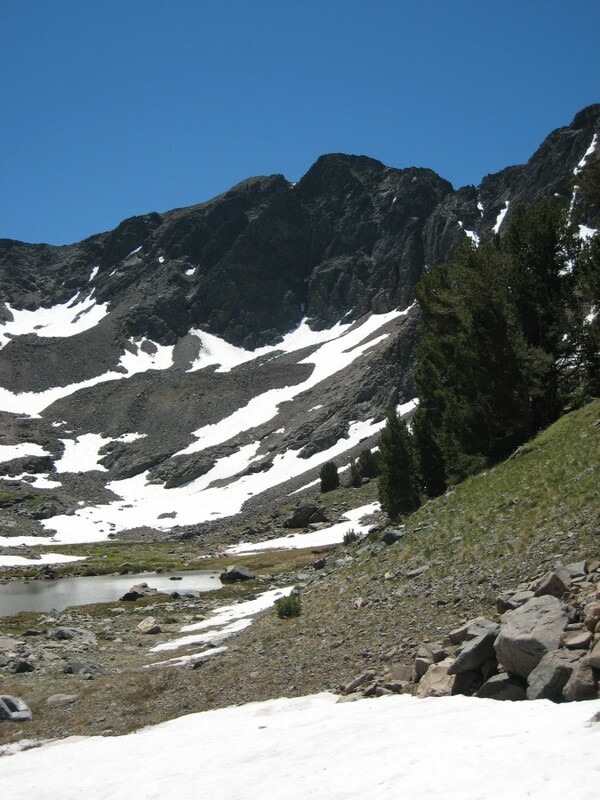 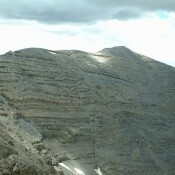 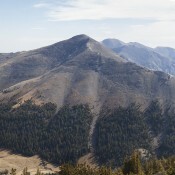 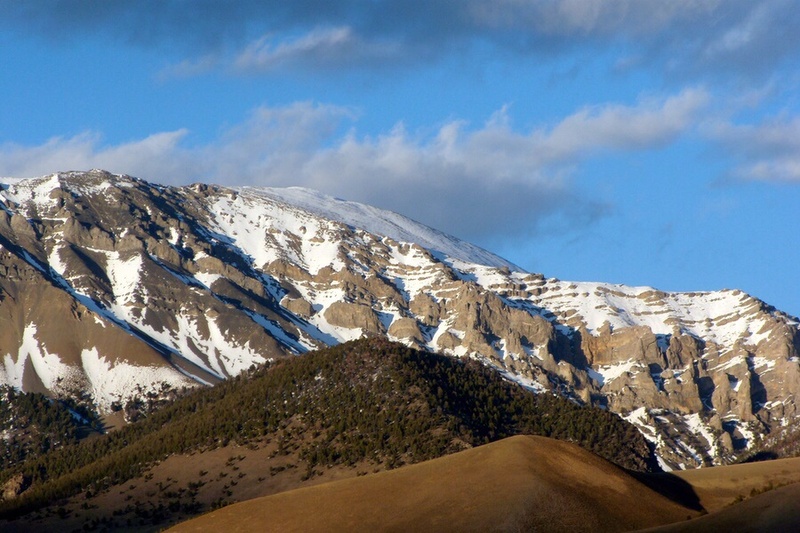 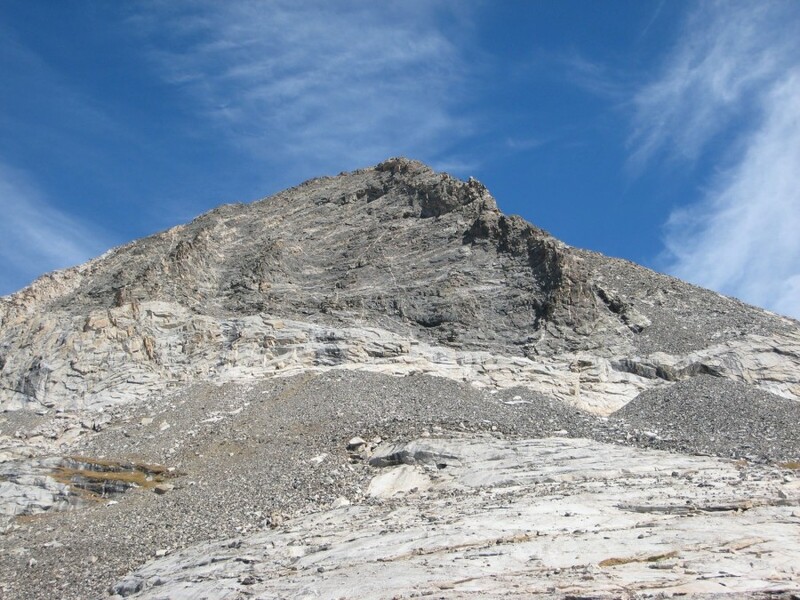 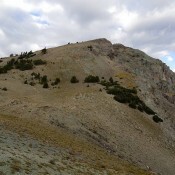 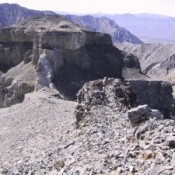 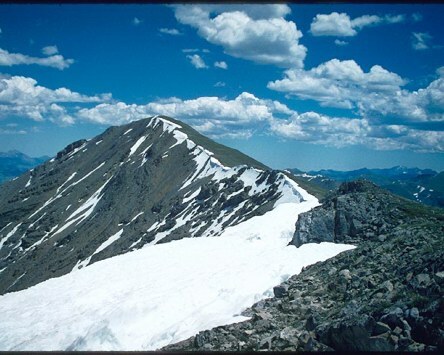 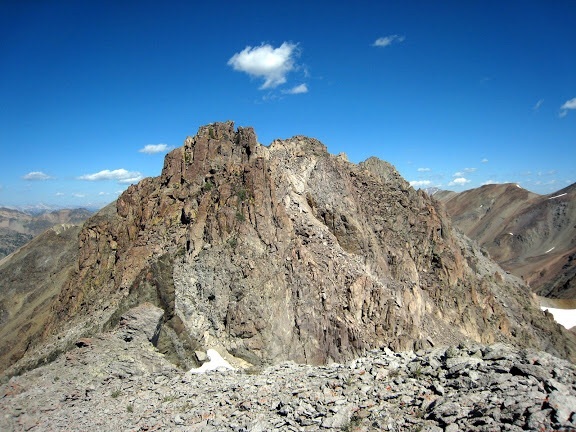 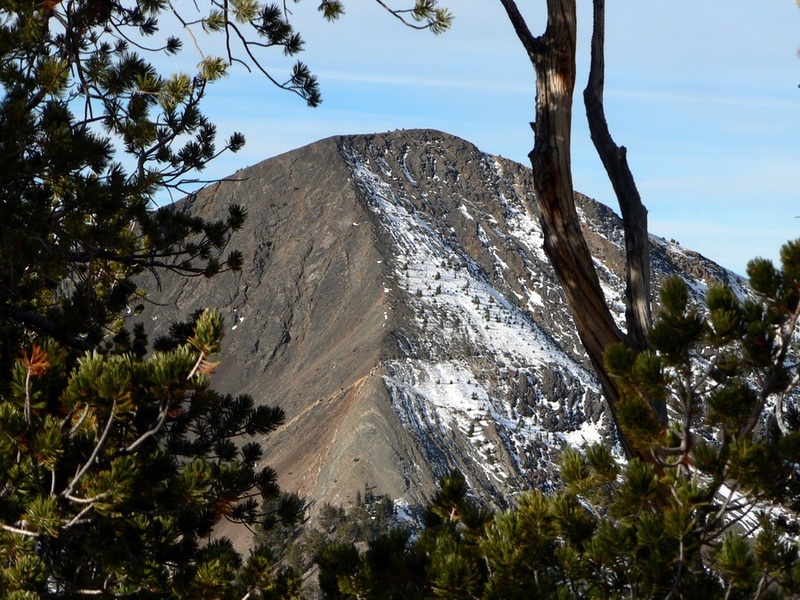 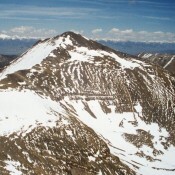 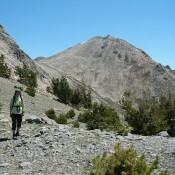 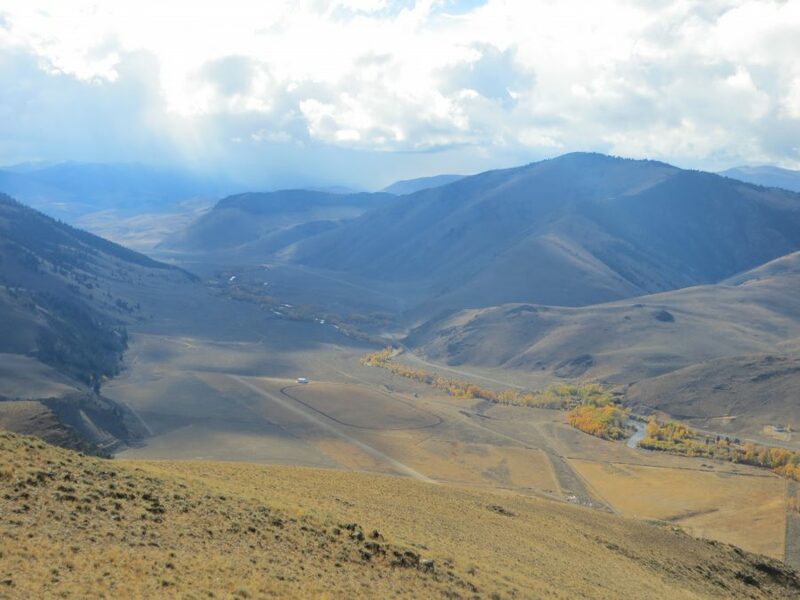 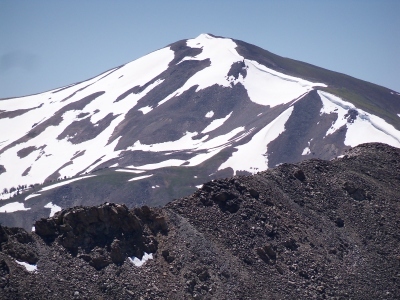 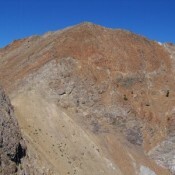 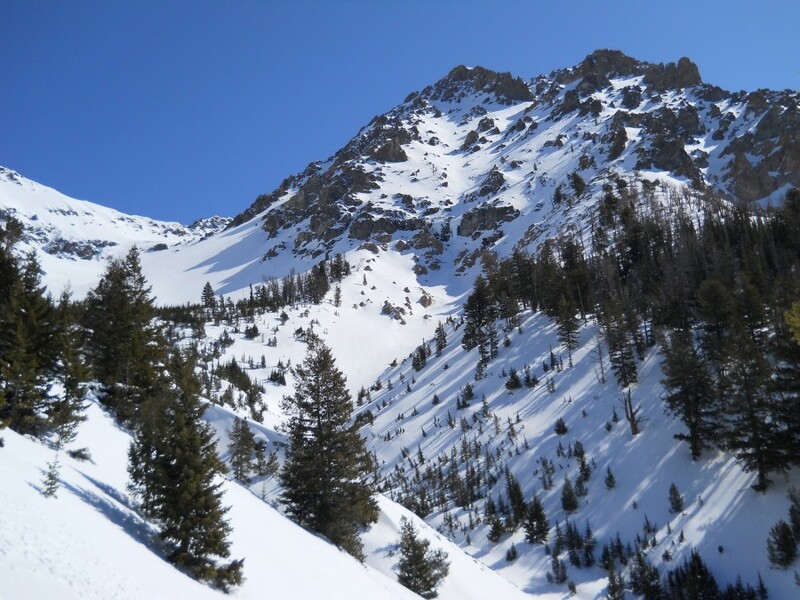 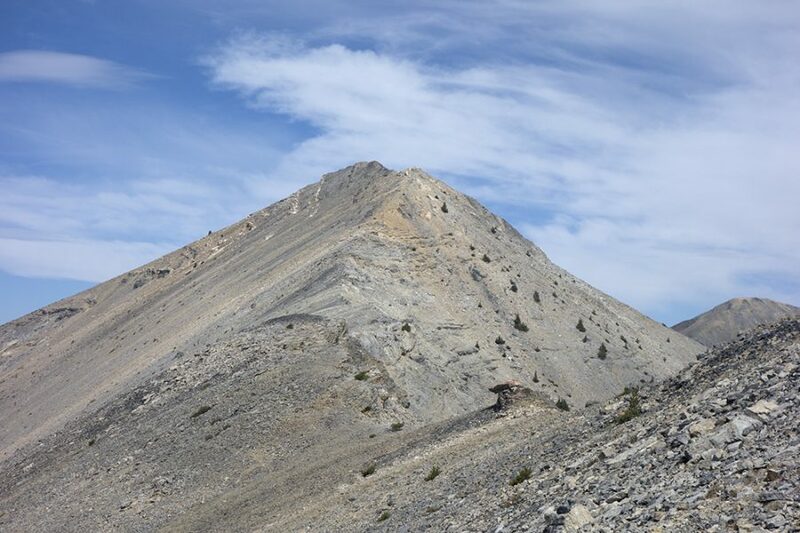 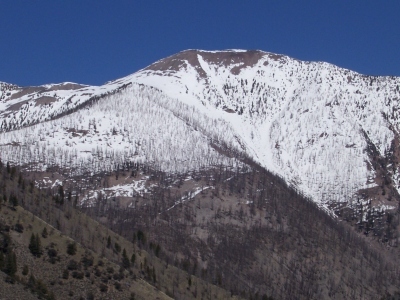 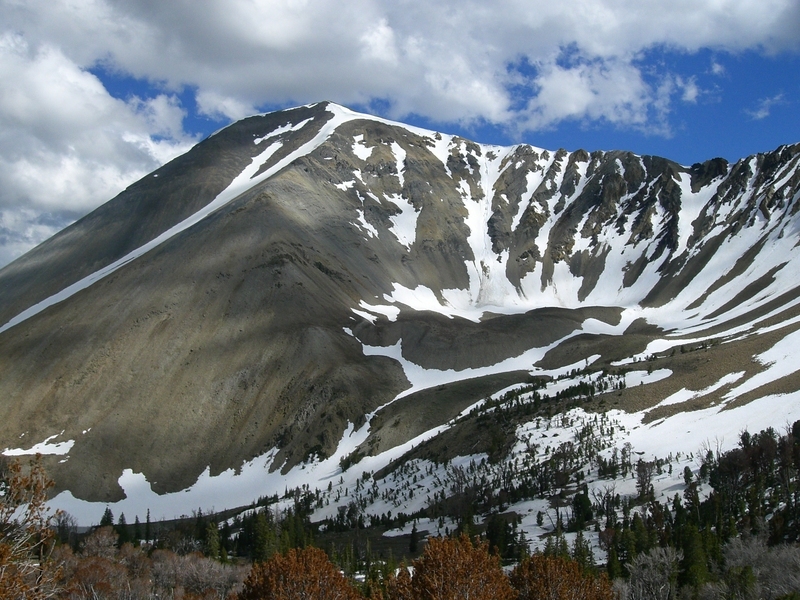 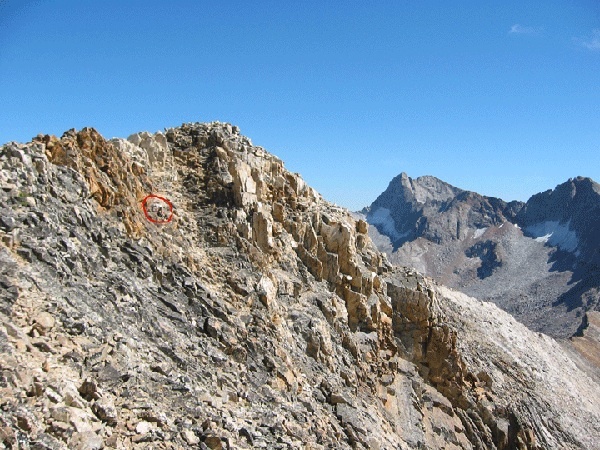 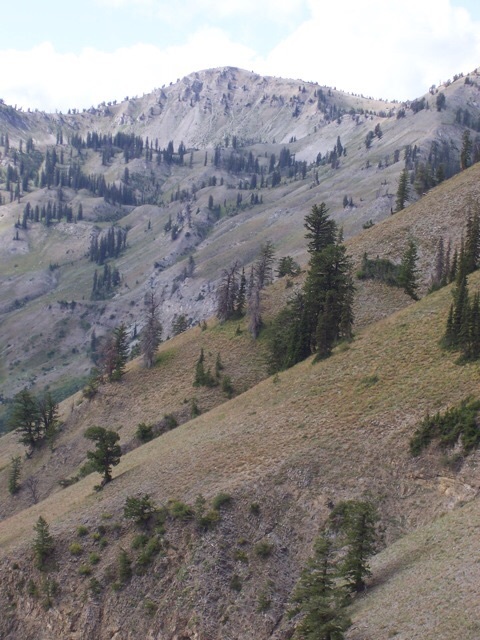 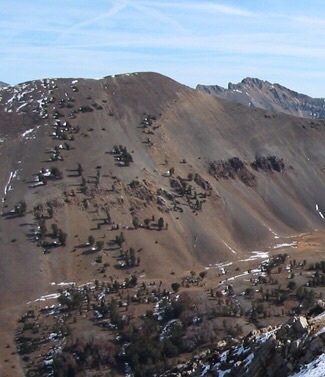 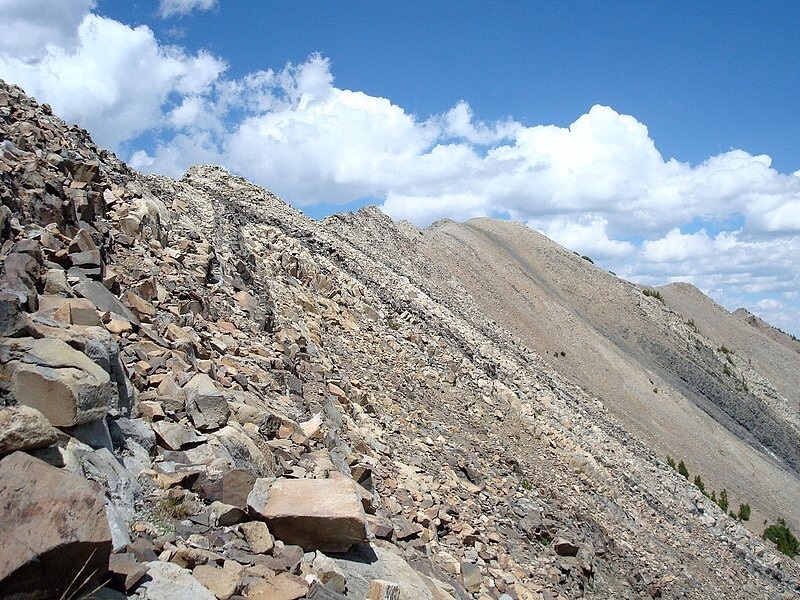 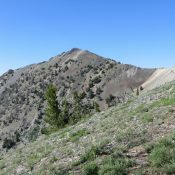 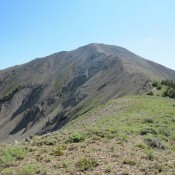 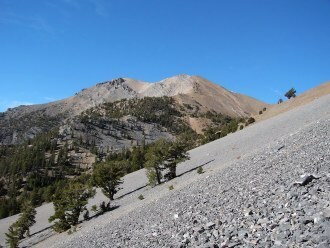 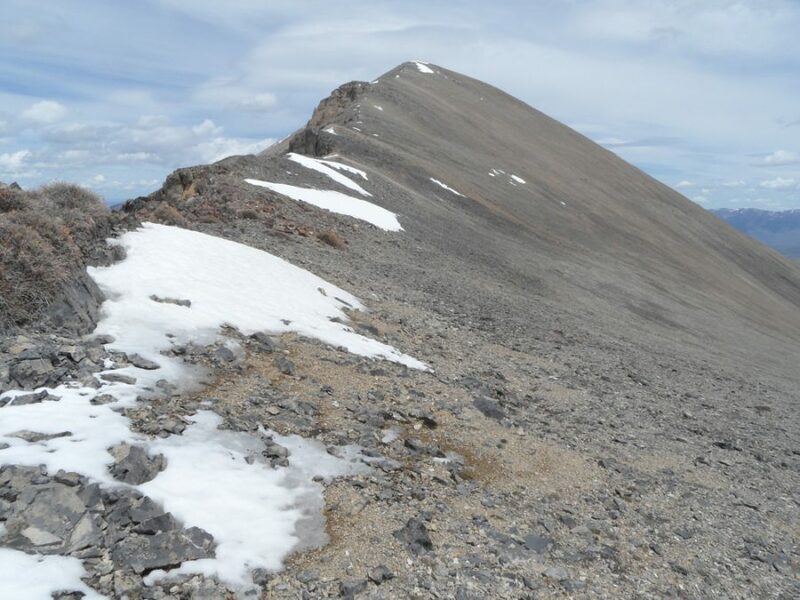 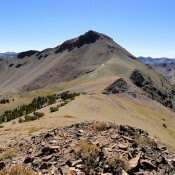 Buckhorn Peak Lemhi Range 10,412 ft 552 2014 Climbing and access information for Buckhorn is found on page 310. 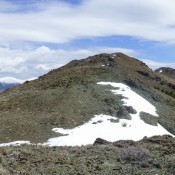 Peak 10401 (Daisy Black Peak) Lemhi Range 10,401 ft 221 This peak is not in the book. 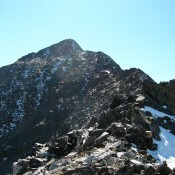 Peak 10380 (Rosencrance Peak) Pioneer Mountains 10,380 ft This peak is not in the book. 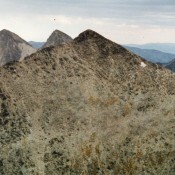 Peak 10380 Pioneer Mountains 10,380 ft This peak is not in the book. 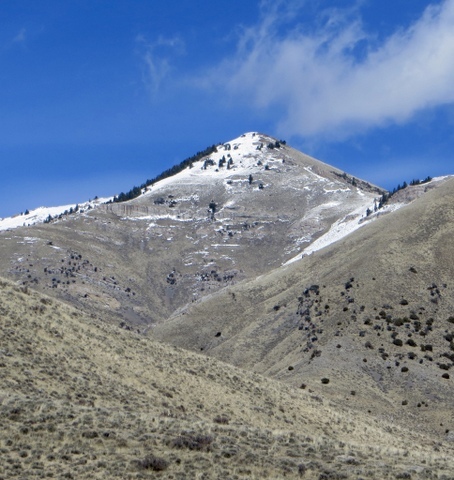 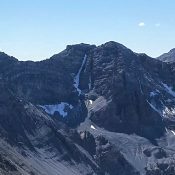 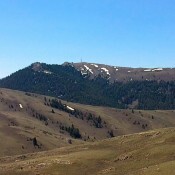 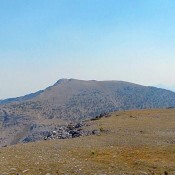 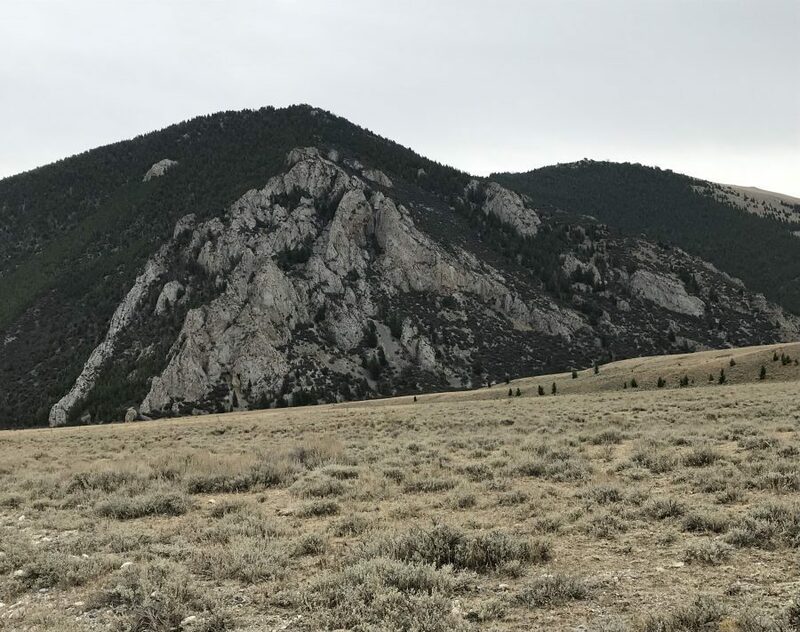 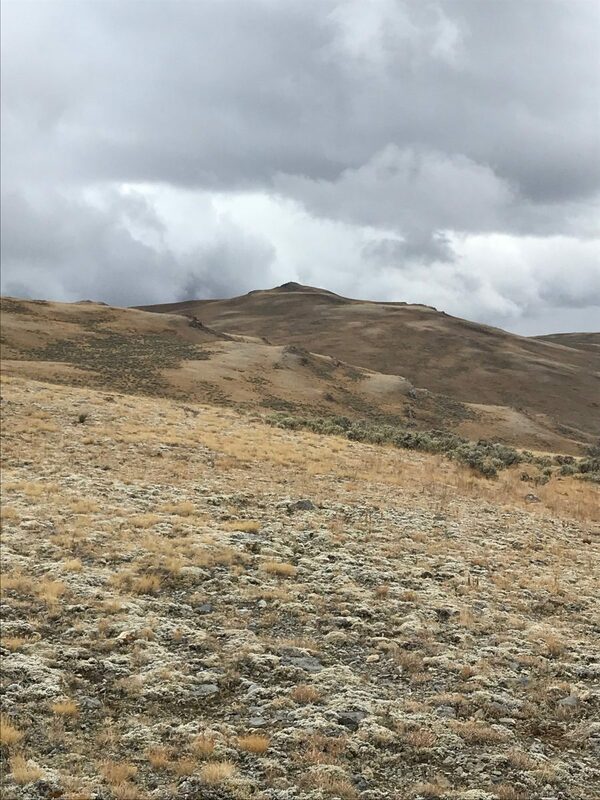 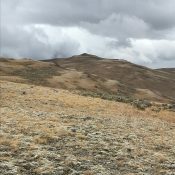 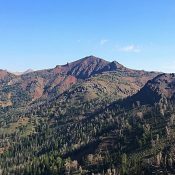 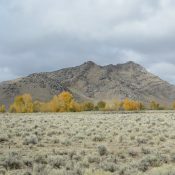 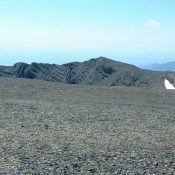 Big Windy Peak Lemhi Range 10,380 ft 538 2015 Climbing and access information for this peak is found on pages 304 and 305. 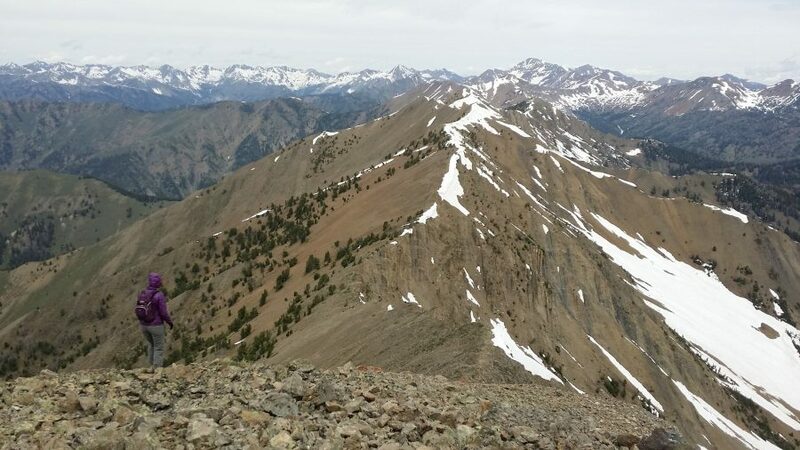 Argosy Peak Albion Range 10,377 ft 357 2017 This peak not in the book. 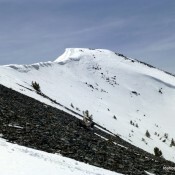 Peak 10375 (West Lem Peak) Lemhi Range 10,375 ft 395 This peak is not in the book. 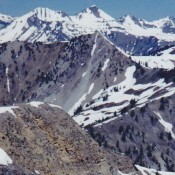 Peak 10358 (Great Western Peak) Lemhi Range 10,358 ft 298 This peak is not in the book. 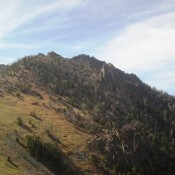 Peak 10354 (Moose Perch) Pioneer Mountains 10,354 ft 454 This peak is not in the book. 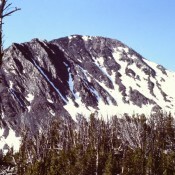 Peak 10349 Lemhi Range 10,349 ft 449 This peak is not in the book. 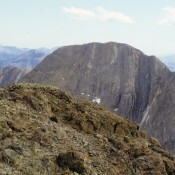 Peak 10340 Lost River Range 10,340 ft 320 This peak is not in the book. 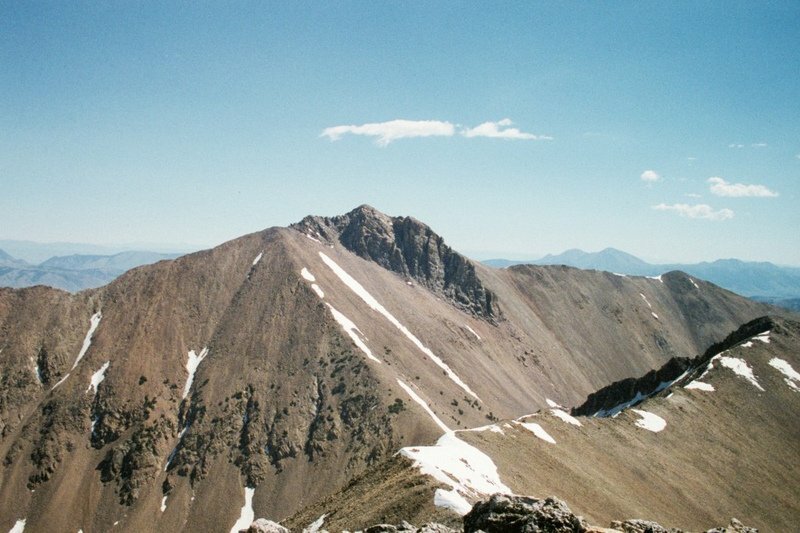 McNutt Peak (Peak 10327) Lemhi Range 10,327 ft 507 Climbing and access information for this peak is found on page 296. 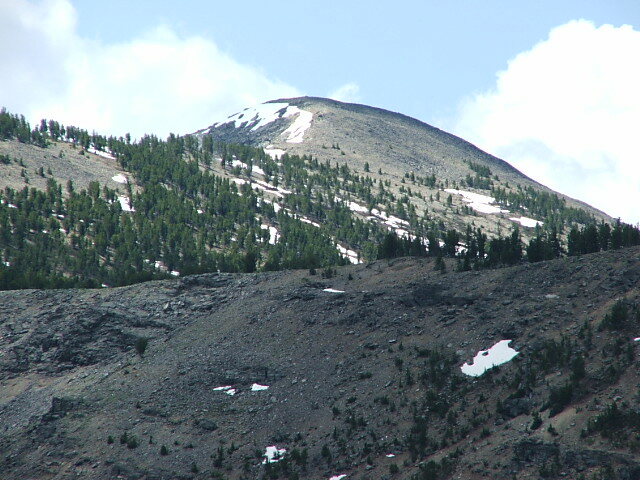 Peak 10310 (Cold Creek Peak) Lemhi Range 10,310 ft 450 This peak is not in the book. 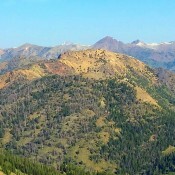 Peak 10300 Lemhi Range 10,300 ft 480 This peak is not in the book. 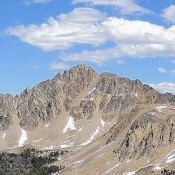 Paymaster Peak Sawtooth Range 10,292 ft 2008 This peak is not in the book. 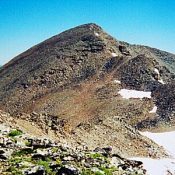 Peak 10288 (Annies Peak) Lemhi Range 10,288 ft 348 This peak is not in the book. 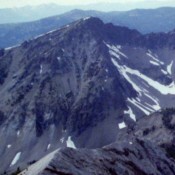 Mackay Peak White Knob Mountains 10,273 ft 480 1989 Climbing and access information for this peak is found on page 262. 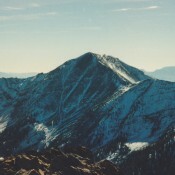 Peak 10273 (West Rosencrance Peak) Pioneer Mountains 10,273 ft This peak is not in the book. 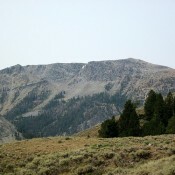 Peak 10268 (Park Fork Peak) Lemhi Range 10,268 ft 566 This peak is not in the book. 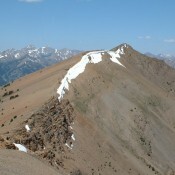 Peak 10263 (Paramor Peak) Lemhi Range 10,263 ft 370 This peak is not in the book. 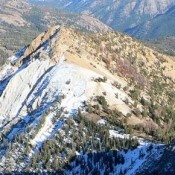 Glide Mountain Pioneer Mountains 10,256 ft Glide Mountain is found on page 255. 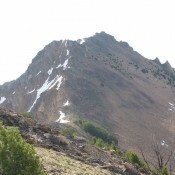 Peak 10256 (Smithie Peak) Lemhi Range 10,256 ft 397 Climbing and access information for this peak is found on page 303. 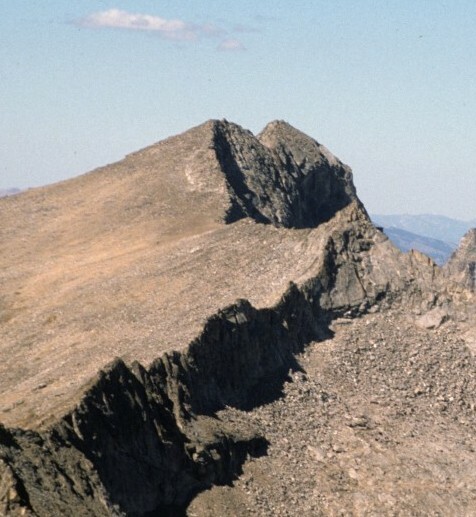 Peak 10248 (Skyline Peak) Pioneer Mountains 10,248 ft This peak is not in the book. 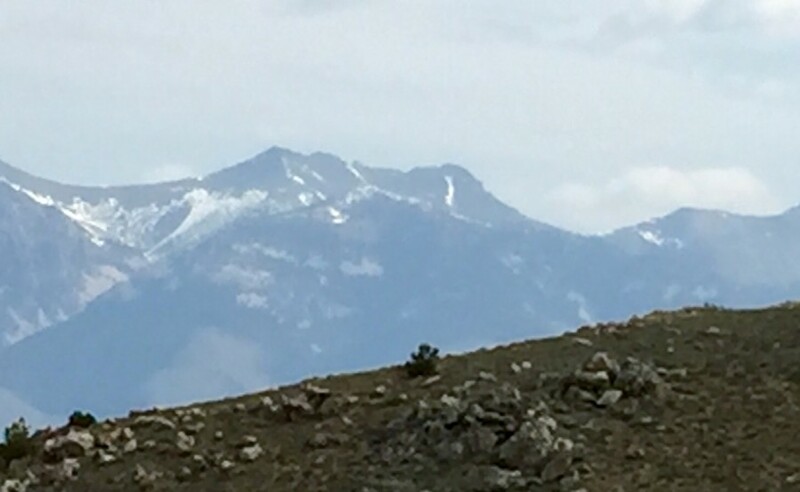 Roundup Peak 10225 Pioneer Mountains 10,225 ft 325 2015 This peak is not in the book. 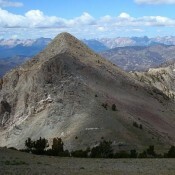 Peak 10225 Lemhi Range 10,225 ft 365 This peak is not in the book. 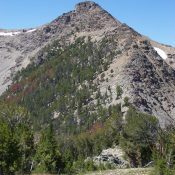 Peak 10214 (Red Point Peak) Lemhi Range 10,214 ft 354 This peak is not in the book. 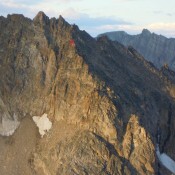 Peak 10202 Lost River Range 10,202 ft 422 This peak is not in the book. 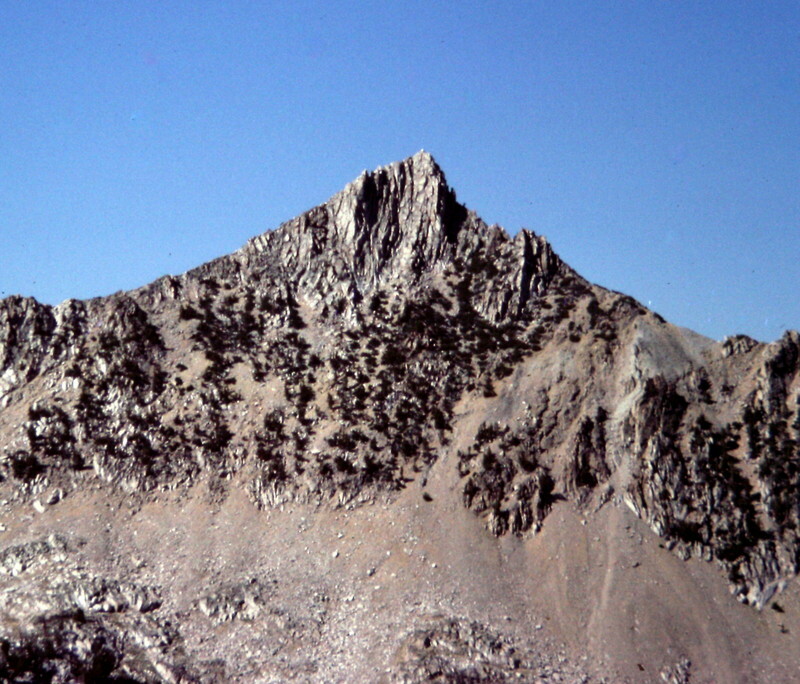 Peak 10184 (Little Kane Peak) by Margo Mandella Pioneer Mountains 10,184 ft 324 This peak is not in the book. 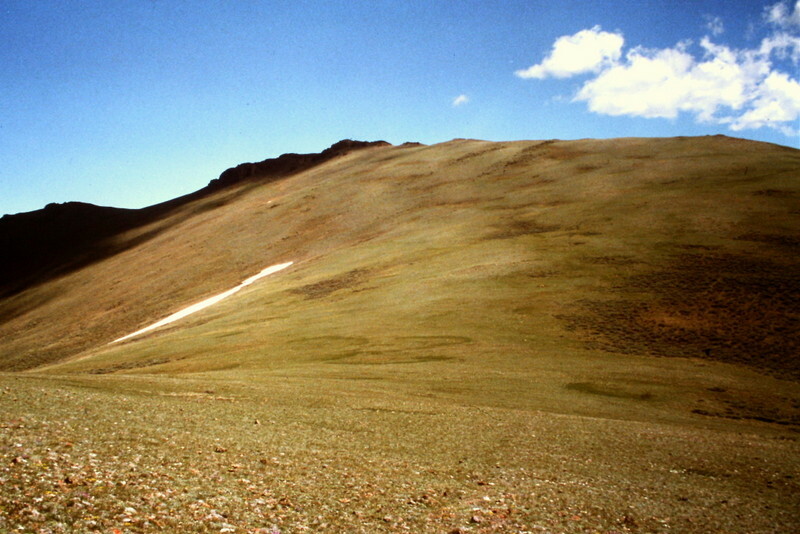 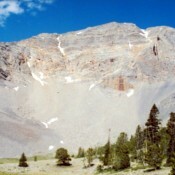 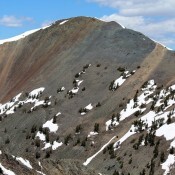 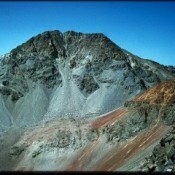 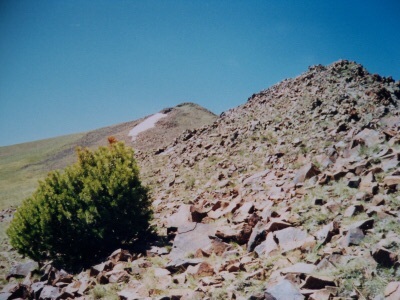 Rainbow Mountain Lemhi Range 10,162 ft 702 2005 Climbing information for this peak is found on page 305. 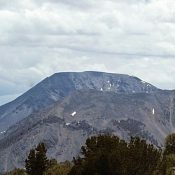 Updated May 2017. 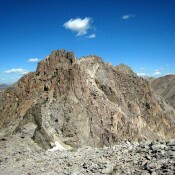 Peak 10149 (Iron Fish Peak) Pioneer Mountains 10,149 ft 2000 This Peak is not in the book. Peak 10149 (East Burnt Peak) Lost River Range 10,149 ft 809 2017 This peak is not in the book. 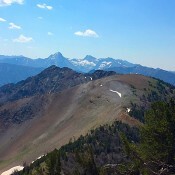 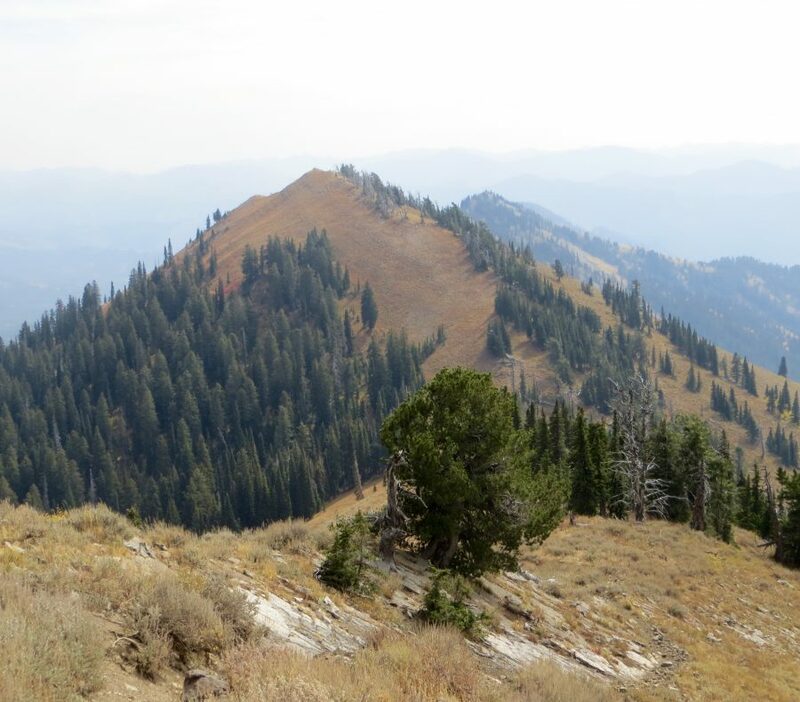 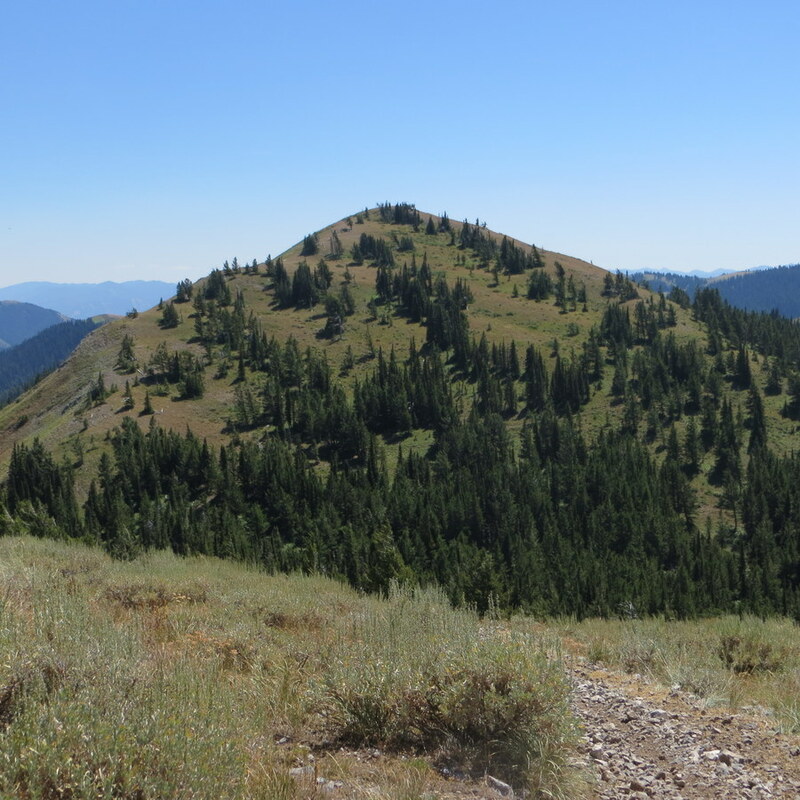 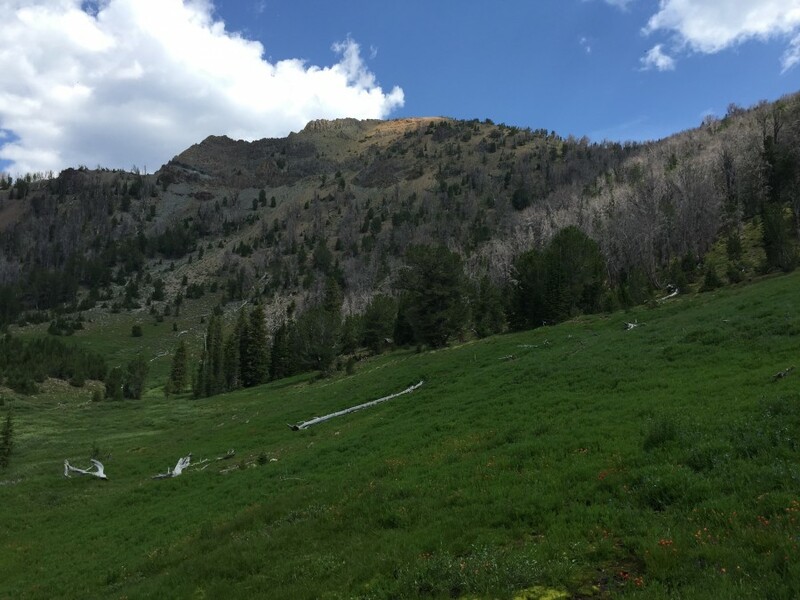 Peak 10112 (Little Bear Peak) Lemhi Range 10,112 ft 452 2015 This peak is not in the book. 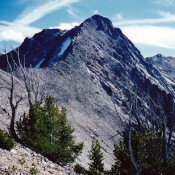 Peak 10104 Lemhi Range 10,104 ft 324 This peak is not in the book. 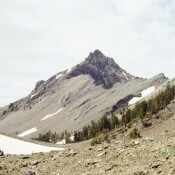 Peak 10100 (Petes Peak) Lemhi Range 10,100 ft 440 This peak is not in the book. 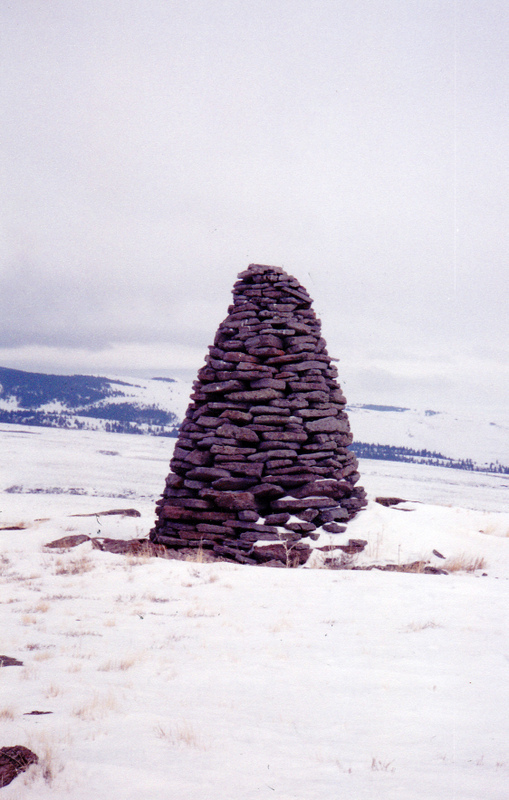 Livingston Douglas tracked down the history for this entry. 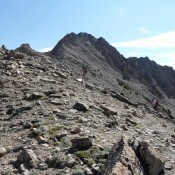 Peak 10096 (Copper Trail Peak) Pioneer Mountains 10,096 ft This peak is not in the book. 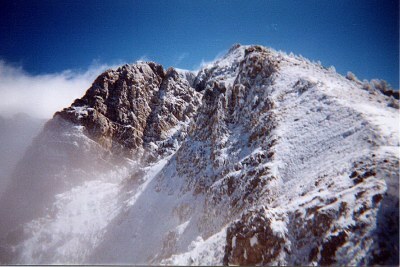 Peak 10077 Lemhi Range 10,077 ft 337 This peak is not in the book. 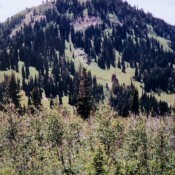 Peak 10060 Lemhi Range 10,060 ft 320 This peak is not in the book. 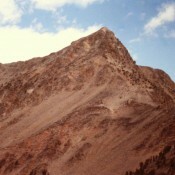 Peak 10055 Lemhi Range 10,055 ft 395 This peak is not in the book. 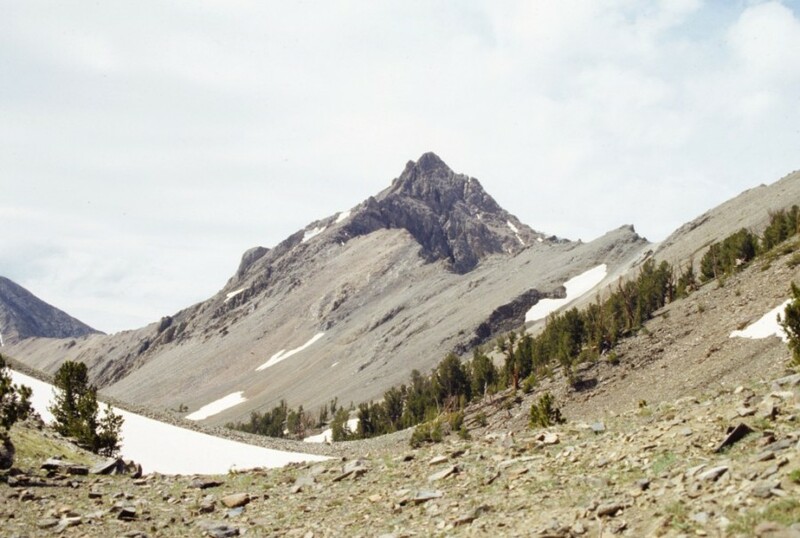 Peak 10045 (Marshall Mount) Lemhi Range 10,045 ft 545 Climbing and access information for this peak is found on page 310. 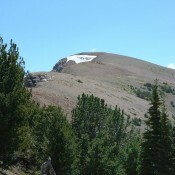 Peak 10042 Lemhi Range 10,042 ft 342 This peak is not in the book. 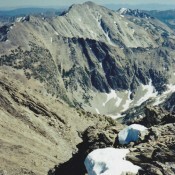 Mount Baird Big Hole and Snake River Mountains 10,025 ft 1725 Climbing and access information for Mount Baird is found on page 339. 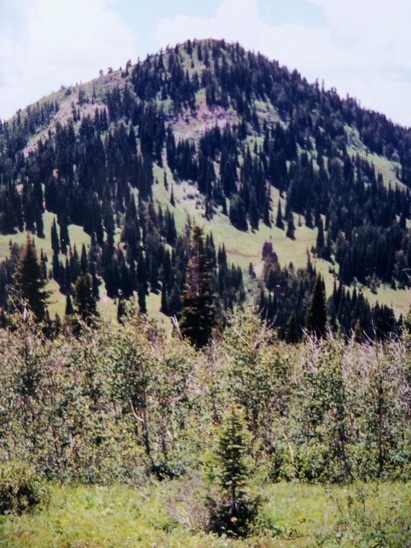 PEAK 9938 White Knob Mountains 9,938 ft 1990 This peak is found on page 262. 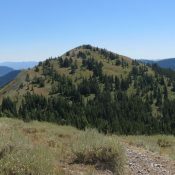 Peak 9909 (Devon Peak) Lemhi Range 9,909 ft 329 This peak is not in the book. 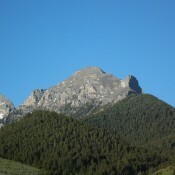 Peak 9854 Lost River Range 9,854 ft This peak is not in the book. 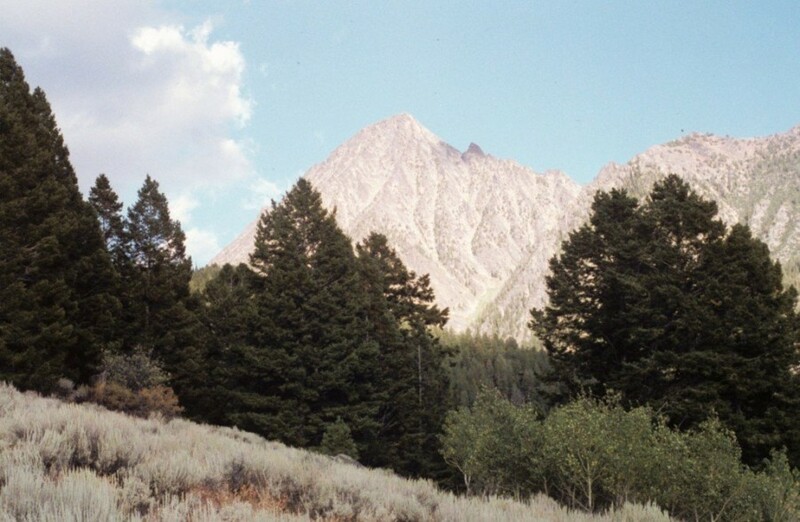 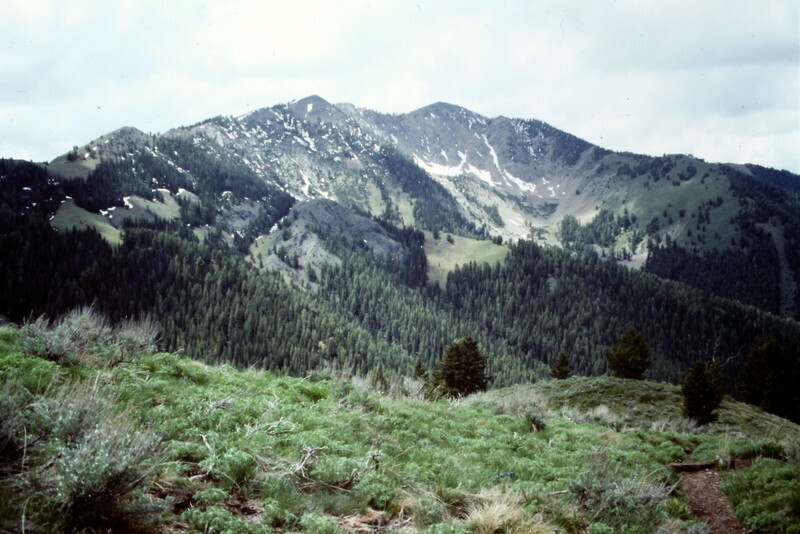 Hawley Mountain Lemhi Range 9,752 ft 1980, 1981, 1999 This peak is found on pages 287 to 288. 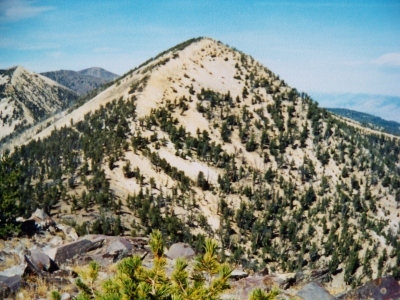 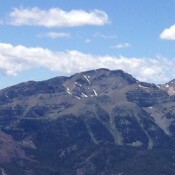 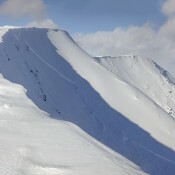 Peak 9722 (Hells Hole Peak a.k.a. 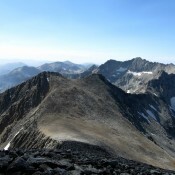 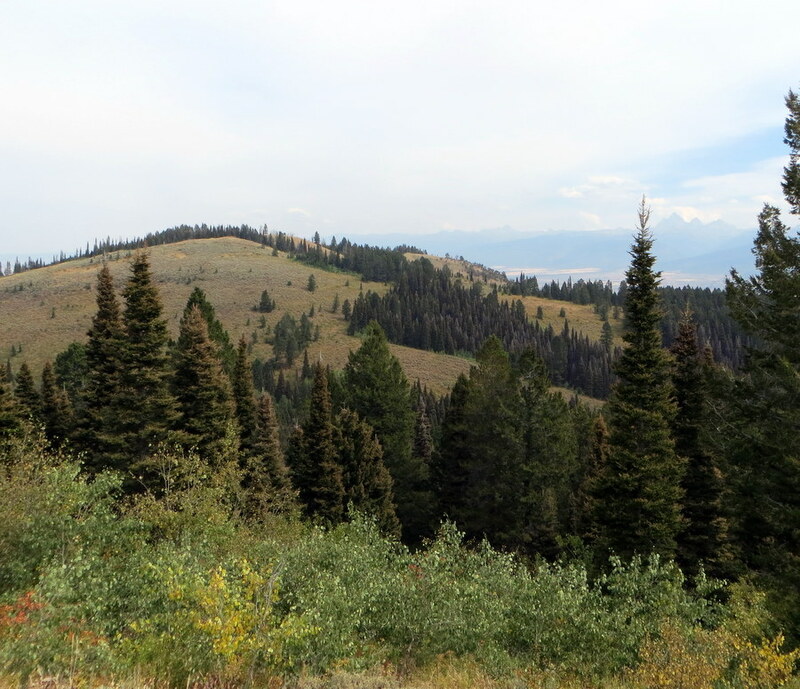 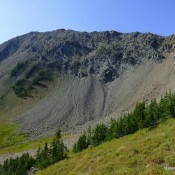 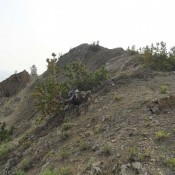 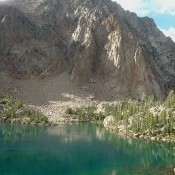 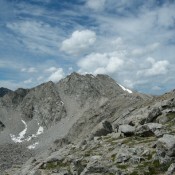 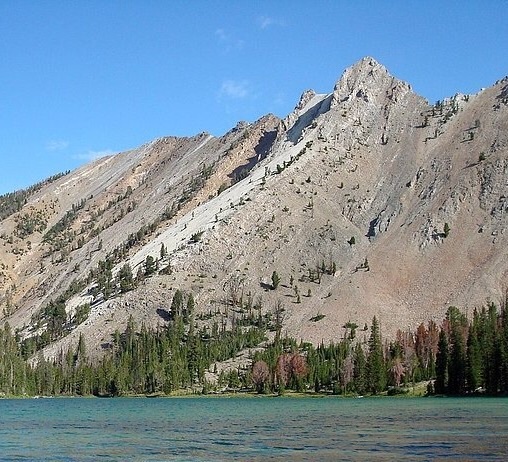 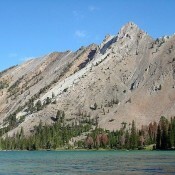 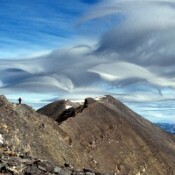 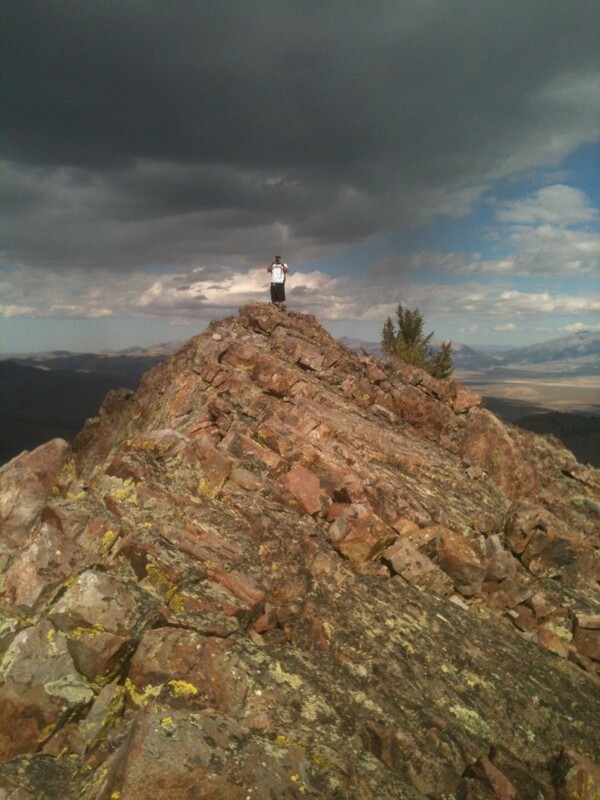 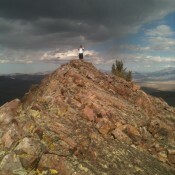 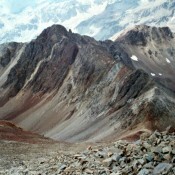 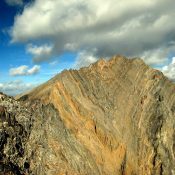 Little Elk Peak) Big Hole and Snake River Mountains 9,722 ft 382 This peak is not in the book. 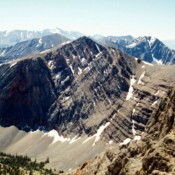 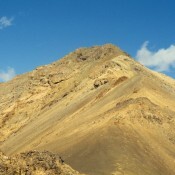 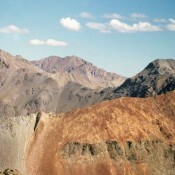 Sheep Mountain Big Hole and Snake River Mountains 9,700 ft This peak is found on page 339. 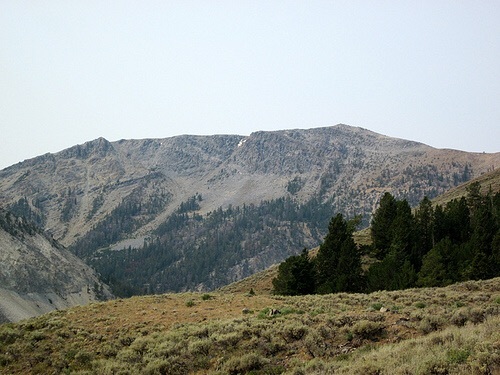 Sheep Mountain Big Hole and Snake River Mountains 9,680 ft This peak is found on page 339. 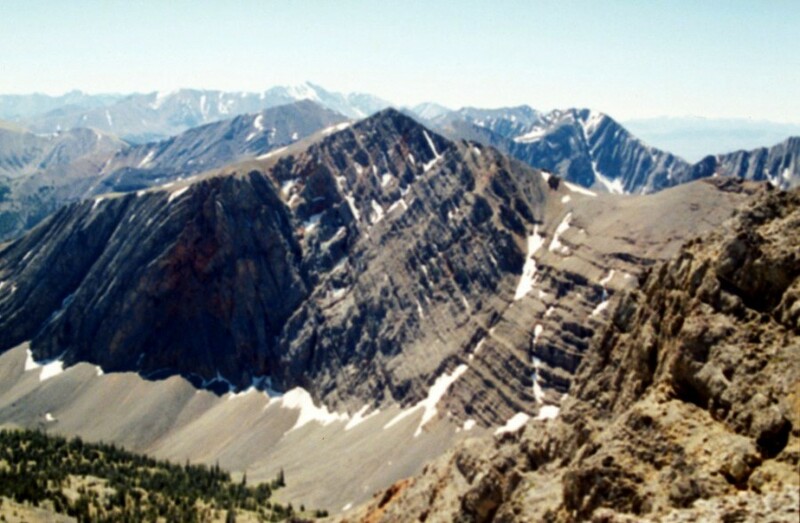 Richards Peak Big Hole and Snake River Mountains 9,660 ft This peak is not in the book and its summit sits just across the Idaho-Wyoming border. 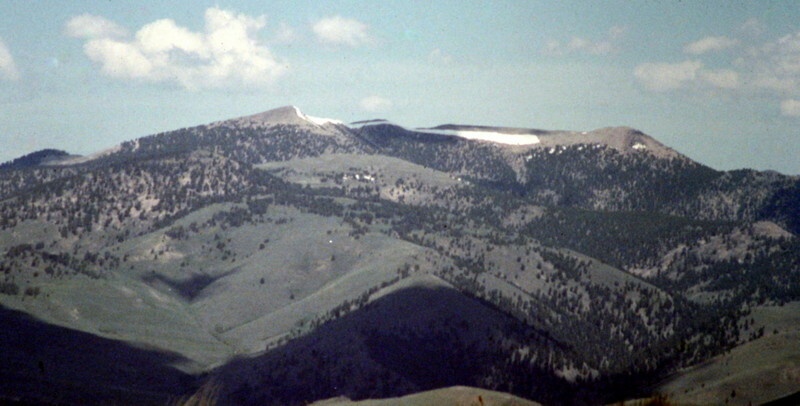 Sheep Mountain White Knob Mountains 9,649 ft 1989 This peak is found on page on page 264. 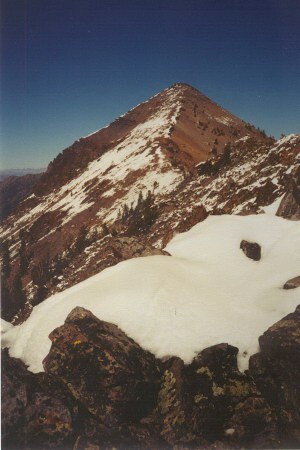 Peak 9631 (Peanut Peak) Pioneer Mountains 9,631 ft 1978 This peak is not in the book. 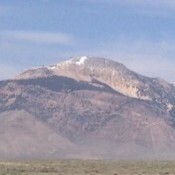 White Mountain West, 9623 Pioneer Mountains 9,623 ft 763 This White Mountain is not in the book. 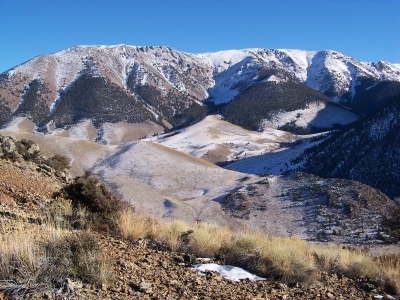 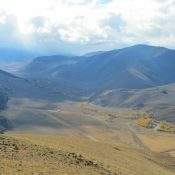 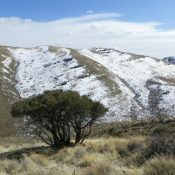 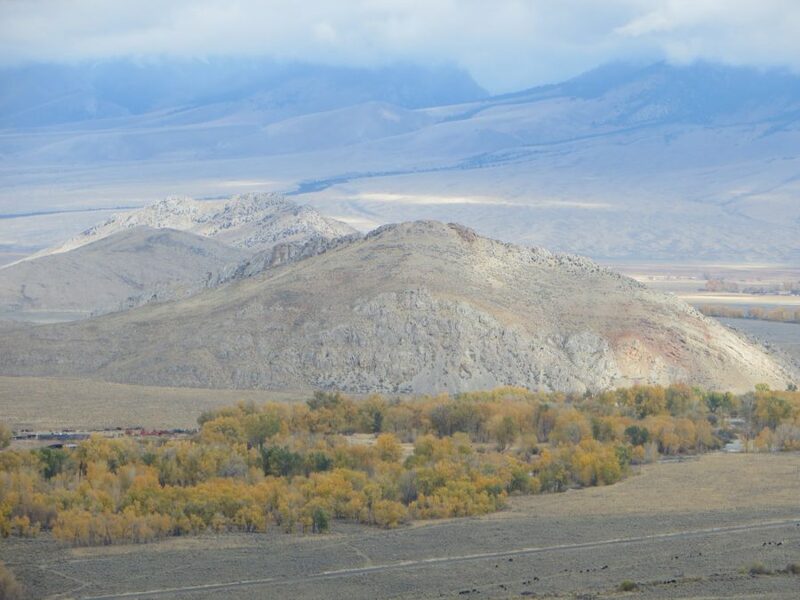 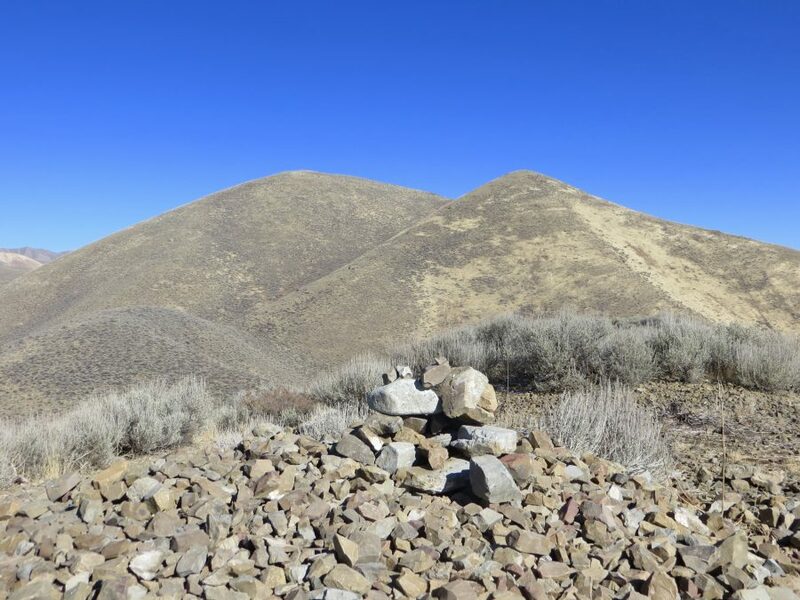 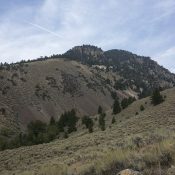 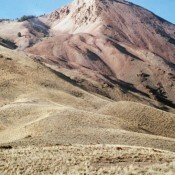 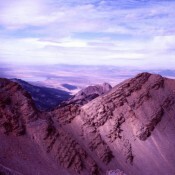 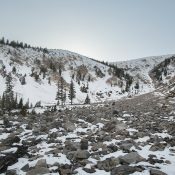 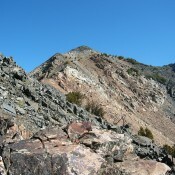 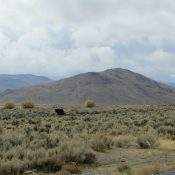 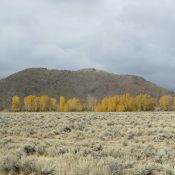 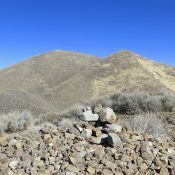 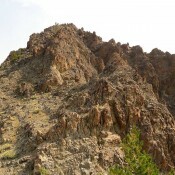 Sal Mountain Lemhi Range 9,593 ft 1613 Climmbing and access information for Sal Mountain is found on page 296. 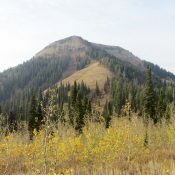 Peak 9,579 White Knob Mountains 9,579 ft 1985 This minor peak or point is not in the book. 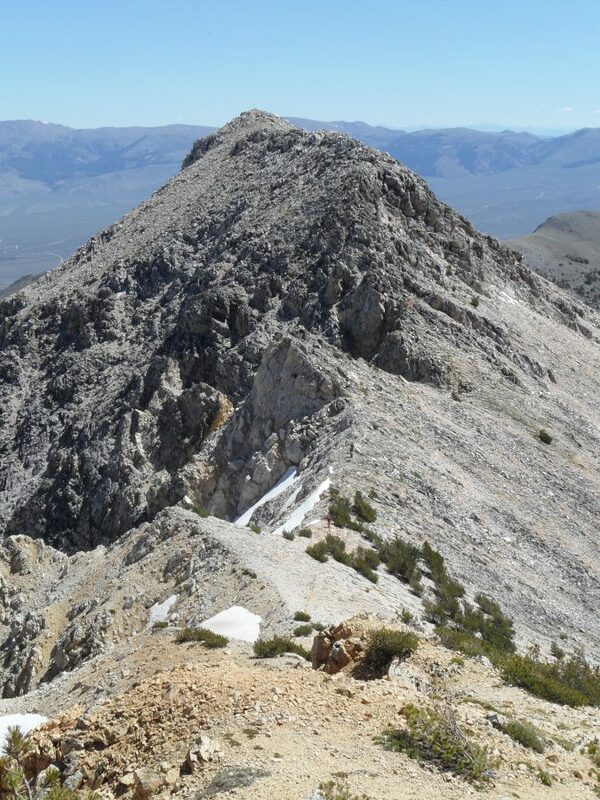 Peak 9524 (Crows Nest Peak) Lost River Range 9,524 ft This peak is not in the book. 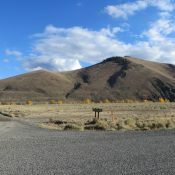 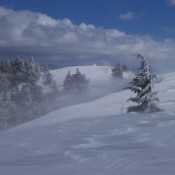 Rick Baugher supplied the following information and photos. 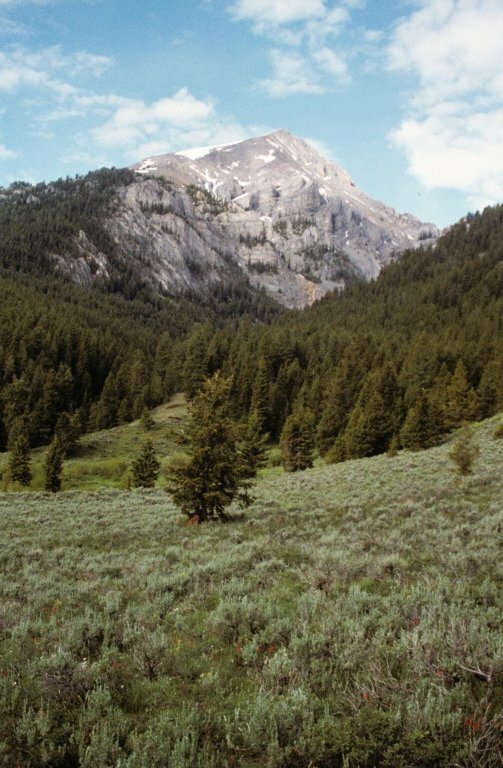 Warren Mountain Lost River Range 9,469 ft This peak is found on page 286. 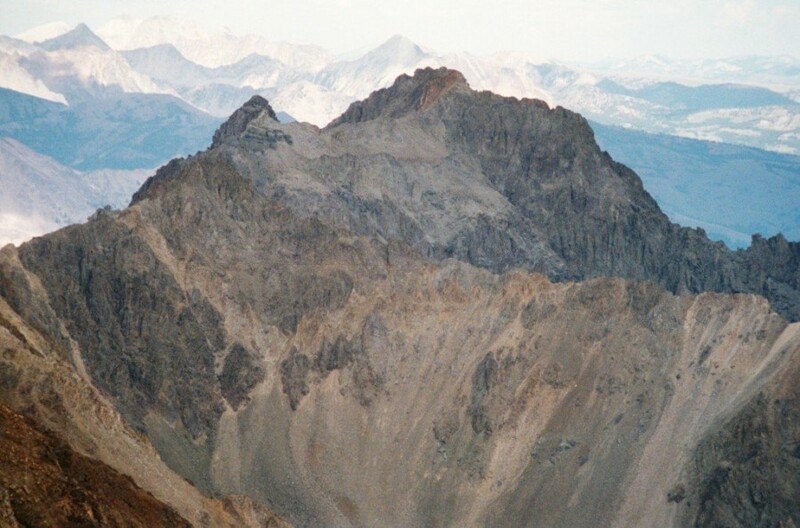 Needle Peak Big Hole and Snake River Mountains 9,449 ft This peak is found on pages 339 and 340. 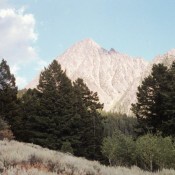 Peak 9334 Eastern Salmon River Mountains 9,334 ft 714 This peak is not in the book. 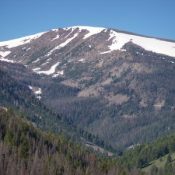 Judi Steciak and Carl Hamke provided the following information. 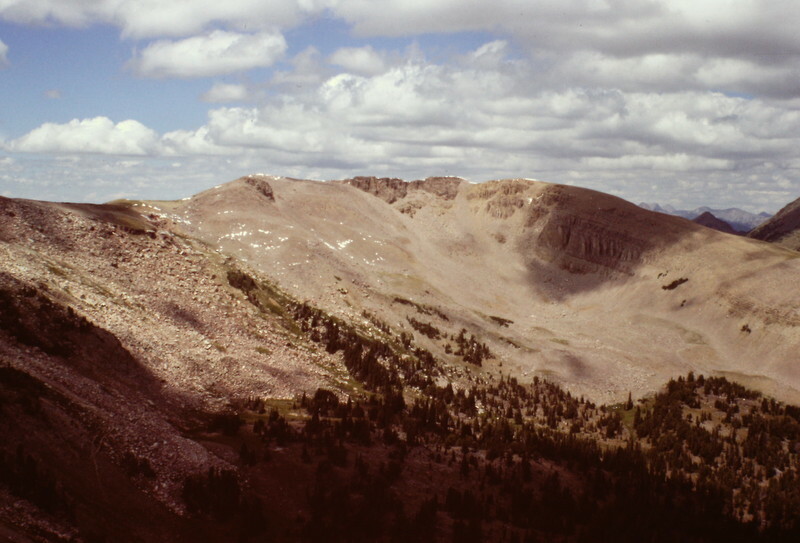 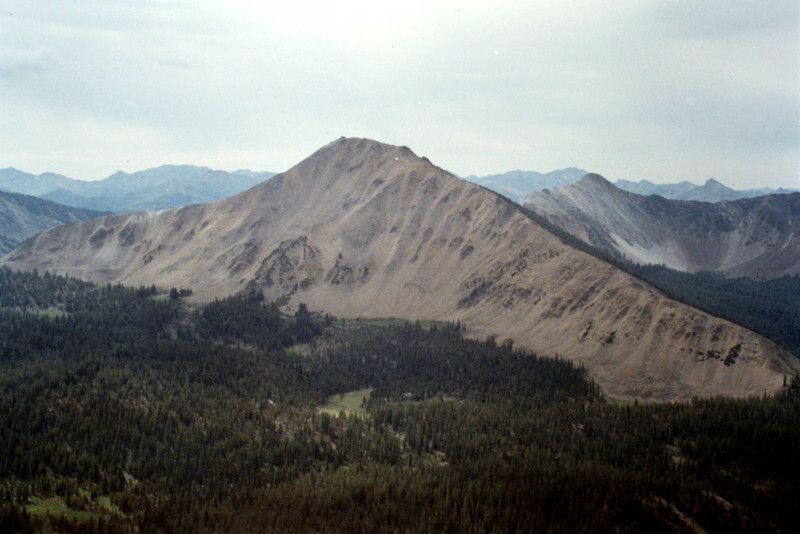 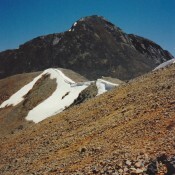 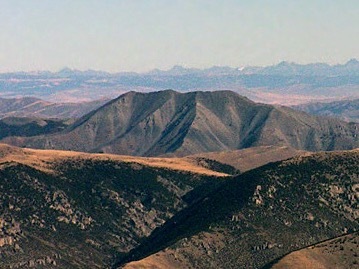 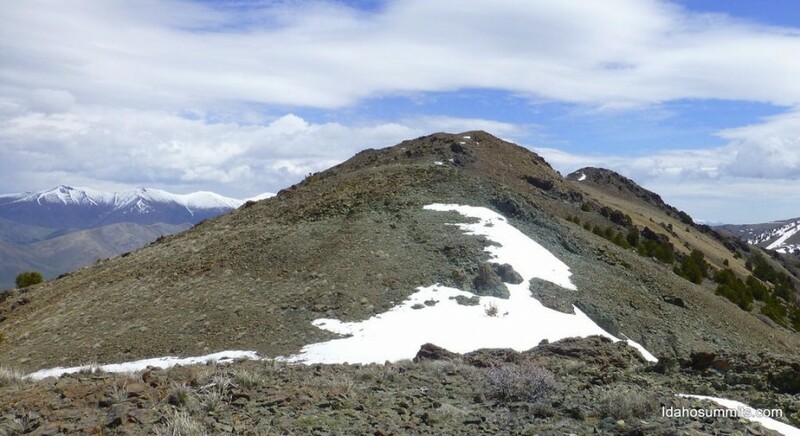 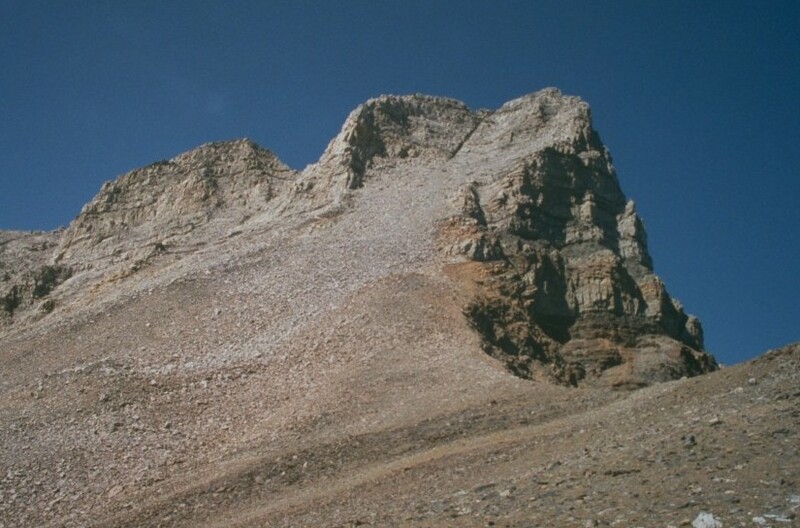 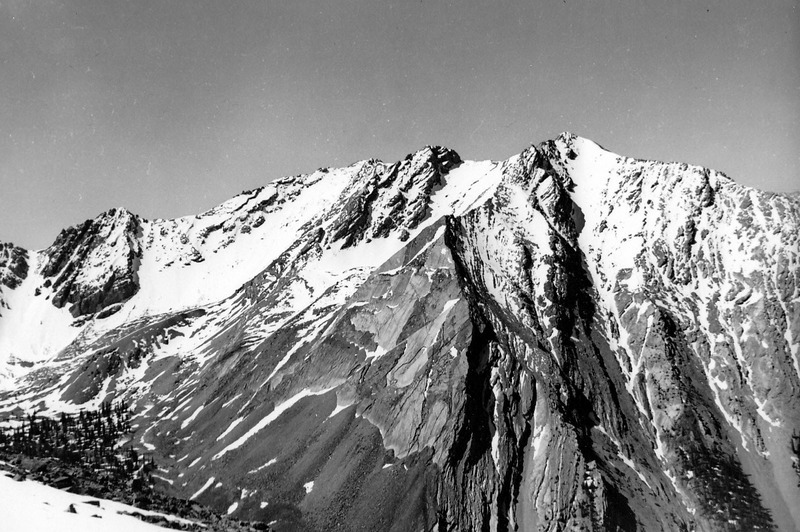 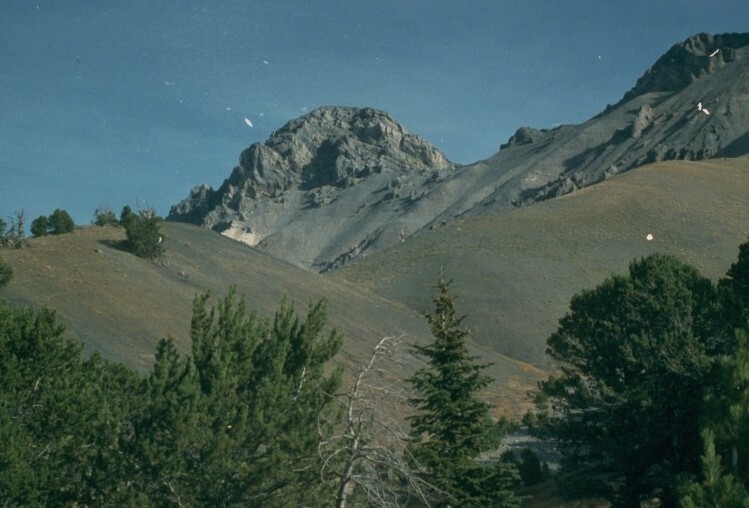 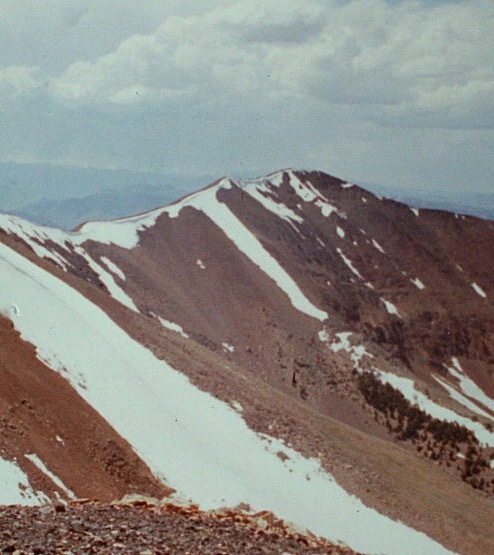 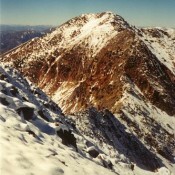 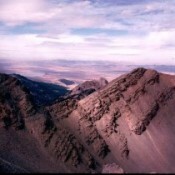 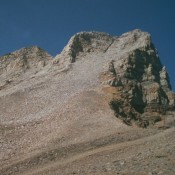 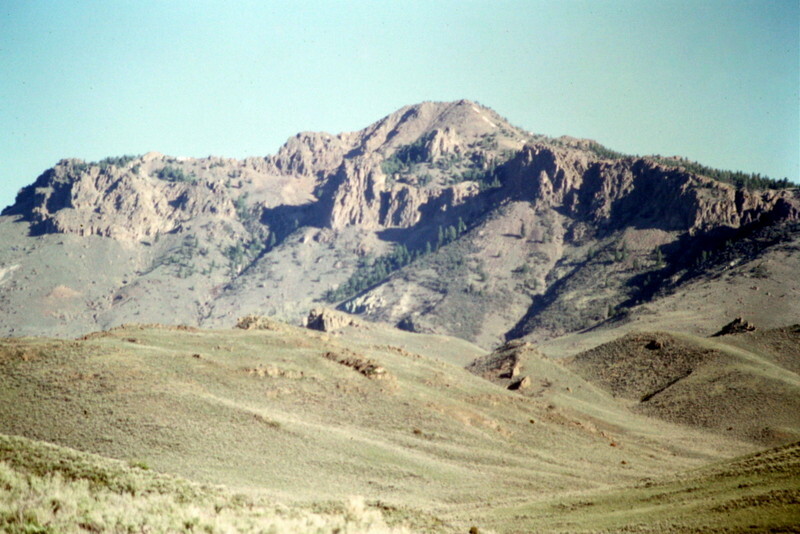 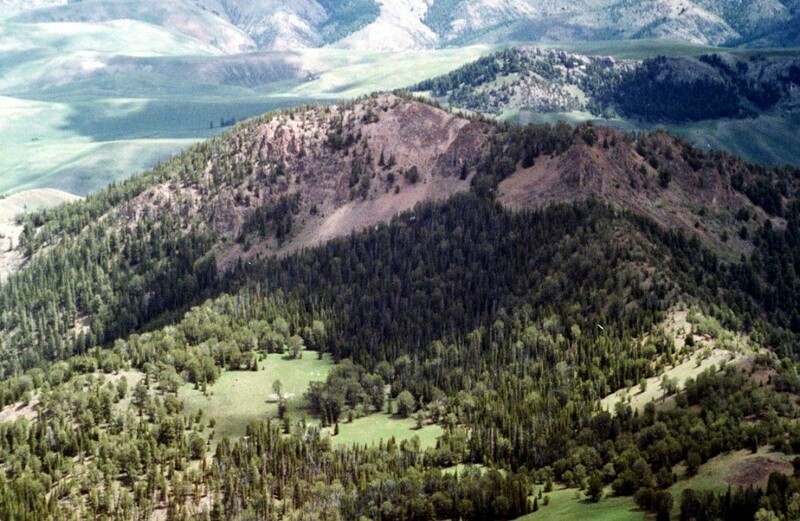 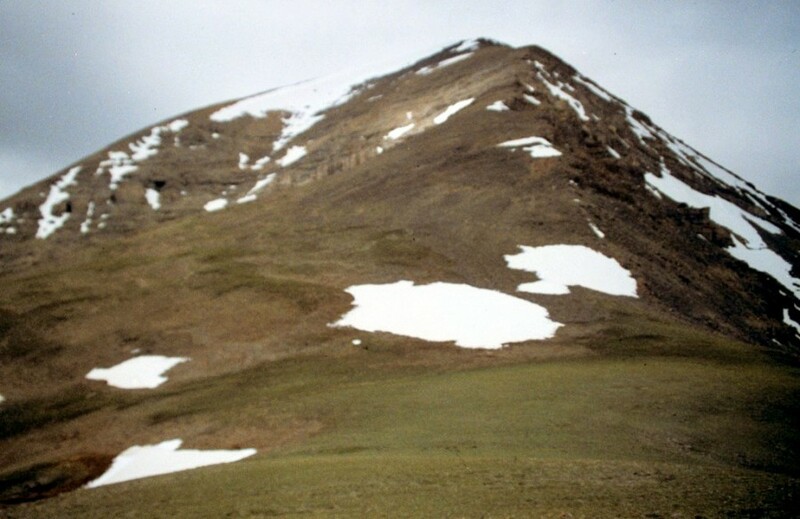 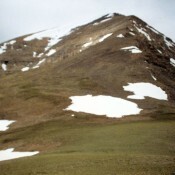 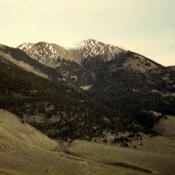 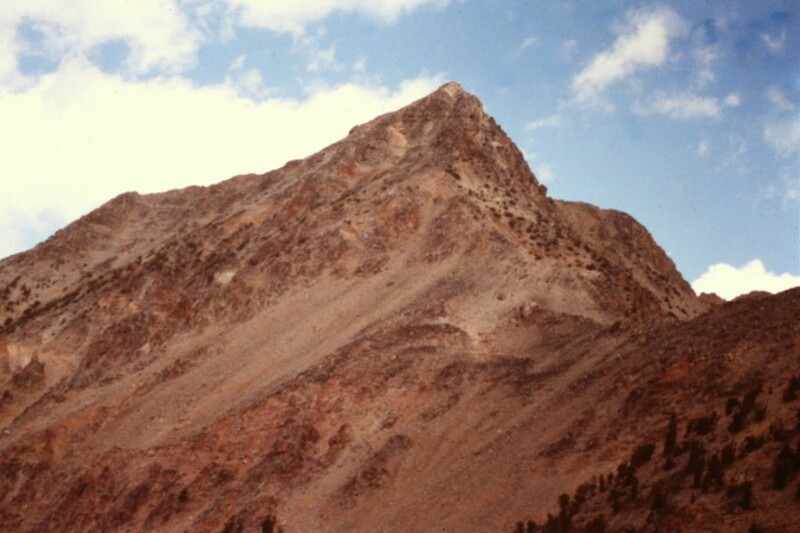 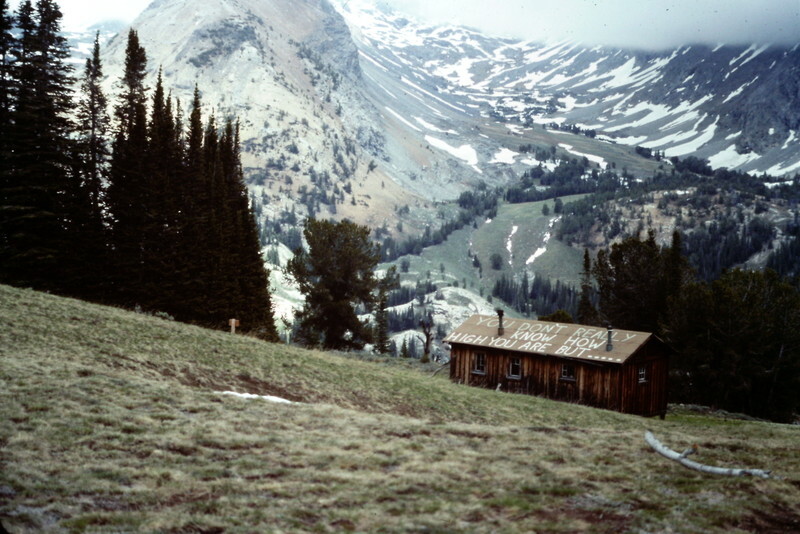 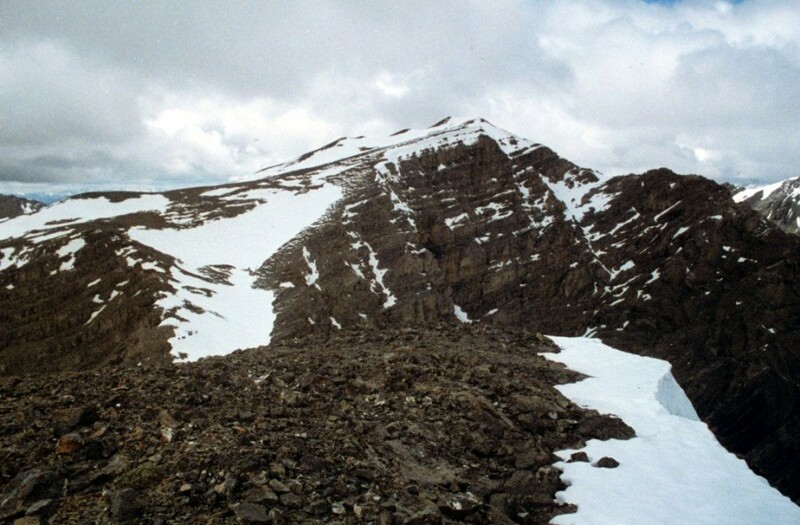 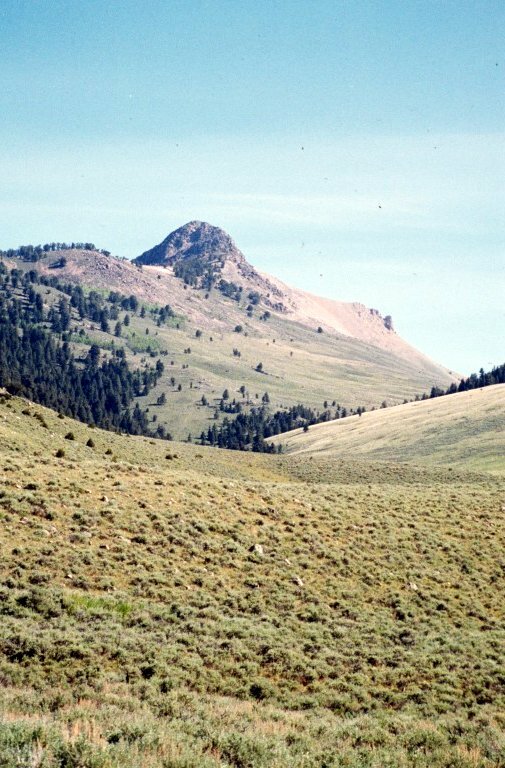 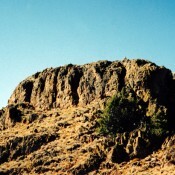 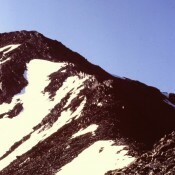 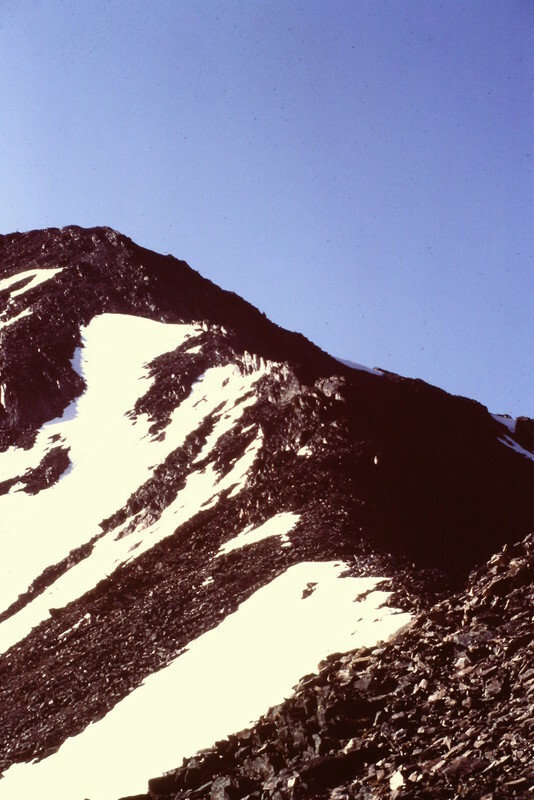 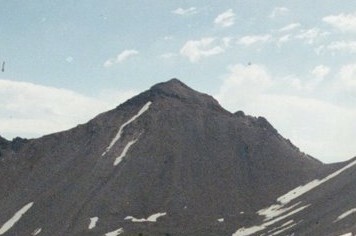 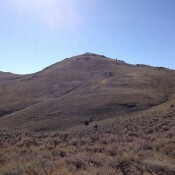 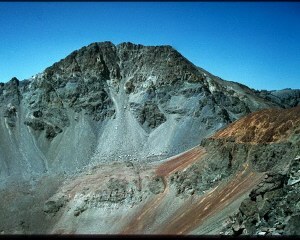 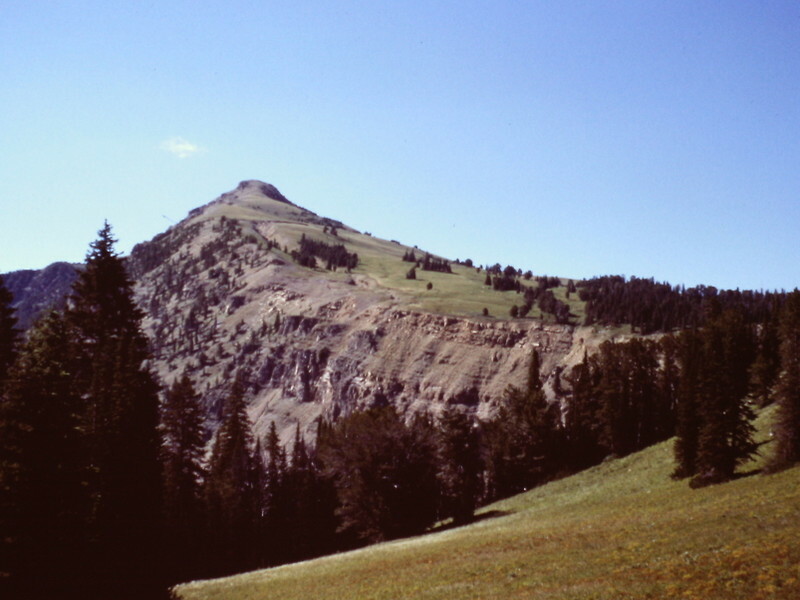 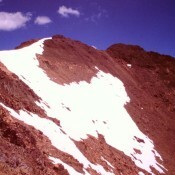 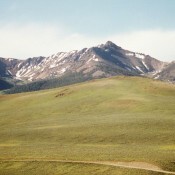 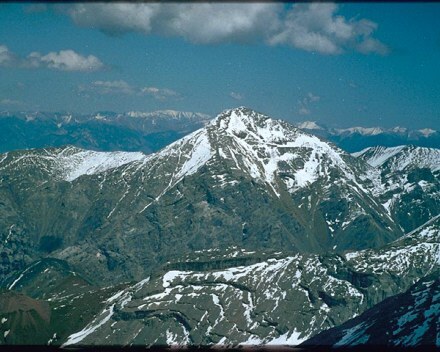 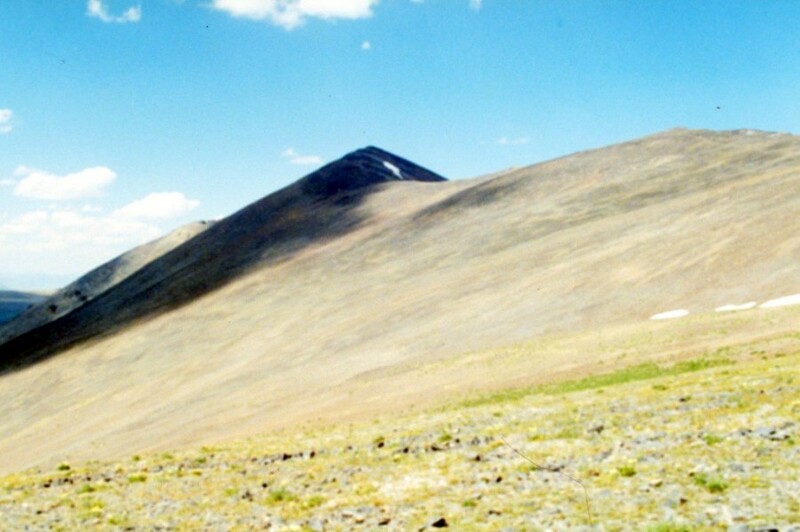 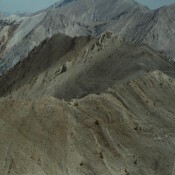 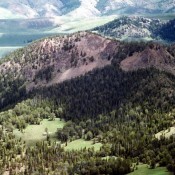 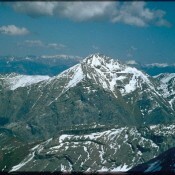 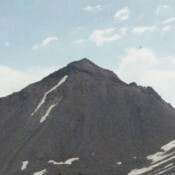 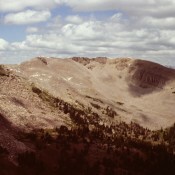 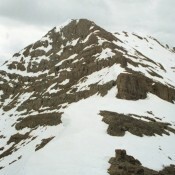 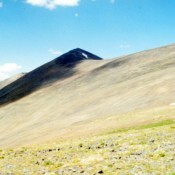 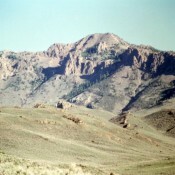 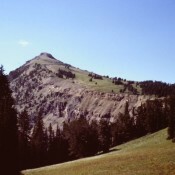 Foss Mountain Lemhi Range 9,190 ft 210 1980, 1981 Access and climbing information for this peak is found on page 307. 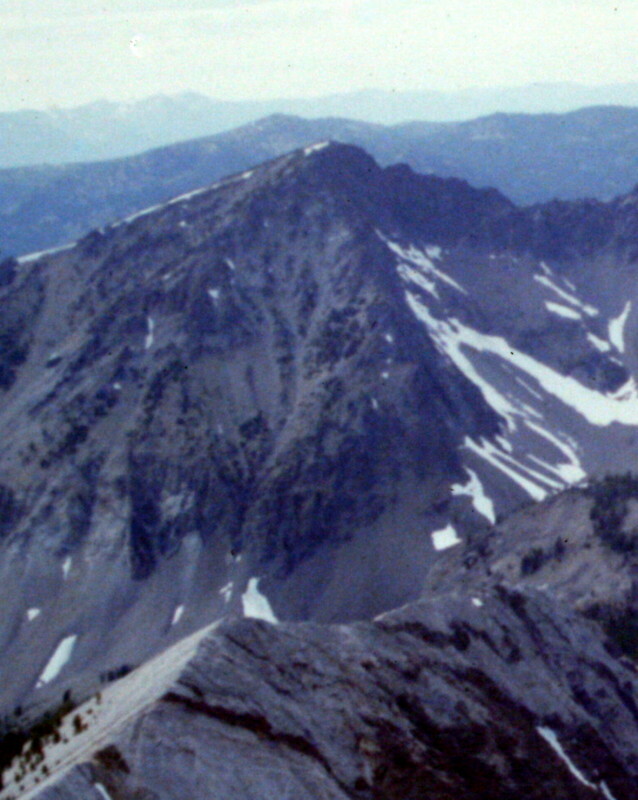 Mandolin Peak Albion Range 9,189 ft 1994 This peak is found on page 255. 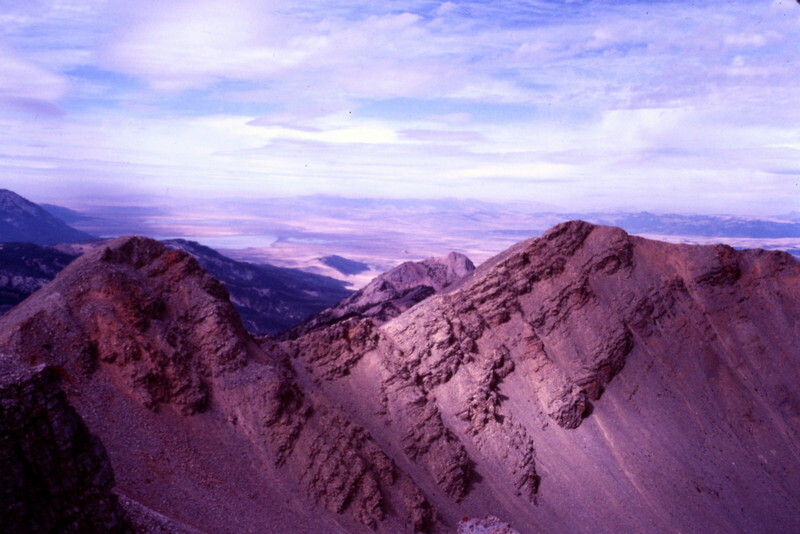 Garns Mountain Big Hole and Snake River Mountains 9,016 ft This peak is found on page 338. 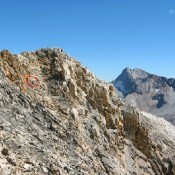 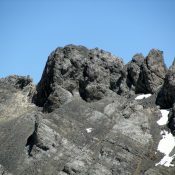 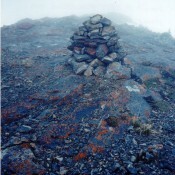 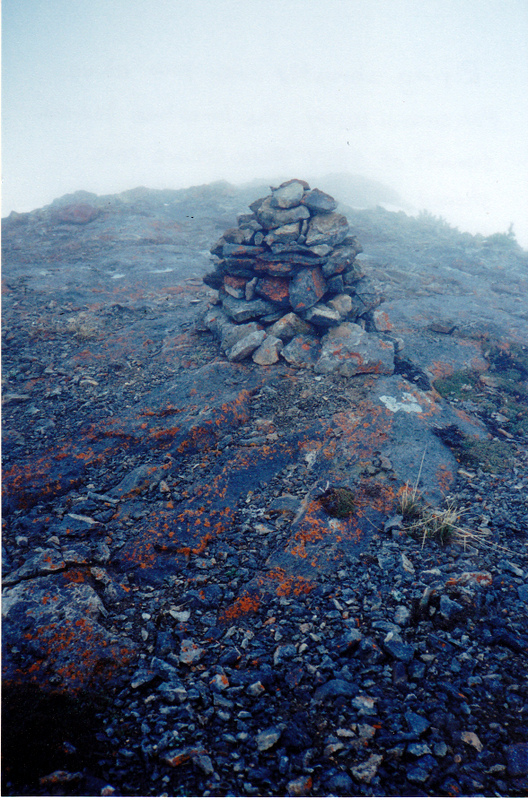 Climbing information for this peak is found on page 310. 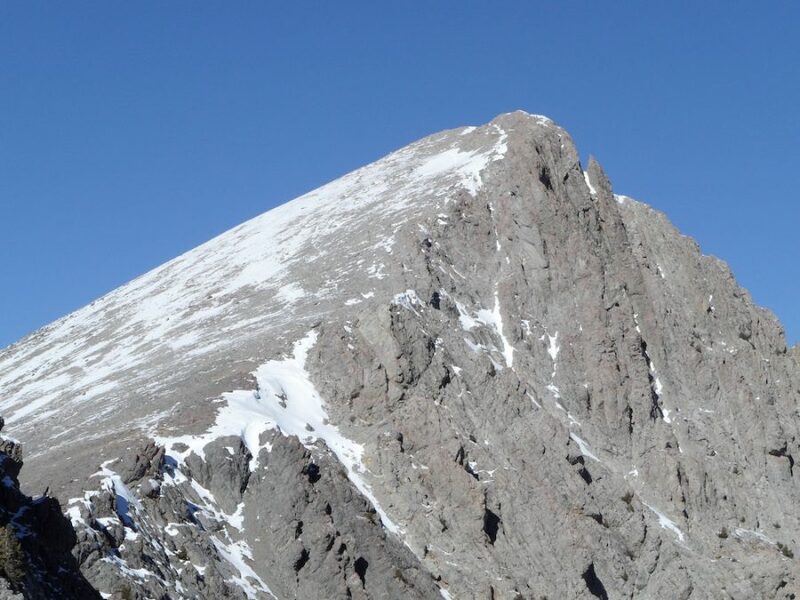 Peak 9004 Lost River Range 9,004 ft This peak is not in the book. 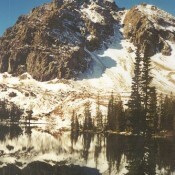 Ryan Peak 8860 by Margo Mandella Big Hole and Snake River Mountains 8,860 ft 1339 This peak is not in the book. 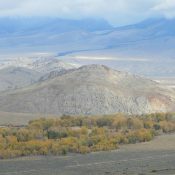 Published October 2017. 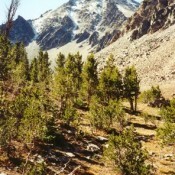 Peak 8820 Lost River Range 8,820 ft 320 This peak is not in the book. 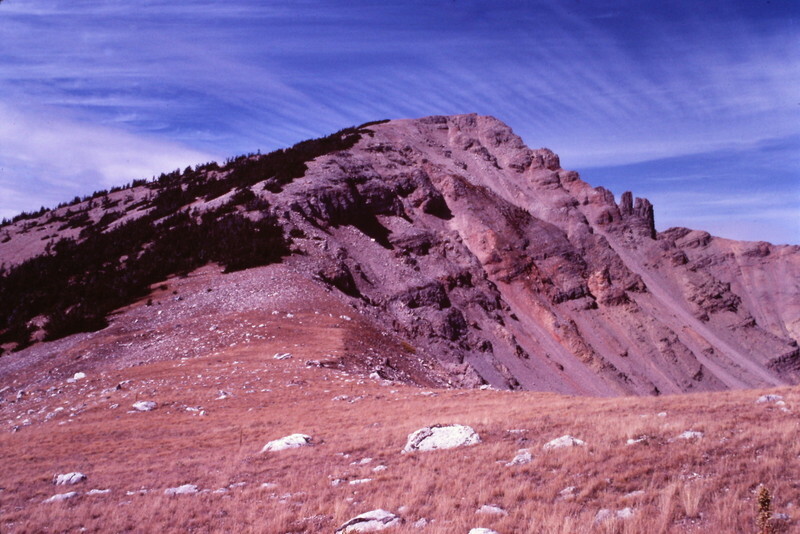 Castle Rock (Peak) White Knob Mountains 8,781 ft This peak is found on page 262. 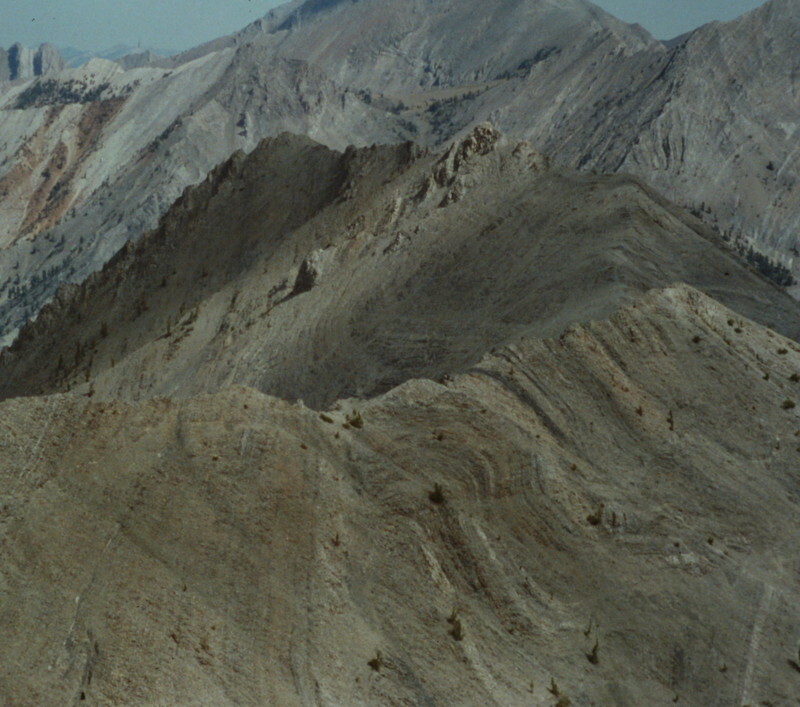 Howe Peak Lost River Range 8,701 ft Howe Peak is not in the book. 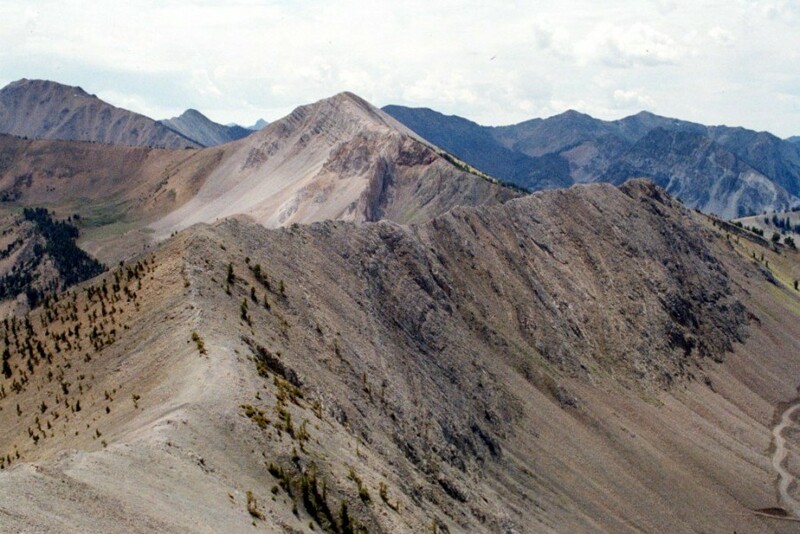 Garfield Mountain Pioneer Mountains 8,700 ft This peak is found on pages 255 to 256. 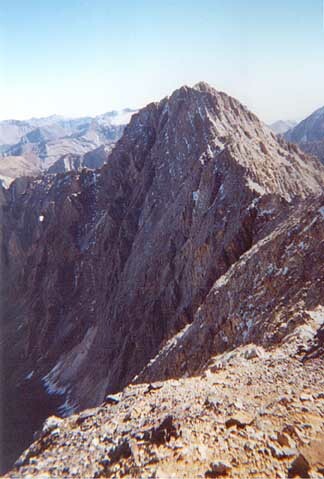 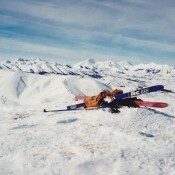 Peak 8692 by Margo Mandella Big Hole and Snake River Mountains 8,692 ft 352 This peak is not in the book. 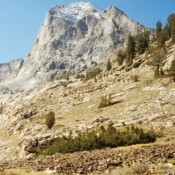 Published October 2017. 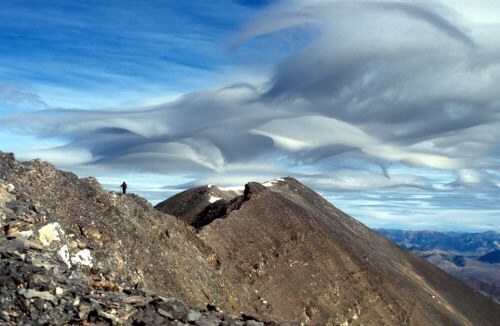 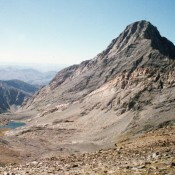 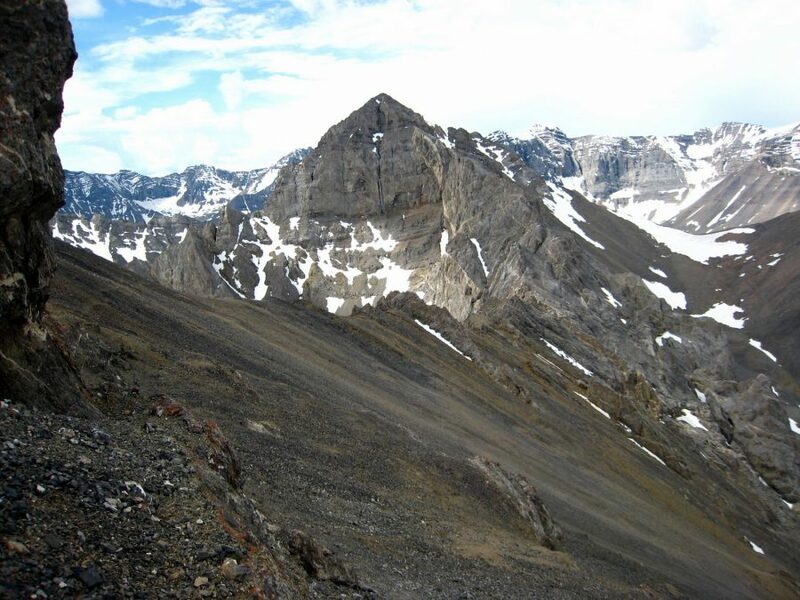 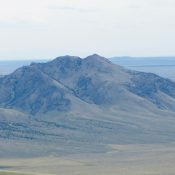 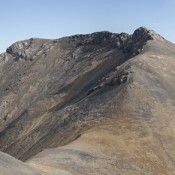 Stouts Mountain by Margo Mandella Big Hole and Snake River Mountains 8,620 ft 1300 Climbing information for this peak is found on page 338. 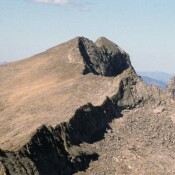 Swede Peak Pioneer Mountains 8,480 ft 1990 Swede Peak is found on page 255. 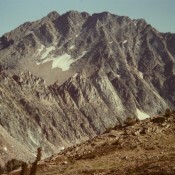 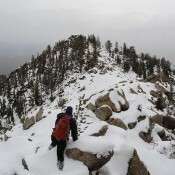 Peak 8383 by Margo Mandella Lost River Range 8,383 ft 443 Peak 8383 is not in the book. 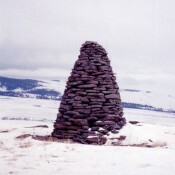 Published March 2018. 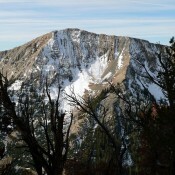 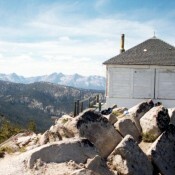 Timbered Dome Pioneer Mountains 8,356 ft This peak is not in the book. 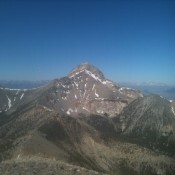 Patterson Peak 8350 Pioneer Mountains 8,350 ft 1410 This peak is not in the book. 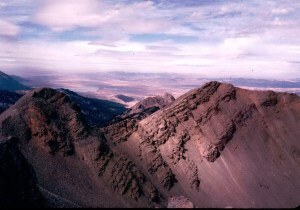 Henderson Peak by Margo Mandella Big Hole and Snake River Mountains 8,312 ft 692 This peak is not in the book. 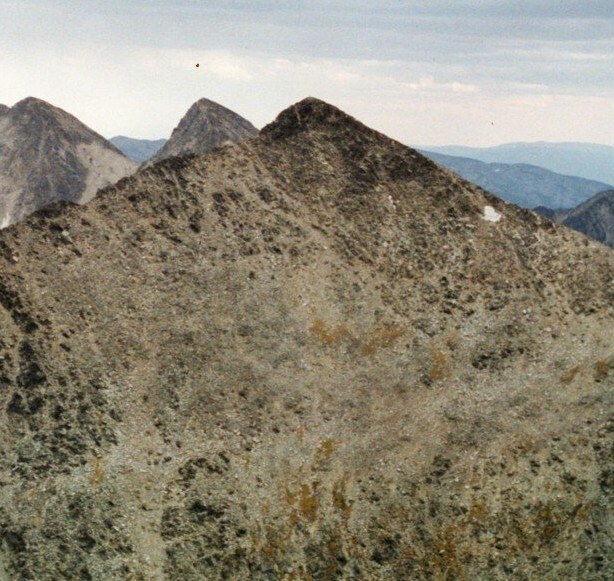 Reed and Davis Benchmark by Margo Mandella Pioneer Mountains 8,277 ft 377 This peak is not in the book. 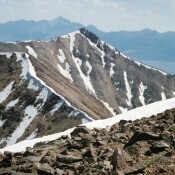 Temple Peak Big Hole and Snake River Mountains 8,219 ft This peak is not in the book. 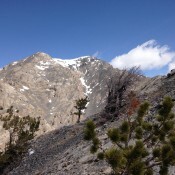 Peak 8150 Lost River Range 8,150 ft 1170 2014 This peak is not in the book. 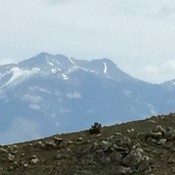 Updated May 2018. 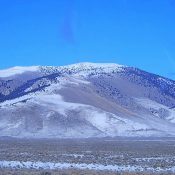 Red Butte Big Hole and Snake River Mountains 8,108 ft This peak, the highest point in Madison County, is not in the book. 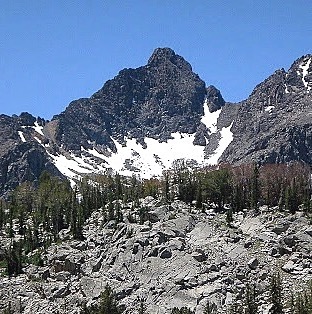 Peak 8082 Lost River Range 8,082 ft 302 2014 This peak is not in the book. 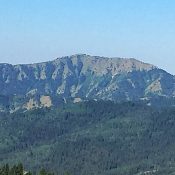 Updated May 2018. 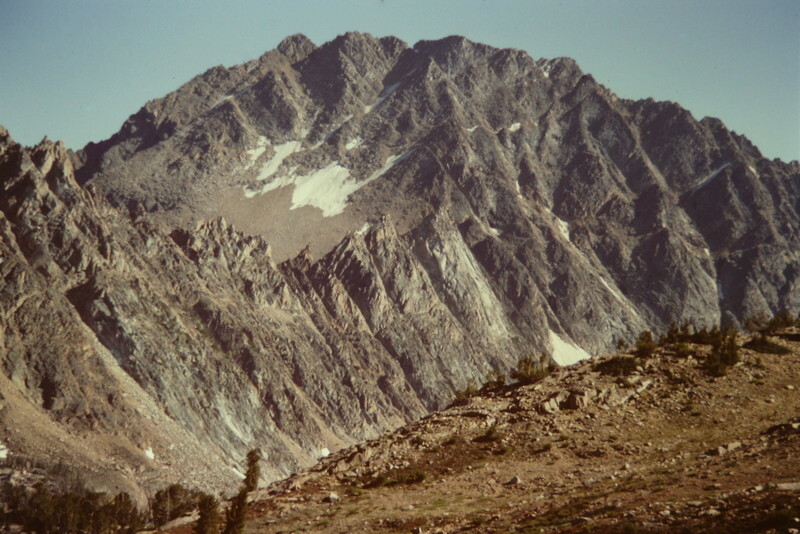 Peak 6990 by Margo Mandella Lost River Range 6,990 ft 410 This peak is not in the book. 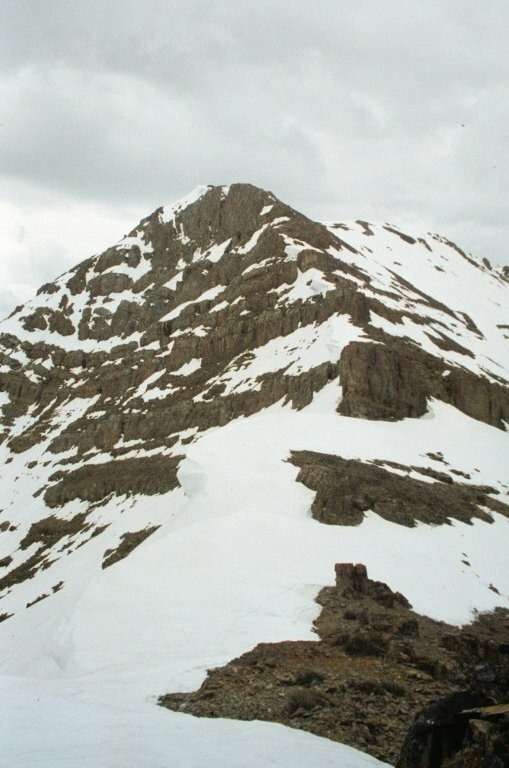 Published March 2018.